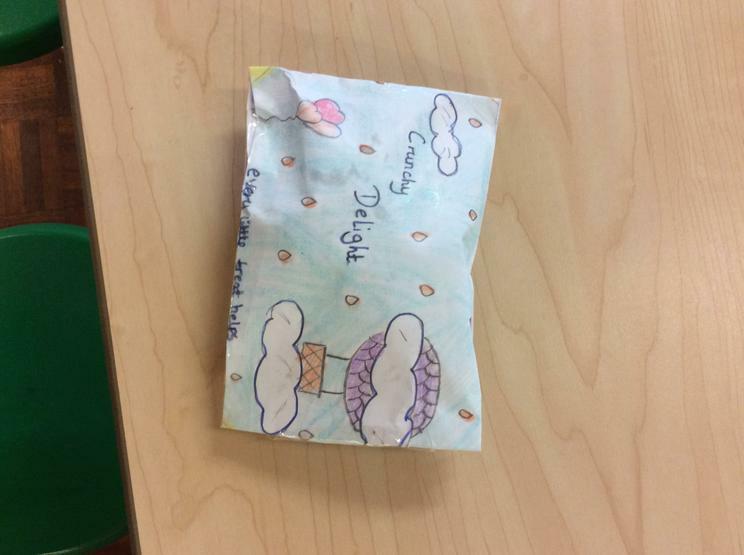 The mighty Oak tree is a symbol of courage, strength of character and power. 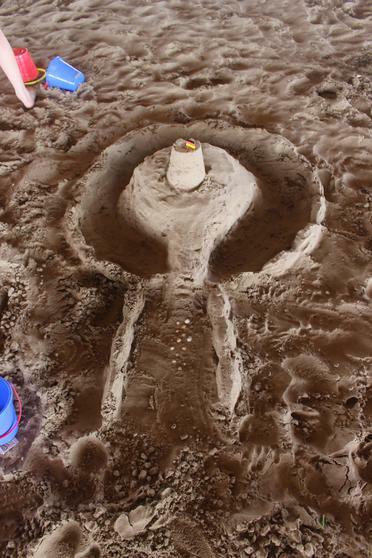 It stands strong through all things. 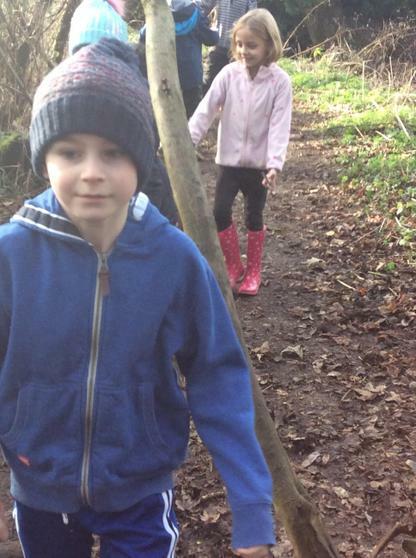 Legend has it that the Oak tree is the most powerful of all trees. 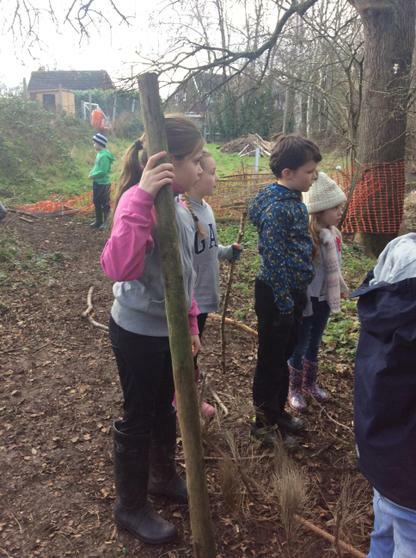 It is a strong and wise tree. 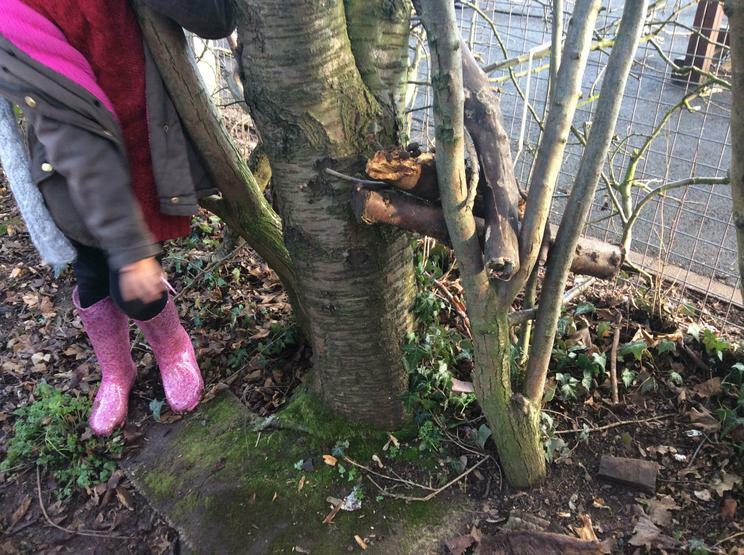 Like the tree, we hope the children in Oak class are strong and courageous in their learning this year and that they, too, are a powerful force in our school. 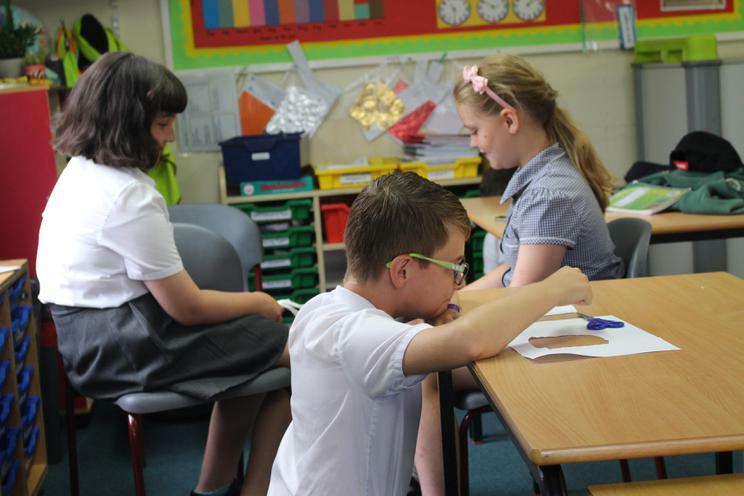 So far, our class of year 3 and 4 children have shown to be enthusiastic, resilient and determined learners as well as thoughtful, kind young people! 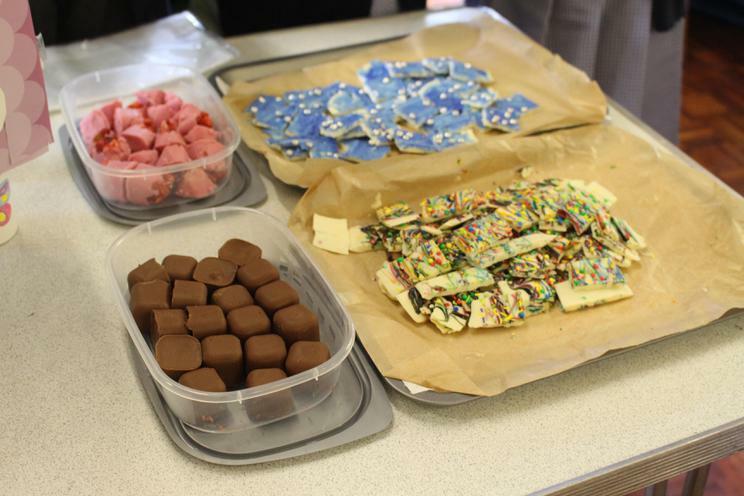 We hope you all have a restful and enjoyable break over Easter! 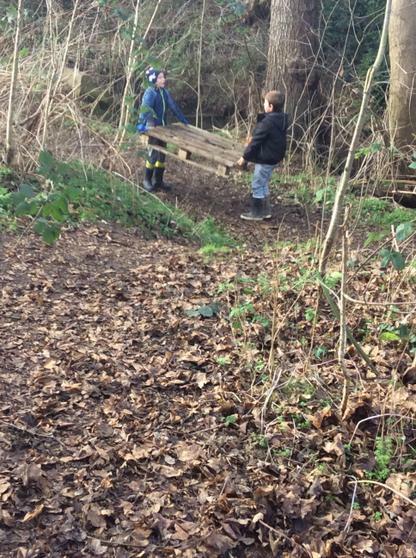 Today we tested out our boats, along with Maple and Laurel classes, in Forest School. 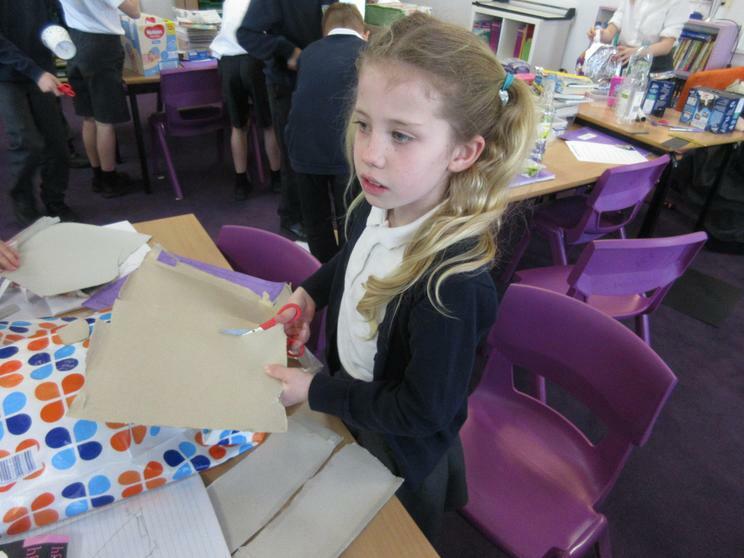 We had already designed our boats and decided what materials to use along with the shape. 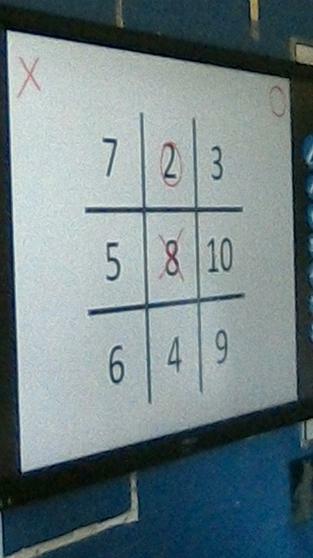 Next...to test! 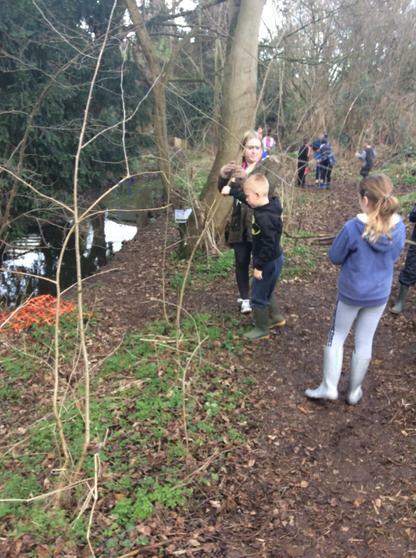 The children cheered as staff made their way into the brook and as the boats travelled along the water. 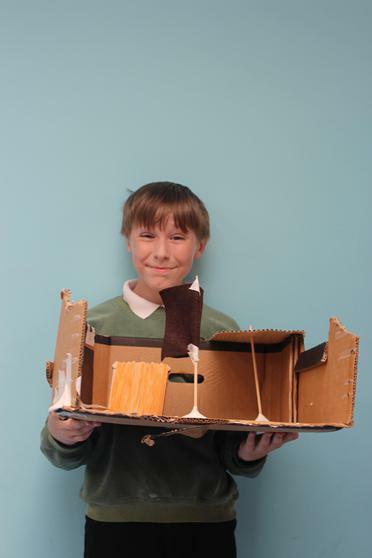 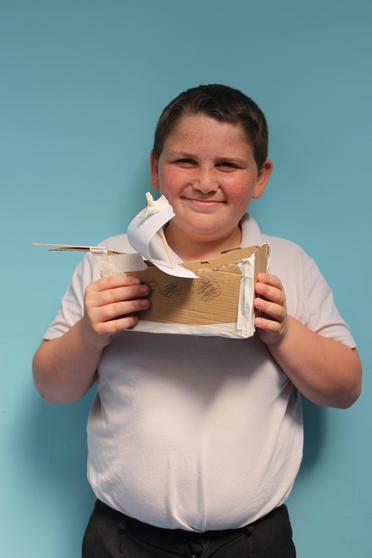 We had some fantastic successes and a couple of Titanic replicas! 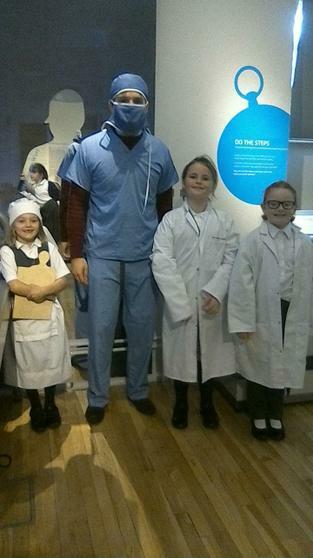 The children had a wonderful morning, as did the staff! 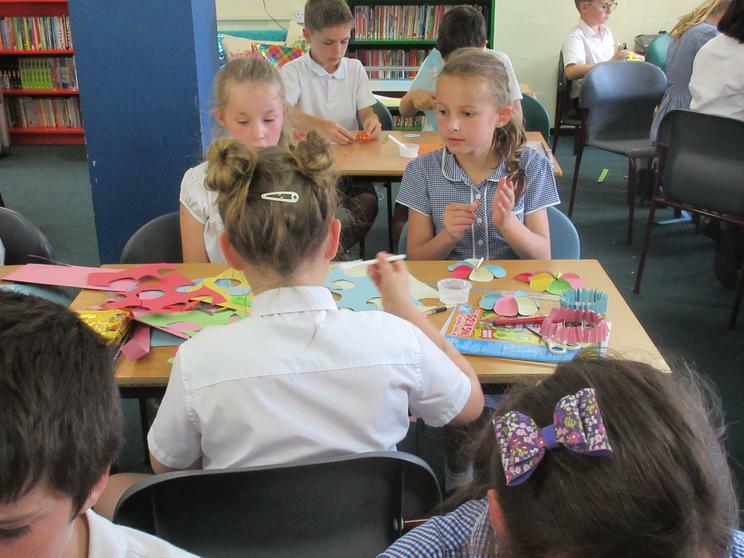 Please can you let Miss Graham, Mrs Curtis or the front office know if you are planning to collect your child from church on Friday as soon as possible. 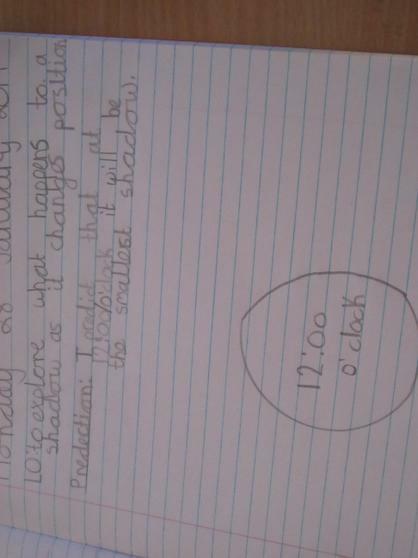 Collection time will be 2.00pm. 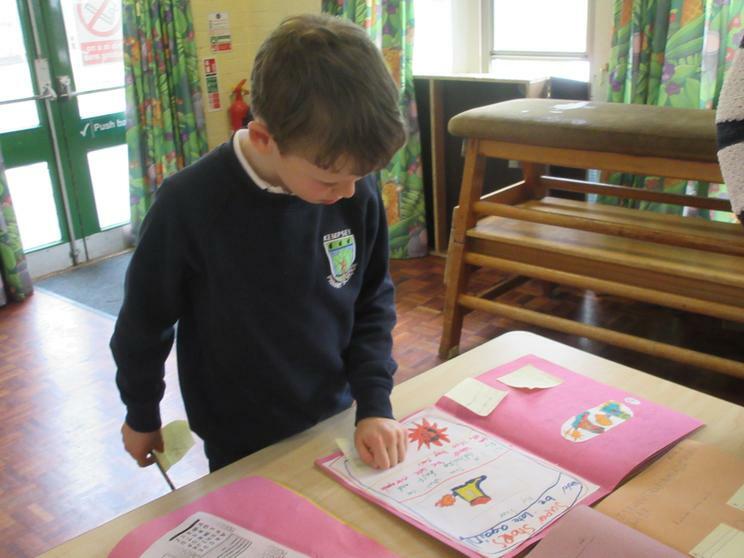 We celebrated the children's topic homework today in the hall along with Laurel and Maple class. 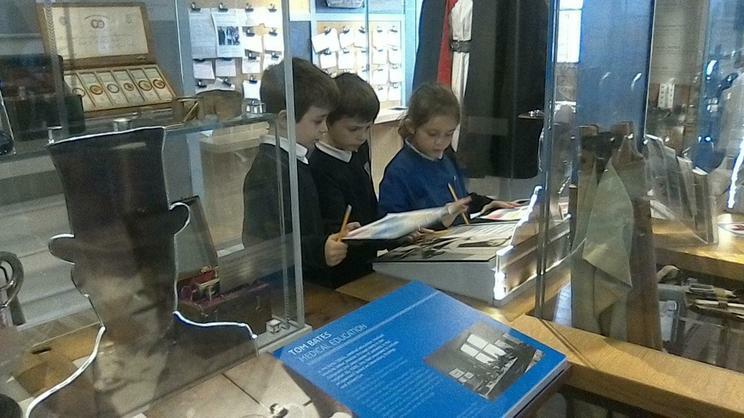 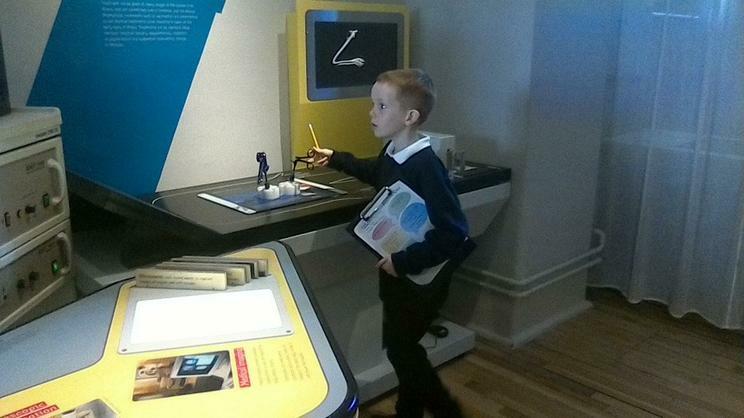 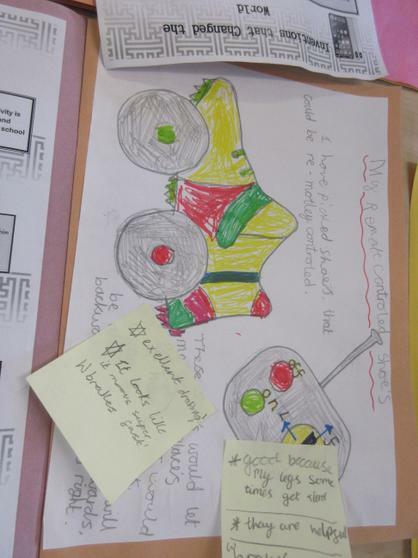 The children had thought of a variety of inventions and had completed some great research on inventions or the people who designed them. 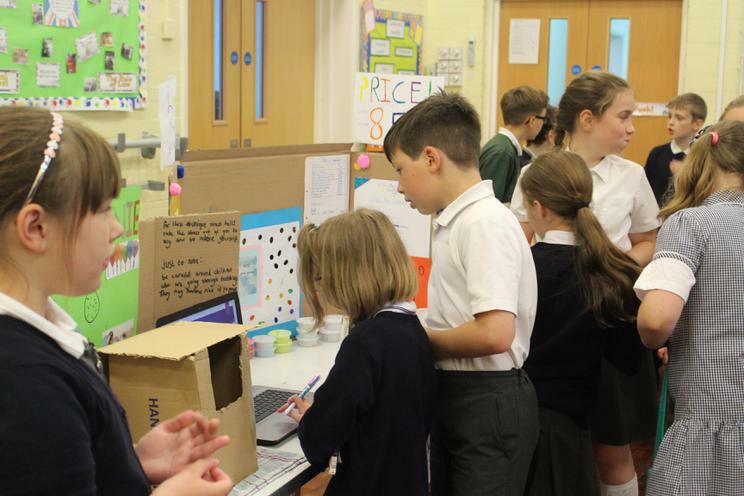 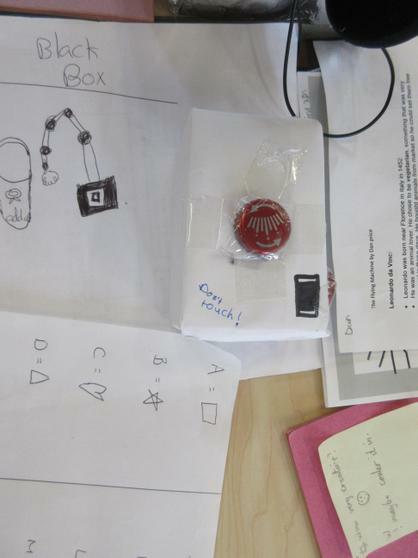 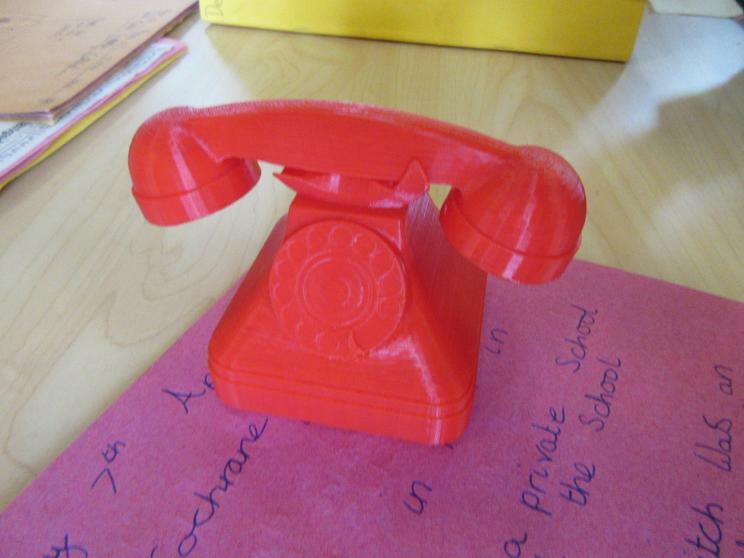 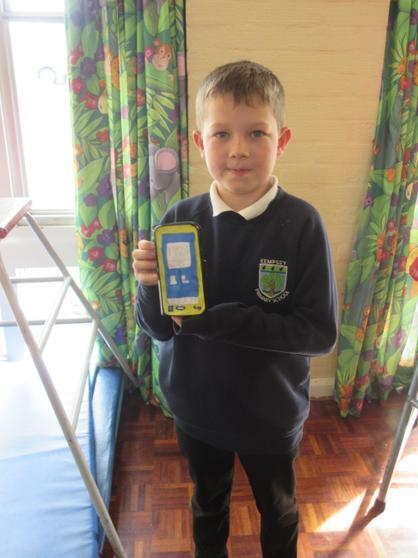 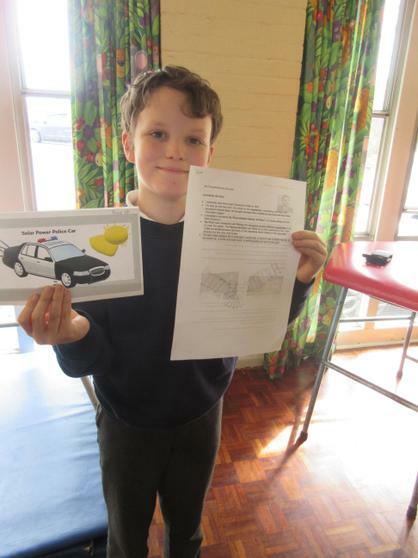 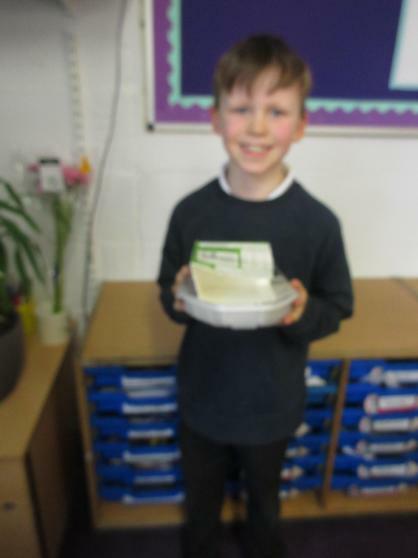 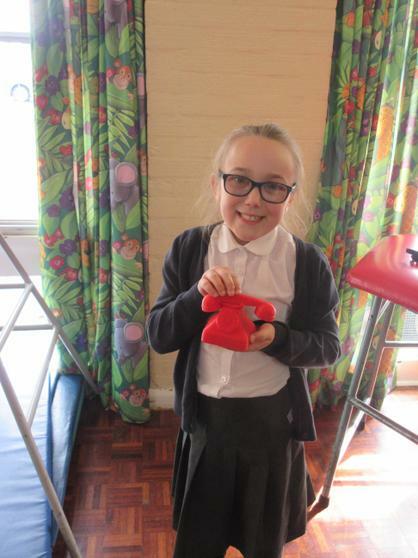 We had the code breaker, phones and even a 3D printed model - all of the children should be very proud of what they have achieved this half term! 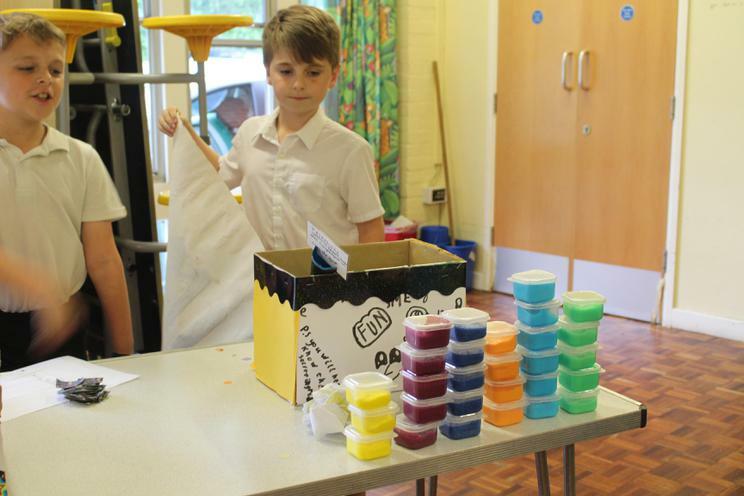 A reminder that it is the school disco on Thursday from 5.00pm to 6.00pm and there will be a selection of drinks and snacks for the children to buy. 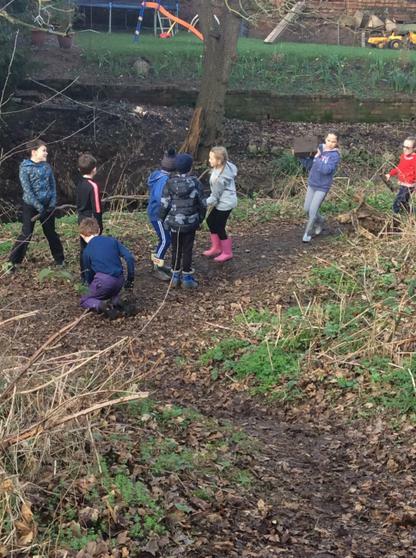 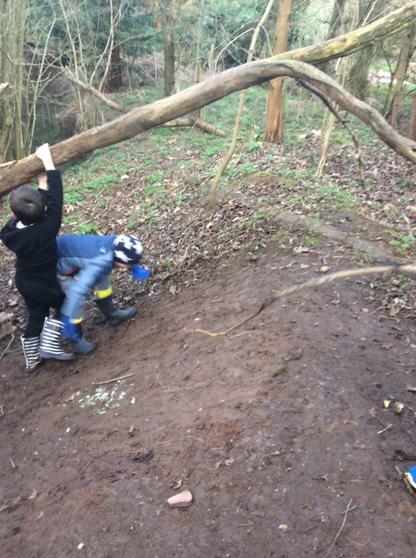 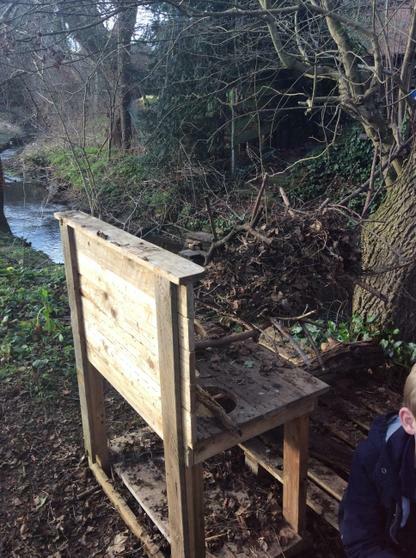 Due to adverse weather conditions, we had to cancel forest school on Monday. 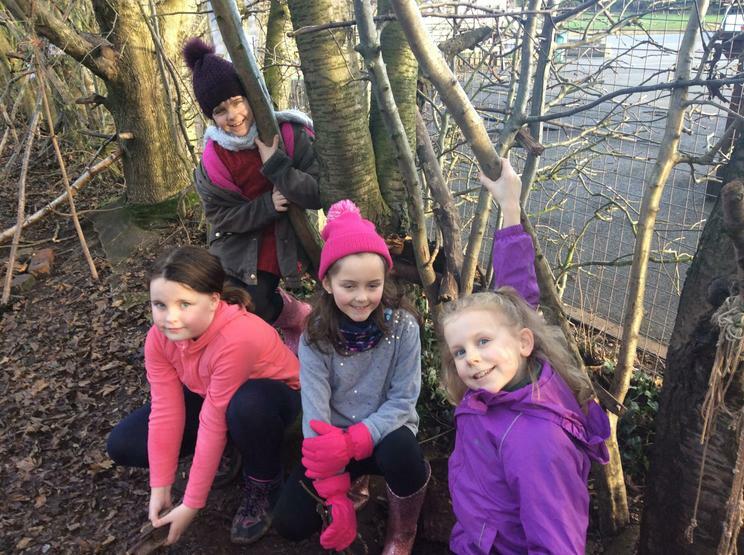 We will be, weather permitting, going to forest school on Wednesday so please can you ensure that children are sent in with appropriate clothing. 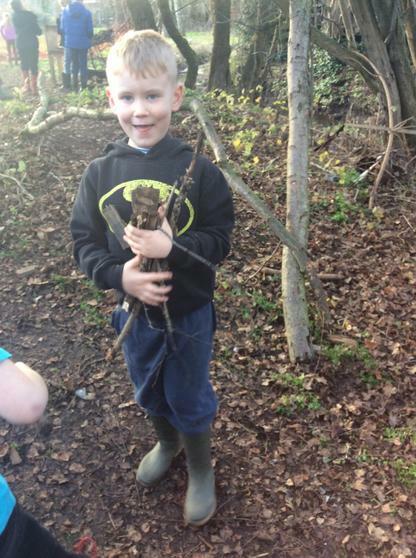 Please can you send the children in with forest school clothing on Monday as we will be going in the afternoon. 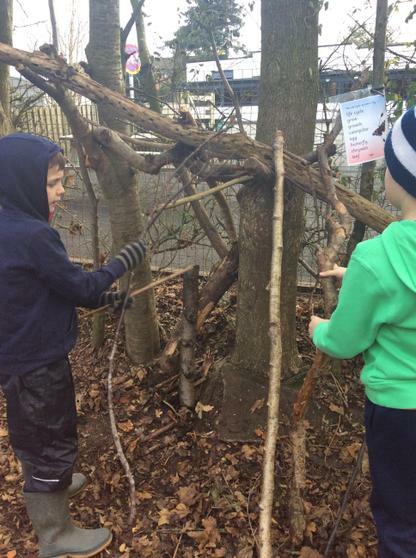 Ensure all children have a waterproof coat, wellies and old clothes. 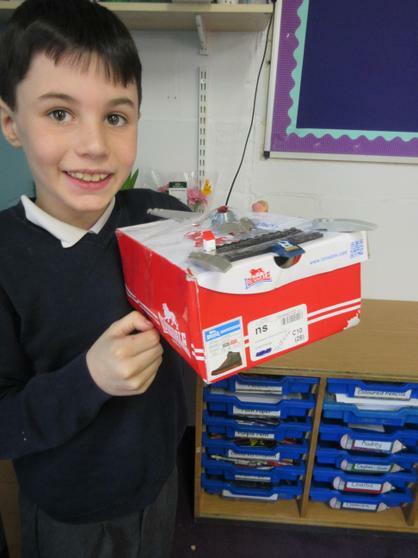 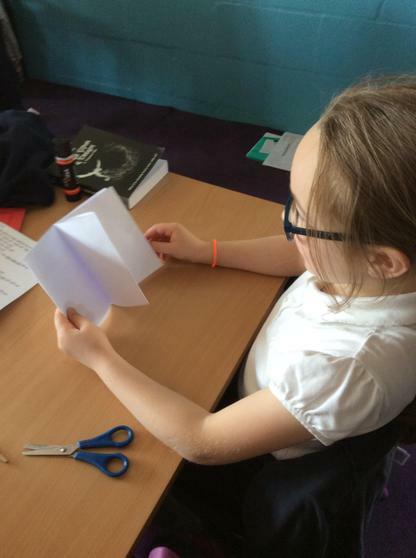 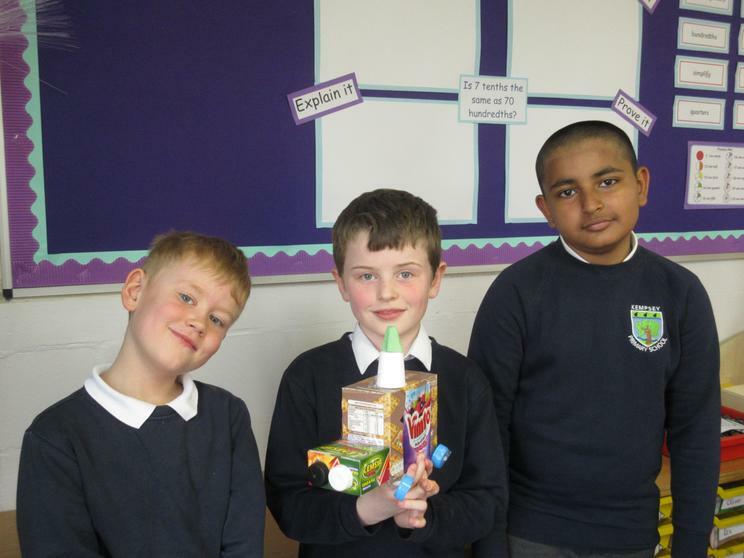 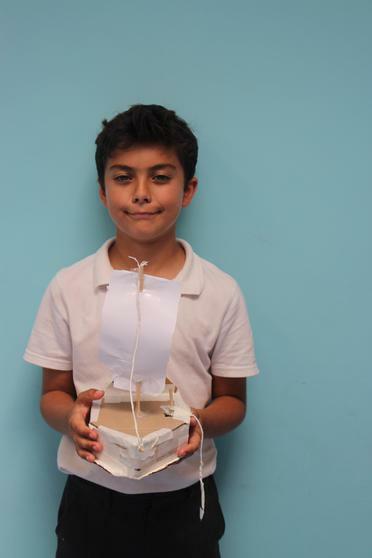 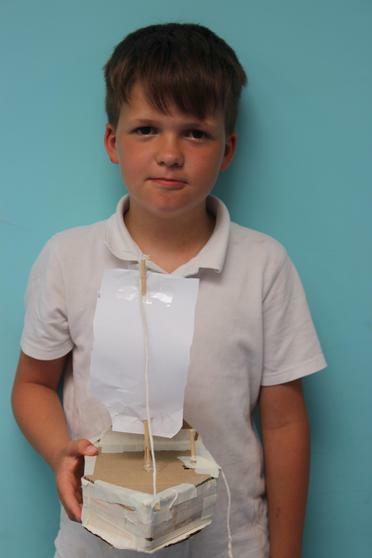 In Science, we have explored air resistance and gravity by designing and making gyropcopters. 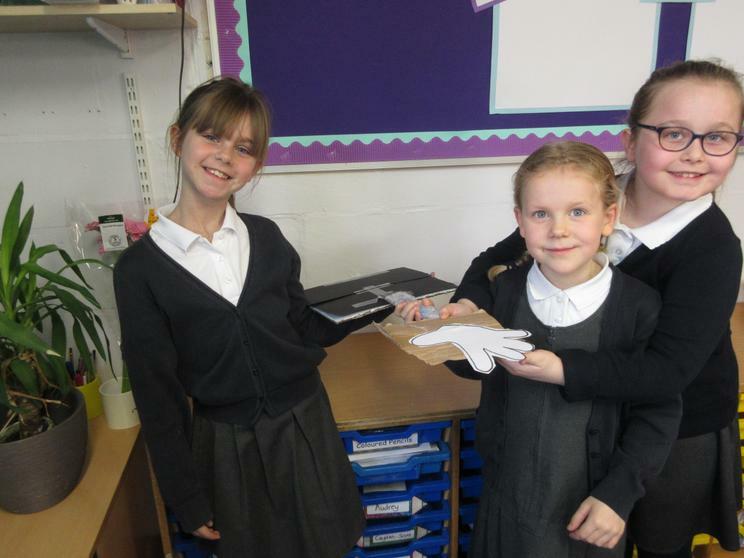 We explored how we could make the helicopter increase air resistance by thinking about adding paperclips, more paper and selotape. 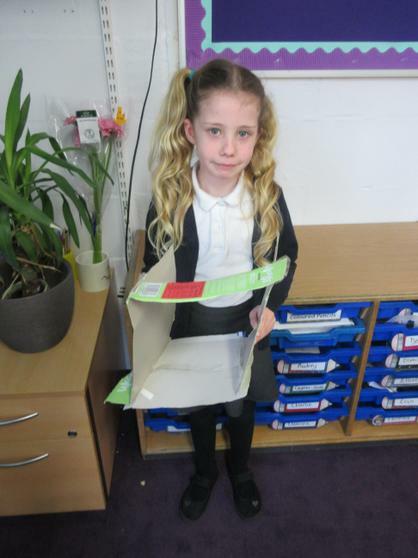 The children all designed their own, then at the front of the class we tested them. 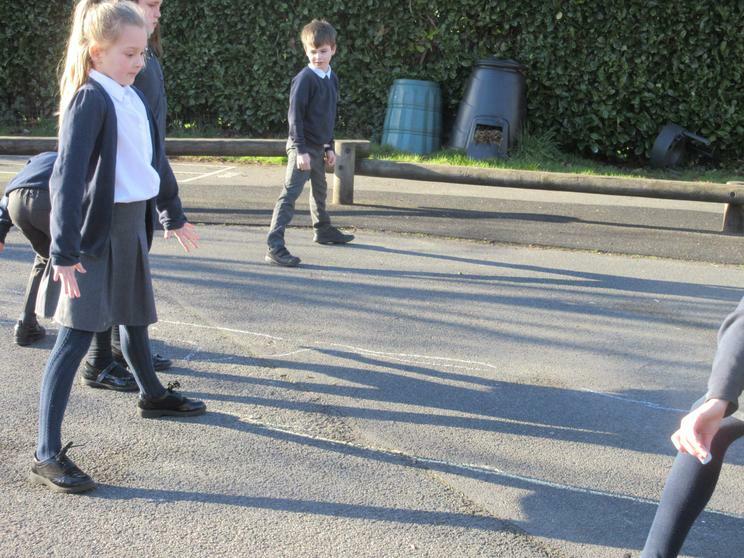 Next, we went outside to test out their models against other children's helicopters. 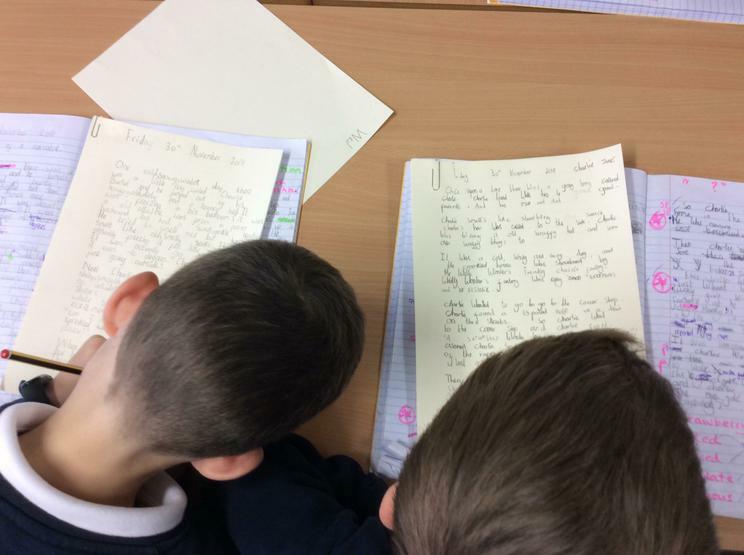 Writing our own stories in French! 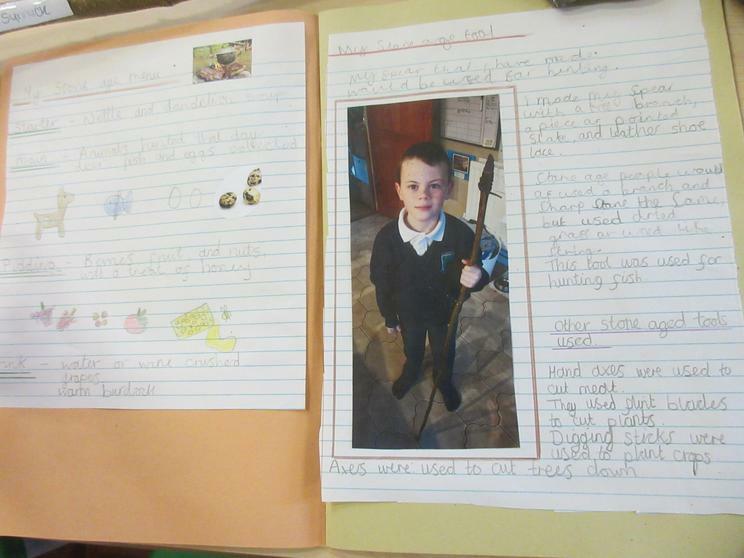 In French we have been learning a story about a farmer who grows a turnip, then gets it stuck in the ground. 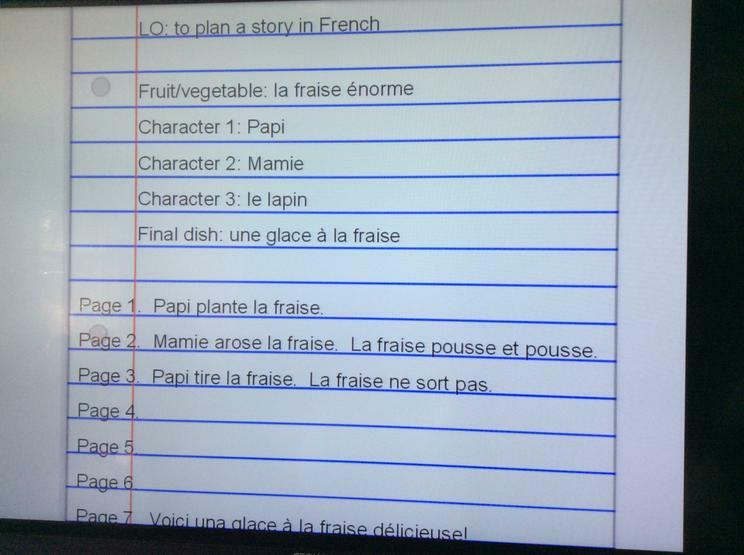 We have planned and started to write our own versions using different fruits and vegetables and characters...in French! 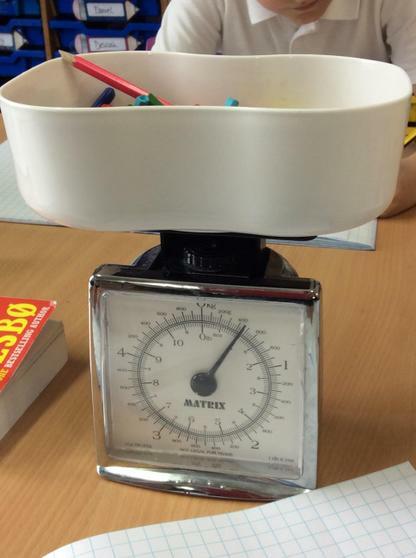 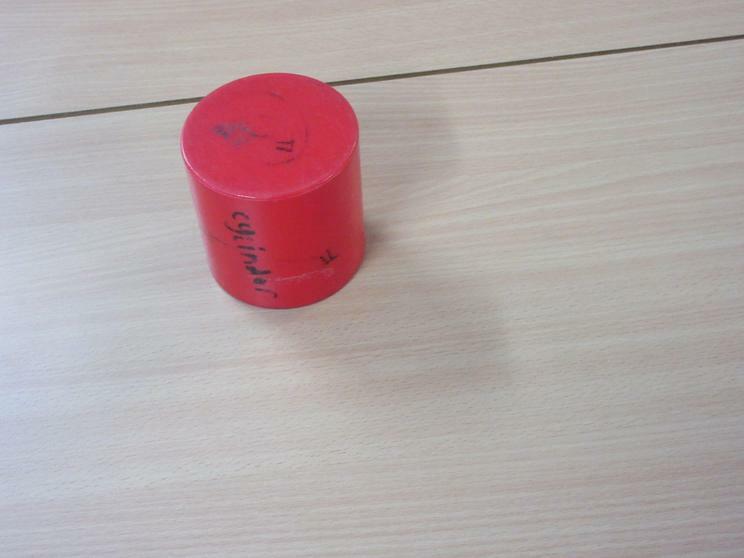 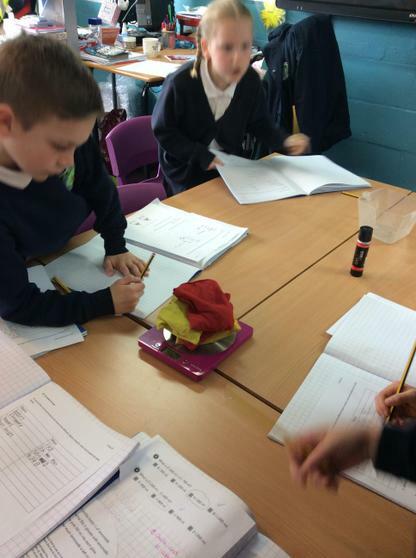 In Maths, we explored mass; what it is and how we can measure it. 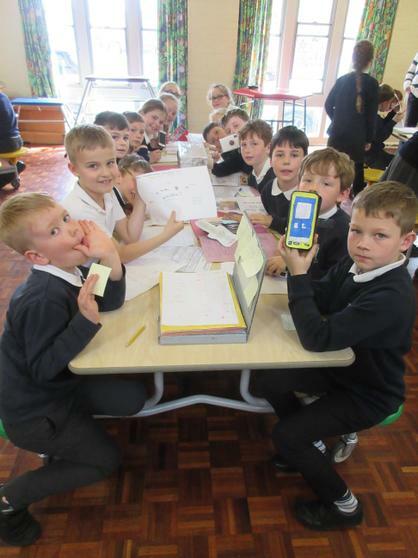 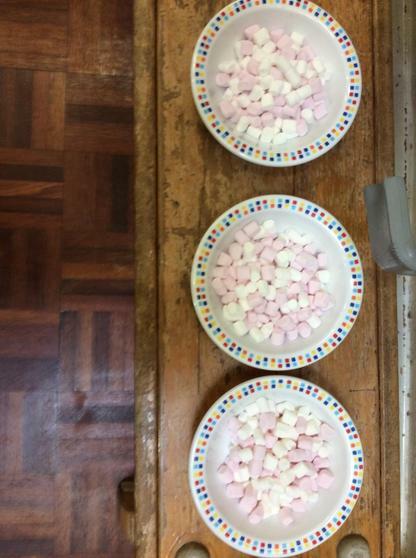 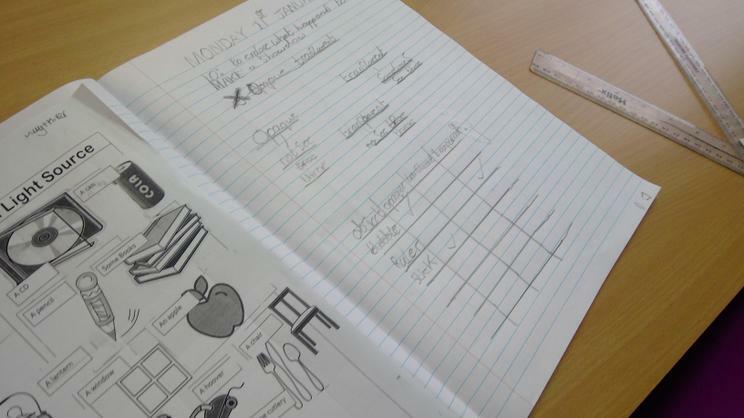 The children were given a variety of objects and a set of scales to measure the mass, record it in a table and then move round to the next table. 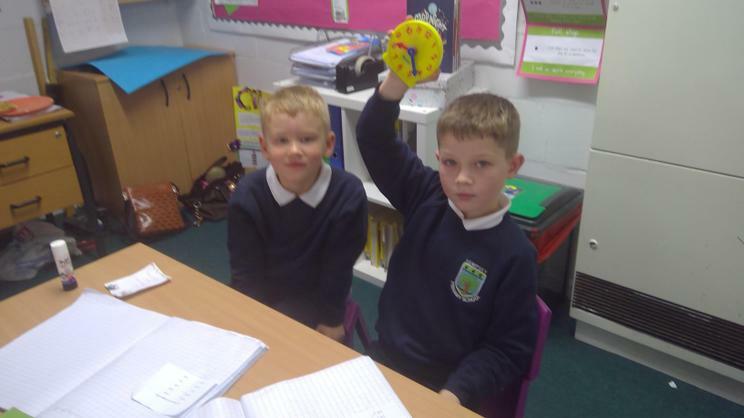 We used two types of scales to show how different sets measure. 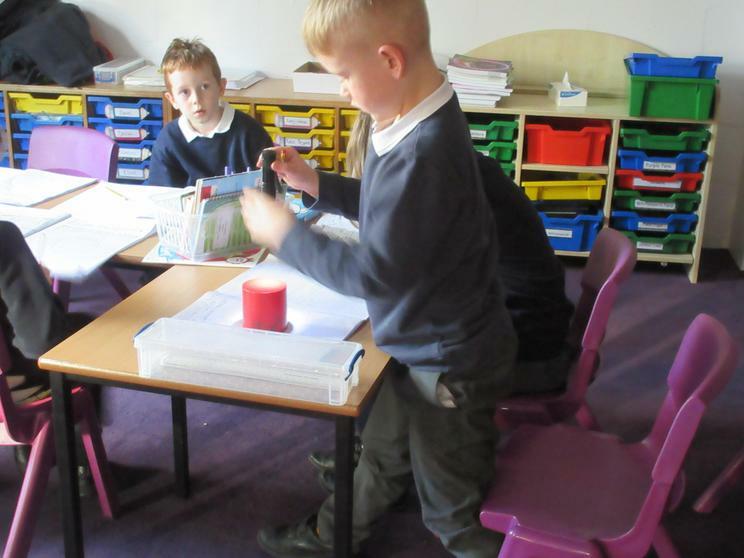 Once the children had measured the items, they then had to answer some questions to further consolidate and deepen their understanding. 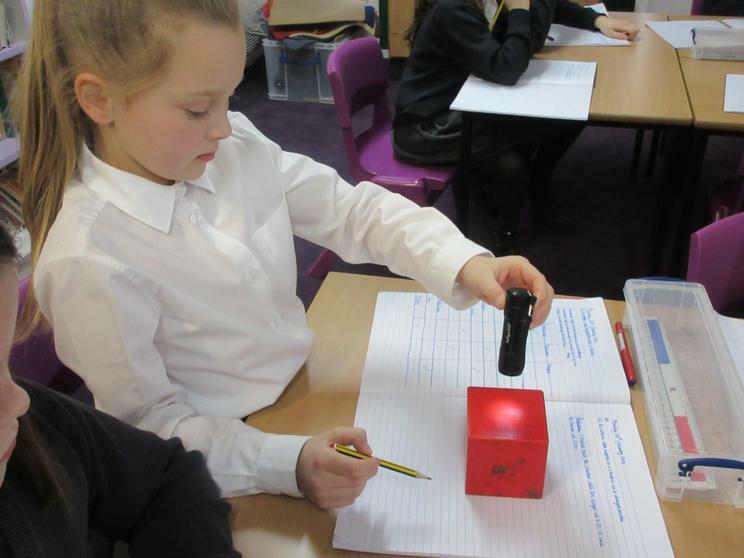 In Science today we explored the North and South poles in magnets then continued with testing out which materials were magnetic and why. 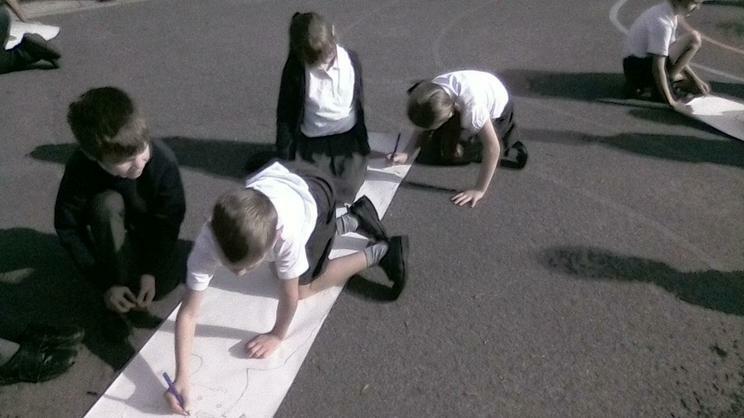 We each drew a route on a piece of paper to follow with a magnet. 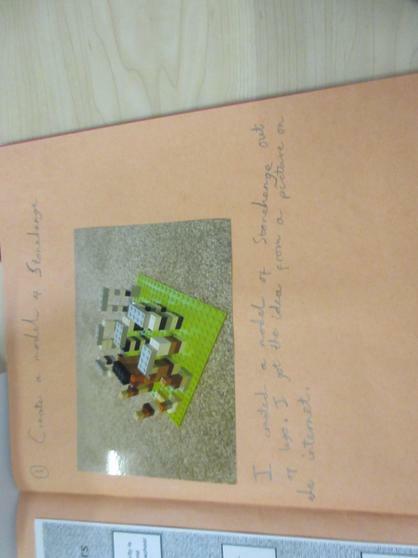 The children had to 'problem solve' by thinking about how they could do this more effectively. 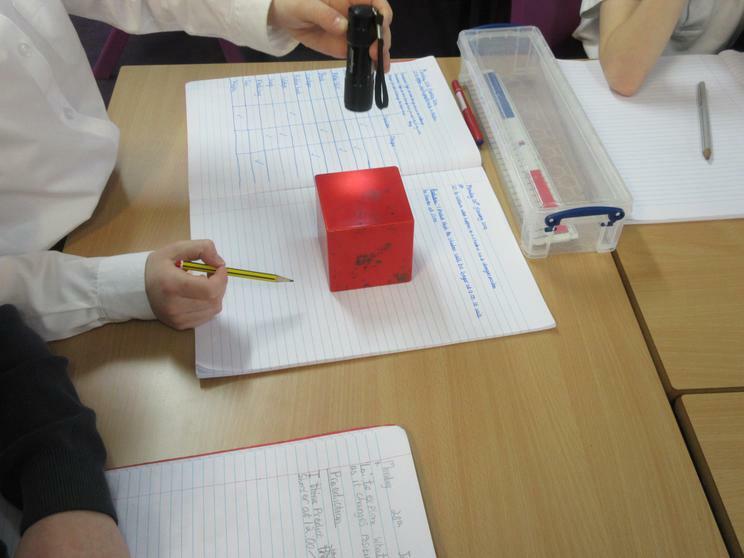 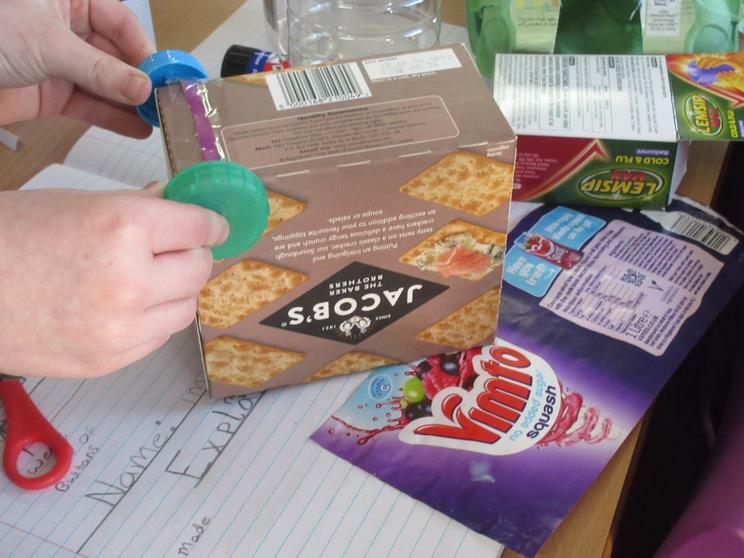 Next we explored materials and predicted whether certain materials were magnetic or not. 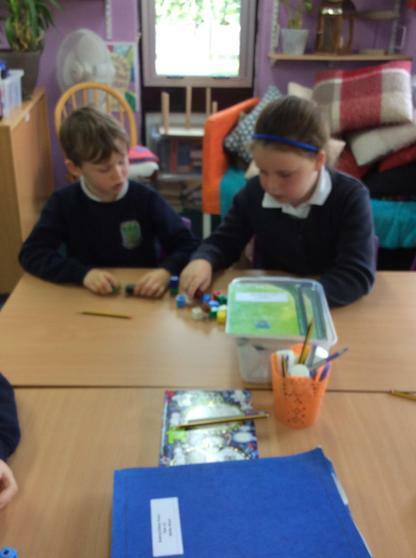 The children worked in pairs or small groups and showed that, by working together, you can problem solve easier and more efficiently. 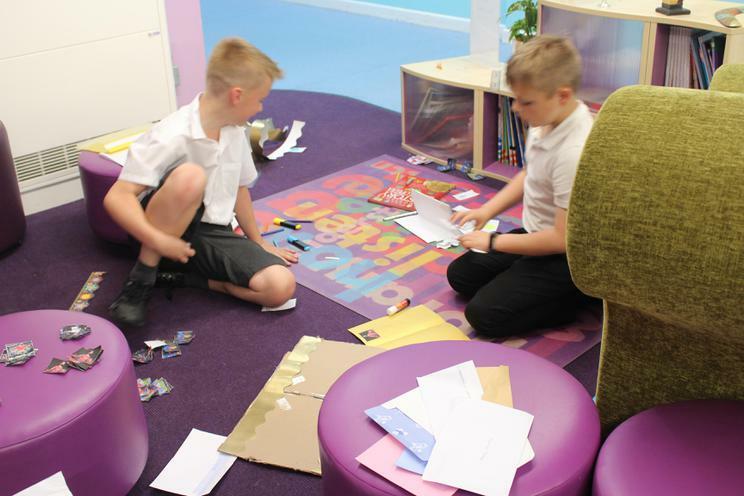 Our learning pit is up in the classroom and it is here to remind us that learning is going to be challenging and that there may be times when we want to give up. 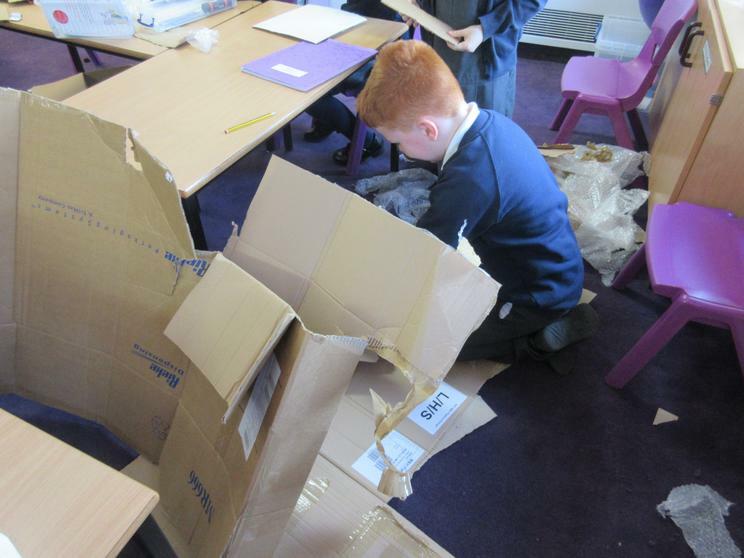 However, it also shows that with a little perseverance, determination and teamwork we will be able to complete our learning and come up the other side...Mario style! 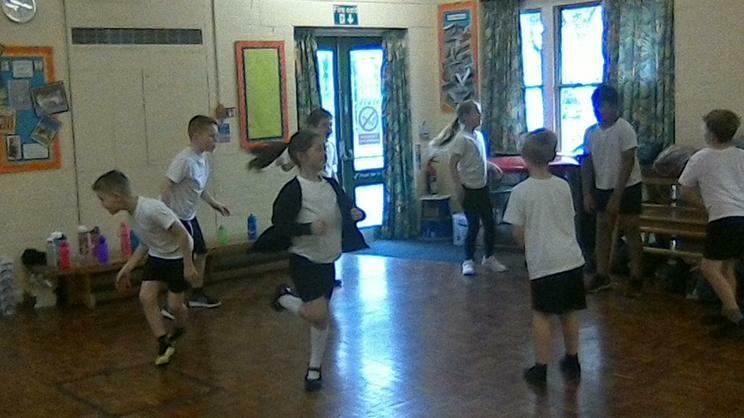 Every morning we start our day off by taking part in 'Active 10'. 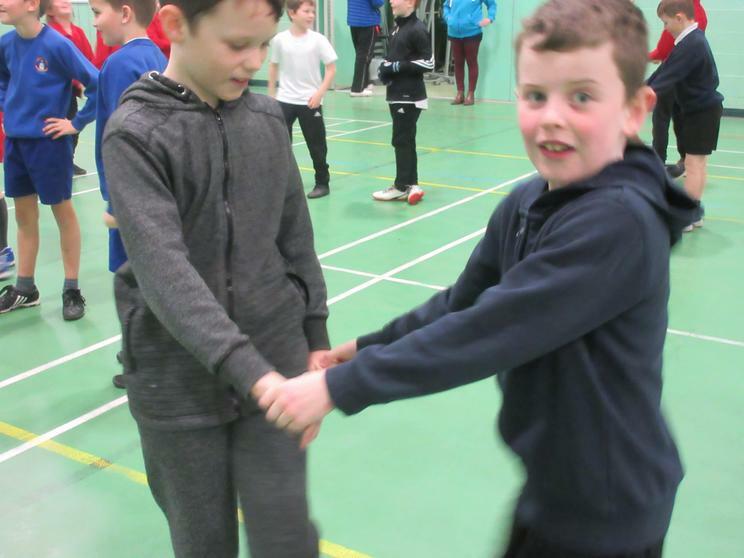 This week, we have switched it up a bit and have been dancing to a variety of songs to get our bodies and minds moving. 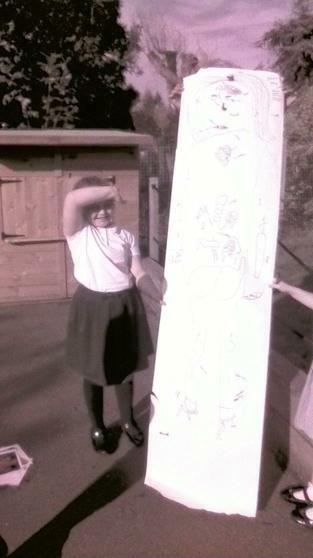 The children have enjoyed doing this and we have gained a bank of favourite 'go to' dance songs! 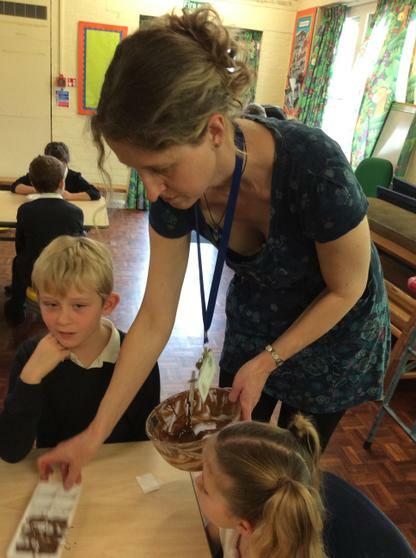 How fast is it melting? 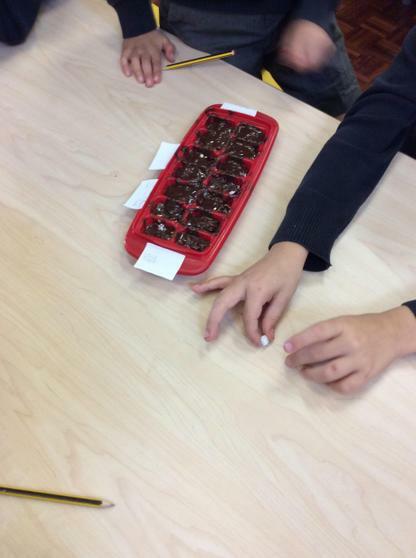 Does the ice move when you blow on it? 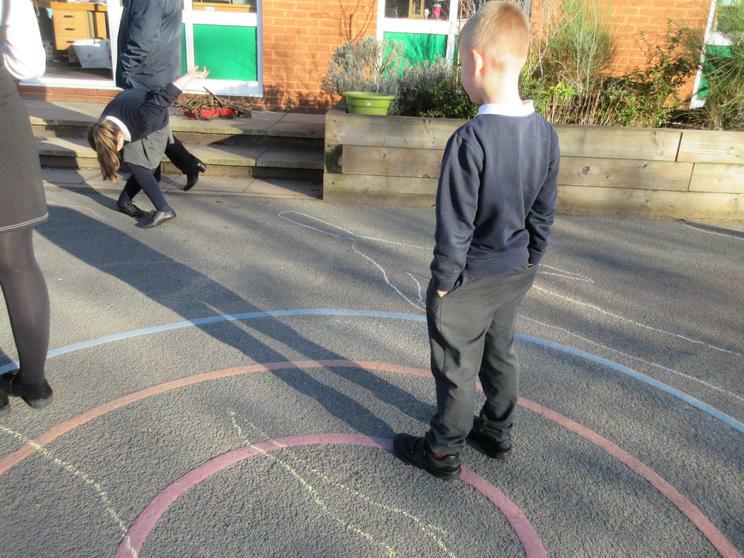 Does the ice travel far? 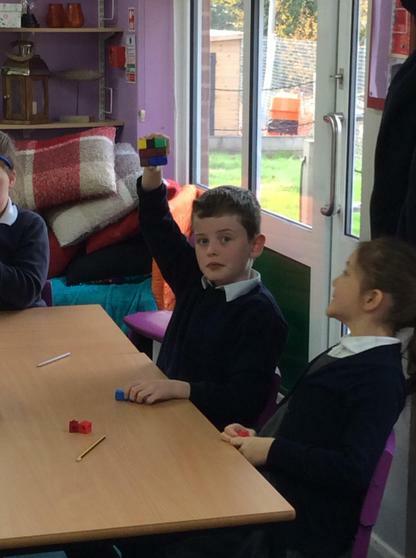 What is the force acting against the ice? 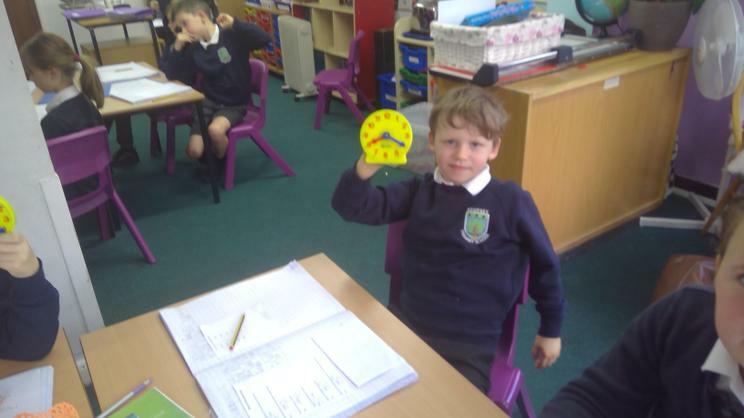 How quickly is the ice melting? 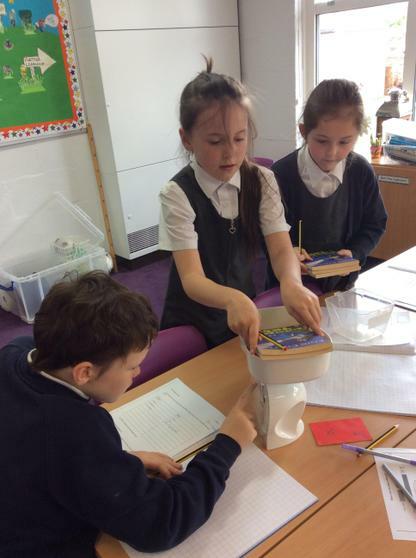 Is ice denser than water? 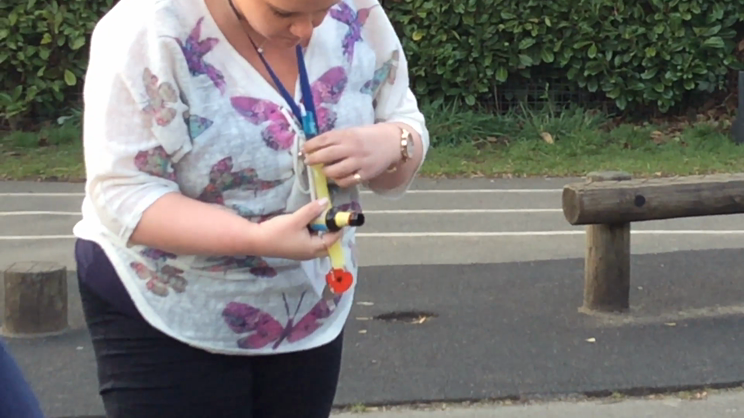 We placed food colouring in the ice pop to show how water moves through the water. 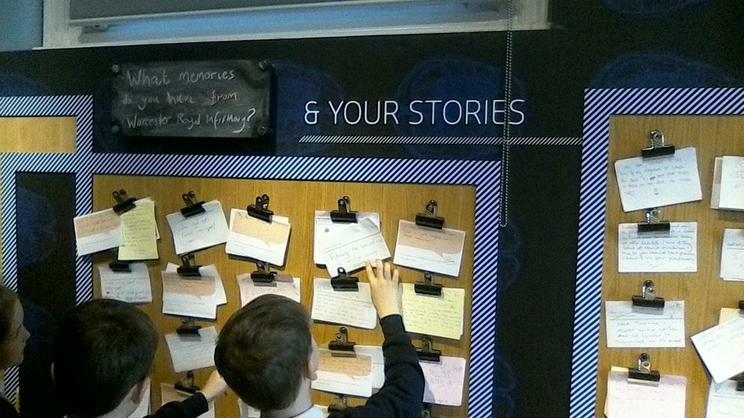 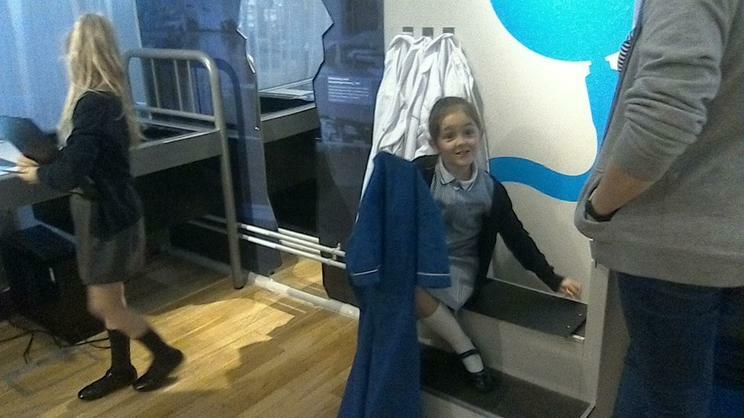 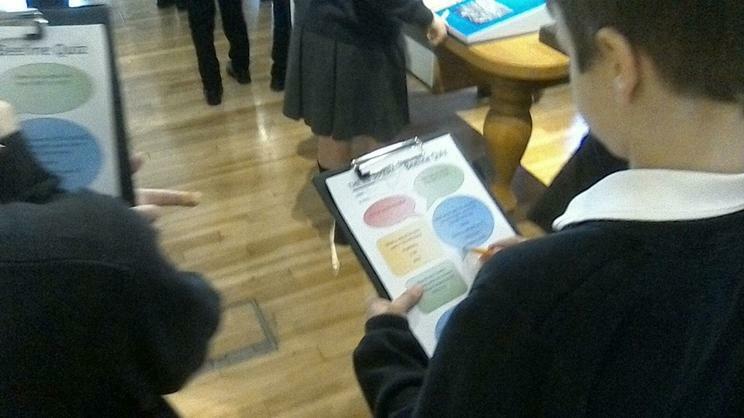 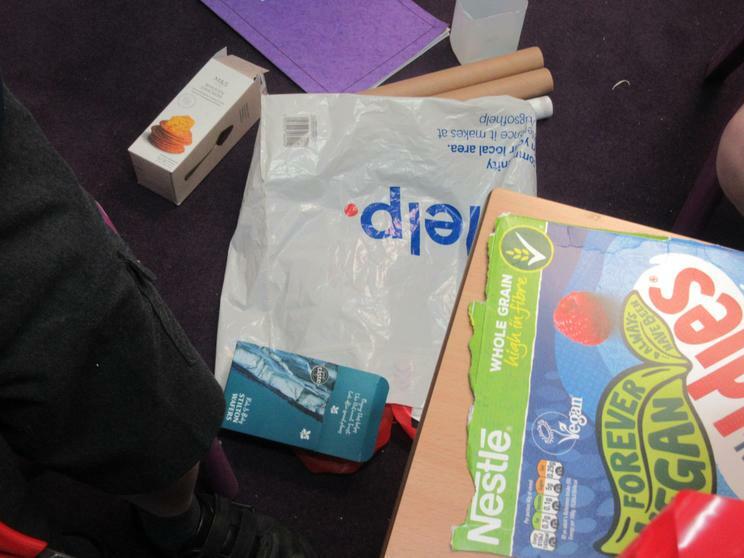 Today we celebrated British Science Week with some experiments, focussing on the theme of 'Journeys'. 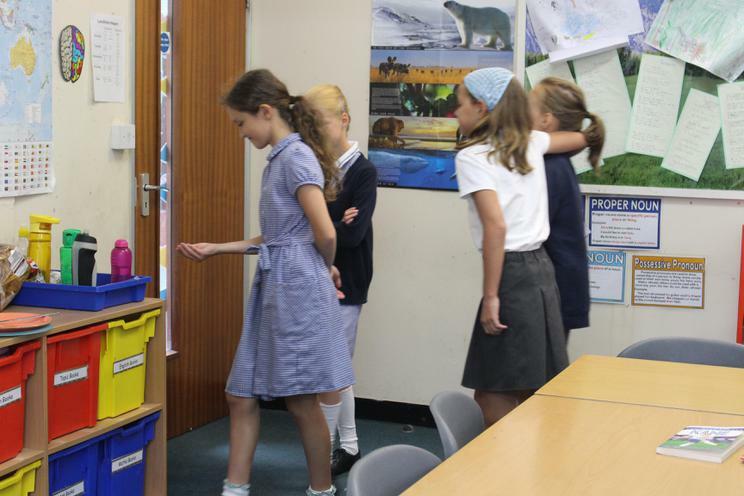 Whilst in Oak classroom, we started to look at the journey a cruise liner takes but shifted the focus on to the journey an iceberg will take. 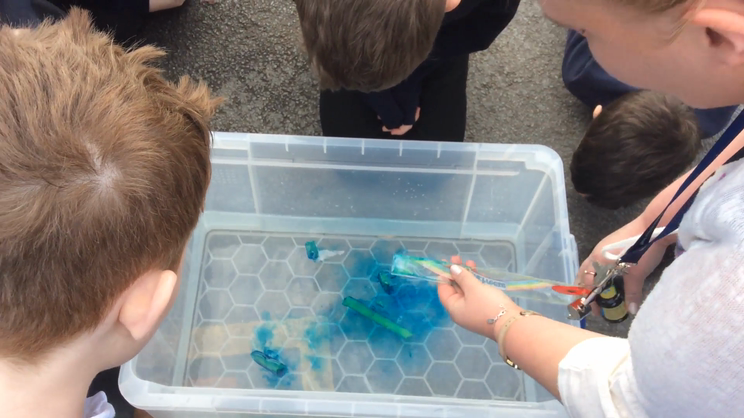 The children were told that they would be given an ice pop which would have food colouring in to represent, and show, what happens to the water when they place it in to water. 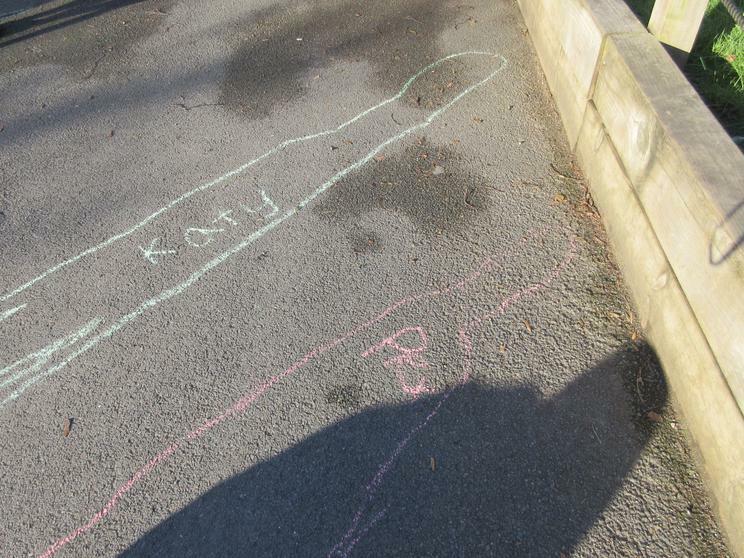 Before we went outside, the children made predictions about what would happen. 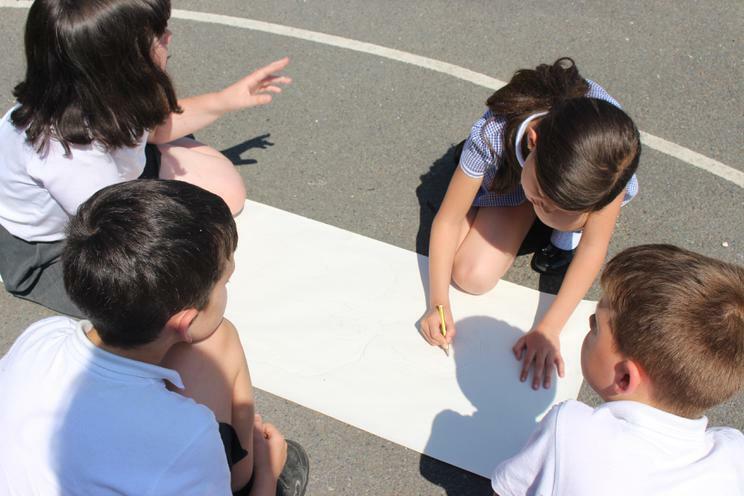 Once outside, the children were encouraged to discuss what was happening to the ice when it was placed in the water, whether it travelled as well as how far it travelled when the ice was blown on or the water was disturbed. 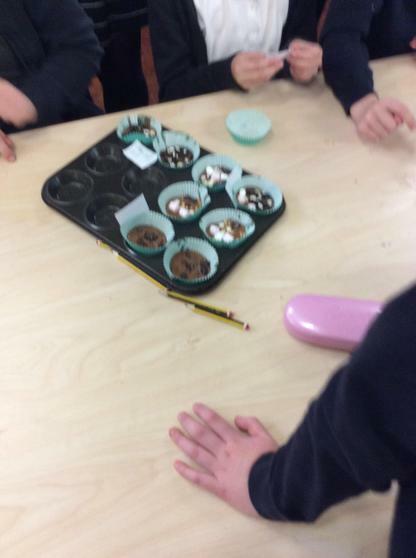 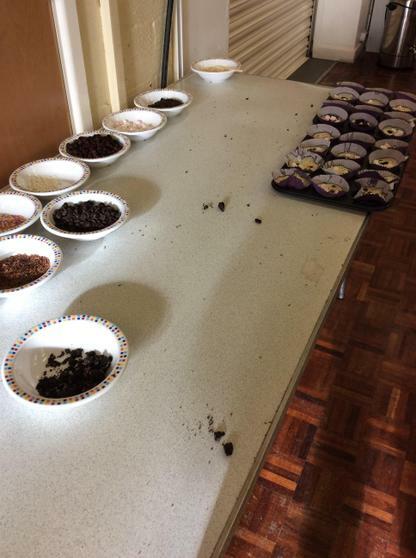 We had some fantastic discussions and the children concluded their experiment when they came back in to the classroom. 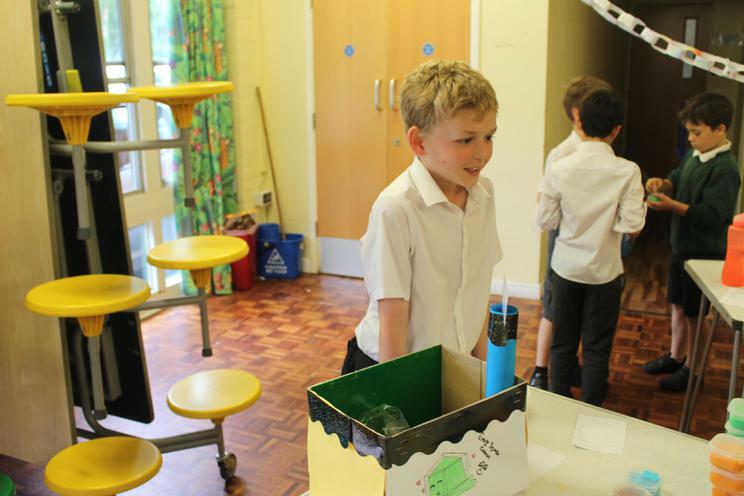 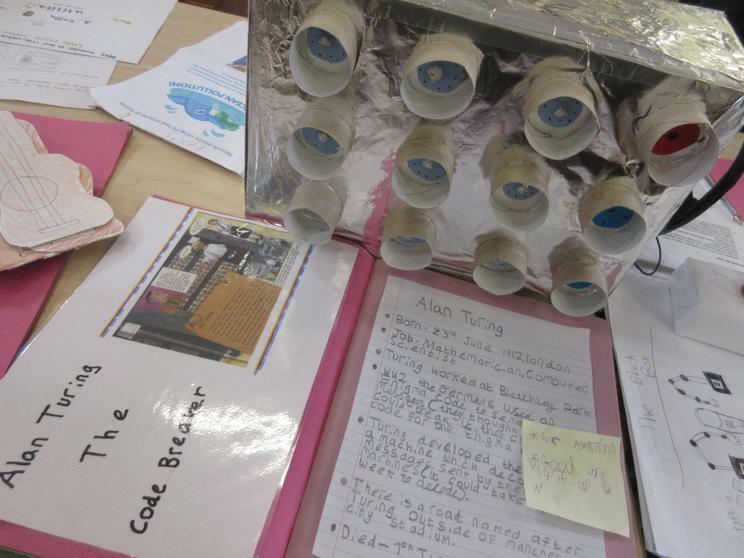 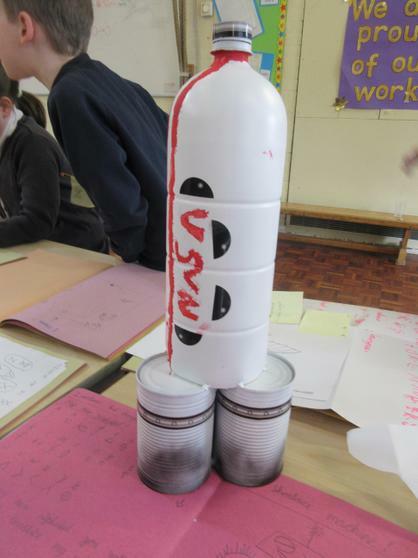 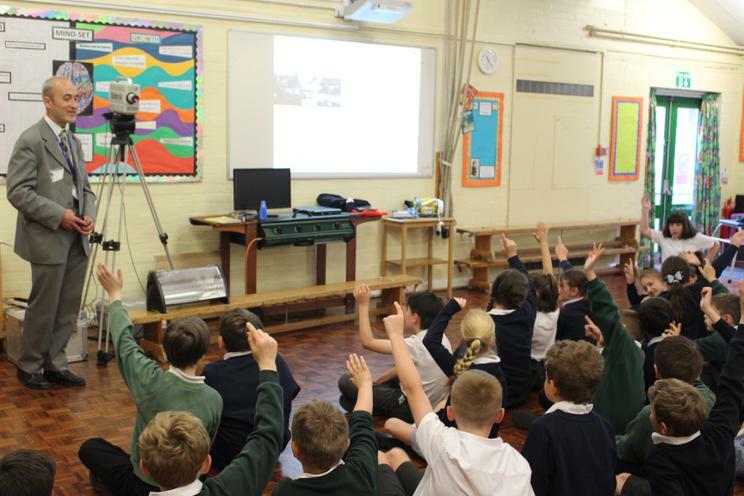 In Laurel classroom the children were given the task of designing and making a moon rover that had to safely transport water across the room without spilling any. 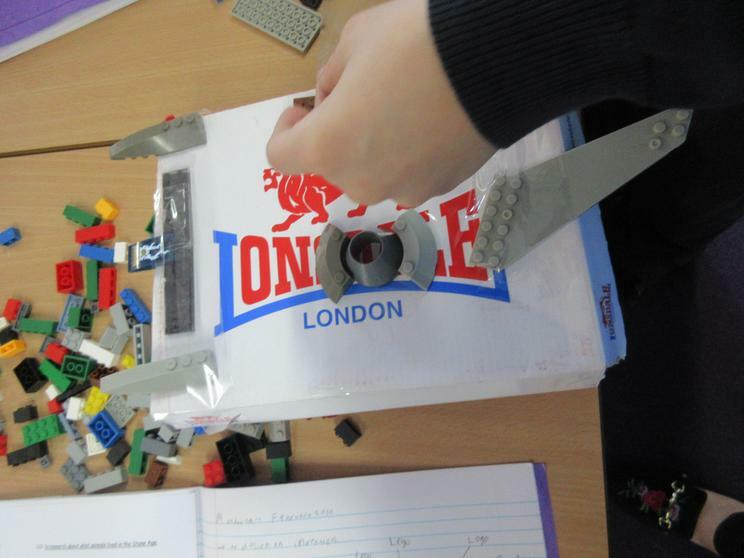 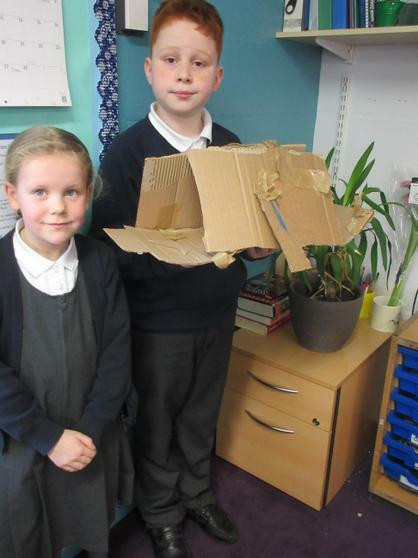 They firstly had to design their rover and think about how big they needed to make it. 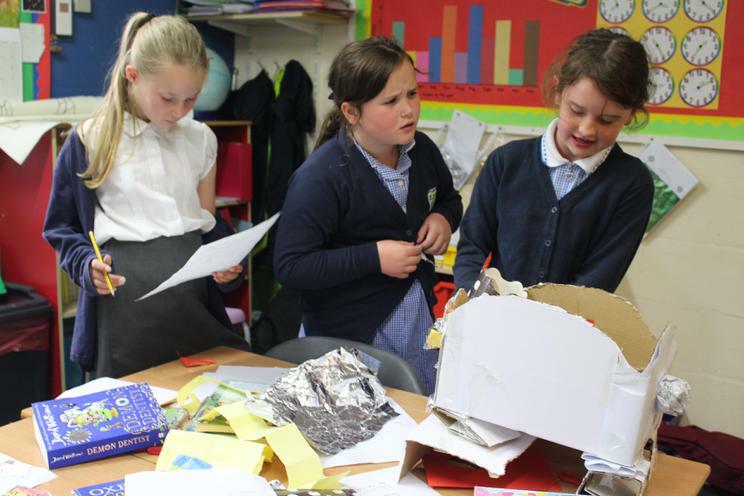 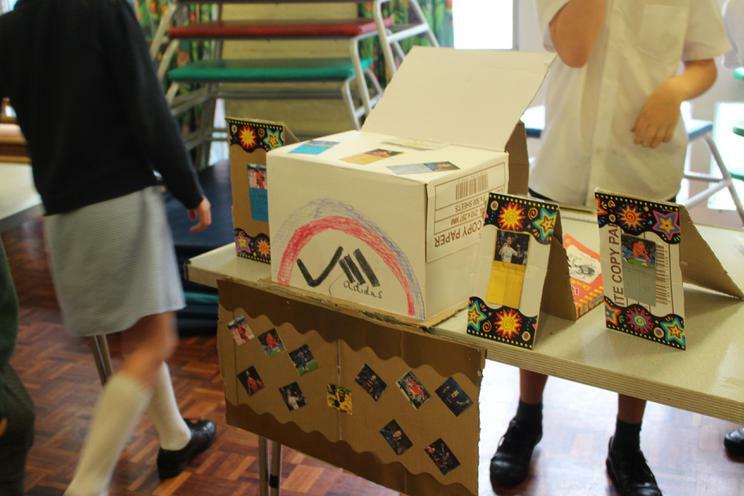 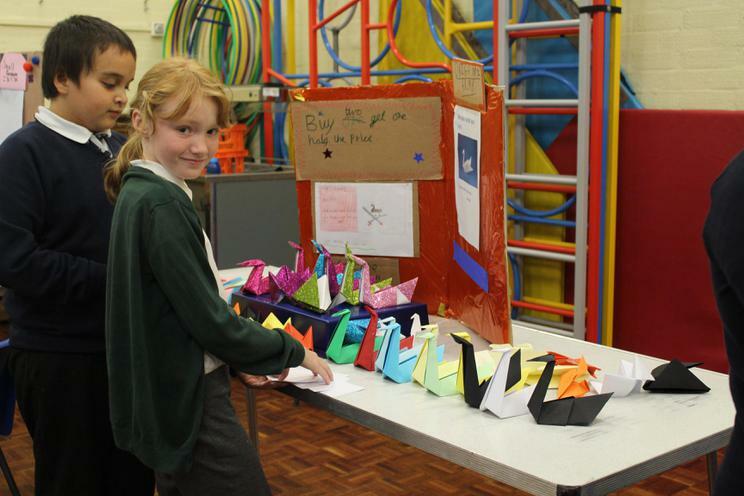 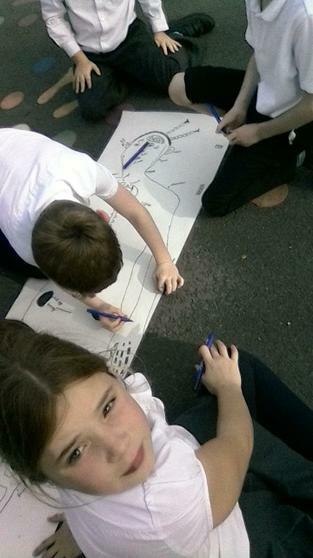 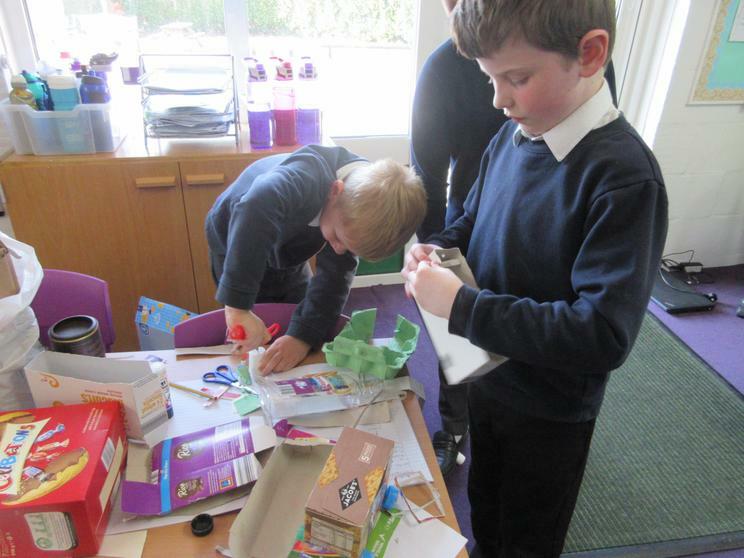 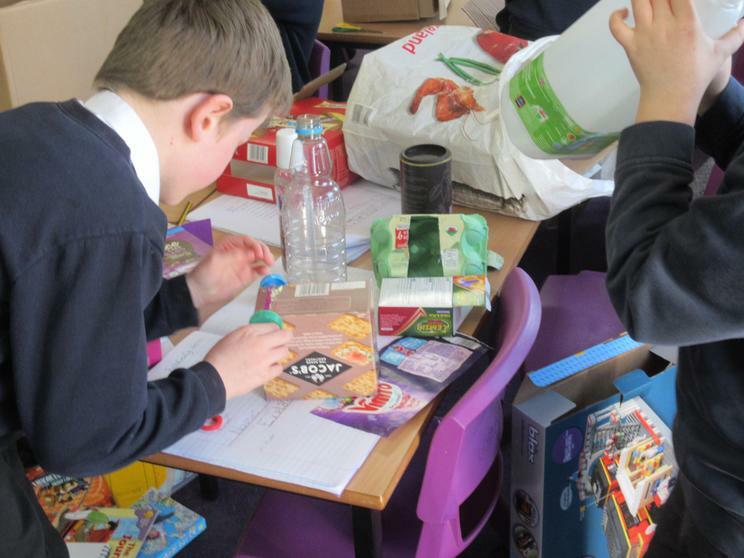 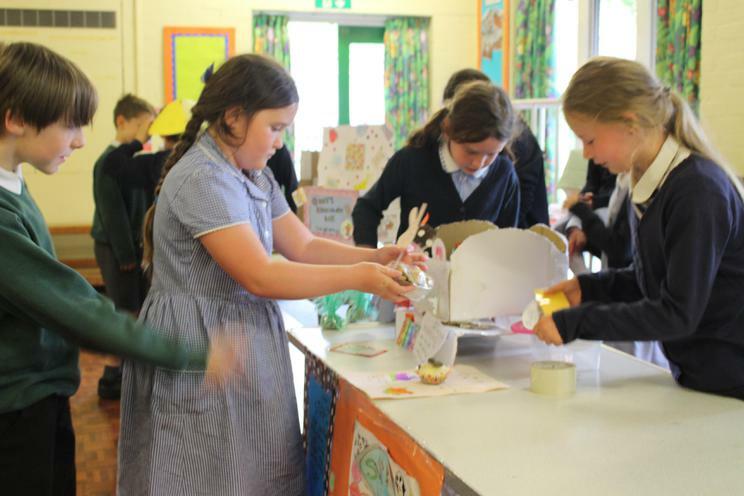 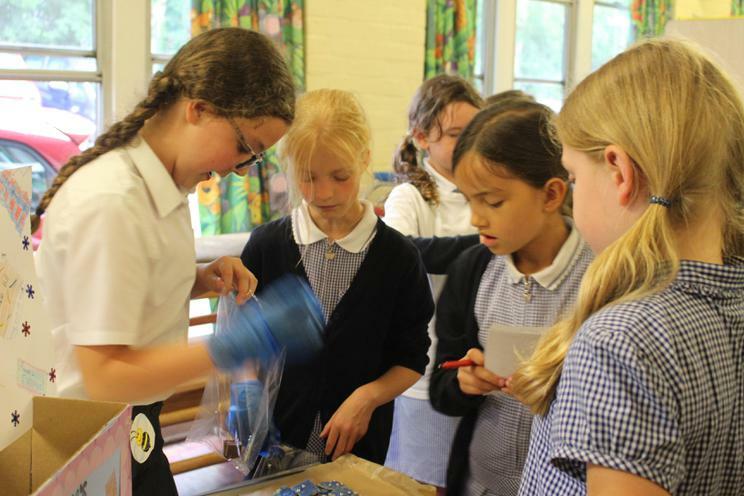 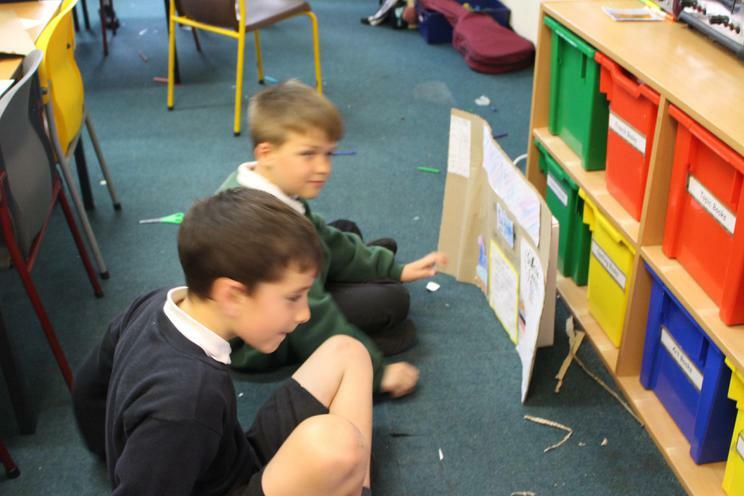 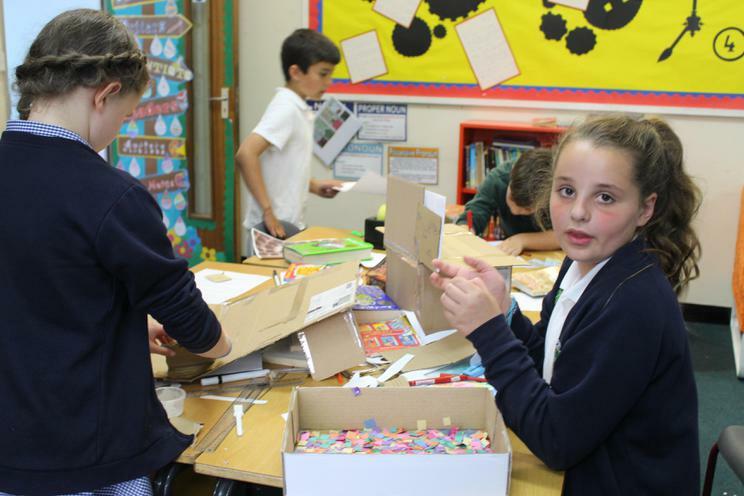 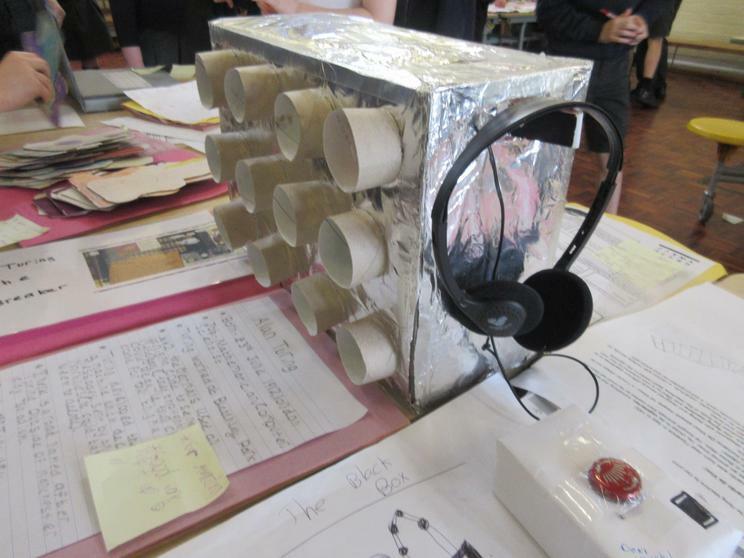 Next was the production process where the children worked collaboratively with their peers. 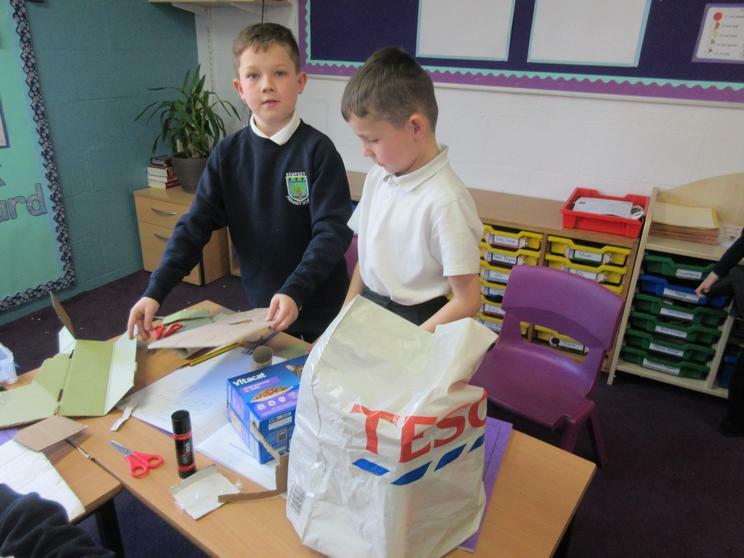 The final task left to do was to test out their inventions! 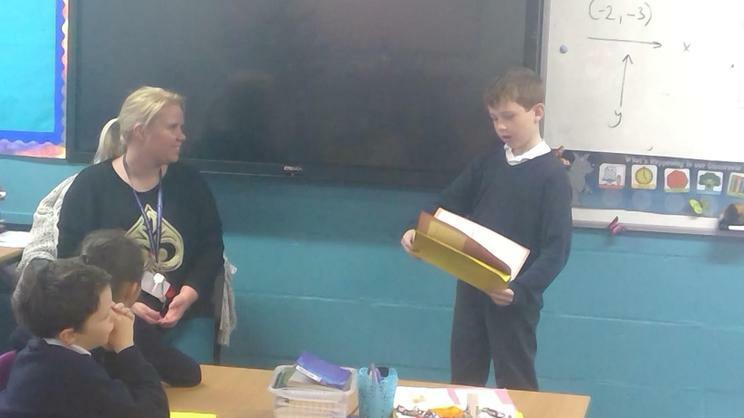 Today, we were very lucky to have two parents come in to read with Oak class. 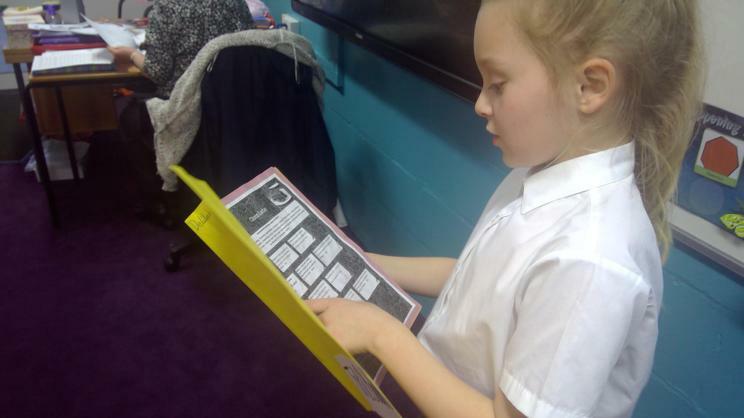 The children listened and answered questions about the books they were reading - The 'Wizard of Oz' and 'Billionaire Boy'. 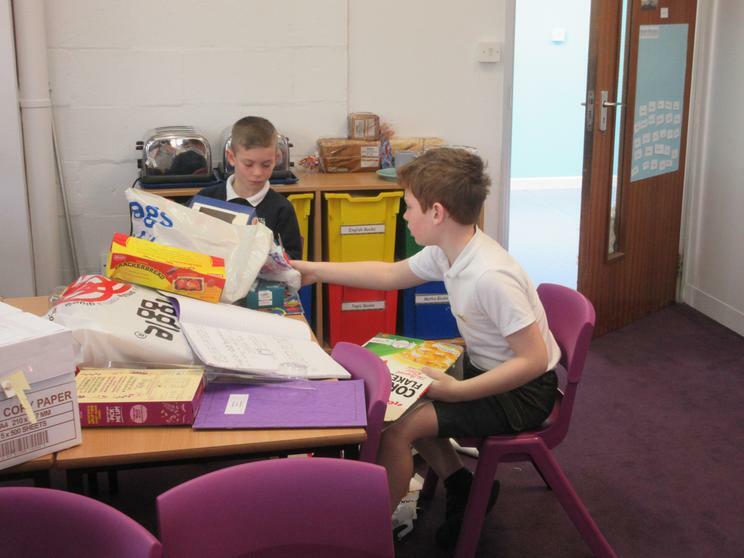 Oak Class have enjoyed World Book Day! 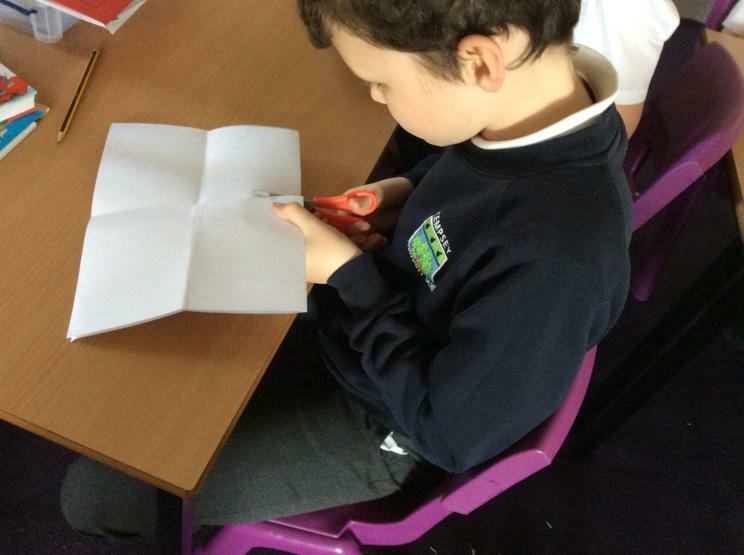 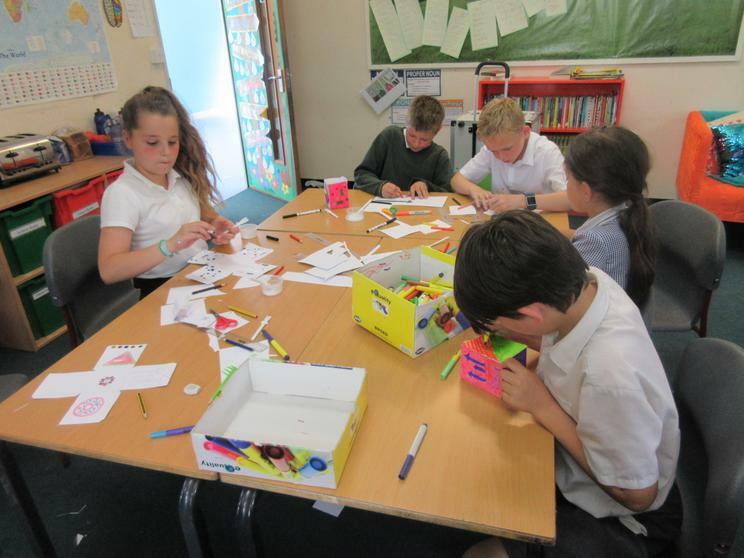 We continued World Book Day with designing and creating our own bookmarks. 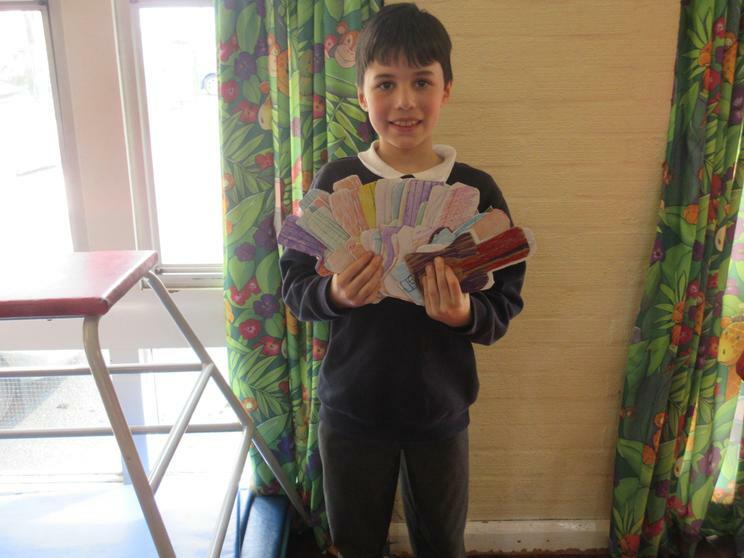 The aim was to colour and give two bookmarks to our book buddy. 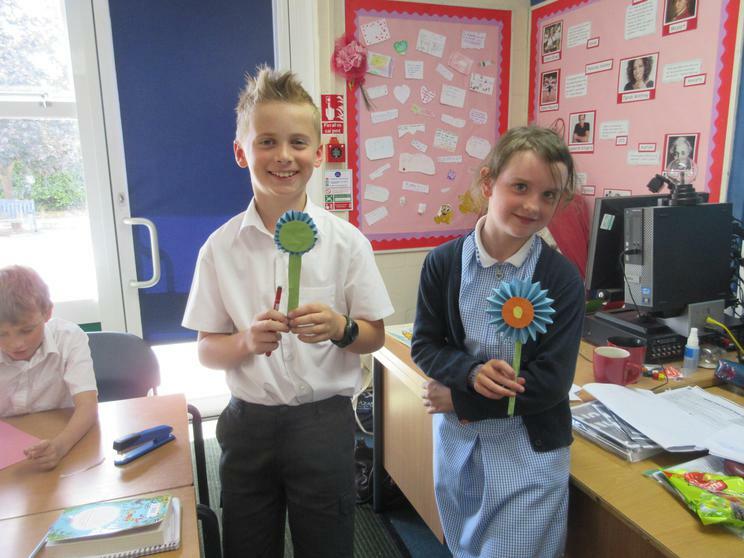 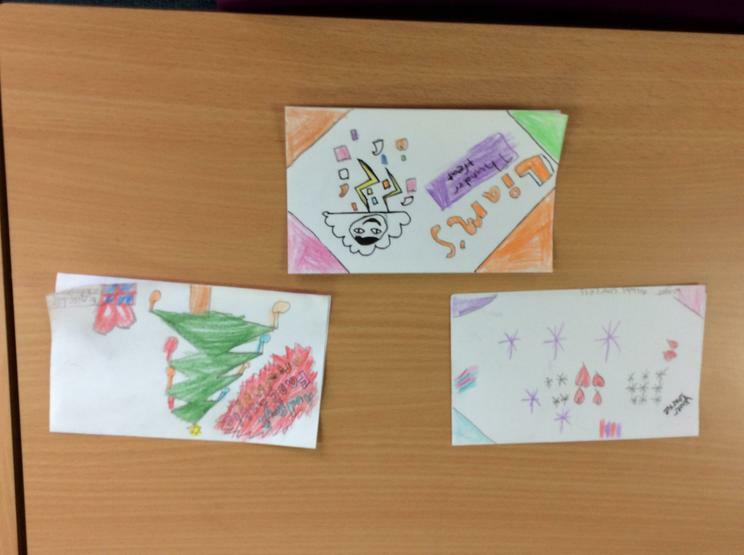 The children designed some lovely bookmarks using their favourite books as inspiration. 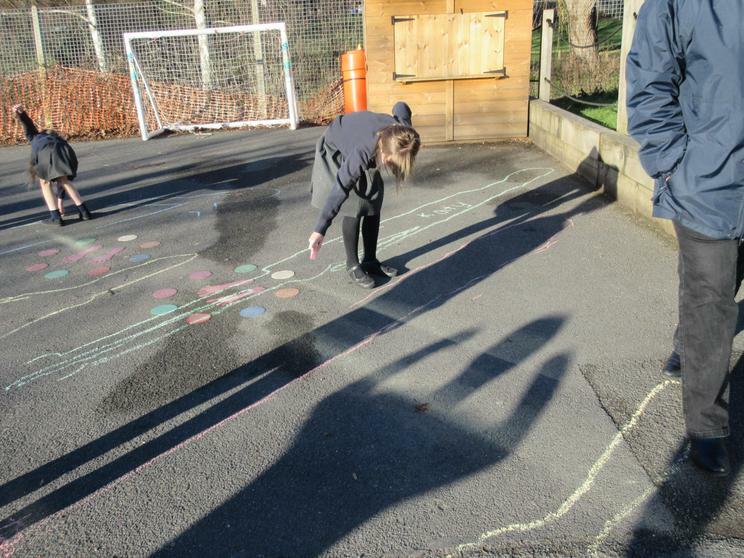 Today the class looked at how germs spread. 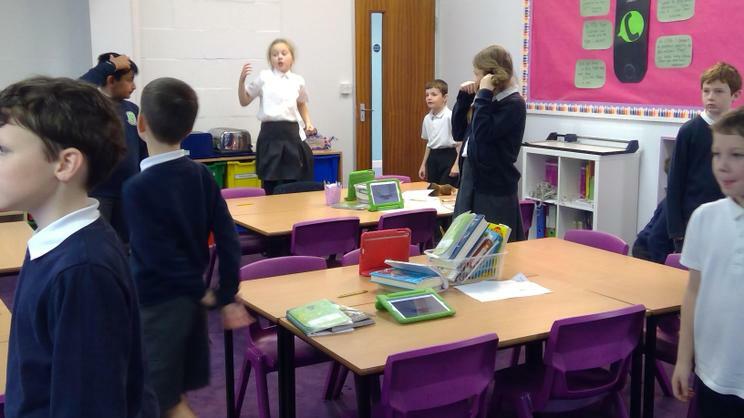 We focussed on coughing and sneezing. 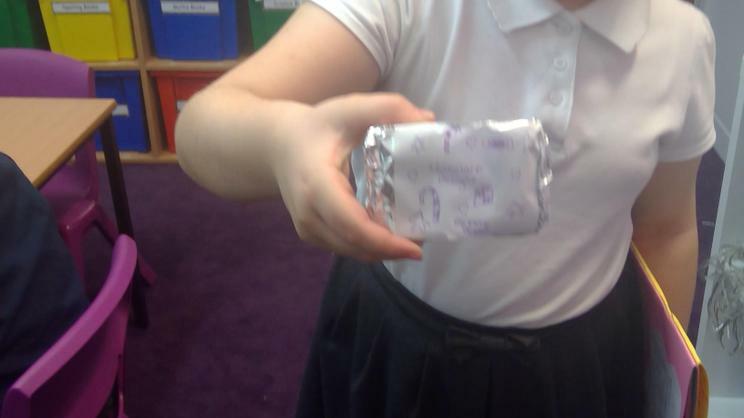 To test this, we gave the children glitter and asked the to sneeze and cough into their hands to see how far the 'germs' would spread and where the glitter landed. 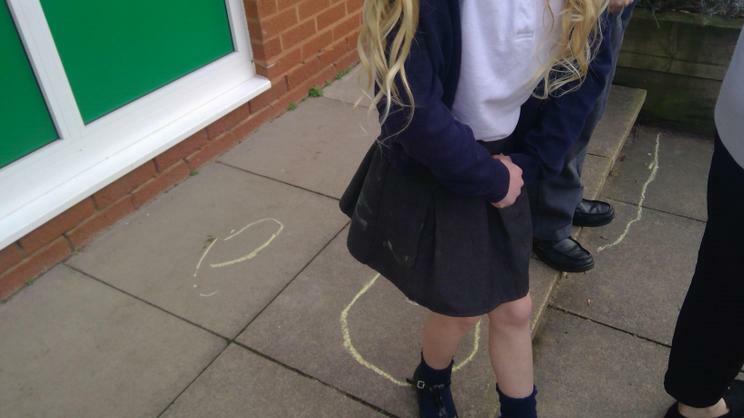 The children were surprised to see where the glitter did land and how much there was. 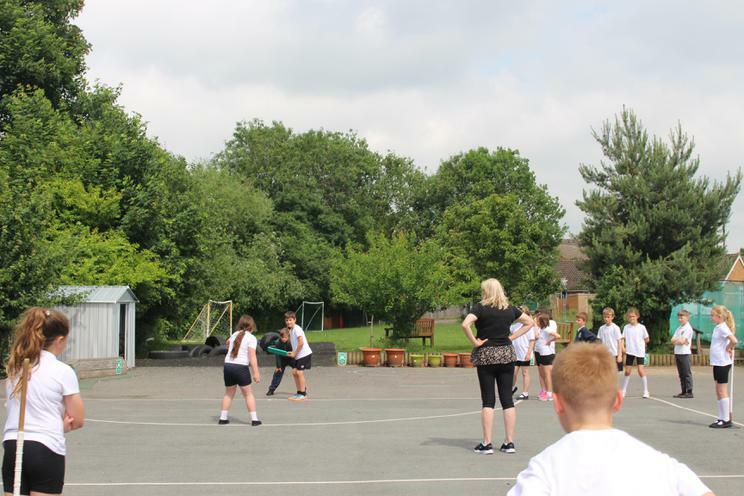 The children were learning how to dribble today in basketball - they had to dribble up a straight line then around the cones, back down and pass to the next person. 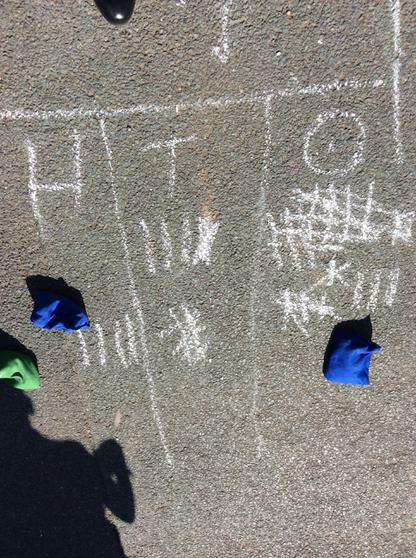 The children either passed by a chest or bounce pass. 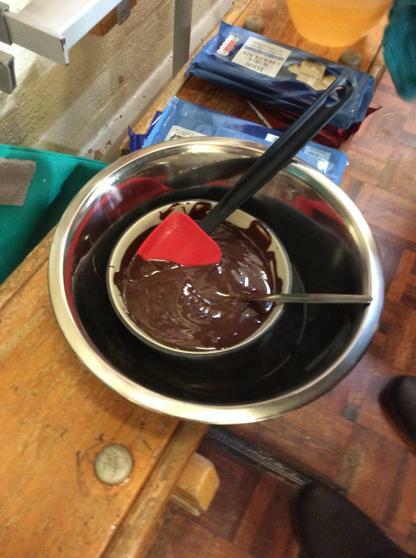 It's pancake day today and we are very excited to be making pancakes with the children on Wednesday 6th March. 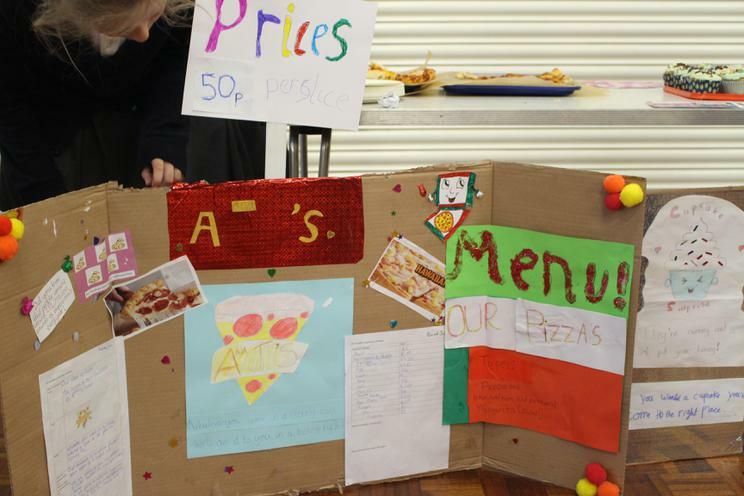 All ingredients and toppings will be provided for the children. 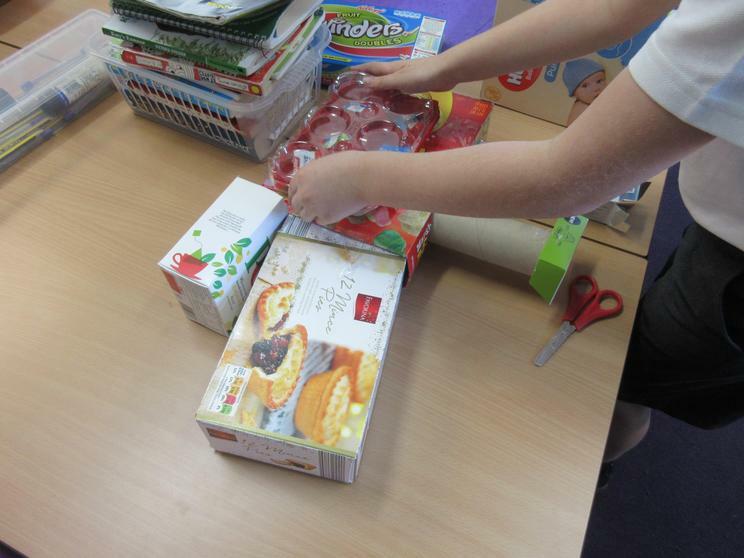 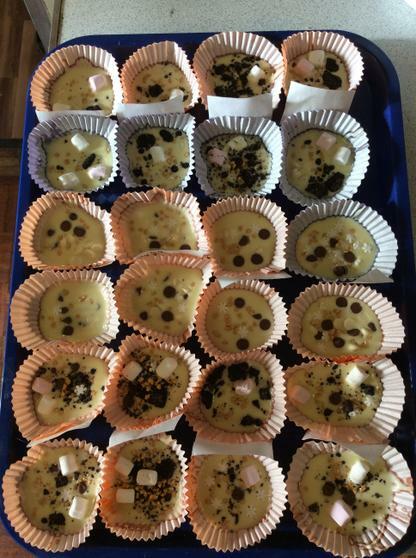 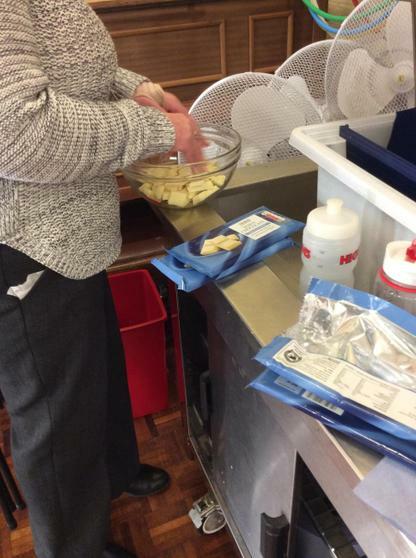 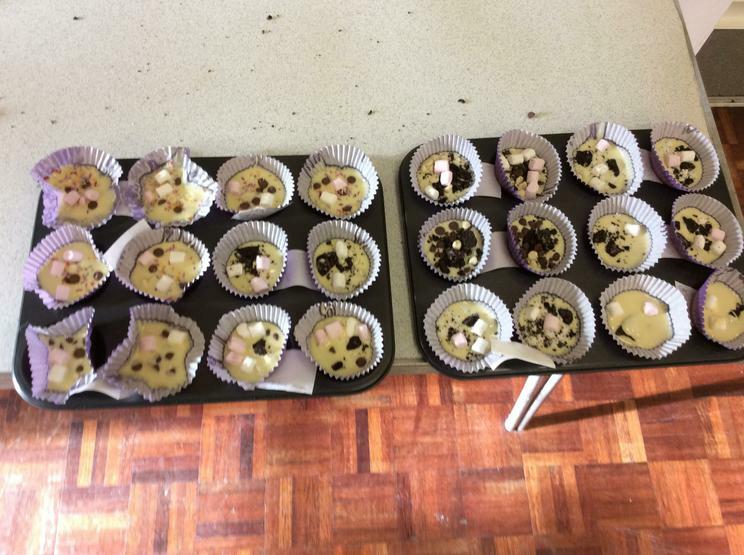 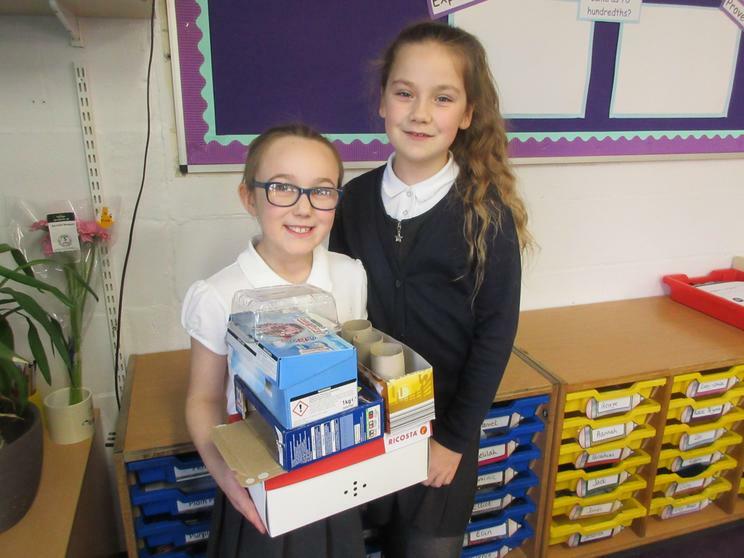 As well as the practical side of making pancakes, we have also looked at the religious reasons why we 'clear out' our cupboards to make these delicious treats. 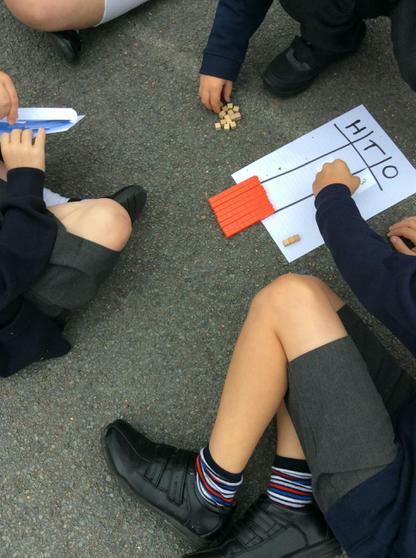 Today we started to look at statistics and how data is collected in a tally chart then converted into a pictogram. 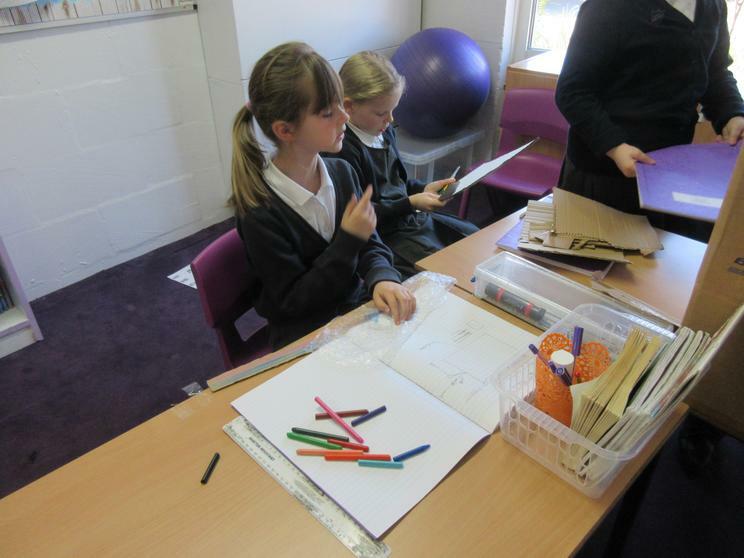 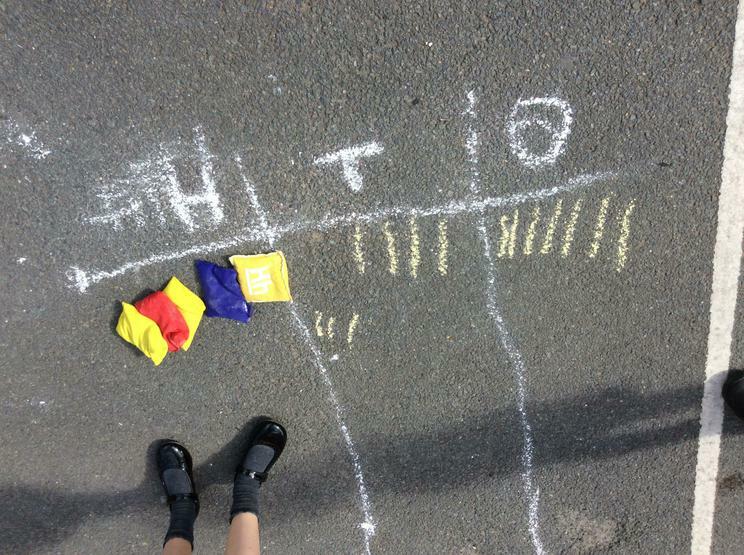 We got together with Maple and Laurel class to collect data on year 3/4's favourite colour to show in a tally chart. 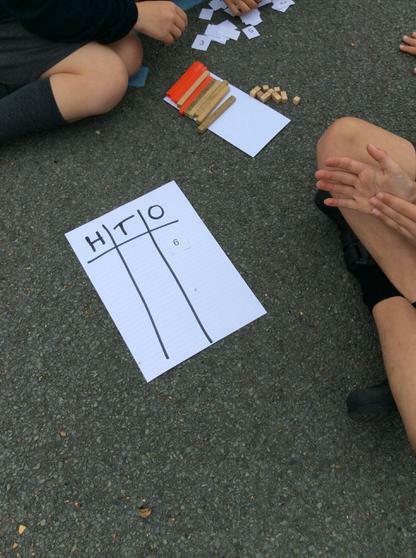 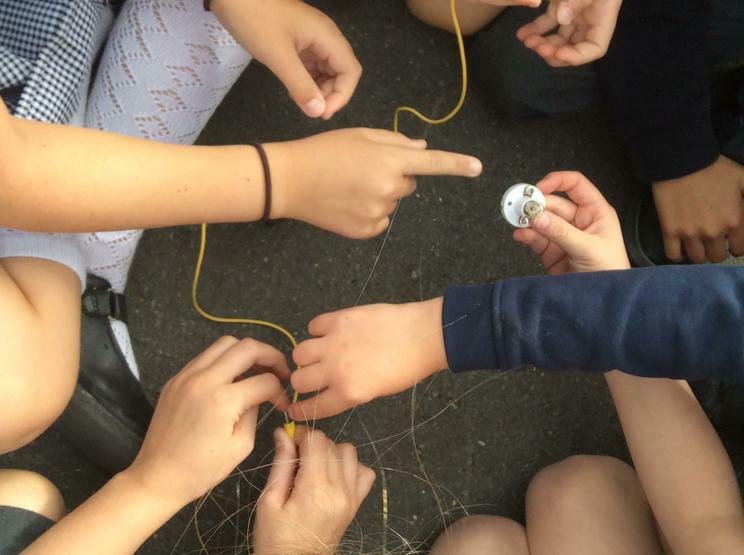 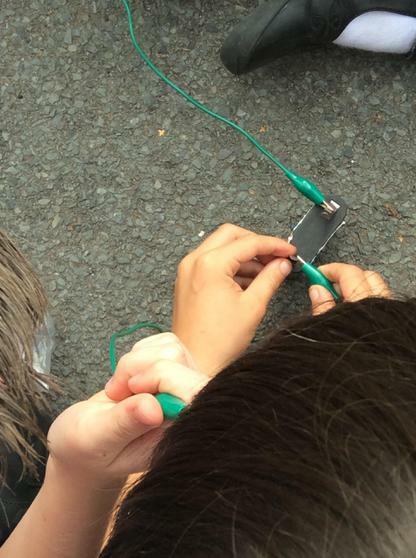 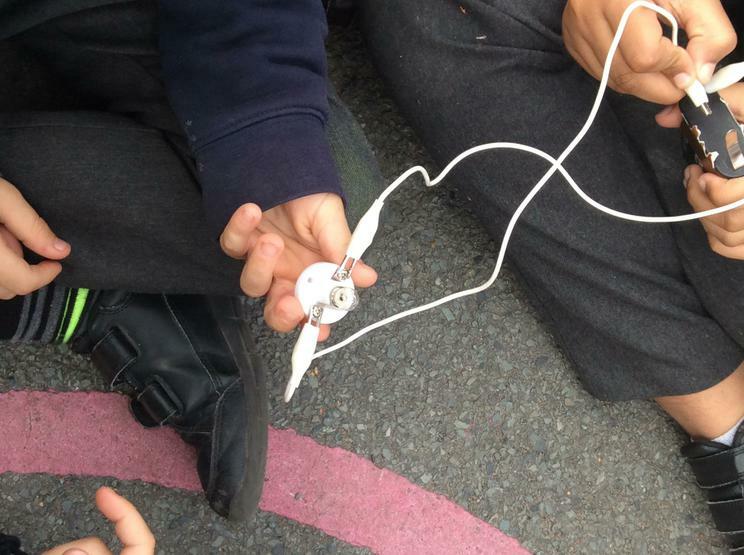 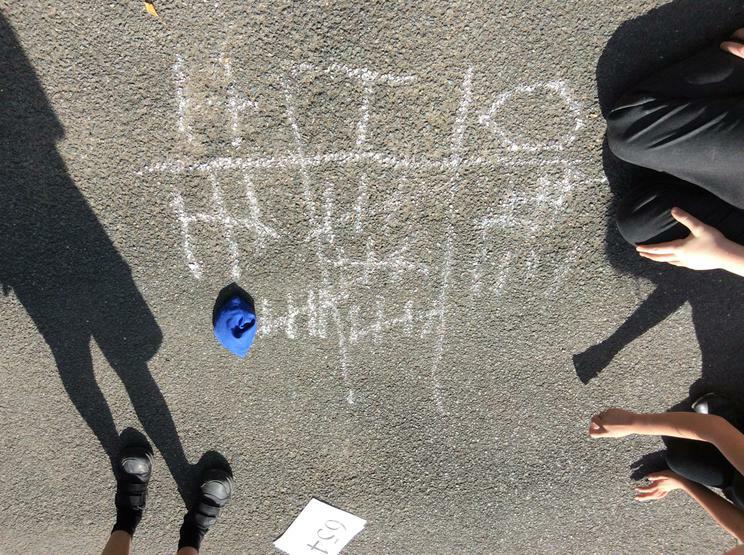 After this, we went back into our classrooms and collected our own data on which was our favourite invention (we had the choice of car, chocolate, iPhones or the alphabet). 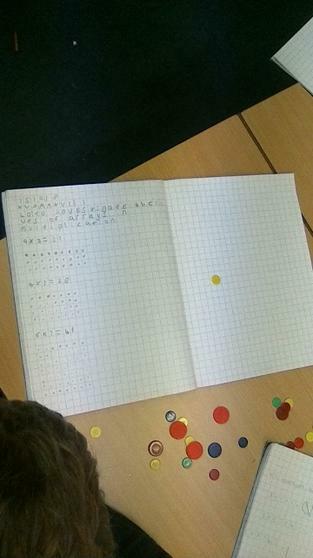 We then collected this information in a tally chart and converted it to a pictogram. 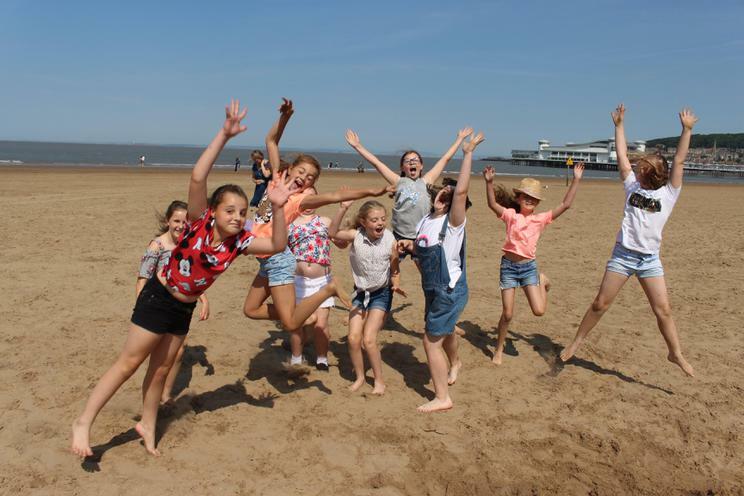 Just a quick reminder for parents and carers of Y3 children - swimming starts today and can we ask that all children bring in goggles and a towel plus swimming costumes/trunks and a swimming cap (girls only). 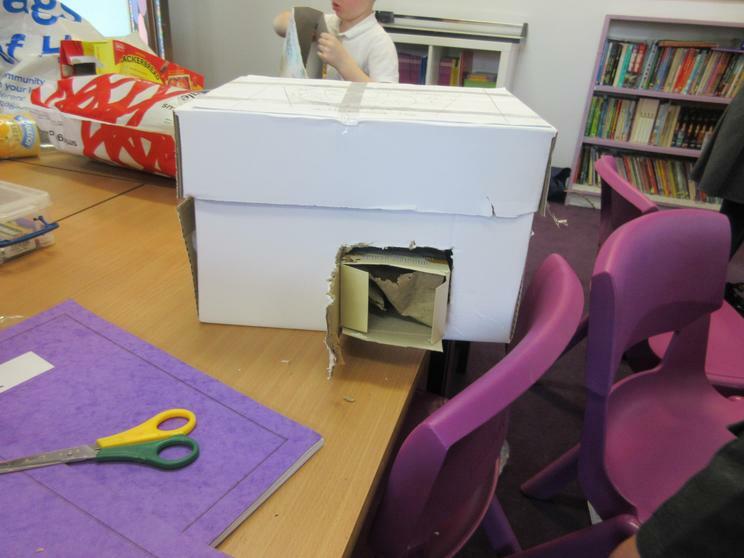 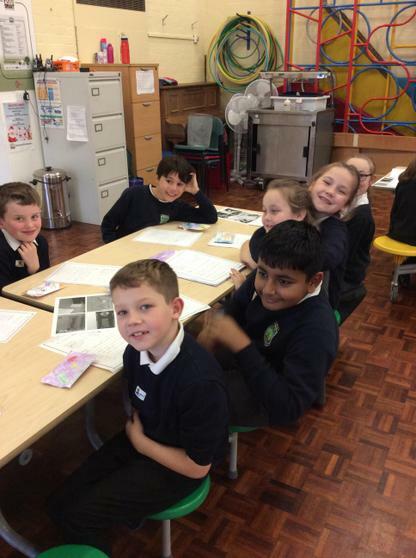 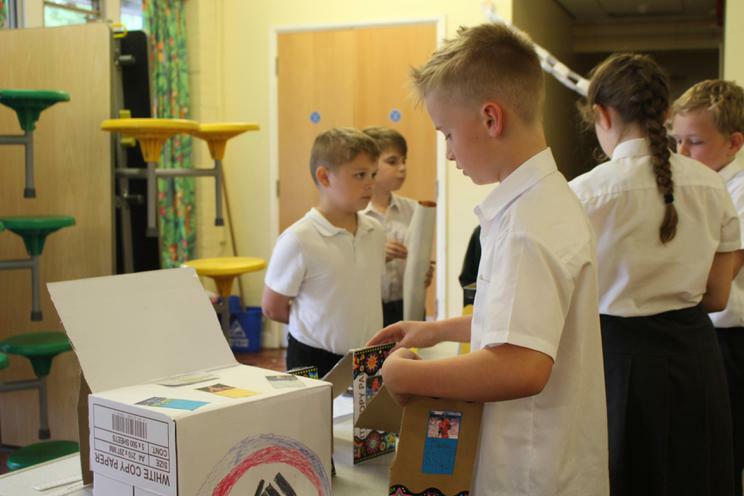 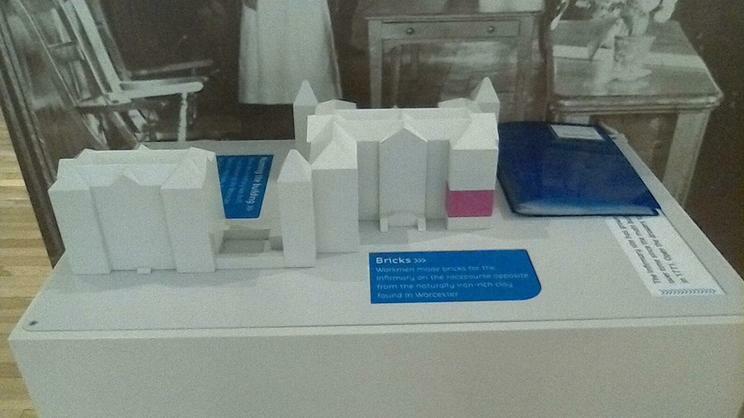 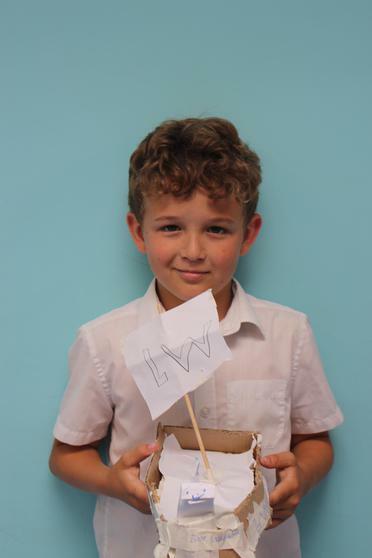 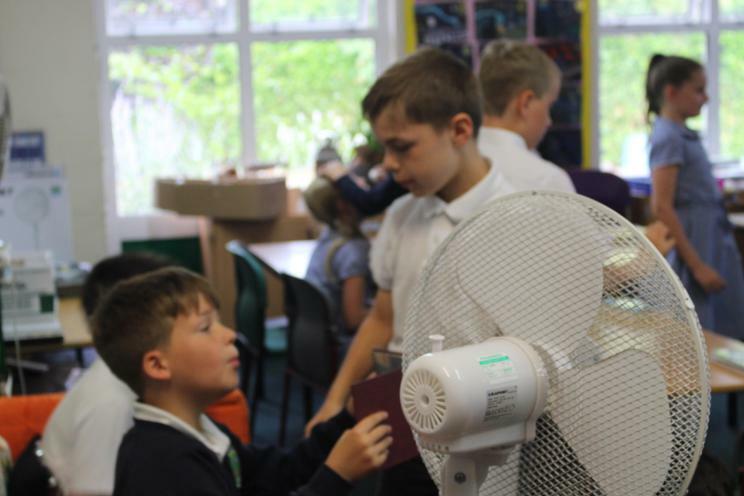 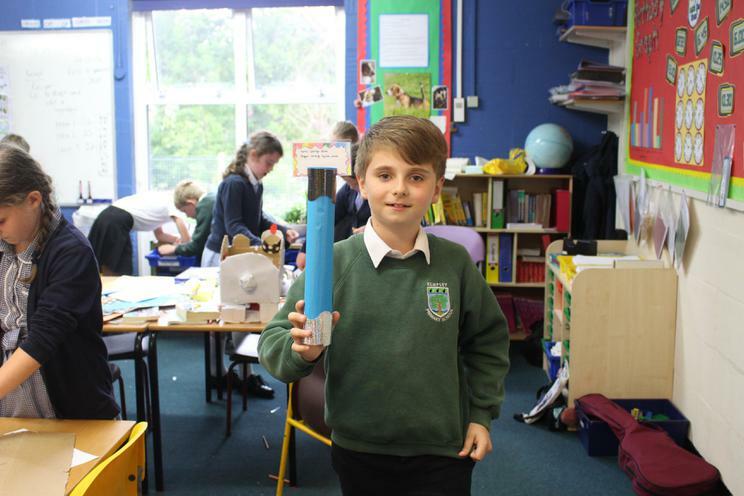 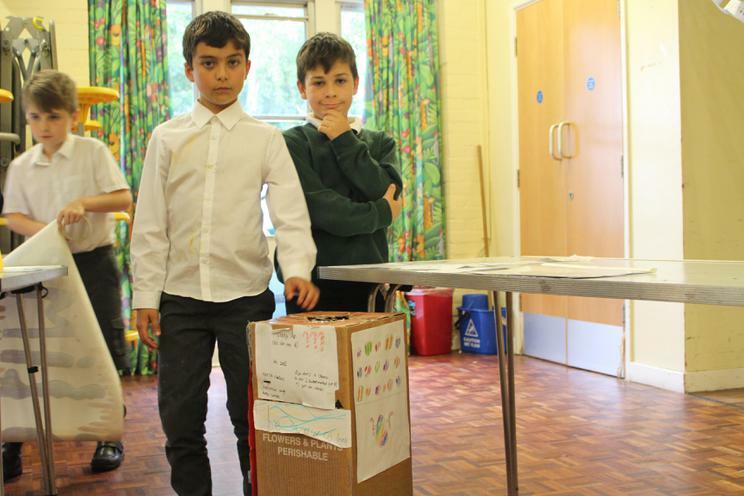 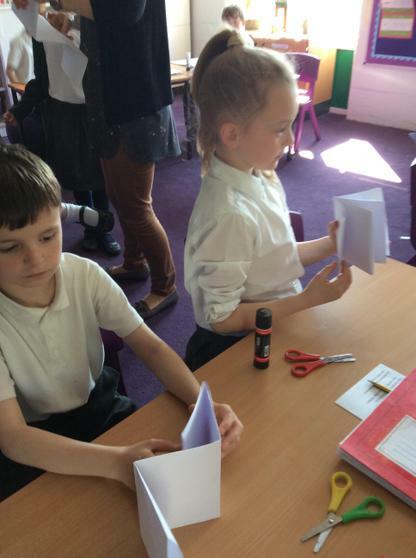 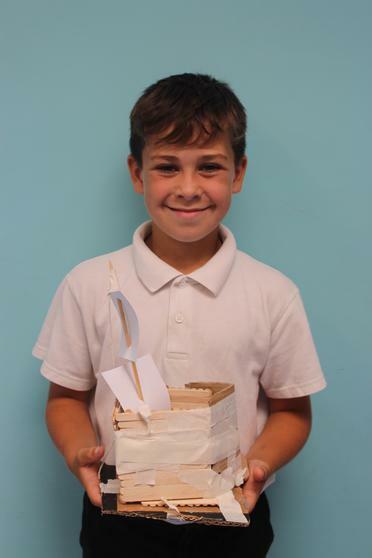 The children have finished off their topic launch for 'Inventions that changed the World' today by making their own invention that they designed yesterday. 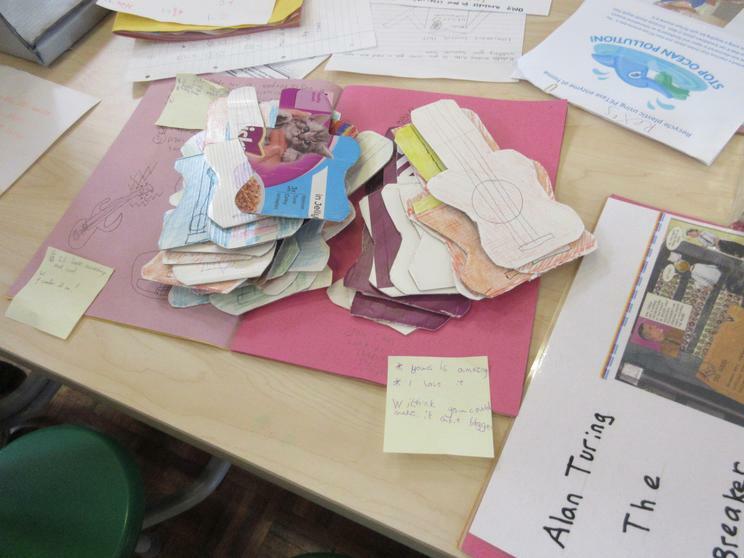 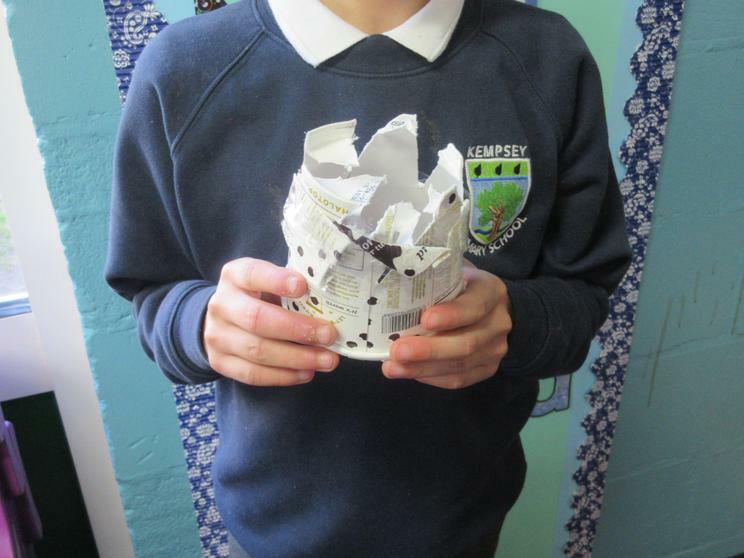 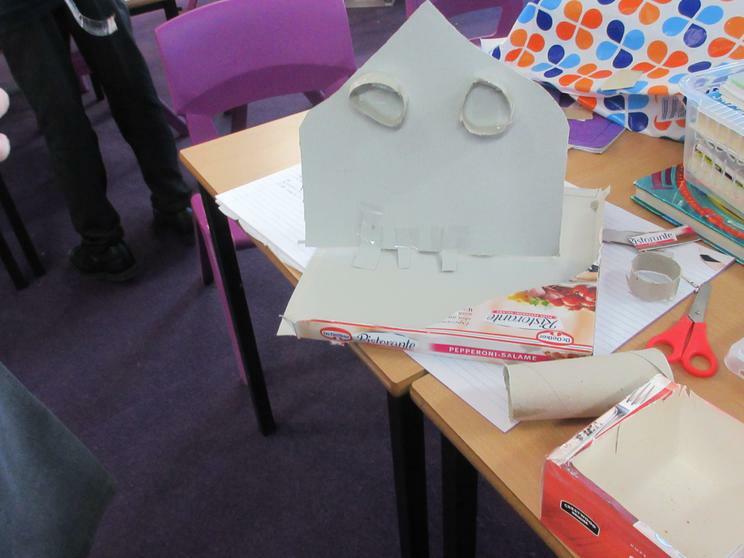 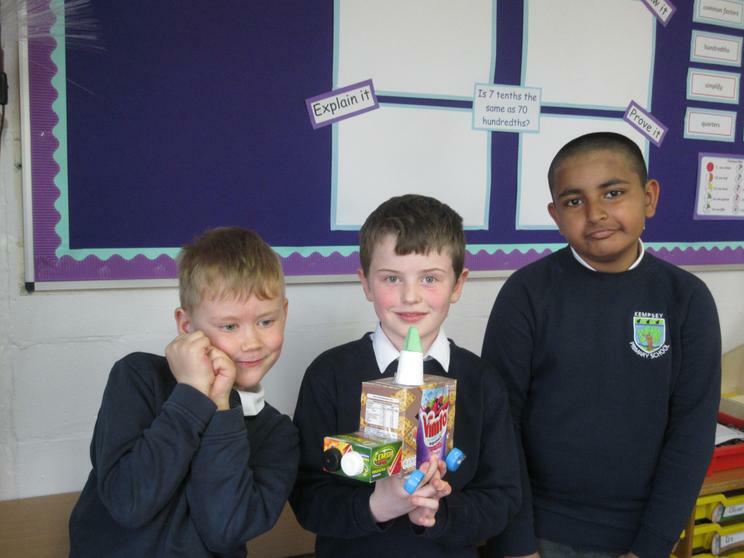 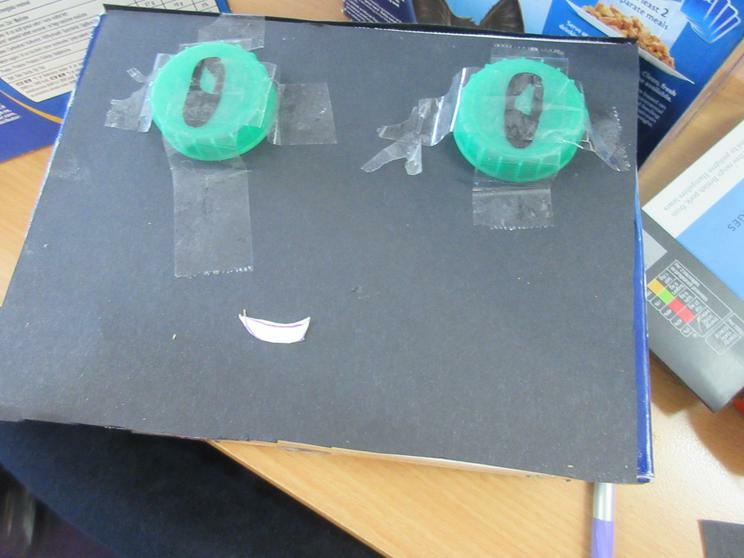 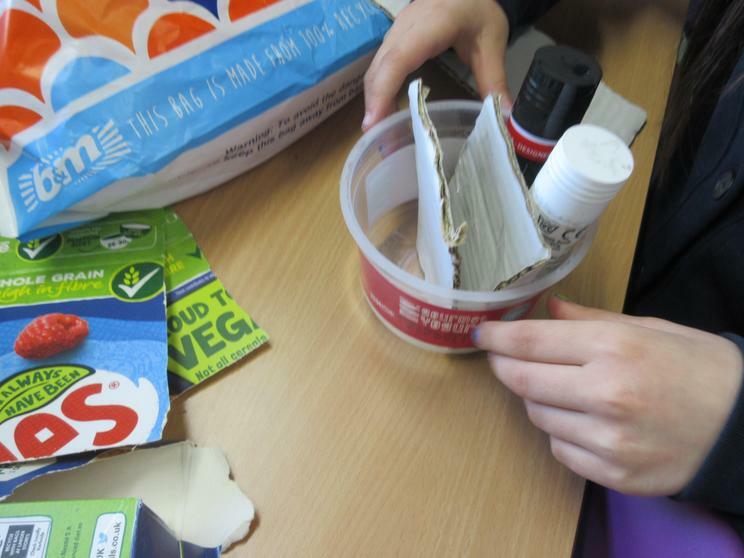 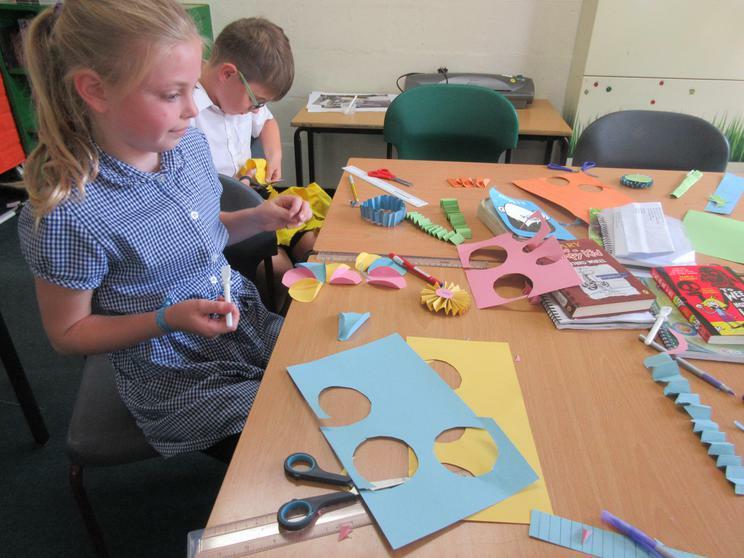 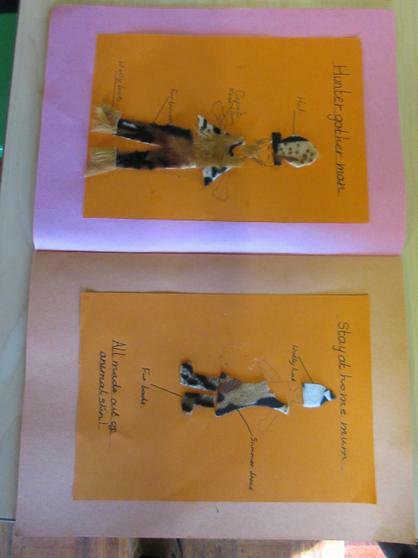 The children used 'trash' to make their models and stuck pieces together using glue or selotape. 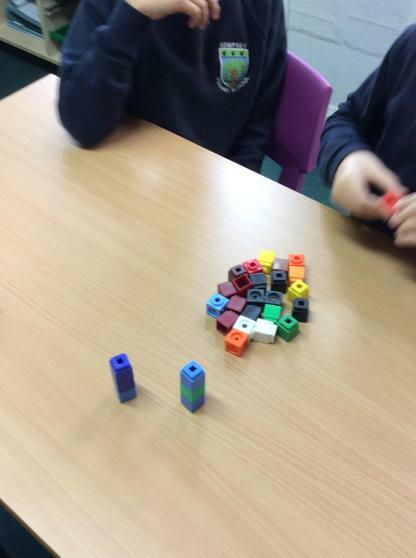 Some decided they wanted to work in pairs or small groups and some individually. 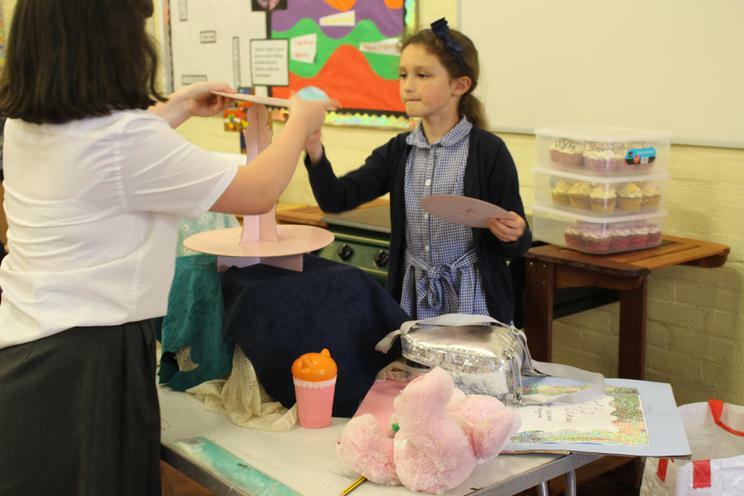 All creations were fantastic and they ranged from a house for a bear to a jet pack to a device that you can push down a table to have condiments passed to you. 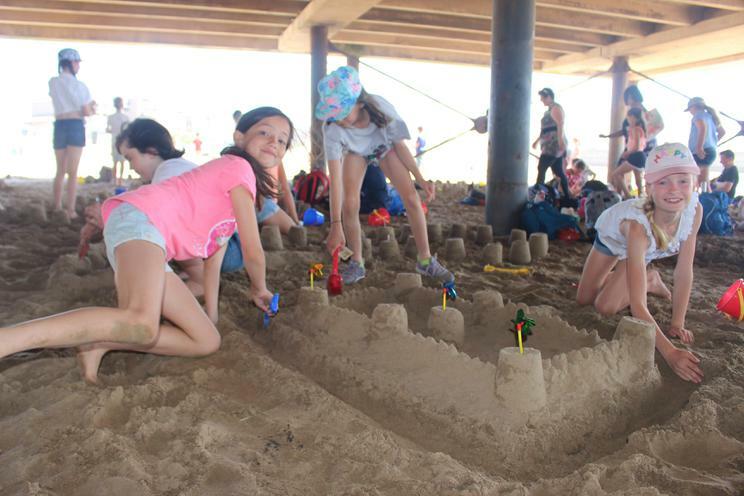 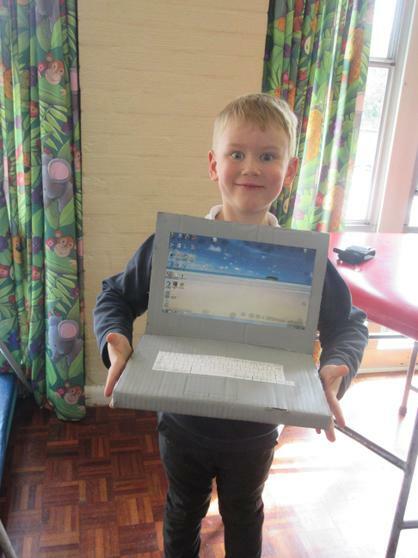 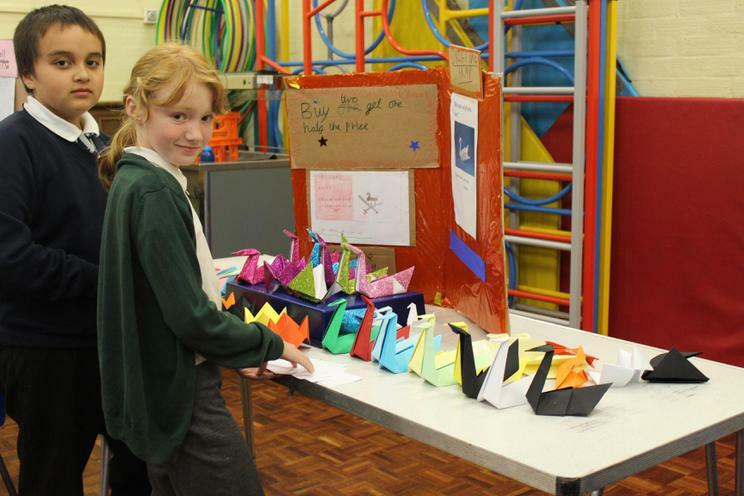 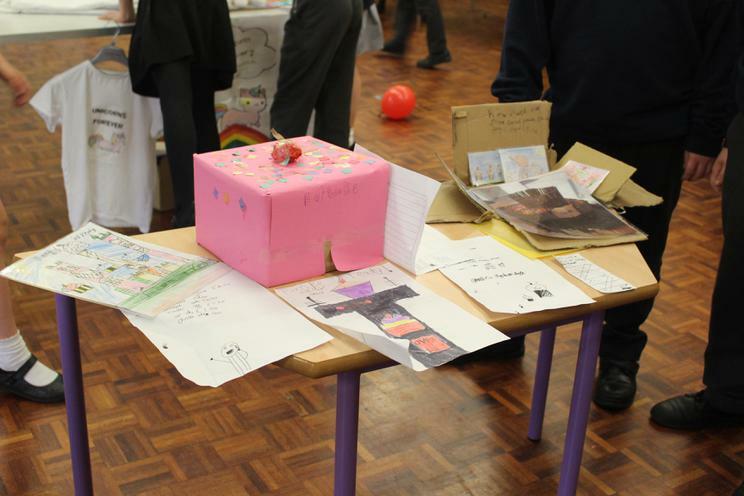 The children have showcased their creative and innovative side! 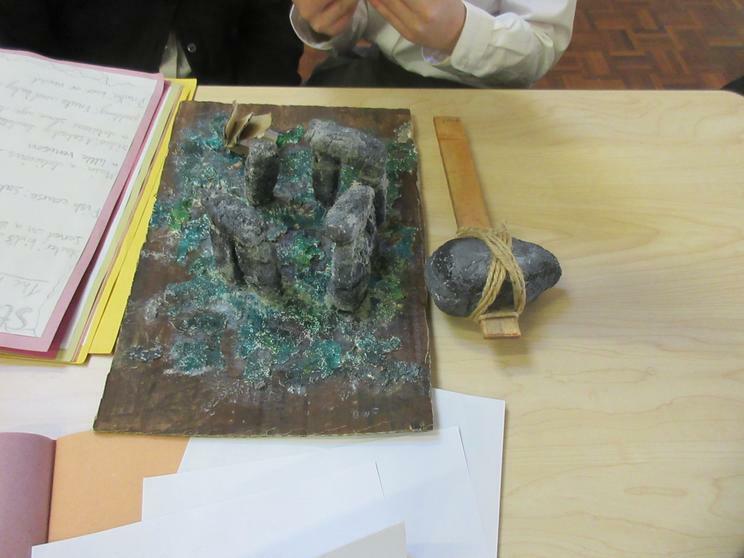 Stonehenge and a spear made at home! 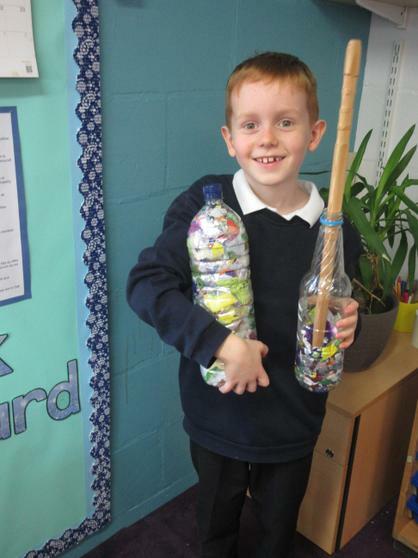 Uh oh...Stone Age weaponry made at home! 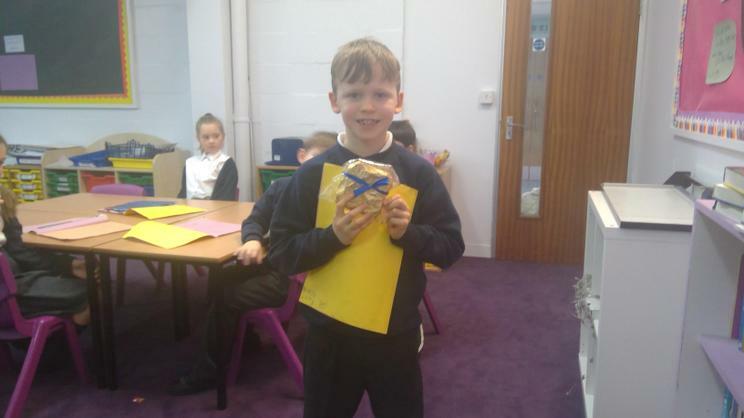 We love to celebrate birthdays in Oak! 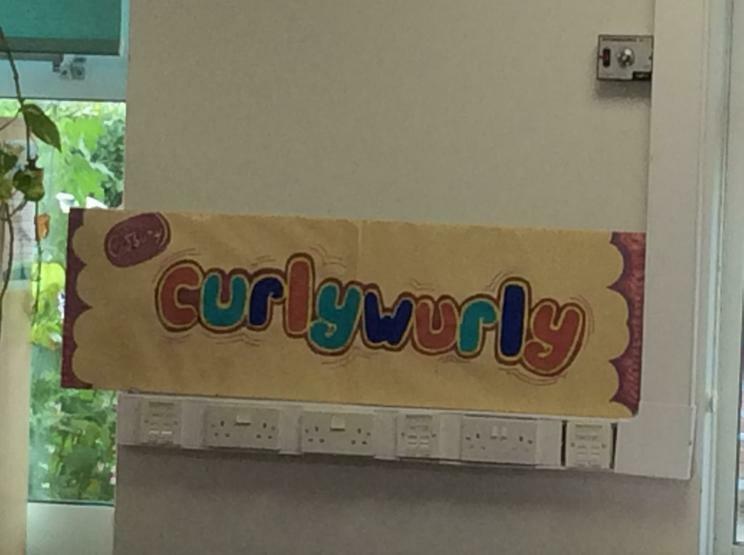 Miss Graham's (and Walt Disney's) motto! 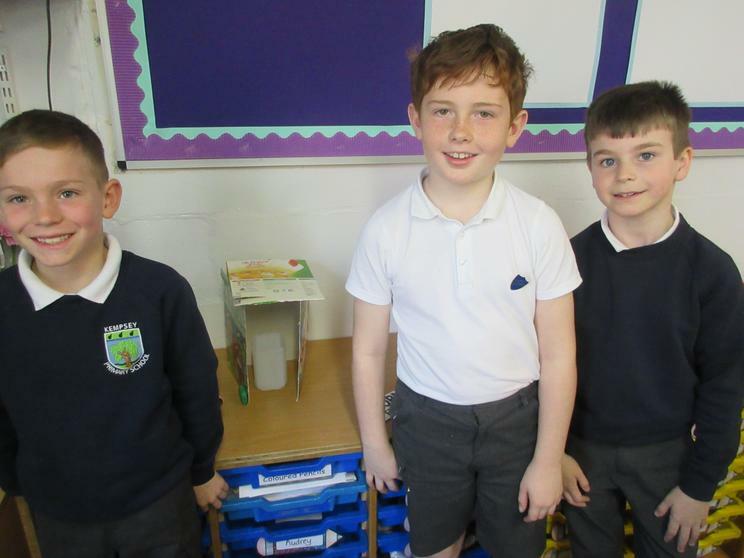 Our names go here when we consistently work hard! 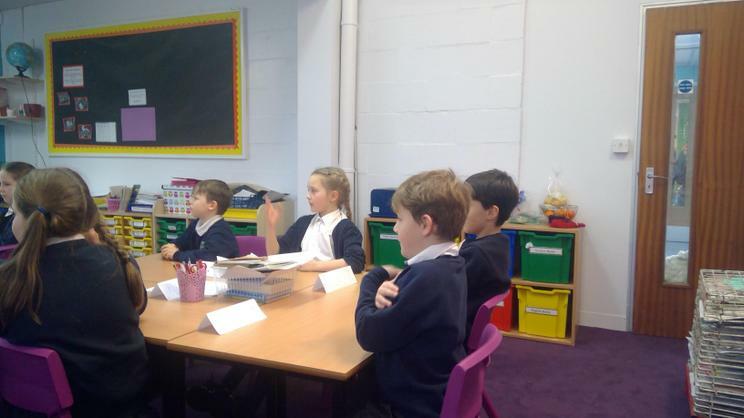 We're back to school for Spring term 2 and the children have started the day off by looking smart and have arrived with a positive mindset and are eager to learn! 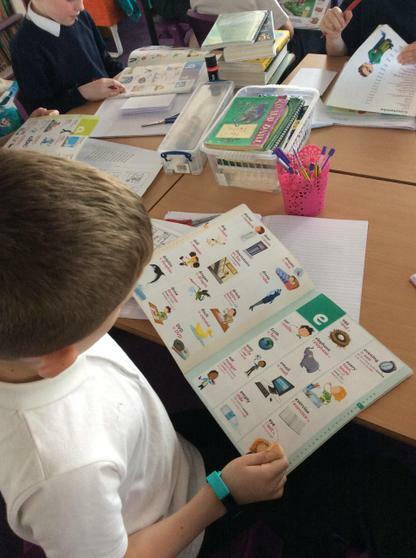 We have got lots of exciting lessons planned for the children and we are excited to start our topic launch later on today. 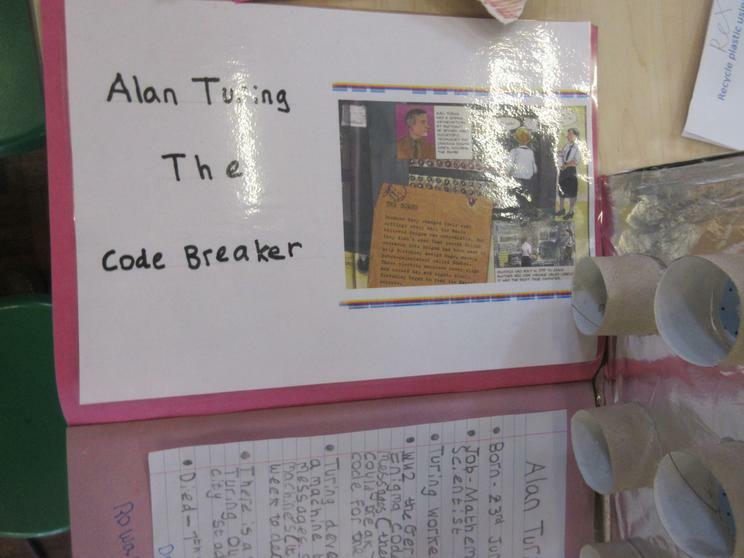 Our new topic is 'inventions that changed the world' and we are looking forward to discovering what inventions the children can identify. 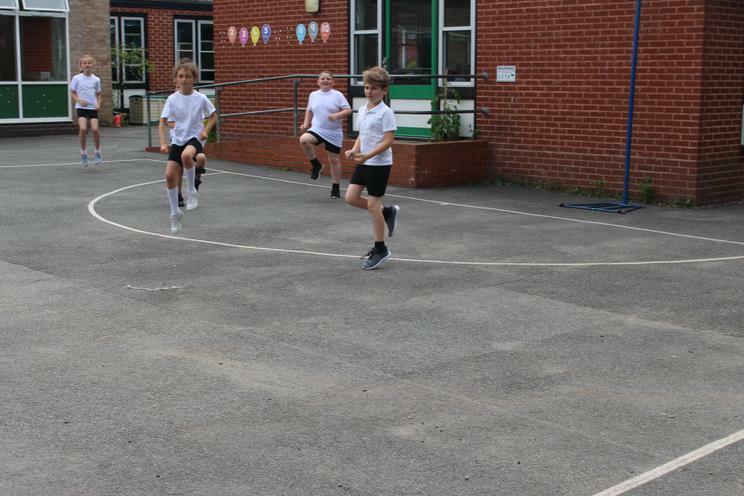 A reminder to parents and carers that it is the last swimming session for the Y4's on Thursday. 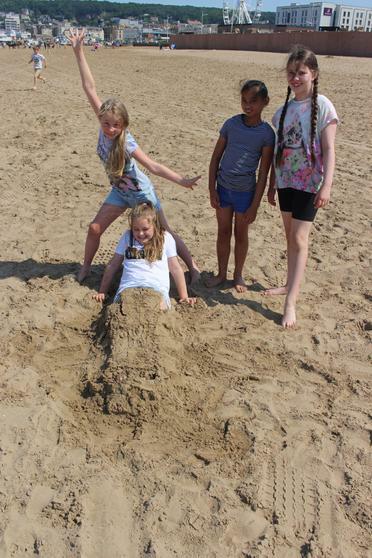 The children will be taking part in a fun swim. 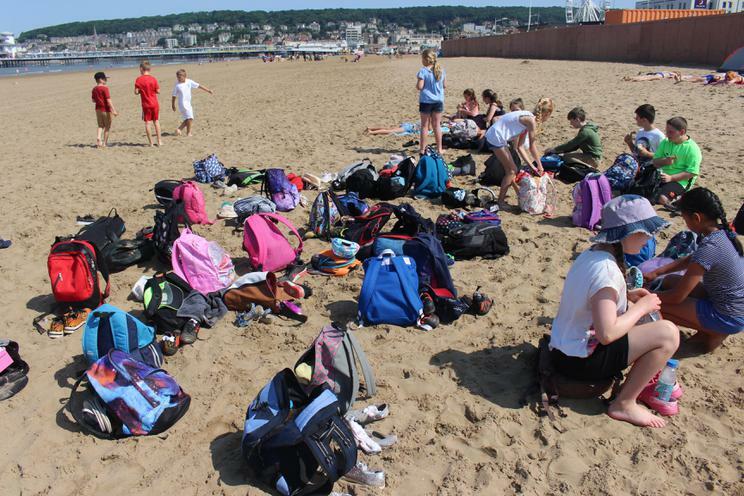 Please don't forget swimming costumes, goggles and hats for girls. 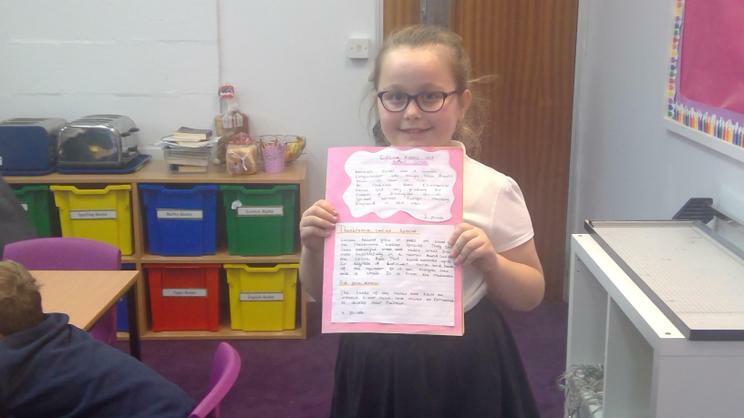 Today we celebrated the children's achievements in their topic homework by joining together with Laurel and Maple classes. 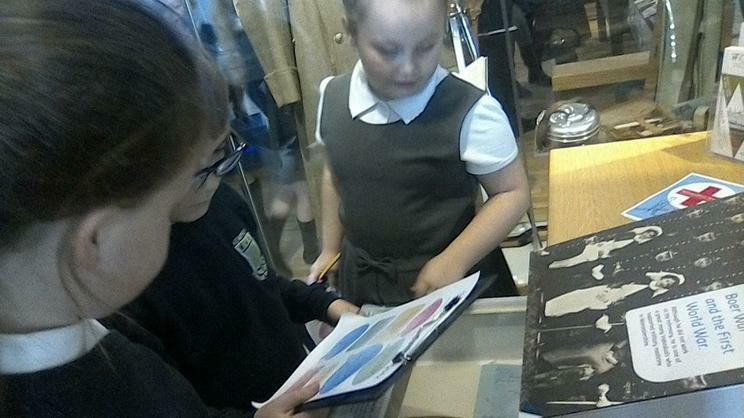 We showcased our work by creating a 'museum' where all the children from Y3/4 could come and look at what had been designed and made. 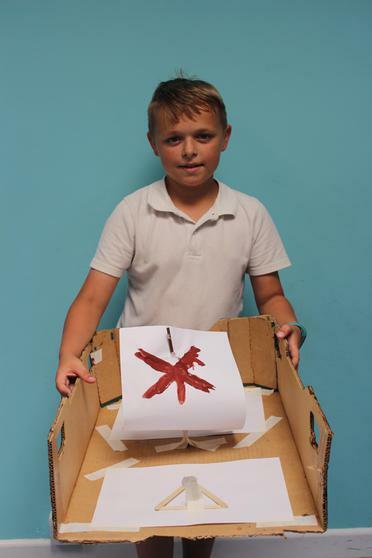 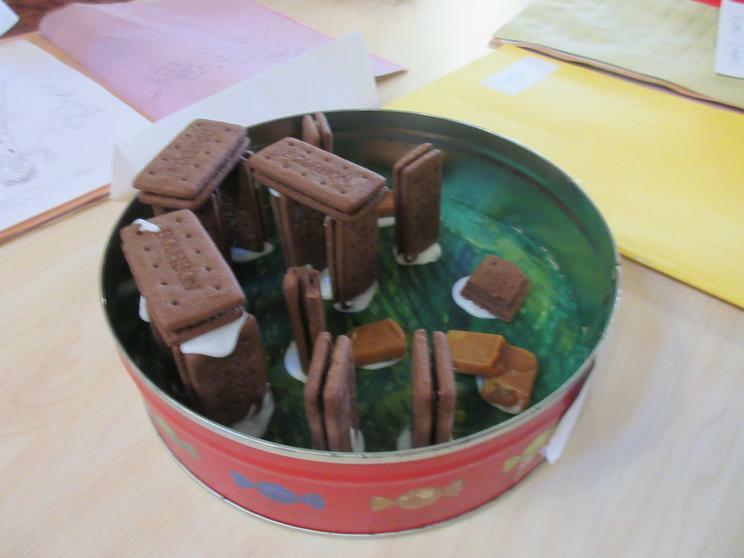 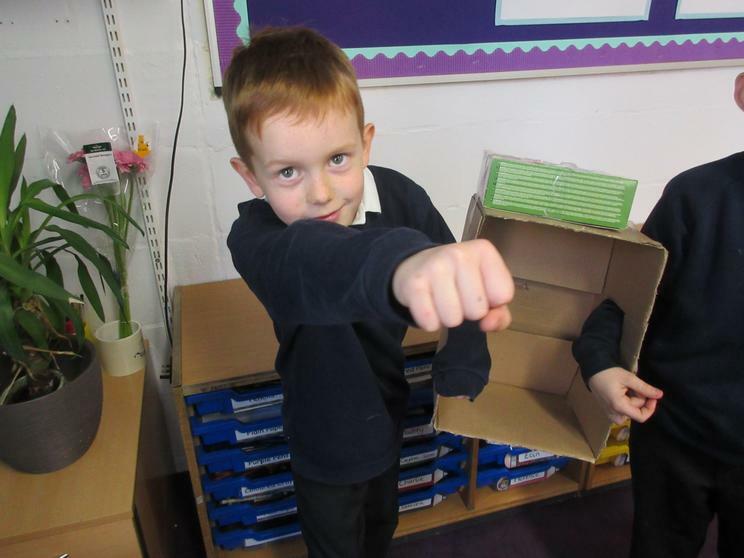 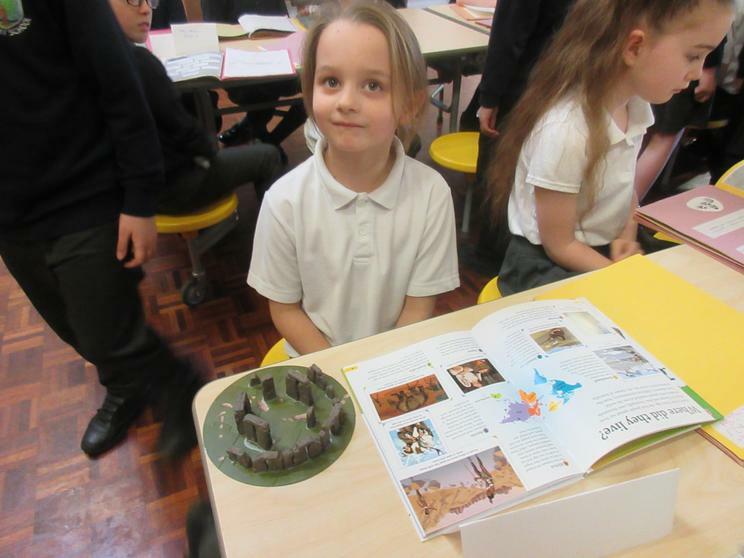 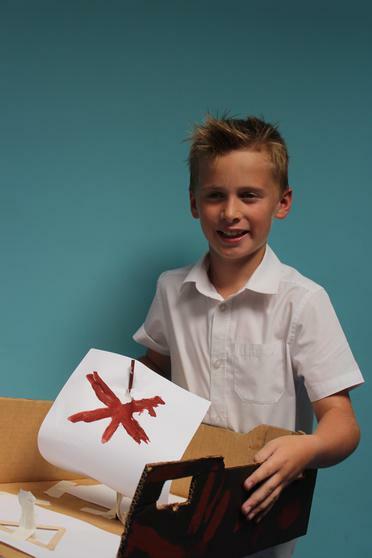 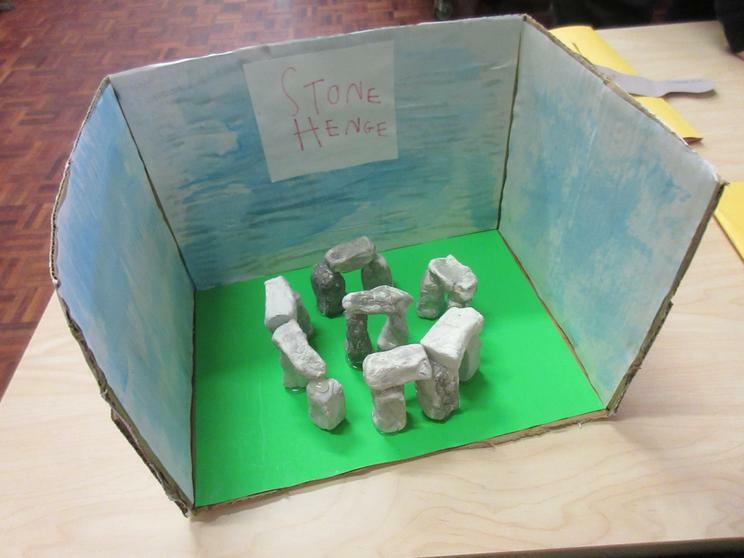 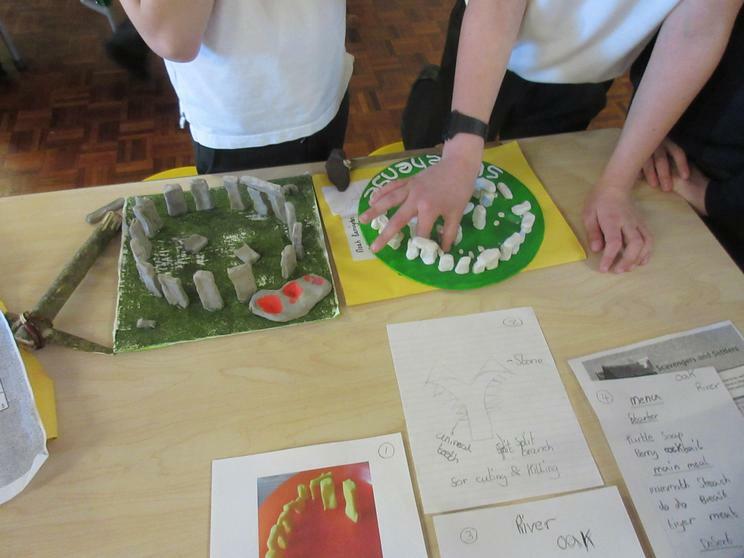 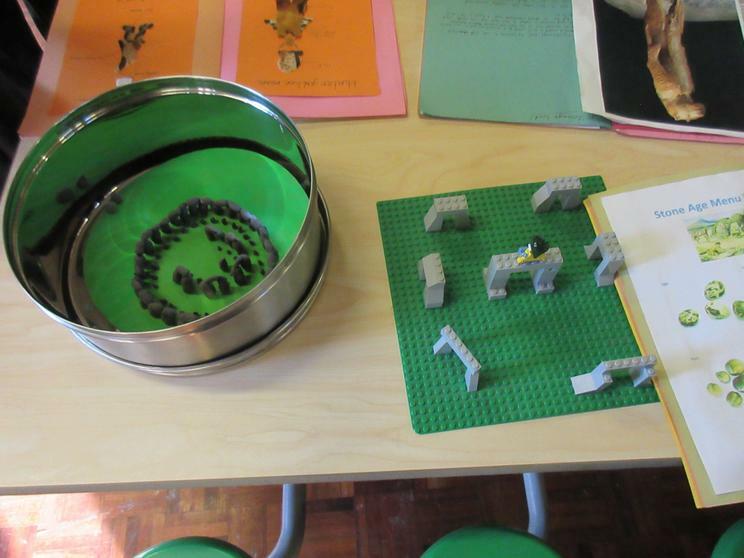 The children made a variety of Stonehenge models, weapons and clothing designs...plus one had been made and worn! 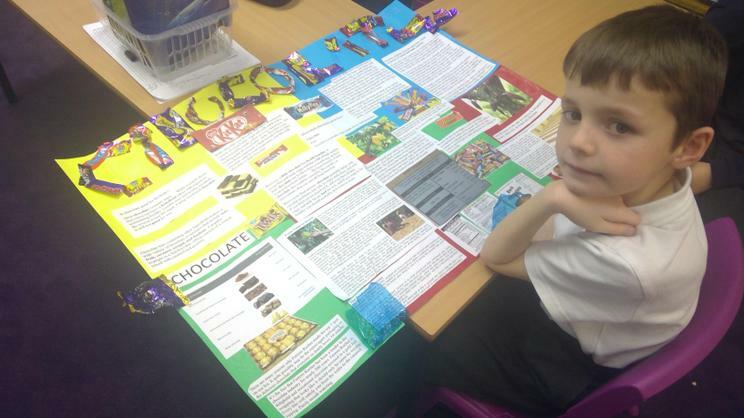 Well done to the year 3/4's - they have worked exceptionally hard and produced some great pieces of work! 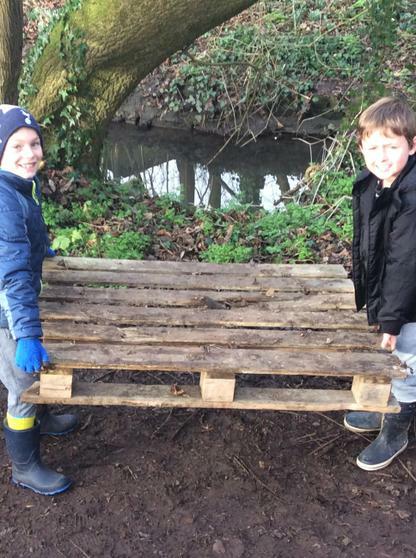 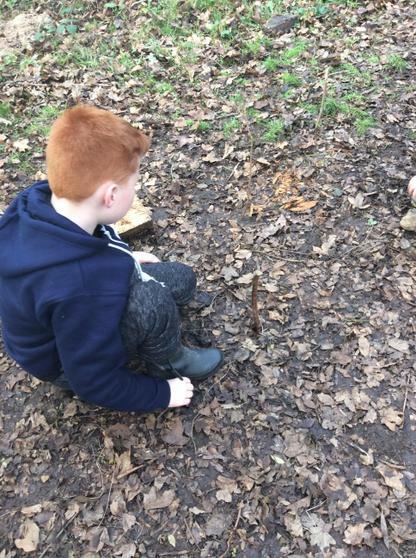 A reminder to parents and carers that Oak, Laurel and Maple are off to forest school on Friday so please can you send children in with old clothes, wellies and waterproofs. 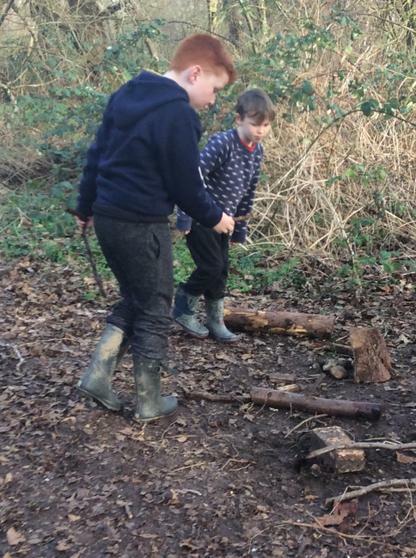 Children are to wear their school uniform to school and change into their forest school clothes in the afternoon. 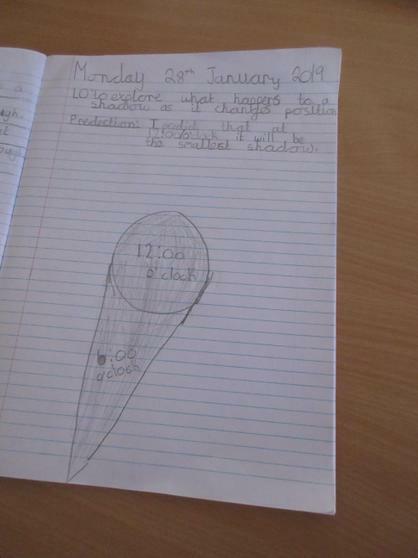 Just a quick reminder to say that the children's topic homework is due in on Monday. 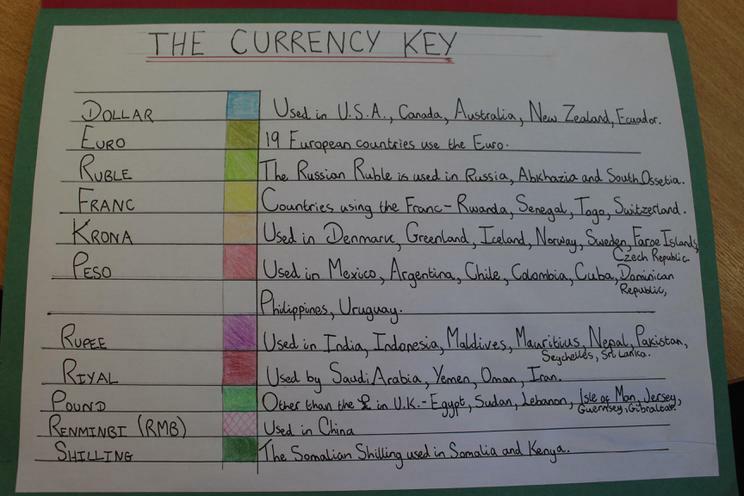 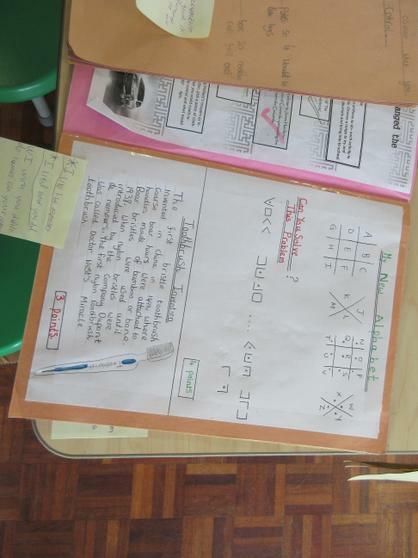 We will be showcasing what we have learned later on in the week. 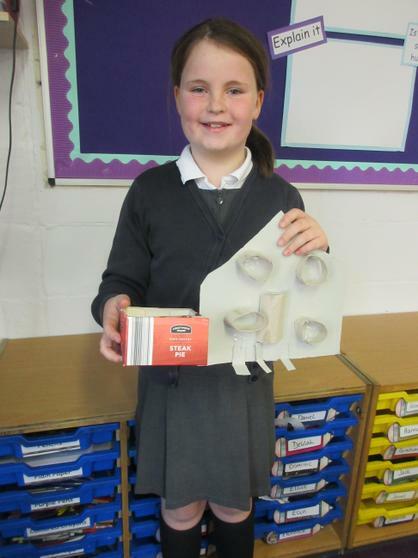 Miss Ford, Mrs Curtis and I are very excited to see what they children have created at home! 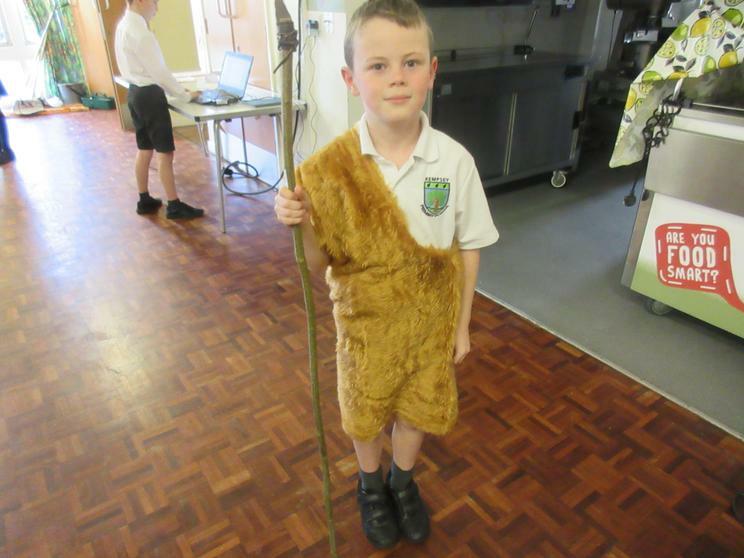 The children did a fantastic job today with our class assembly on 'The Stone Age'. 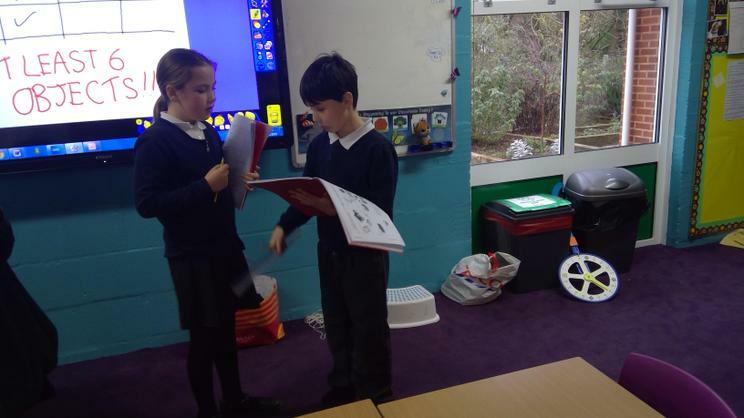 They all took their parts seriously, read beautifully and had fun whilst performing! 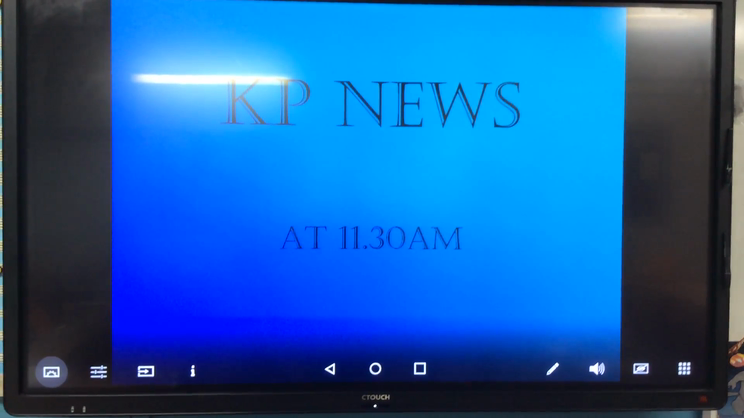 The video above shows the news readers explaining there has been an exciting fund at Kempsey Primary School. 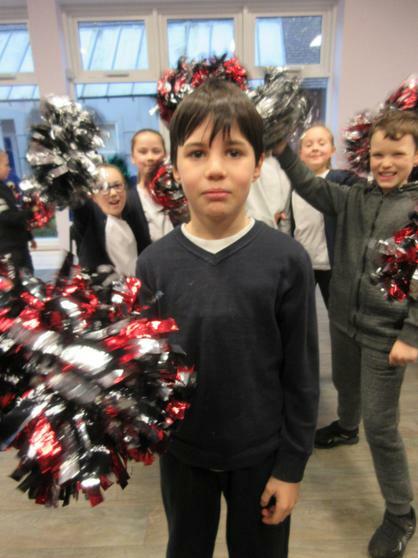 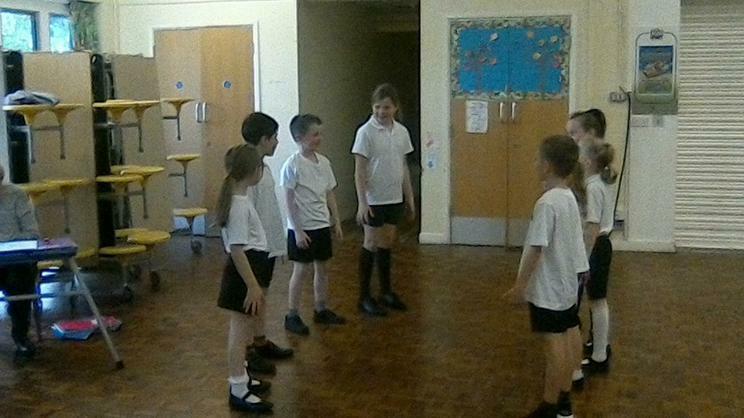 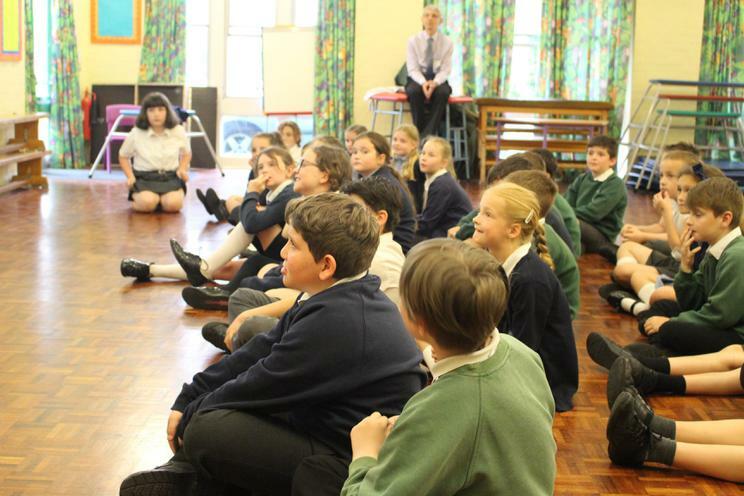 The children in Year 4 visited Hanley Castle High School today and took part in a dance festival. 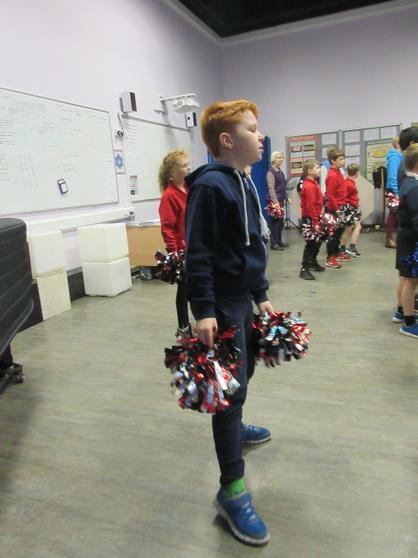 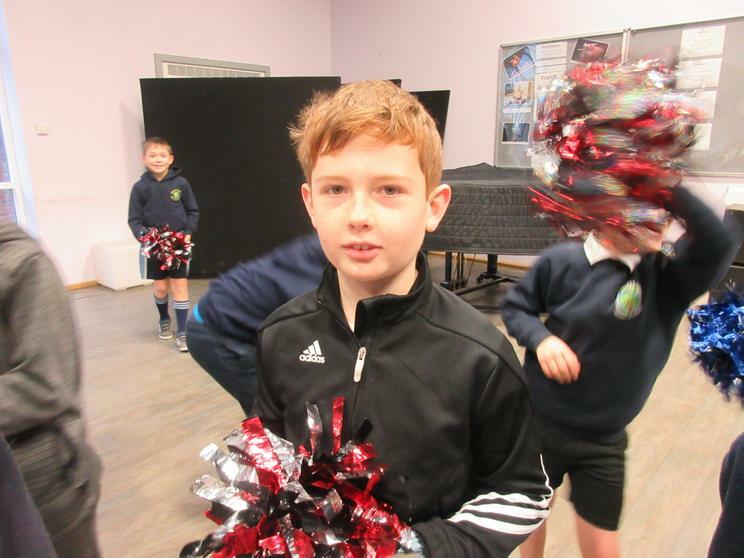 We took part in a variety of dances including cheerleading, street dance and a 1950's rock n roll dance. 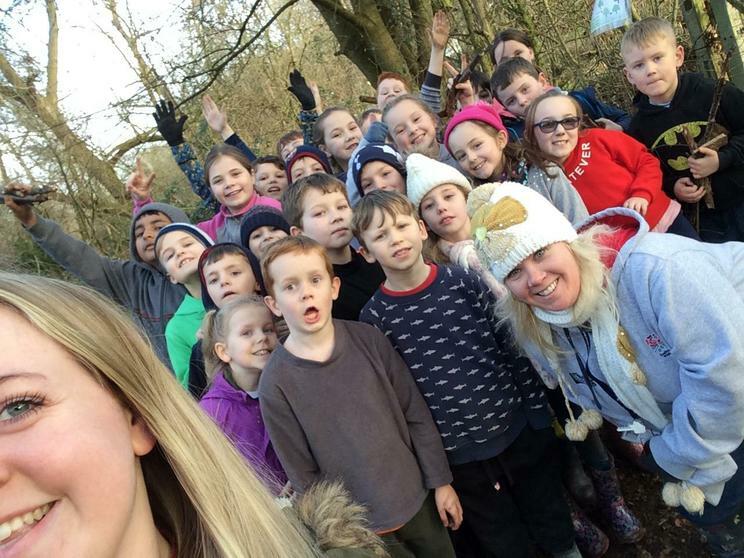 The children (and staff) enjoyed the morning! 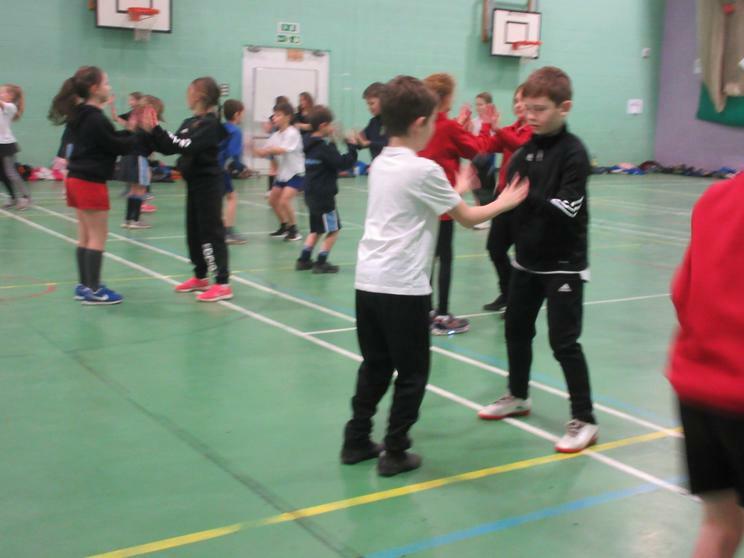 A reminder to parents and carers that on Tuesday morning, Y4 will be attending a dance and movement festival at Hanley Castle High School. 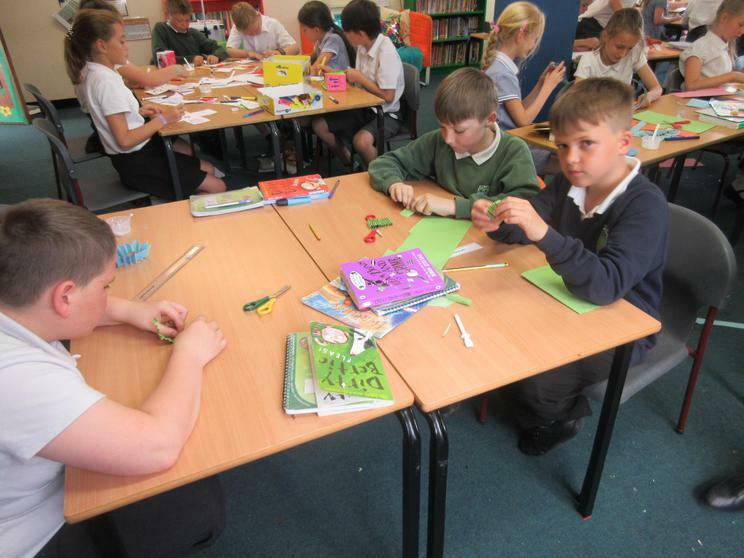 We will be leaving school at 8.30am, therefore children will need to be in school for no later than 8.20am. 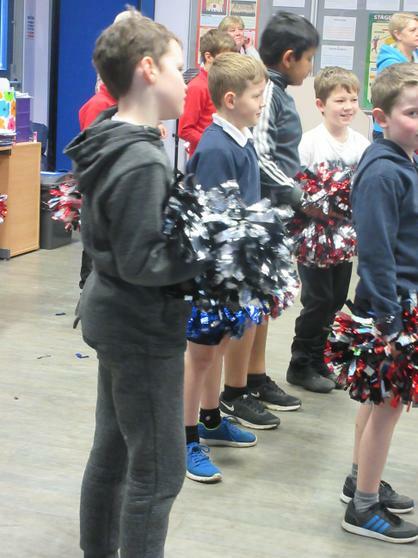 Please can I remind you that the children will need to come to school in their PE kits but they must bring their school uniform to change into after we return. 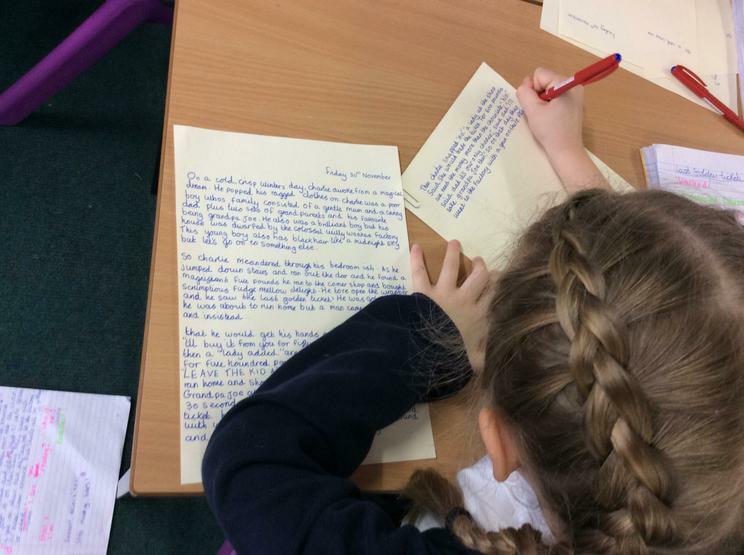 Letters were sent home to parents and carers yesterday inviting you all to our class assembly, which is being held next Friday at 11.30am. 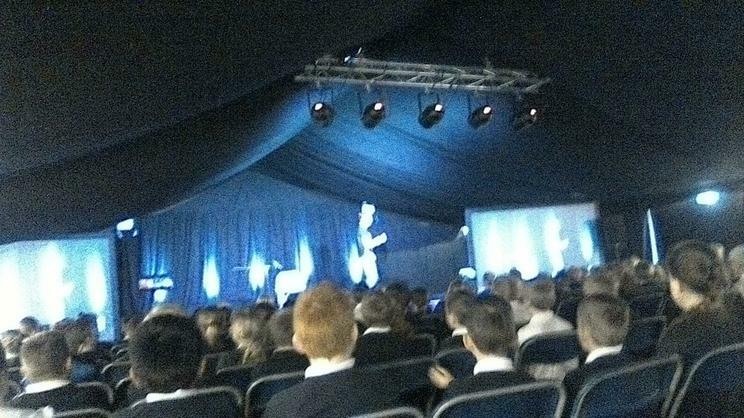 A second performance will be held at 3.10pm. 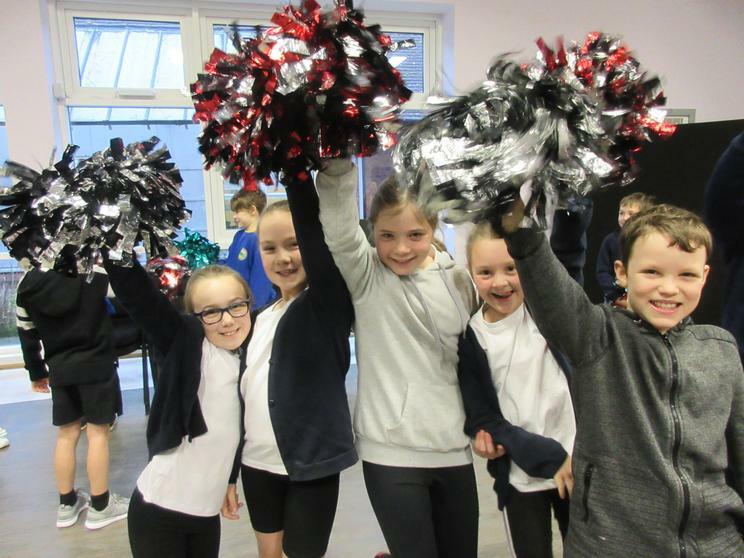 Please can you return slips by the end of this week - Friday 1st February - indicating whether you will be attending the morning or afternoon performance and if you are having lunch with your chosen preference. 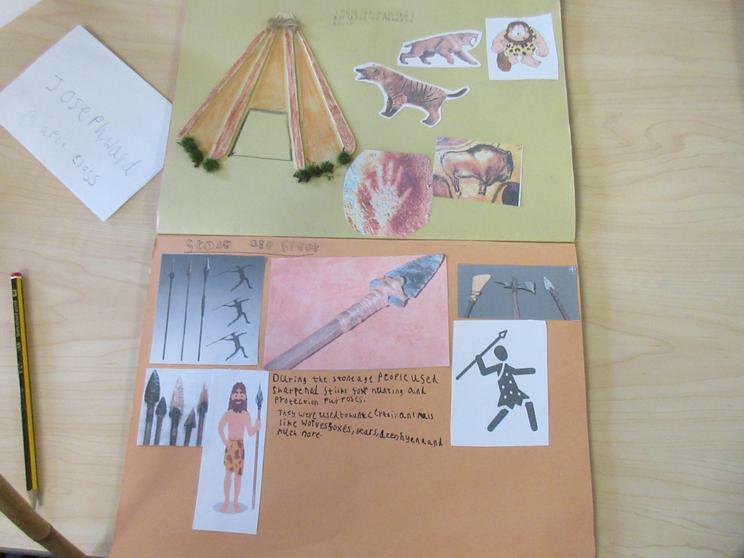 We are looking forward to showcasing what the children have been learning about The Stone Age! 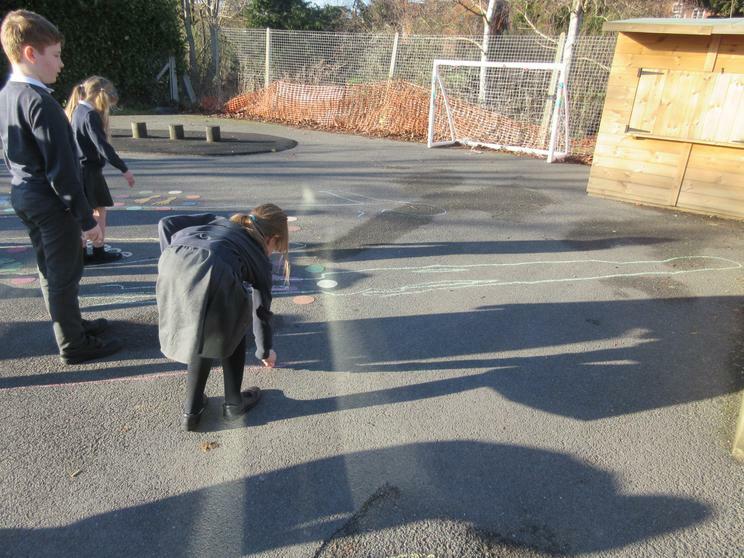 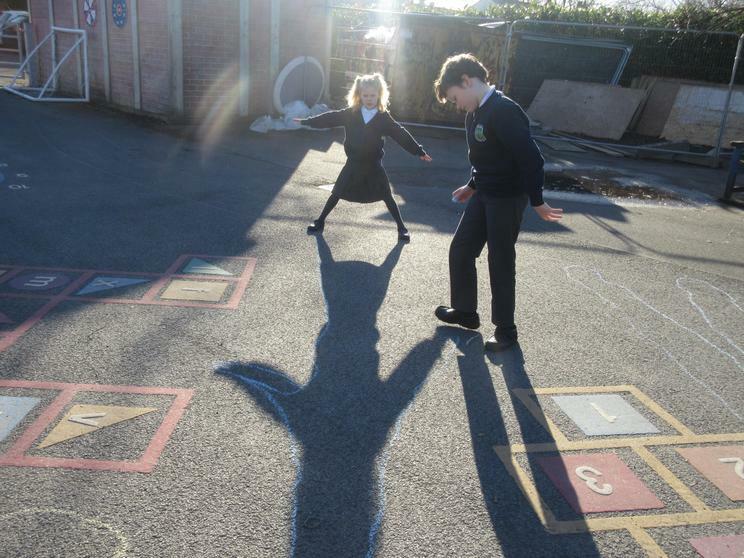 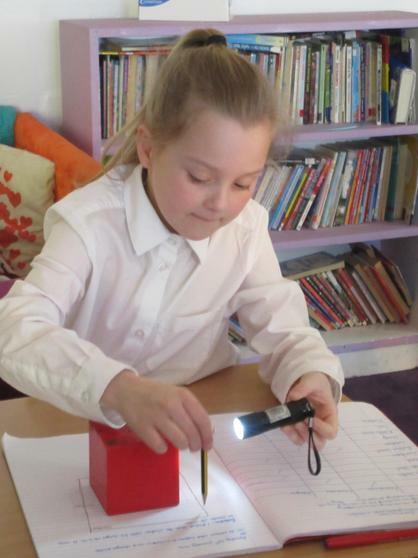 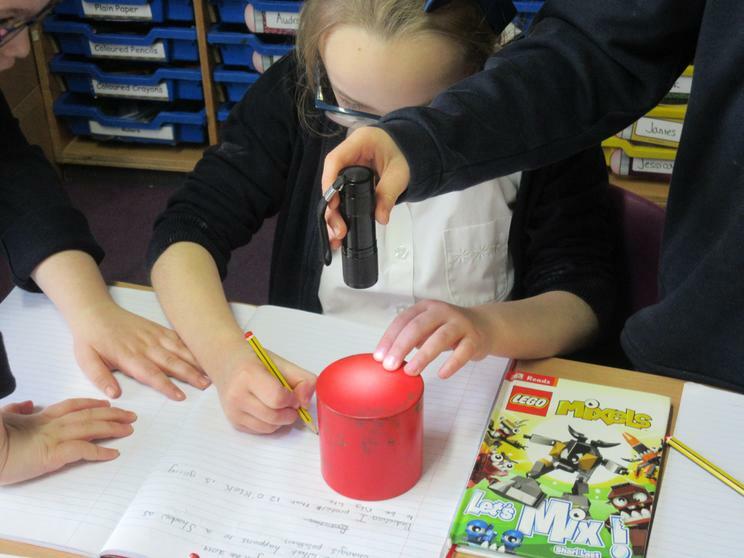 In our new Science topic of 'light', the children have started to explore shadows and what makes them. 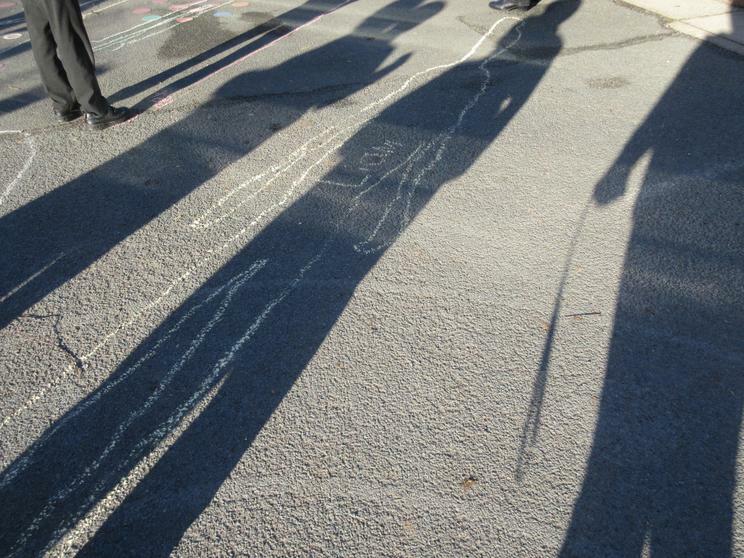 We started off by going outside and drawing around our own shadows to see how they presented themselves on the playground. 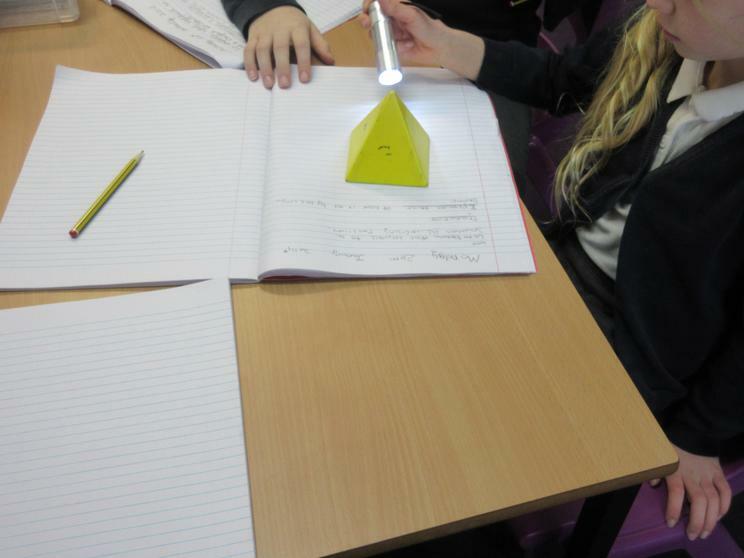 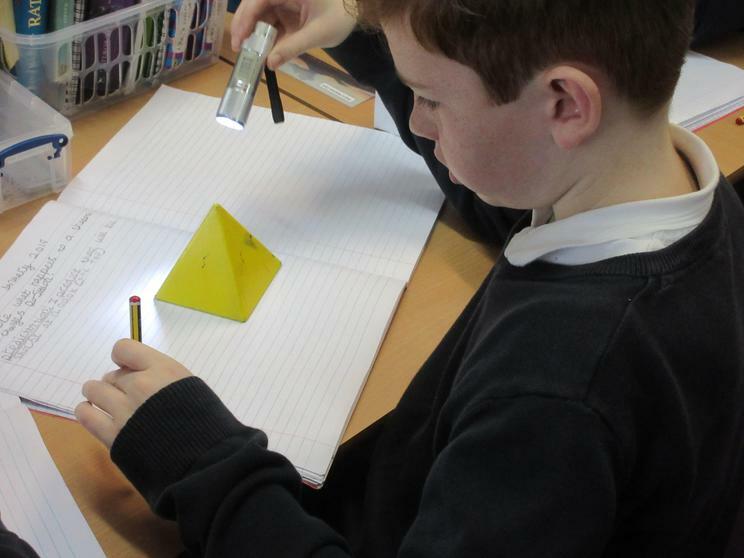 We then came in and used 3-D shapes and a torch to create shadows on our page. 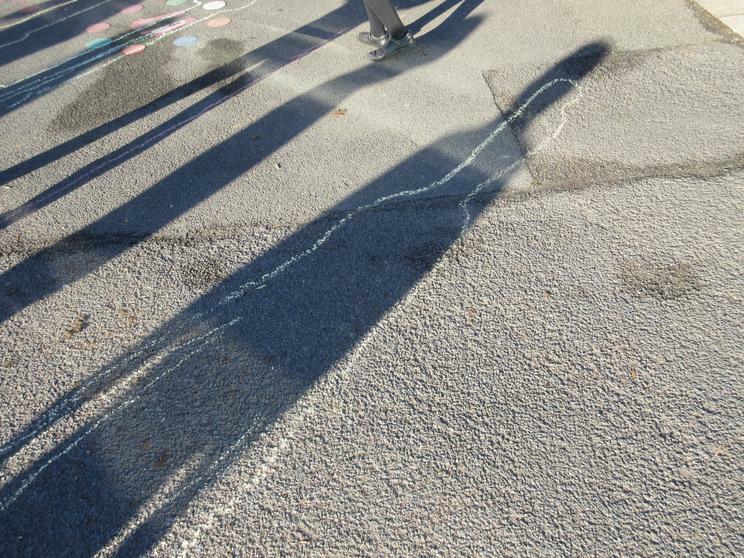 We moved the torch around to different positions around the shape to see how the shadow changed. 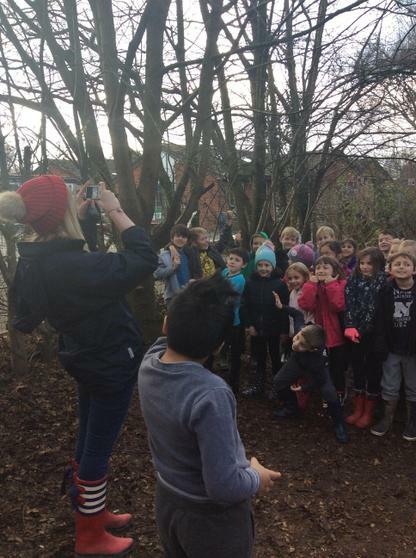 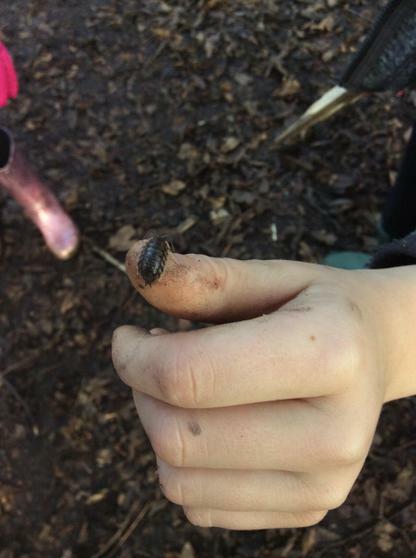 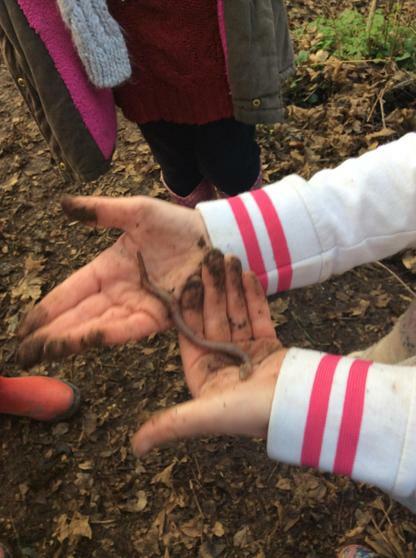 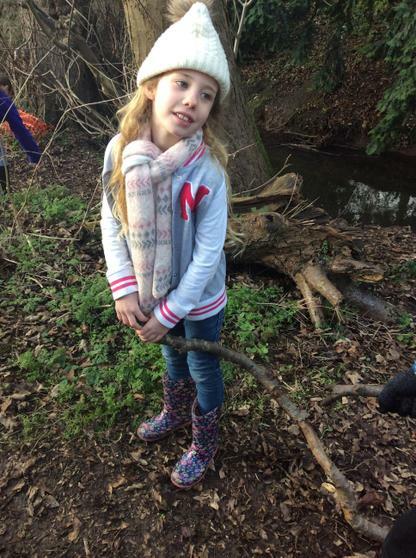 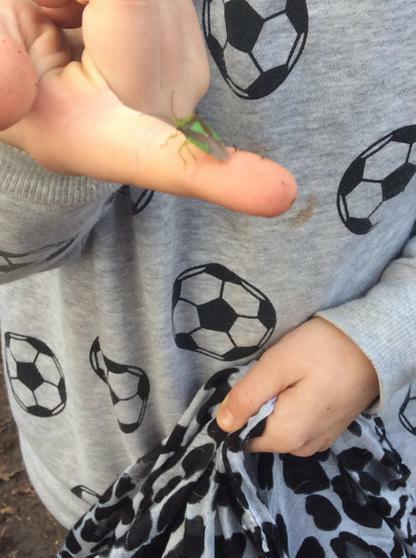 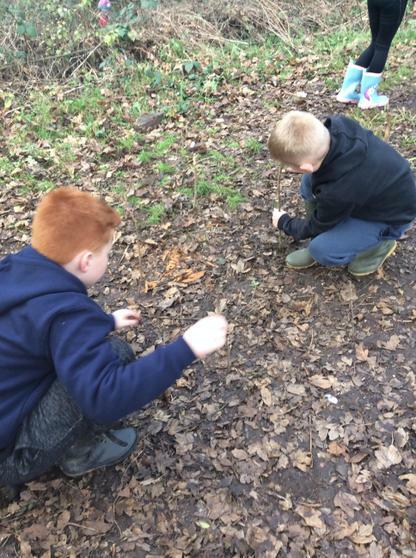 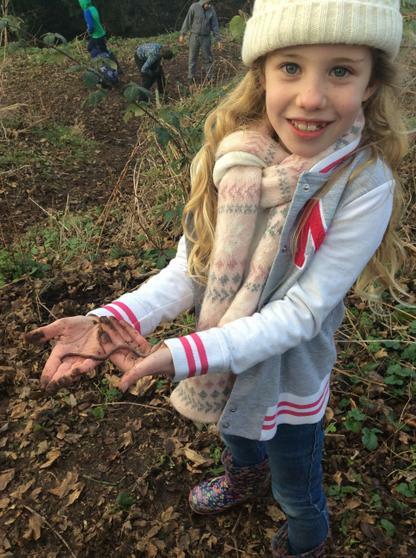 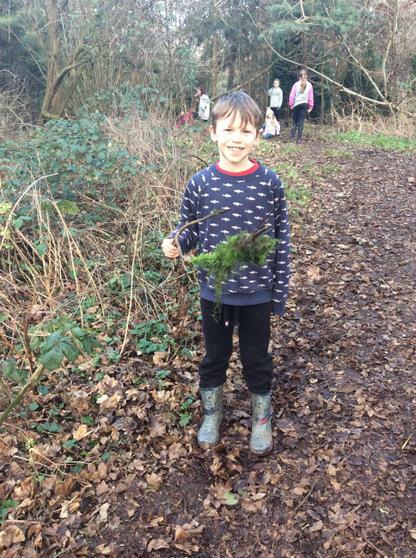 Oak and Laurel's Forest School Adventure! 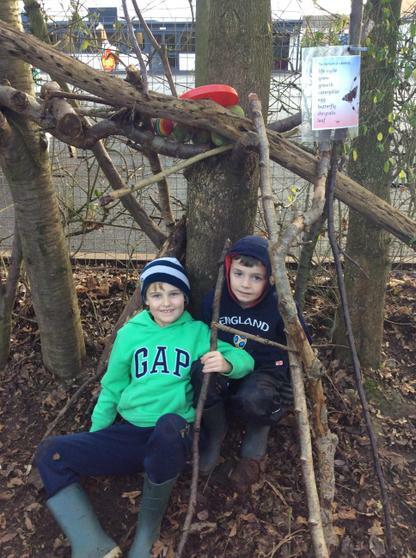 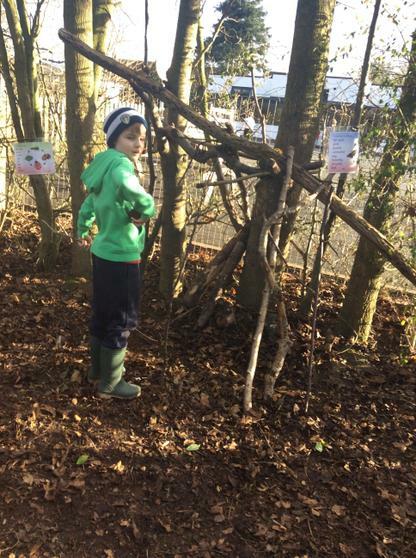 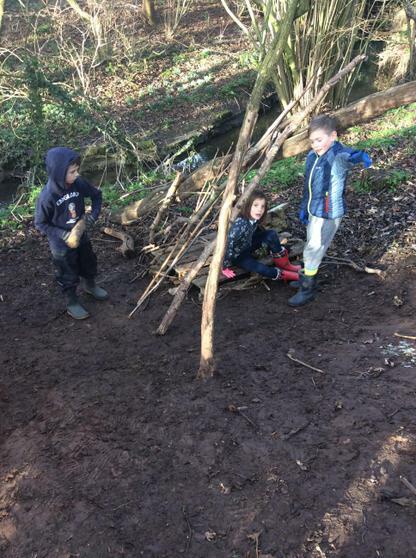 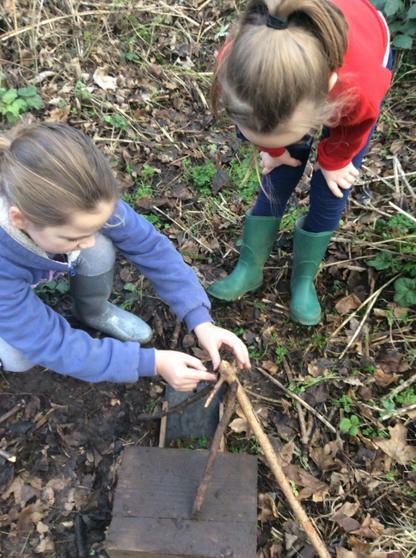 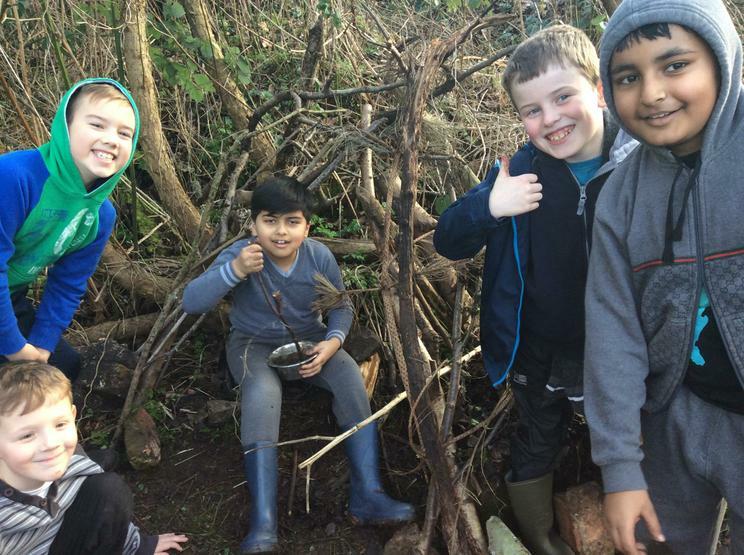 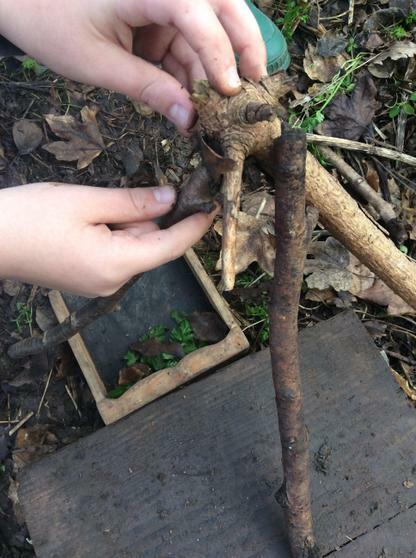 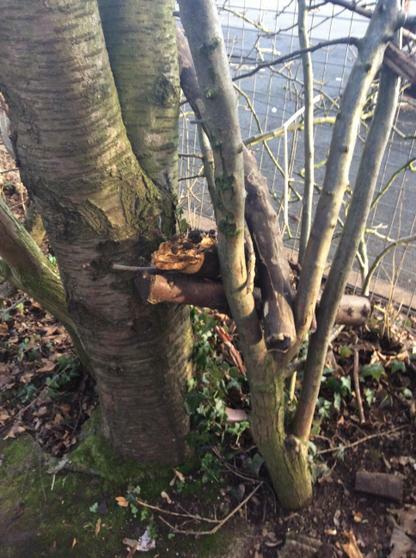 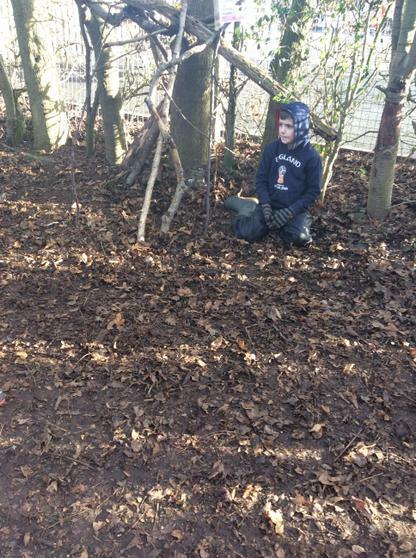 On Friday afternoon, Oak and Laurel went into forest school to build their very own huts - we became Stone Age settlers! 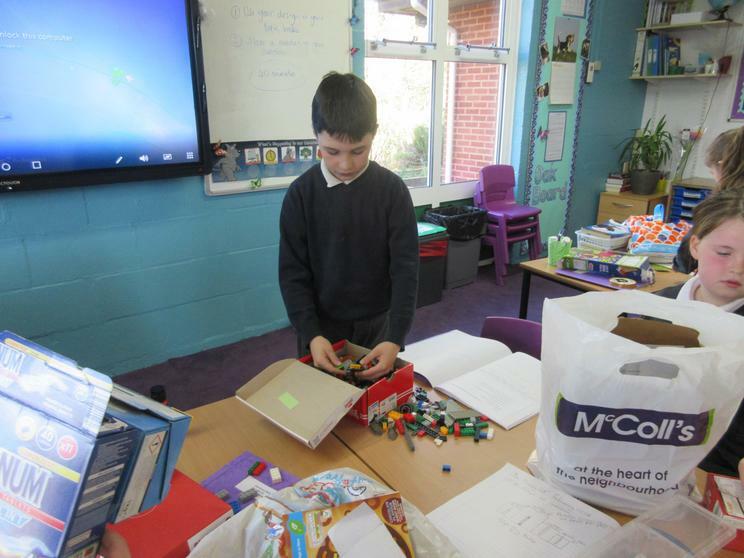 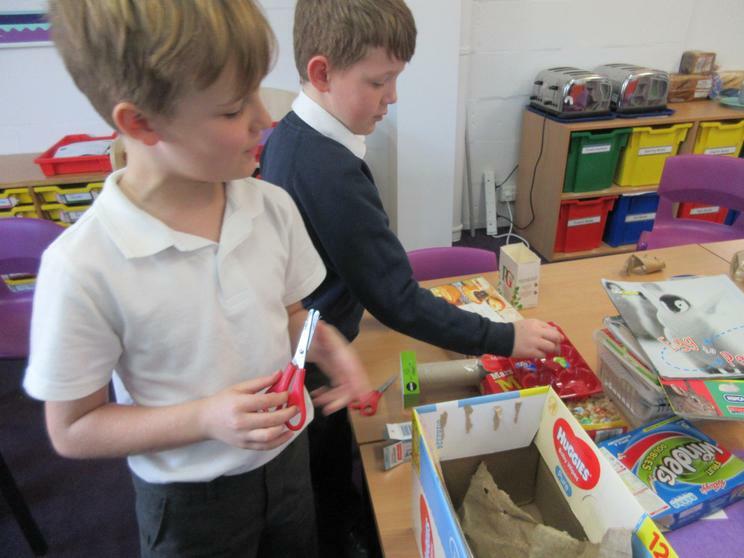 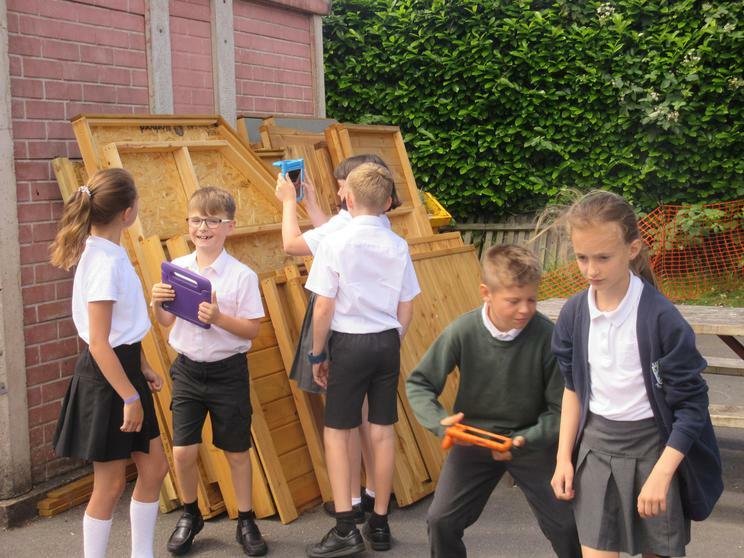 The children decided what resources they needed as well as the method they needed to use in order to build it successfully. 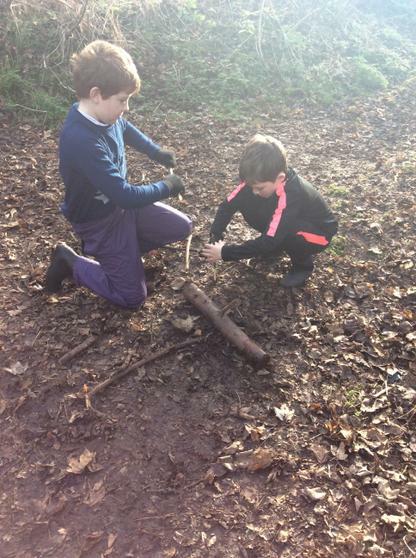 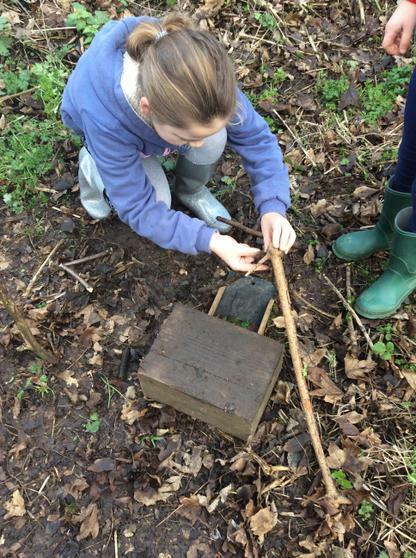 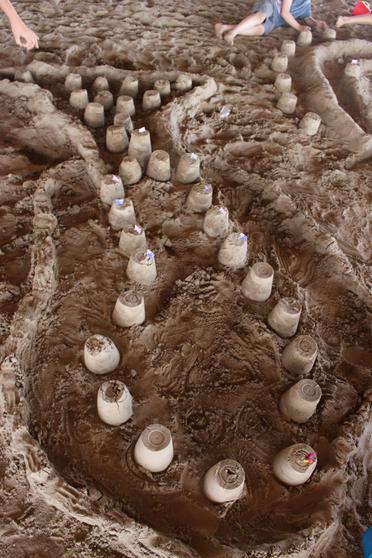 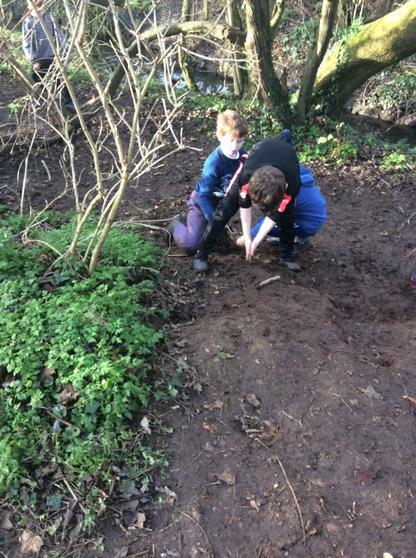 We had children using mud as cement, various sizes of stick and branches plus logs as a foundation. 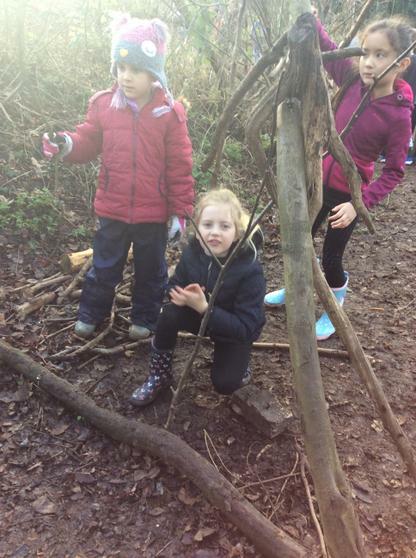 The children all worked well together and built some fantastic huts! 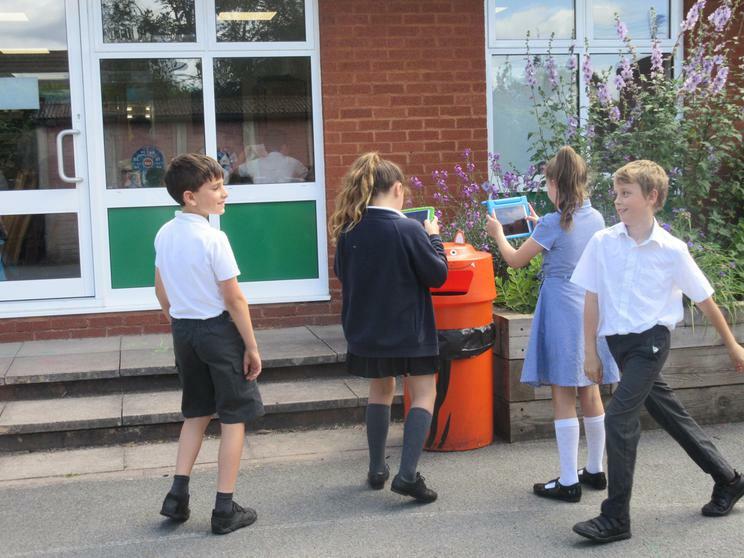 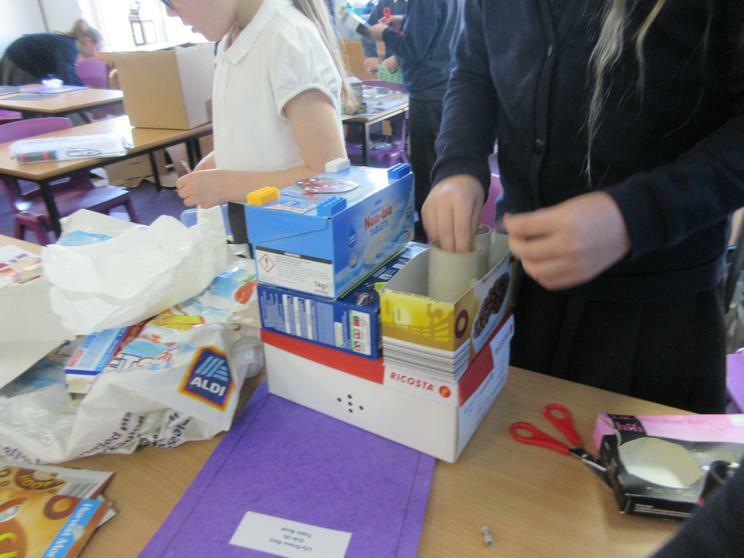 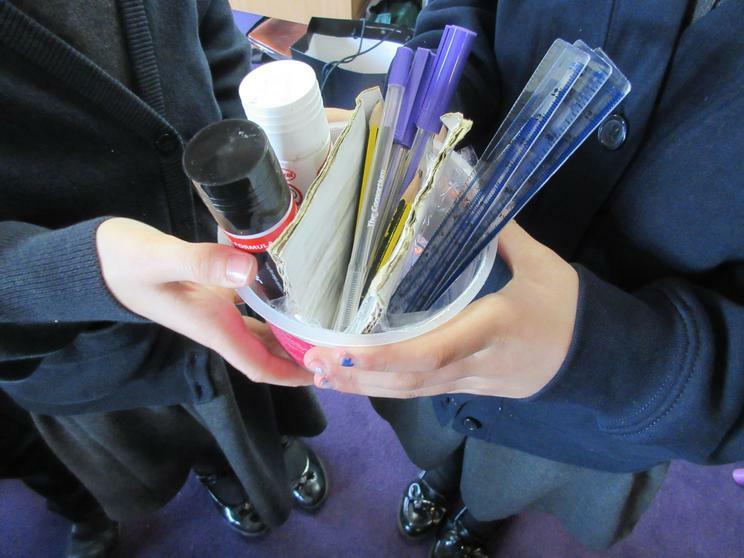 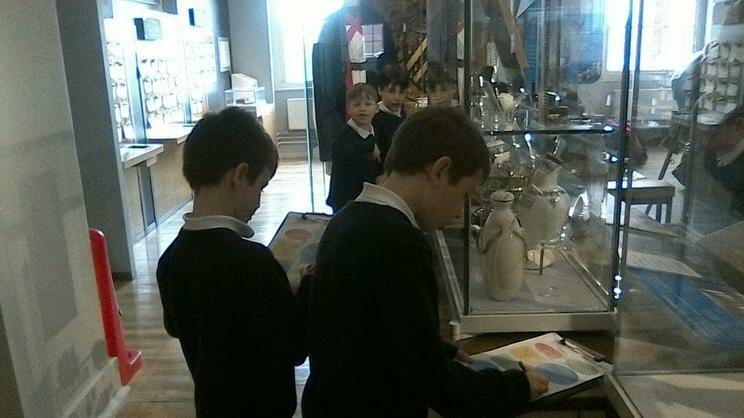 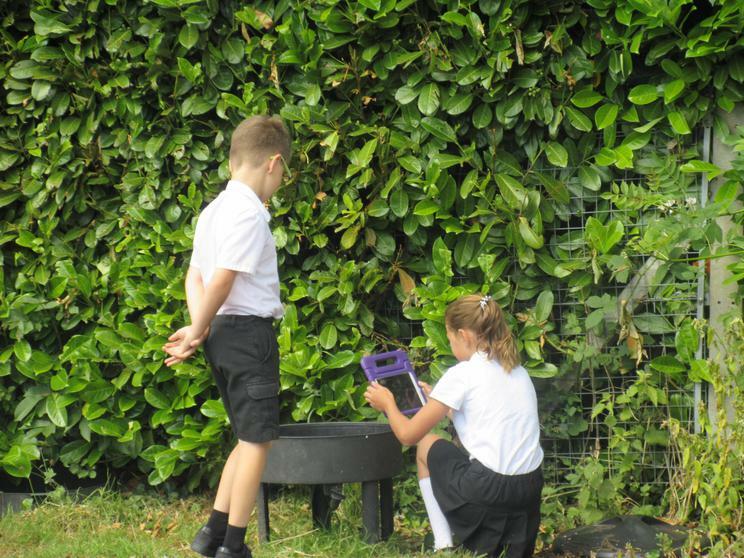 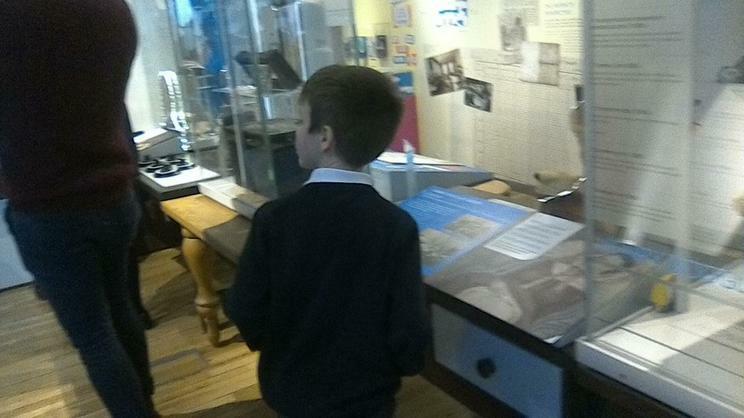 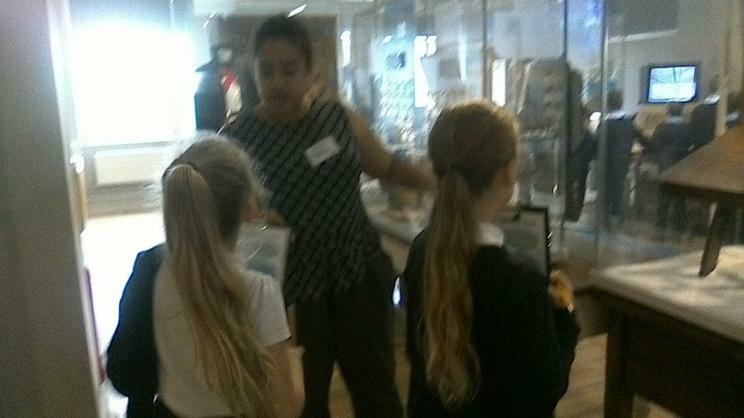 We also used this opportunity to gather resources for our Design and Technology project. 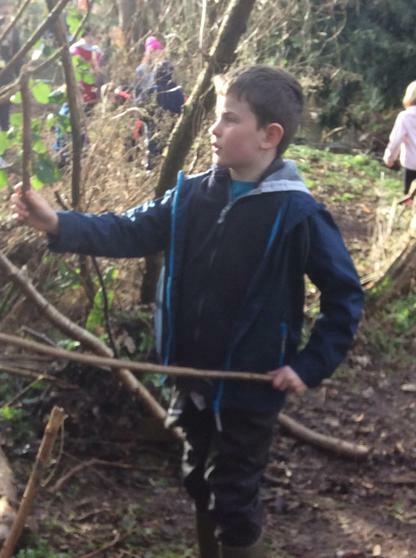 On Friday, Oak will be going to forest school in the afternoon (after lunch). 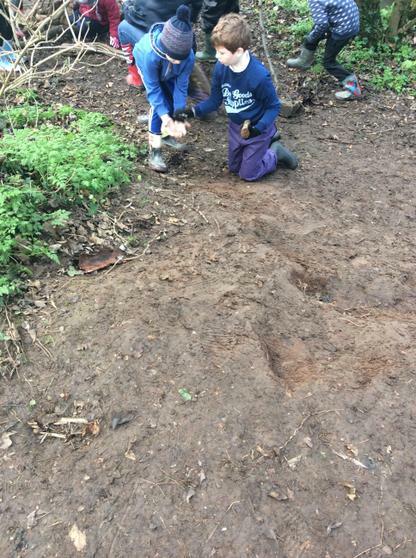 Please can we ask that children are sent in with clothes and shoes that you don't mind getting muddy, wellies/walking boots and waterproofs. 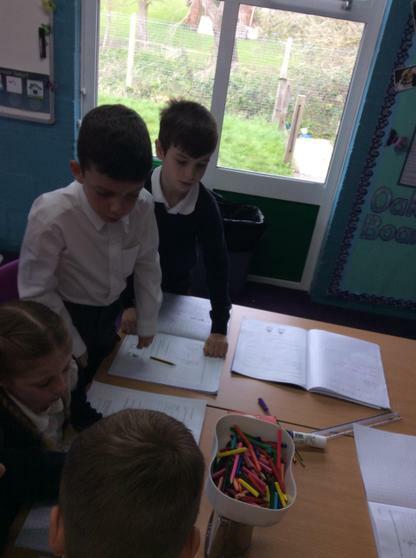 We have been doing a bit of work on finding the perimeter of the past couple of days and today the children showed their workings on their whiteboards in order to help them find the missing length around a shape. 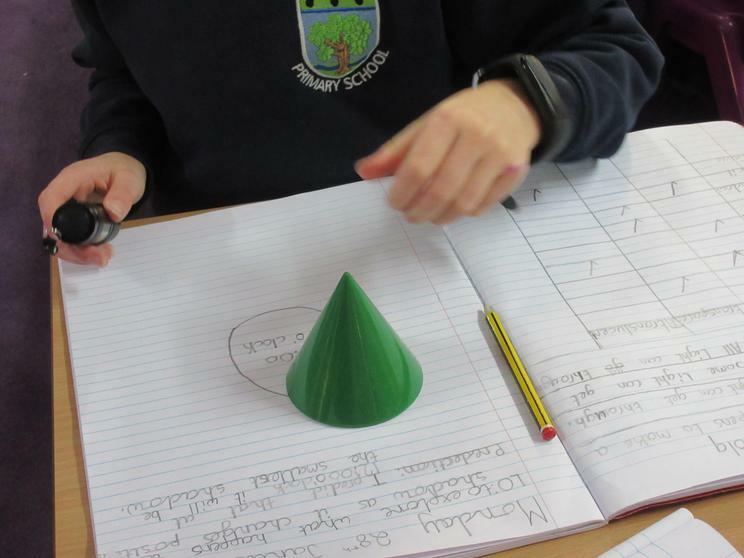 They had to use their knowledge of what the shape looks like and what the other sides measure in order to help them find the answers. 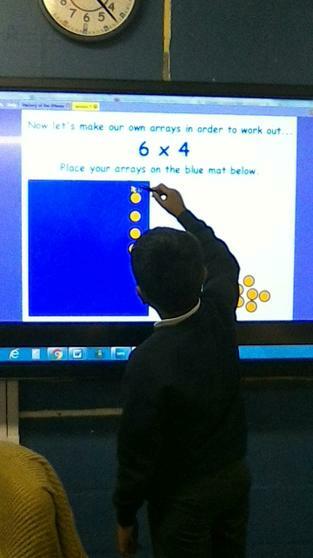 It's tricky...but we are working hard to crack the missing lengths! 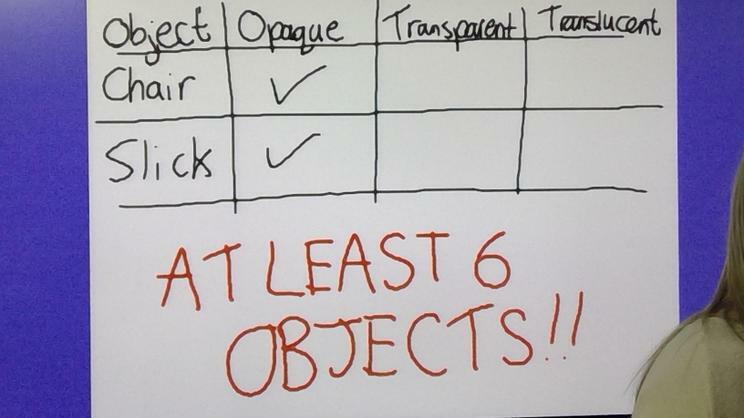 Is it opaque, translucent or transparent? 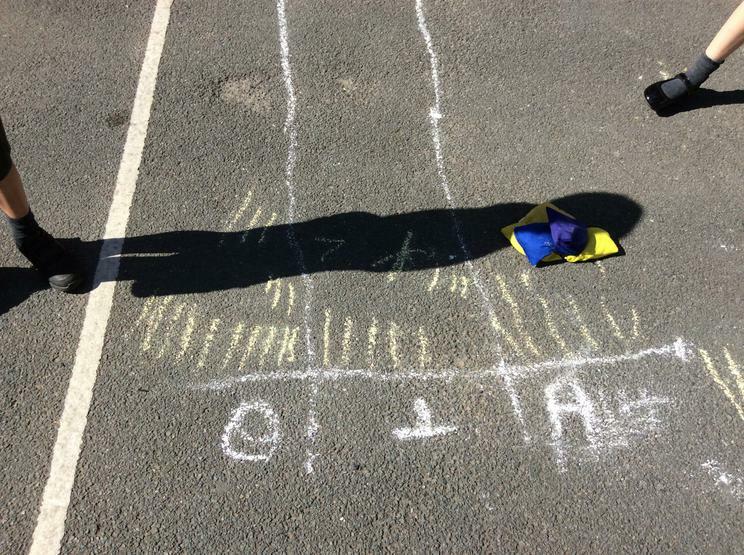 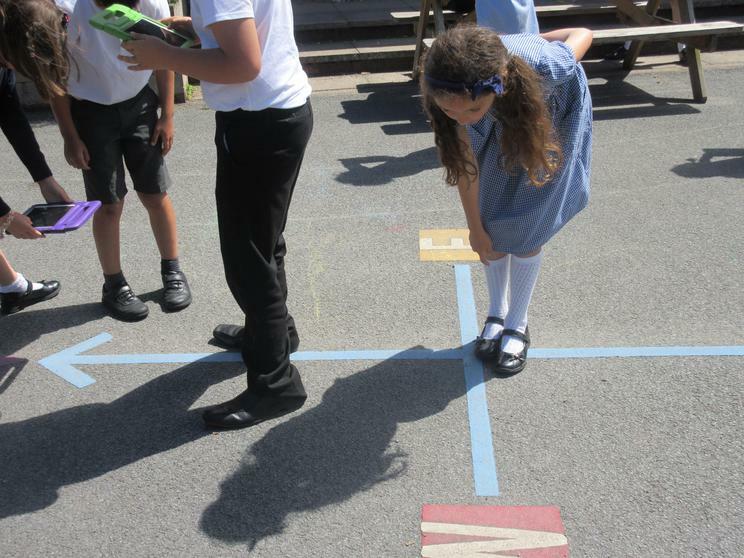 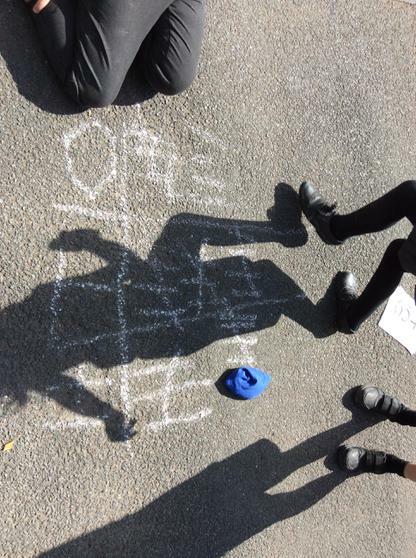 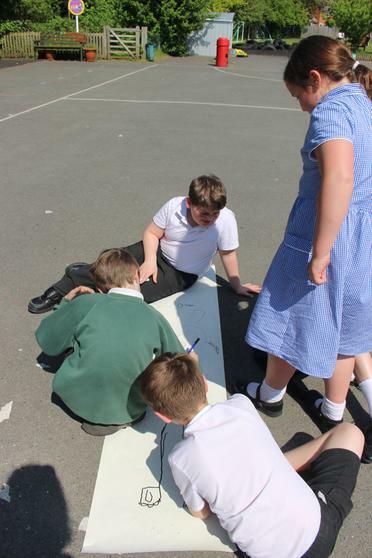 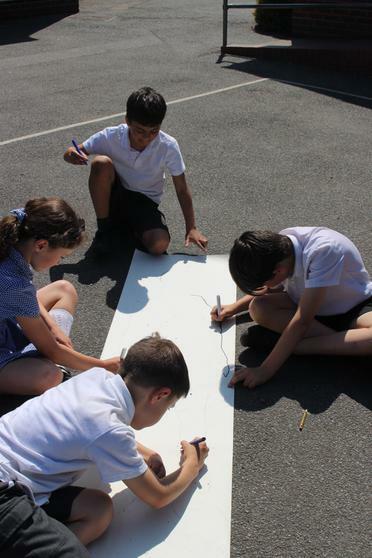 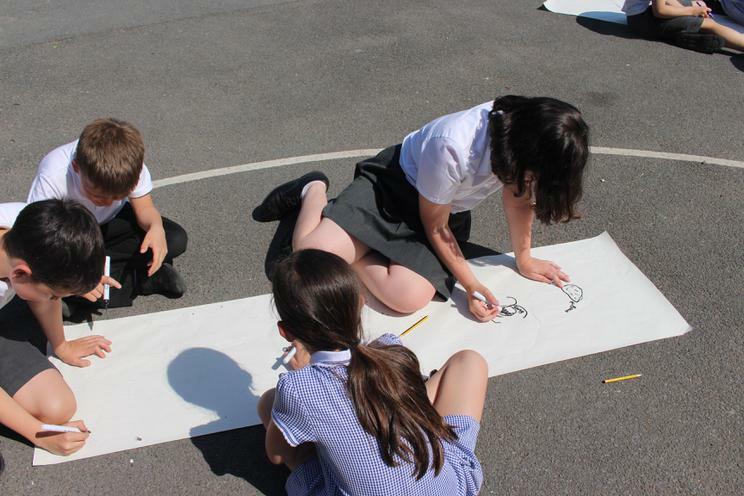 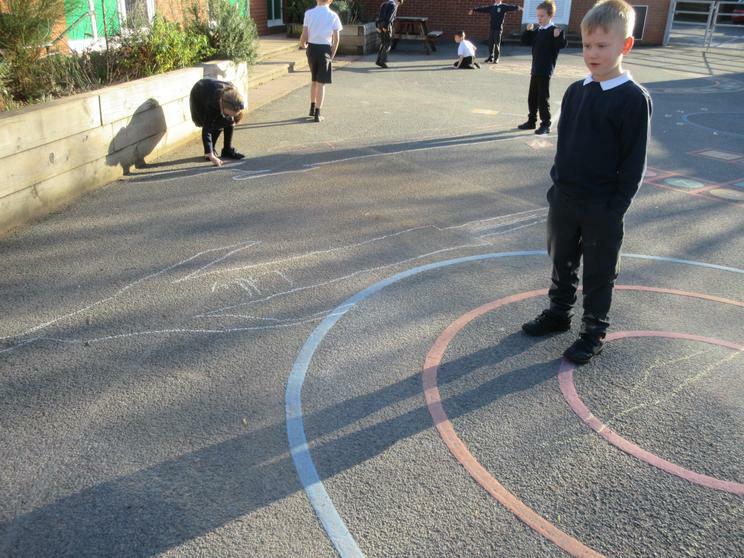 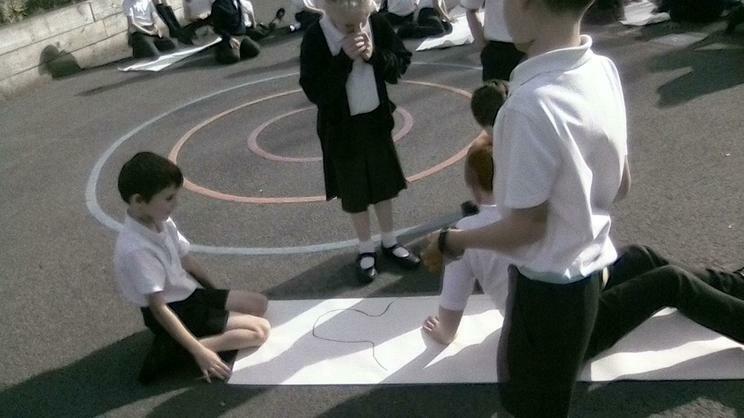 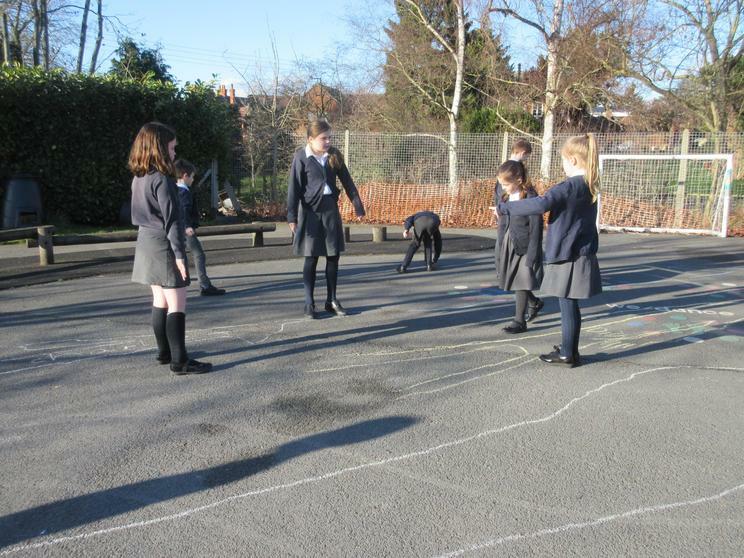 In our Science lesson today we started off by looking at where we could find shadows by going outside and drawing around the shadows that various items made. 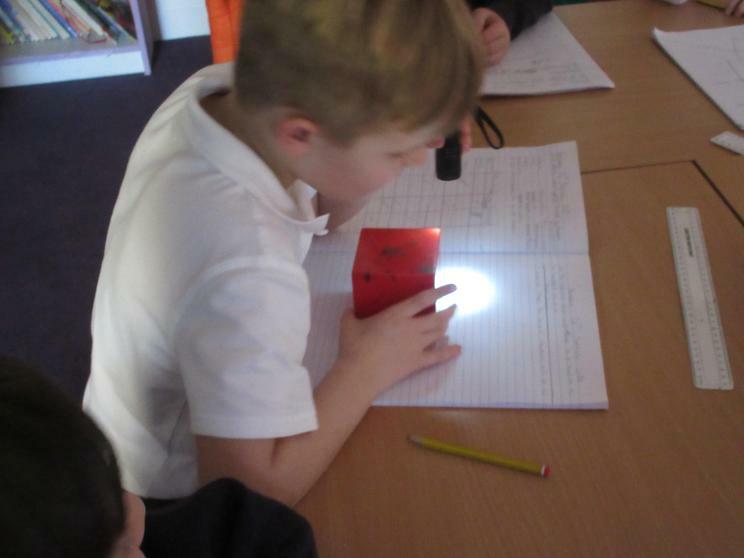 Next, we came back inside and talked about whether an item was opaque, translucent or transparent and how we knew. 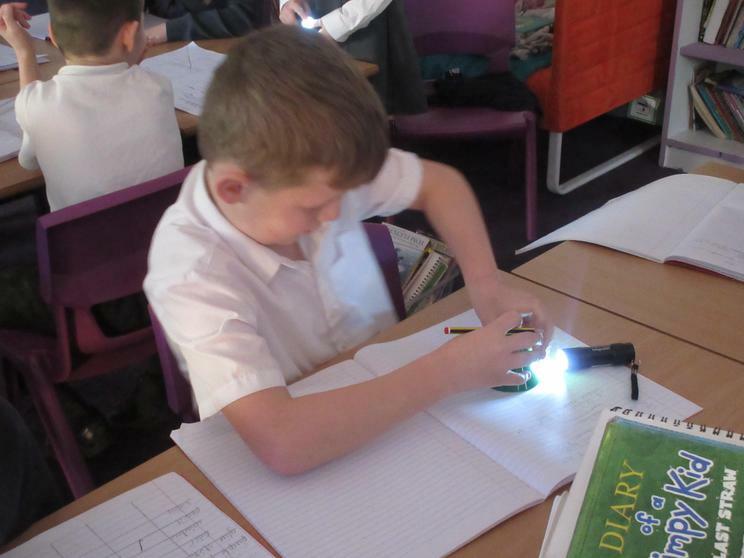 The children then went around the classroom and tested items by placing them in the light and looking to see if you could see through them. 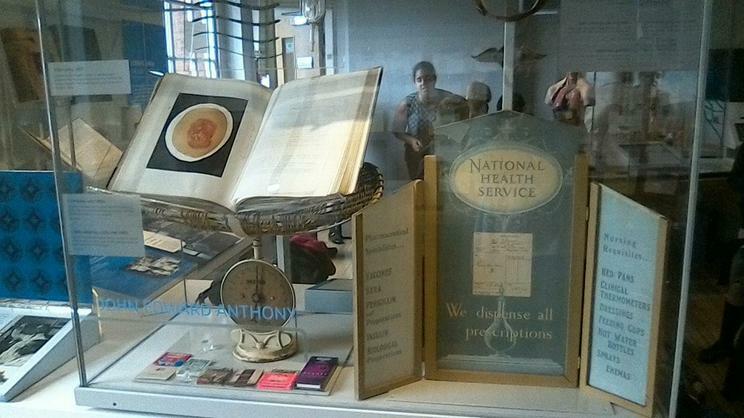 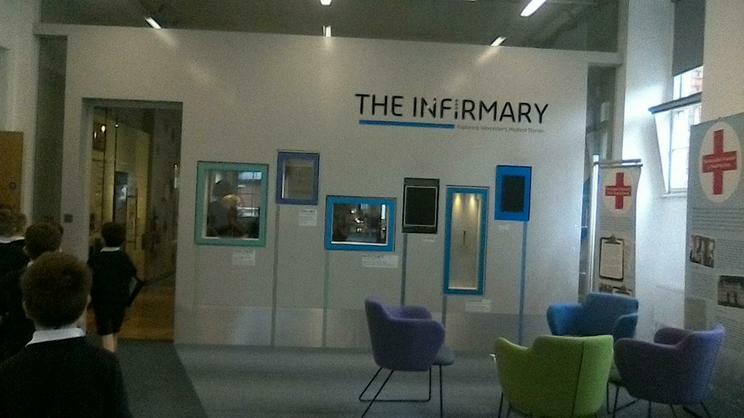 With it being a new year, we decided it would be nice to have a new door display. 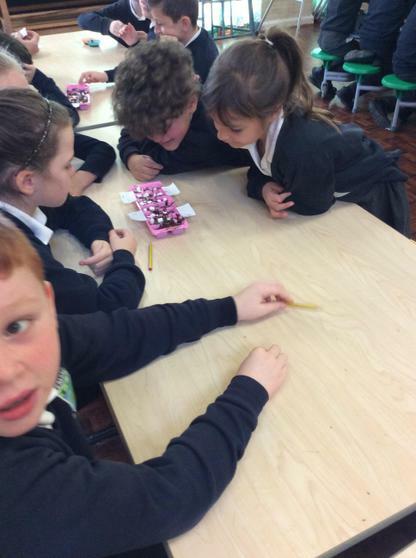 For this display, we have decided to focus on friendship and the importance of supporting others in our school. 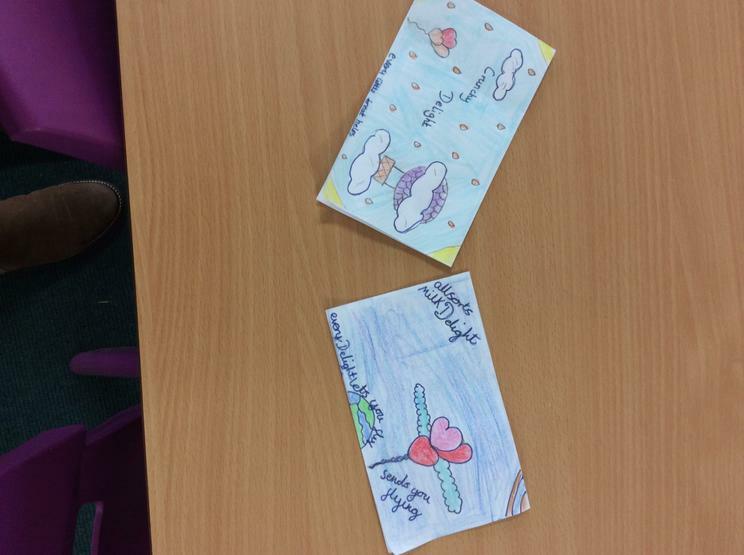 Our new class motto...be a rainbow in someone else's cloud! 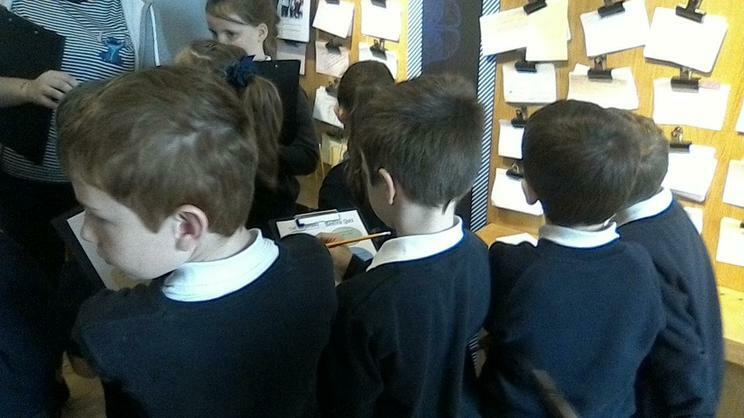 Today we all became explorers looking at The Stone Age! 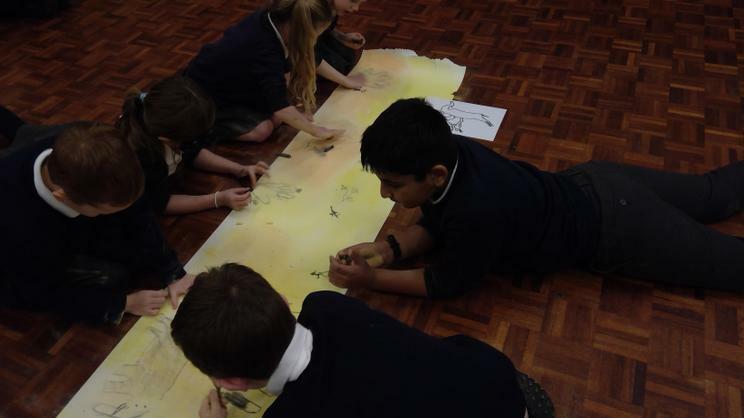 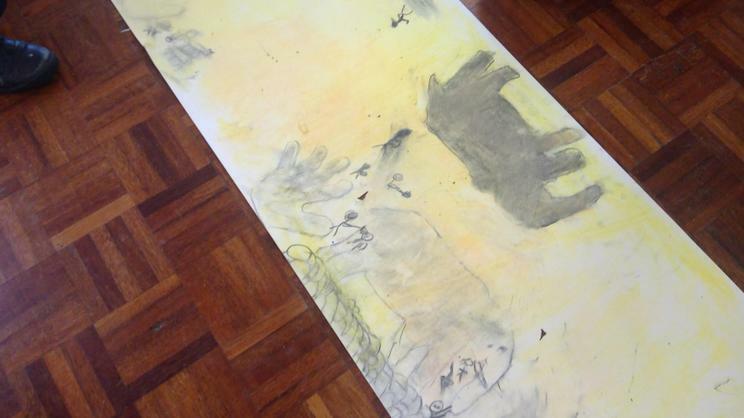 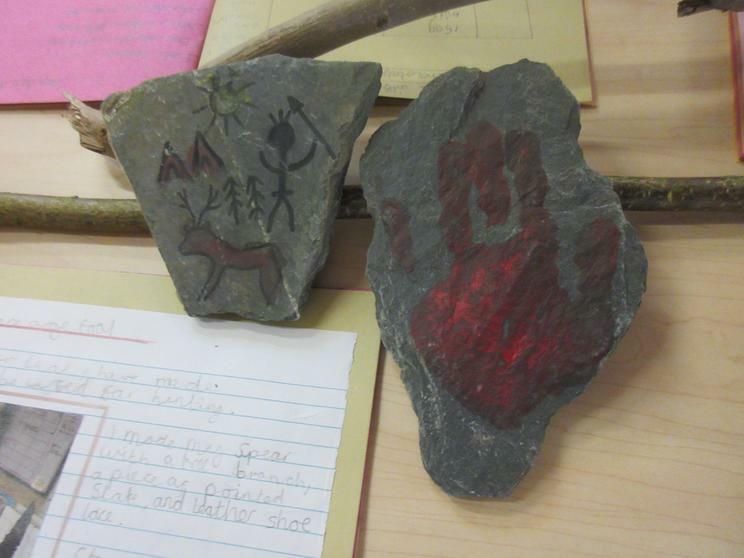 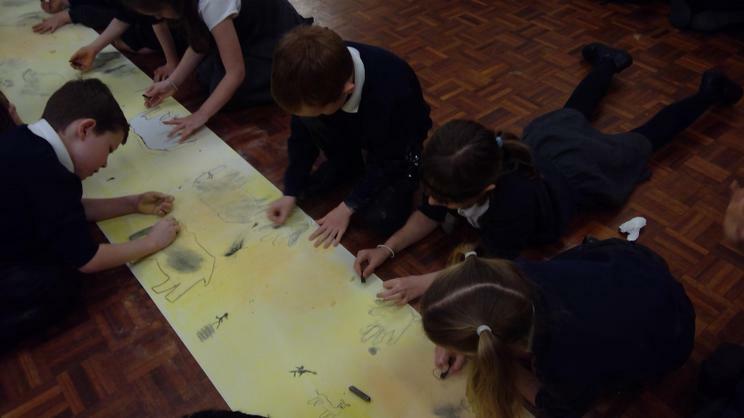 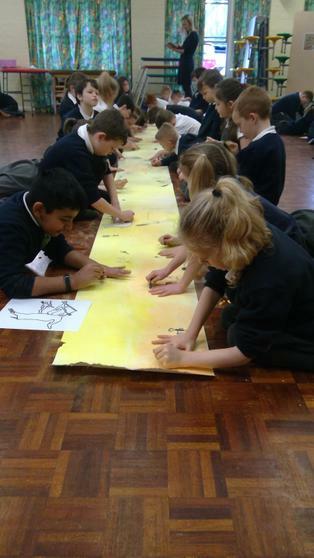 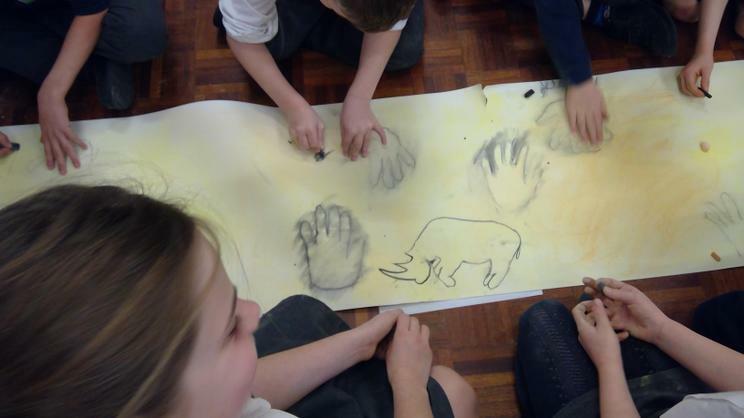 We created our own cave paintings as a whole class and researched facts about The Stone Age. 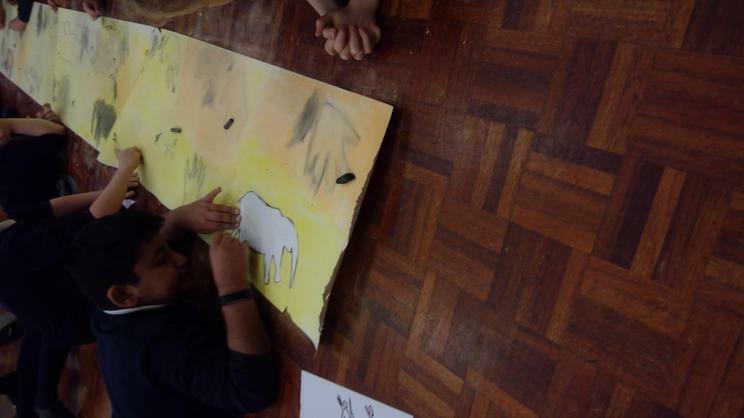 We thought about the pigments that might have been used to make our colours as well as the reasoning and meaning behind the art work. 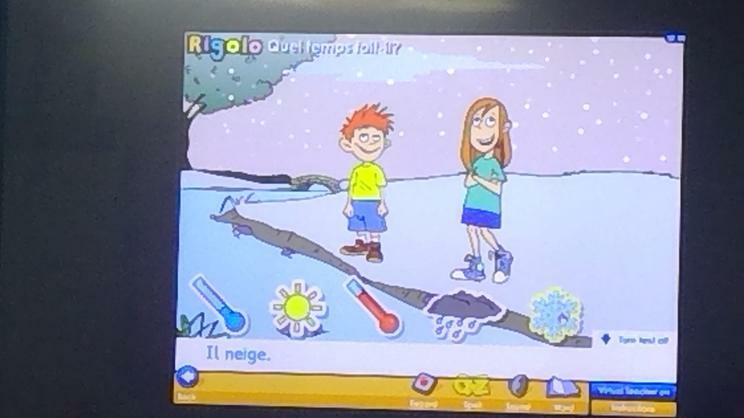 In French today we started to learn about the weather - we went from beautiful, sunny weather to it being very cold and snowing! 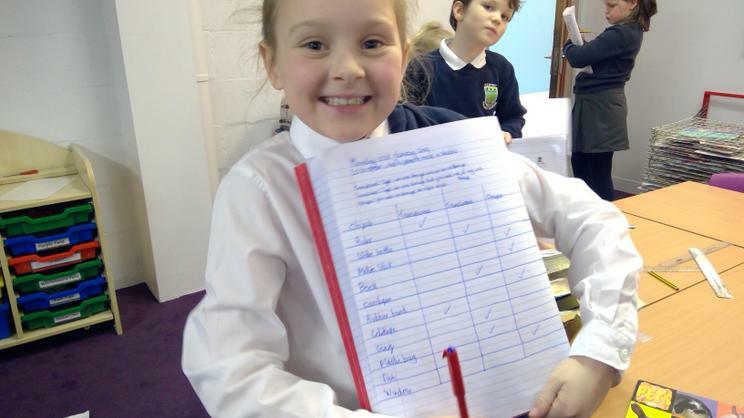 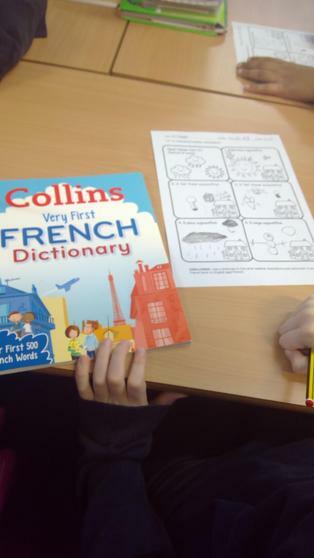 The children used their French dictionaries to help them and they all completed their task successfully! 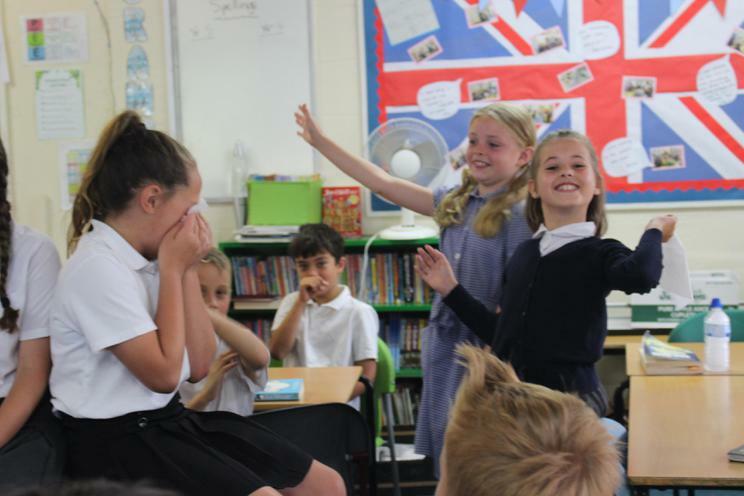 We have had an inspirational week this week, starting with our visit from Harnaam Kaur and ending with the year 3/4's singing 'This is Me' from The Greatest Showman. 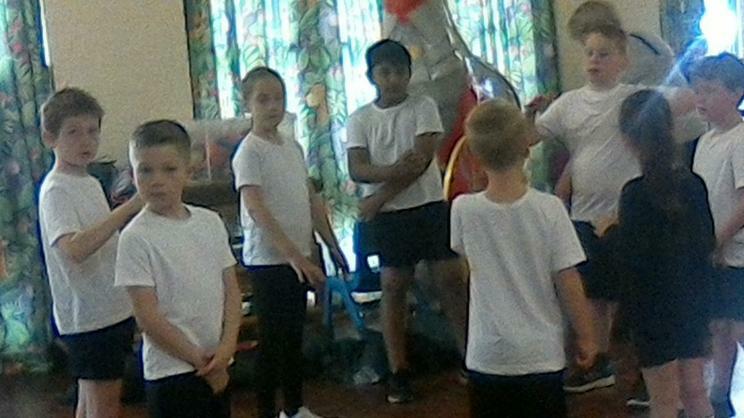 The children sang beautifully and gave it their all in order to put on a wonderful performance. 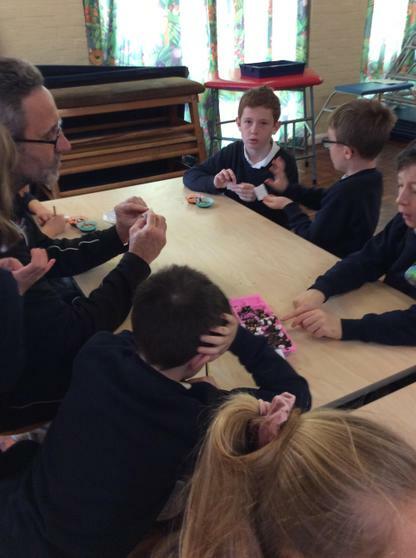 Over the week, we have reiterated to the children that we are all unique and special and that we should be proud of who we are. 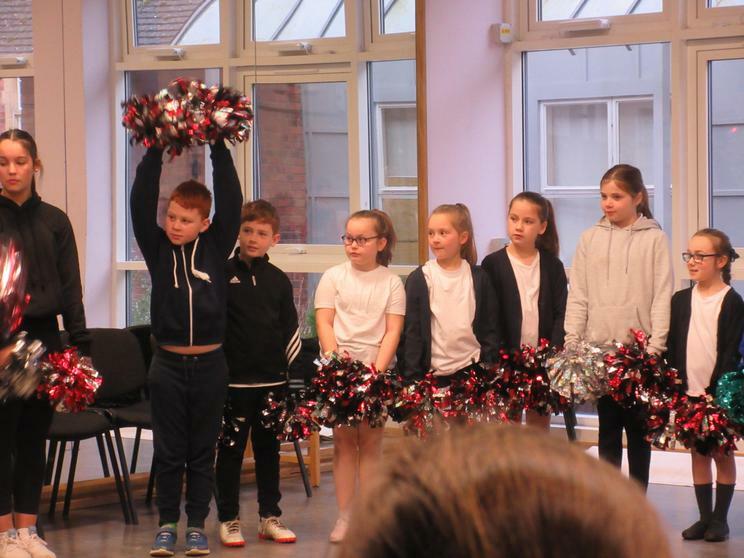 What a week - all the children should be very proud of this performance. 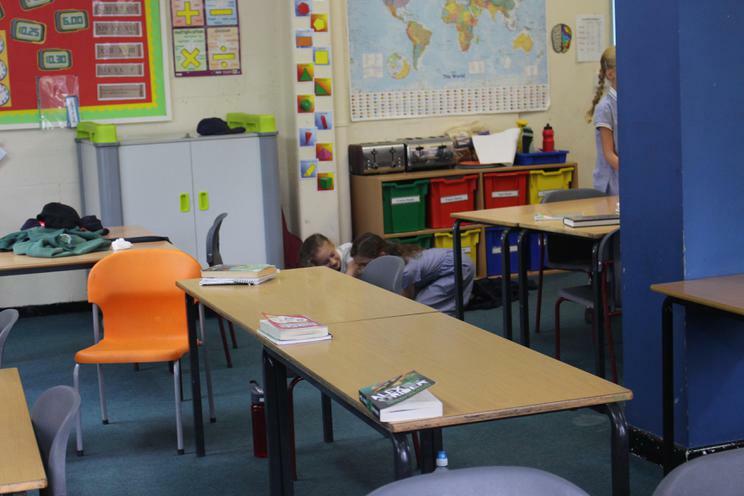 Hide and Seek - en Francais! 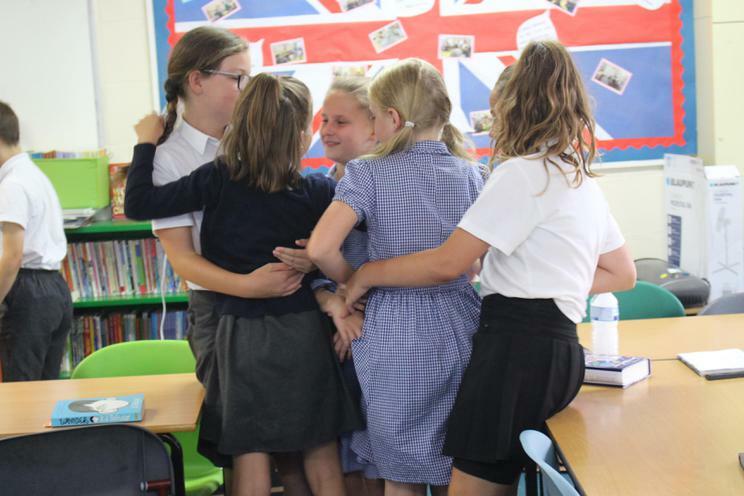 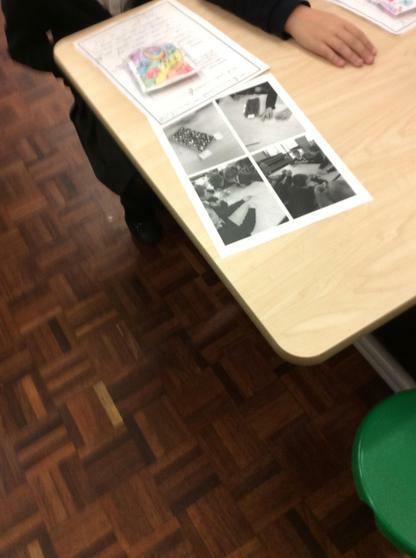 The children played a game of hide and seek - one child went out of the room, came back in when the picture had been hidden then the rest of the class either spoke quietly or loudly depending on how close they were to the picture. 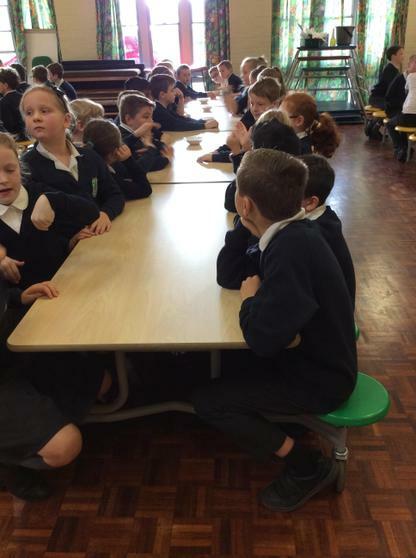 This children from year 4 in Oak, Laurel and Maple will start their swimming lessons today. 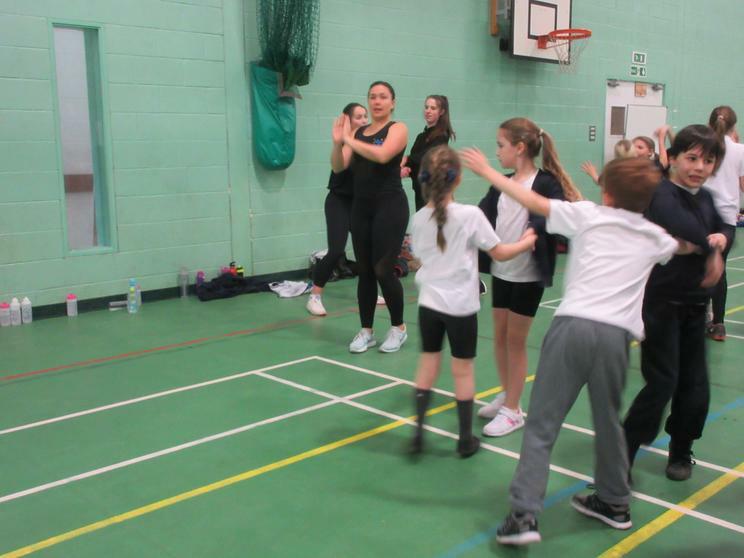 The children will be taught a variety of swimming techniques to help build their confidence and develop on previous skills. 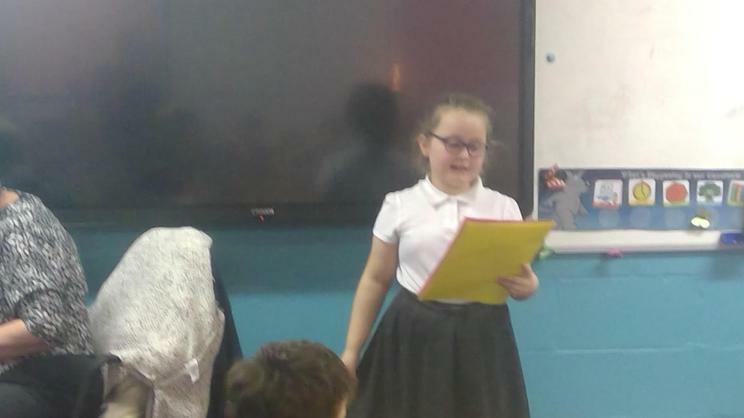 Today we have had the pleasure of having a visit from an inspirational woman, Harnaam Kaur, who, at the age of 16, decided enough was enough and grew out her beard. 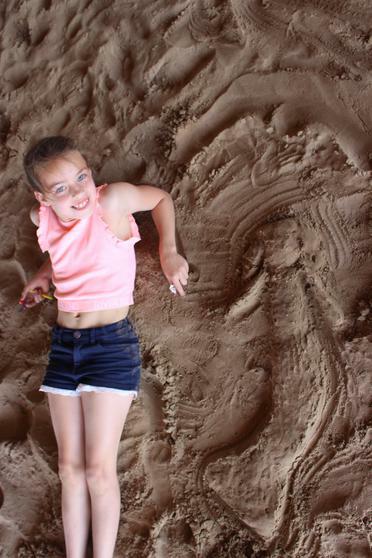 She has had to deal with bullying from a very young age but has learned to embrace who she is. 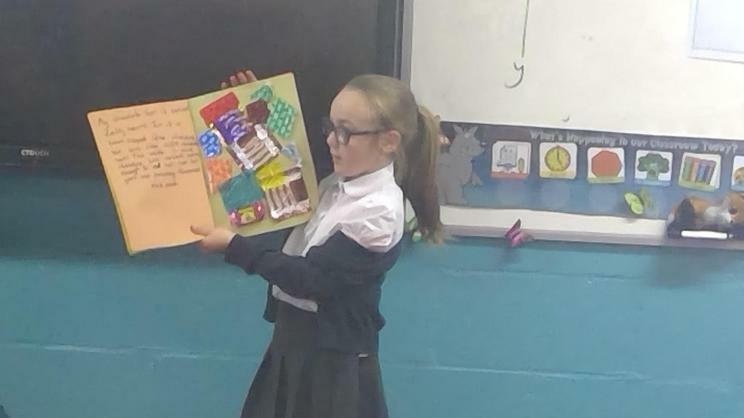 She gave a wonderful and thought-provoking talk on loving ourselves as we are and that being unique is a special thing. 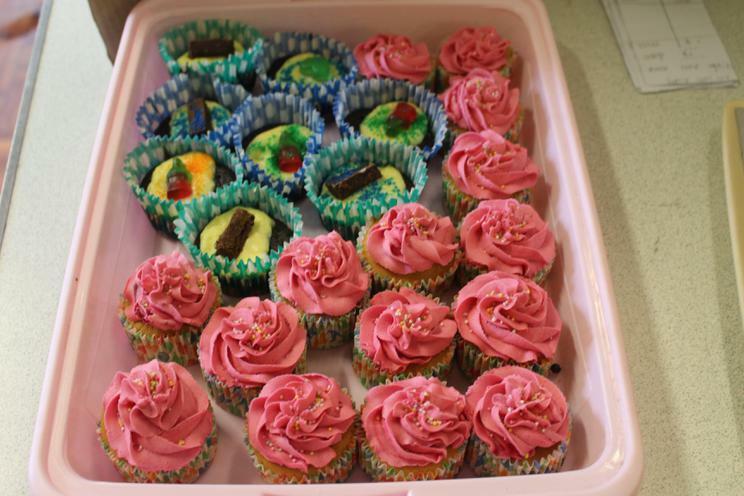 A warm welcome back to Spring term! 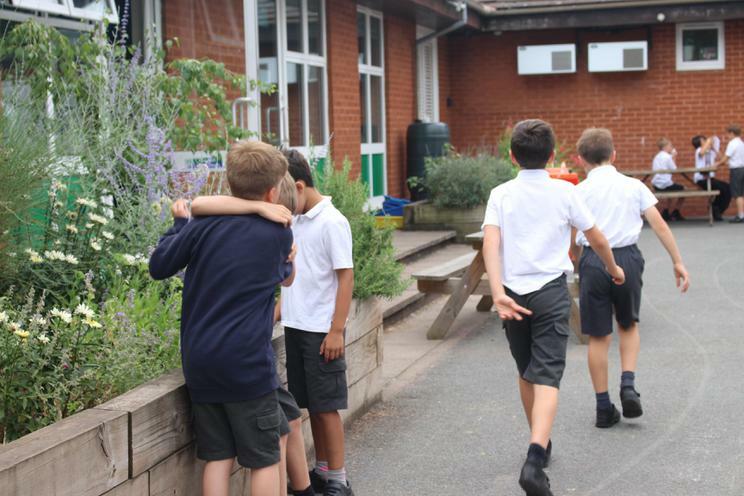 Wishing all children, parents and carers a very happy new year and welcome back to Spring term 2019! 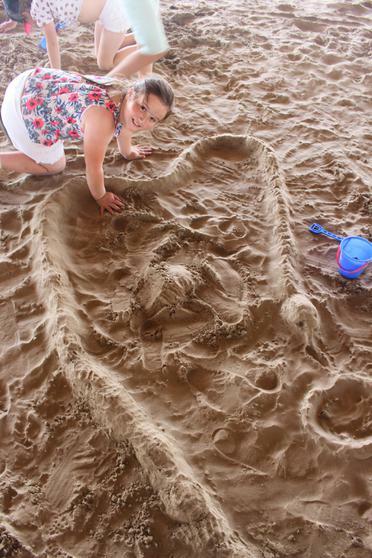 We hope you all had a wonderful break! 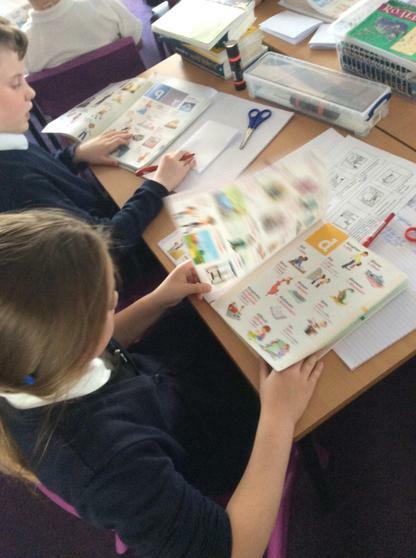 We are very excited about the next few weeks and have got plenty of interesting lessons ahead...watch this space! 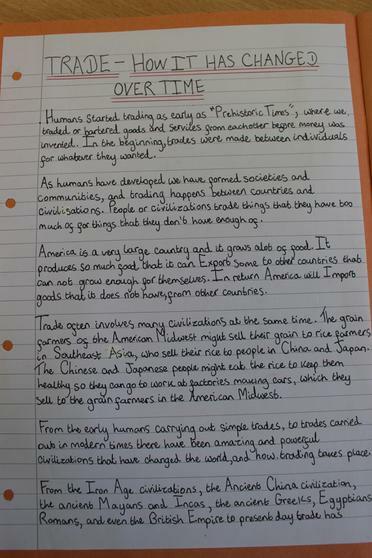 What a topic homework that was! 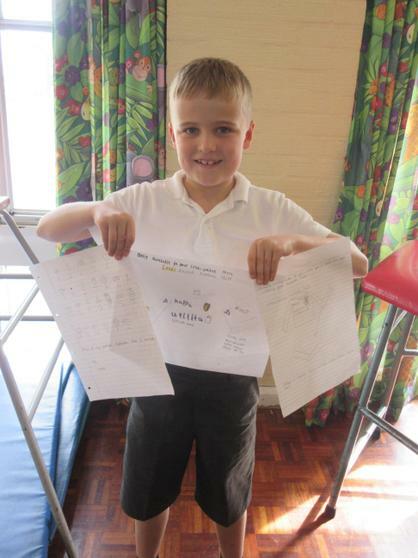 The children have worked so hard in school this half term and they have shown to have worked just as hard at home. 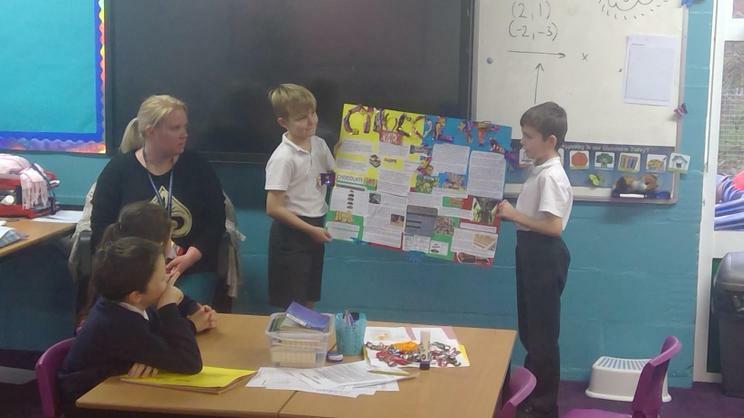 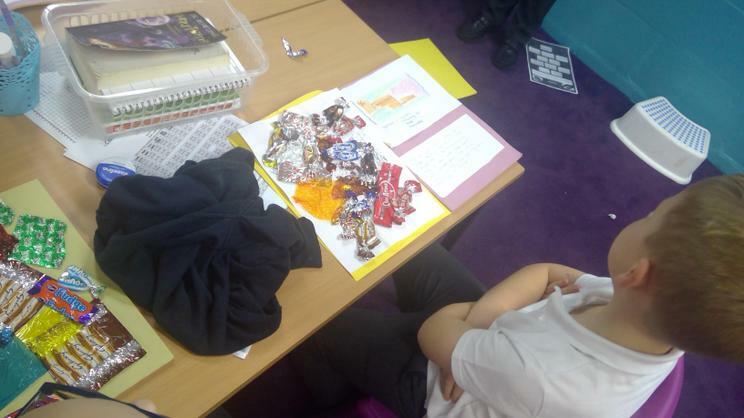 The level of topic homework on our latest adventure 'chocolate' has been fantastic as we have had a wide variety of work brought in including a poster fact sheet, chocolate bar wrappers, bundles of information of the history and geography of chocolate plus a fair amount of home made goodies! 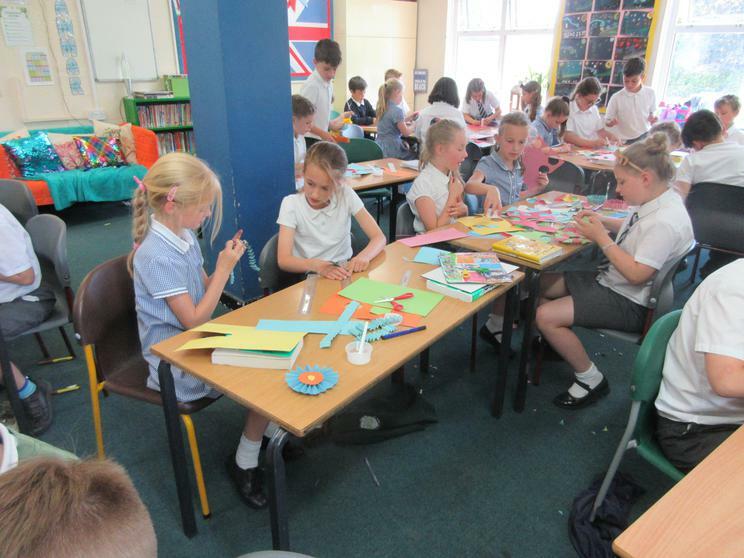 The children should be very proud of what they have achieved this half term! 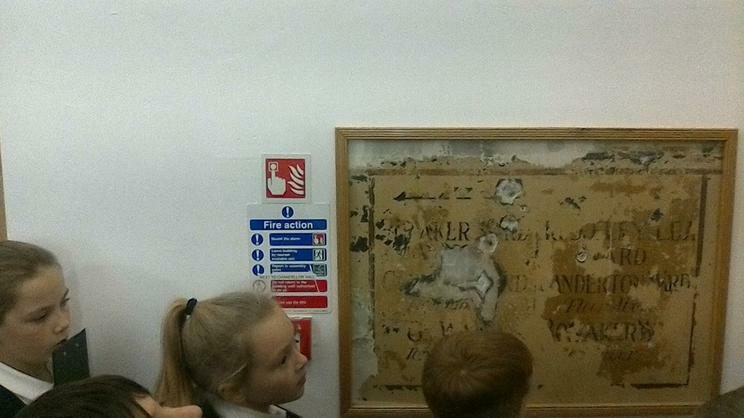 We had a very special visit today from the one and only Father Christmas! 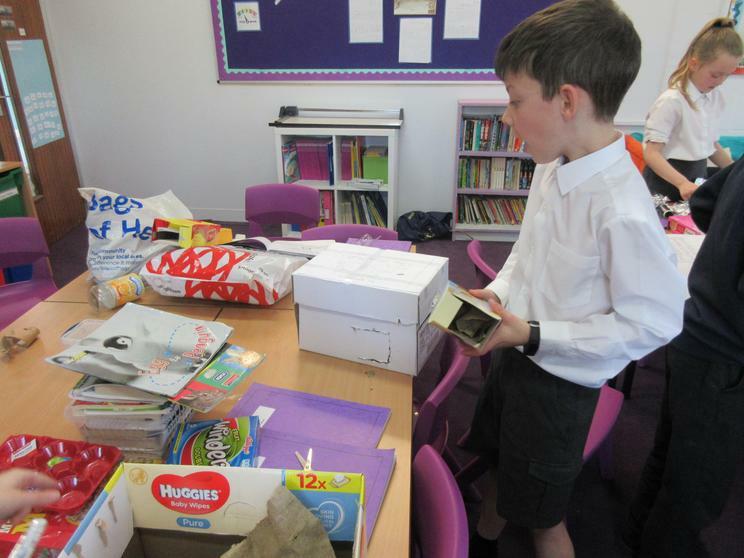 He was very jolly and we were lucky to receive some goodies from him just before the big day! 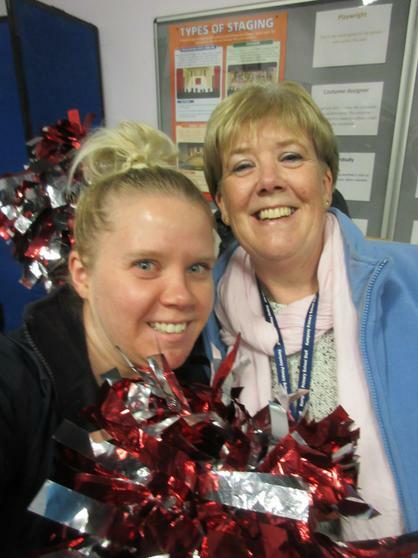 A lovely end to our Christmas jumper day! 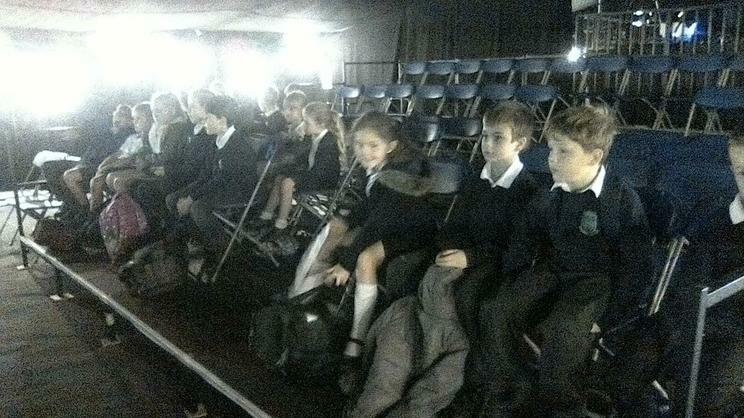 Today we thoroughly enjoyed watching the early years and key stage 1 nativity. 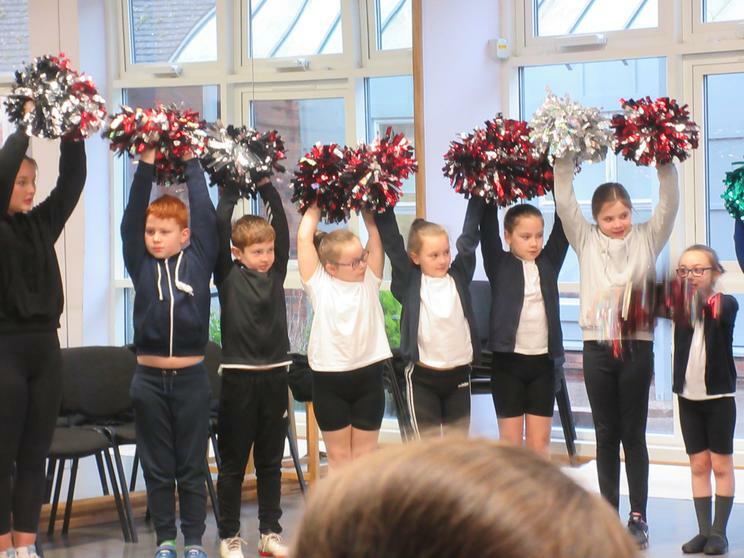 The children were fantastic and played their parts brilliantly! 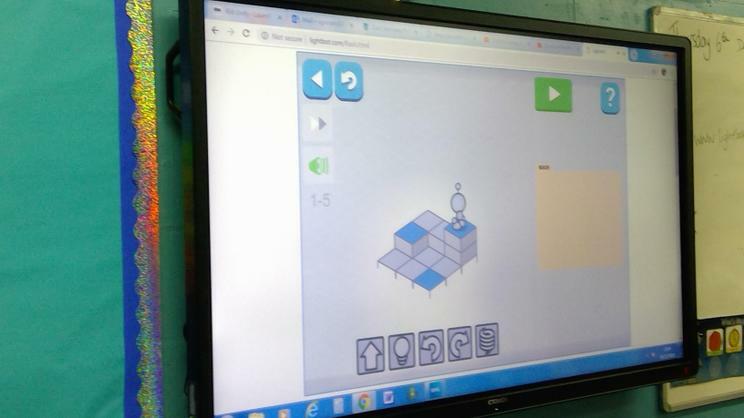 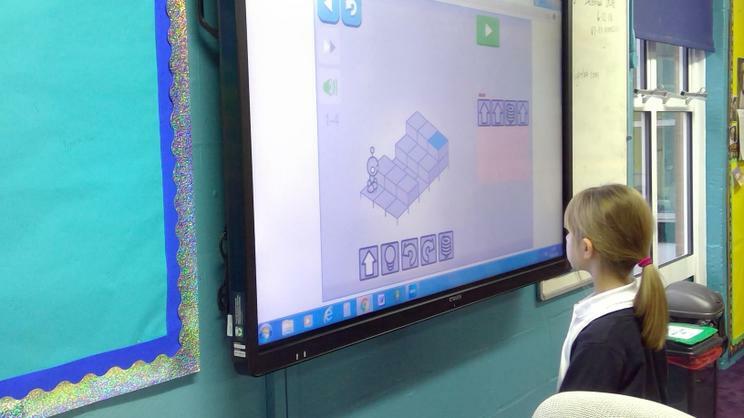 Today, the children have used a website called Lightbot to help them code. 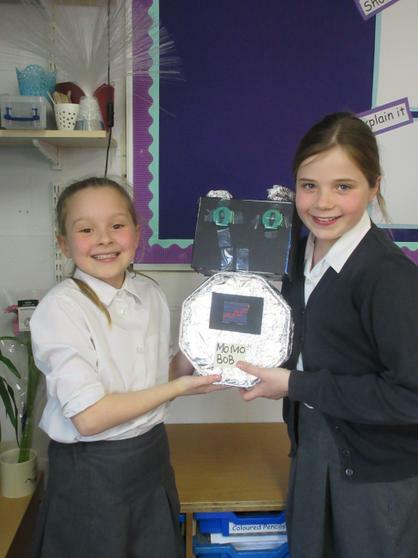 The aim was to guide the robot to the end of the course where they had to land on the bright blue square! 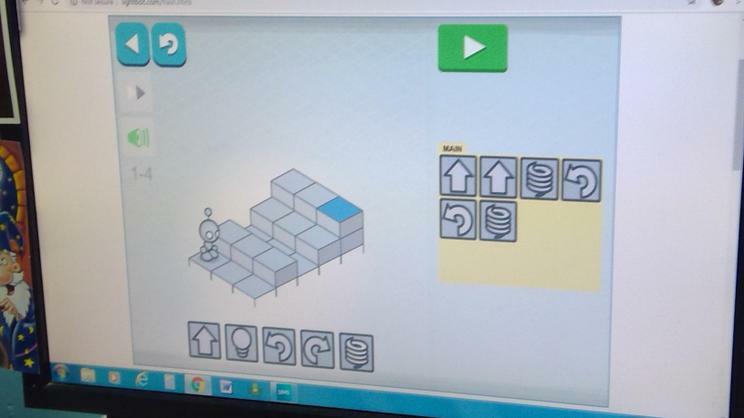 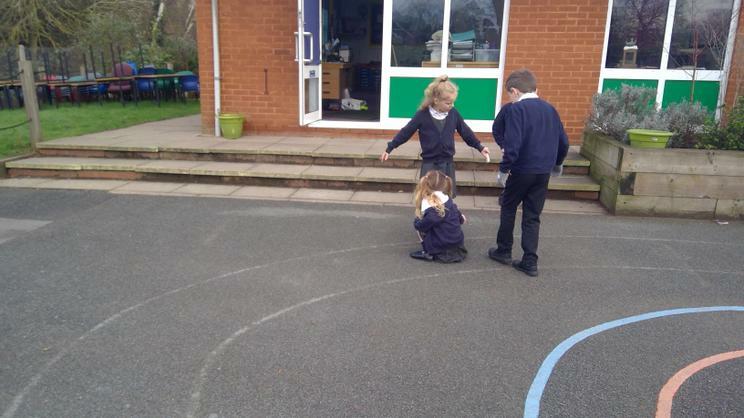 The children not only coded the robot to go where they needed but also themselves to test their instructions! 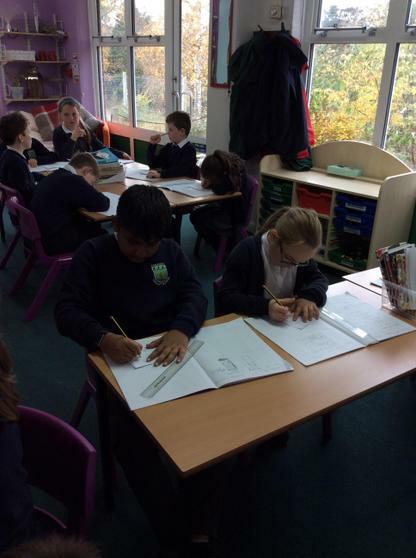 It's been fantastic to get settled back into our classroom. 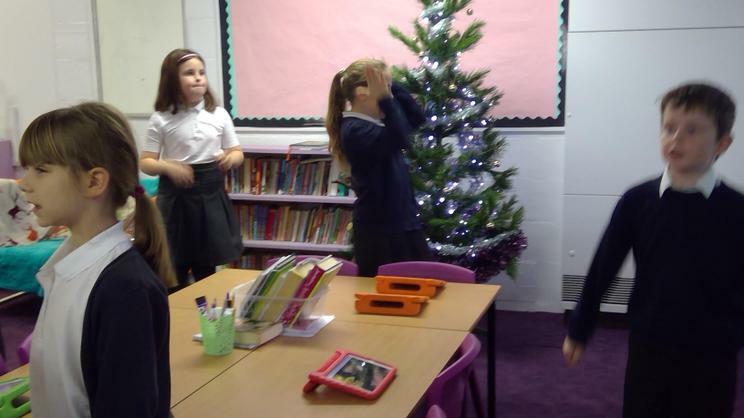 To make our learning environment festive, we have put up our wonderful Christmas tree along with Woody our reindeer...there is also a special something on the tree for each of the children, and adults, in Oak class! 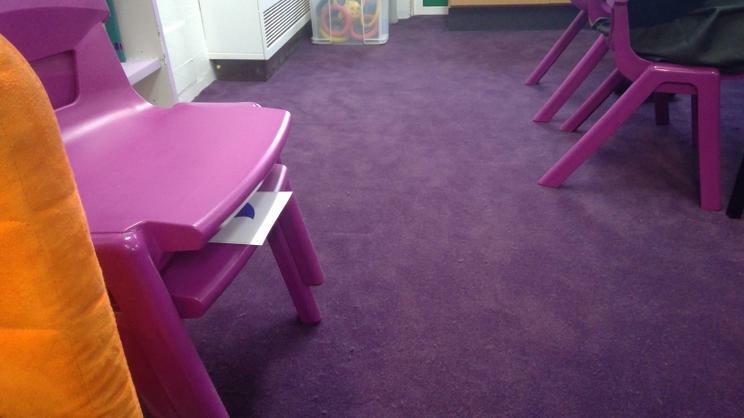 As of Tuesday, we will be back in our brand new classroom! 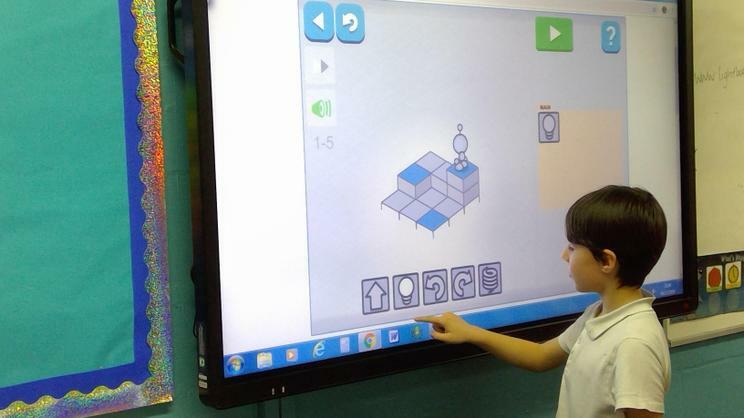 We are so excited to start our learning in our bright (and pillar-less) room! 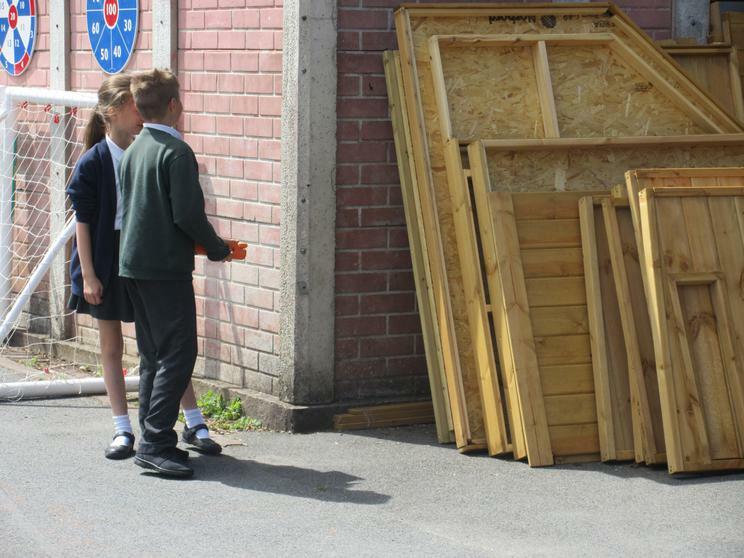 Drop-off and collection is now, as normal, on the back playground. 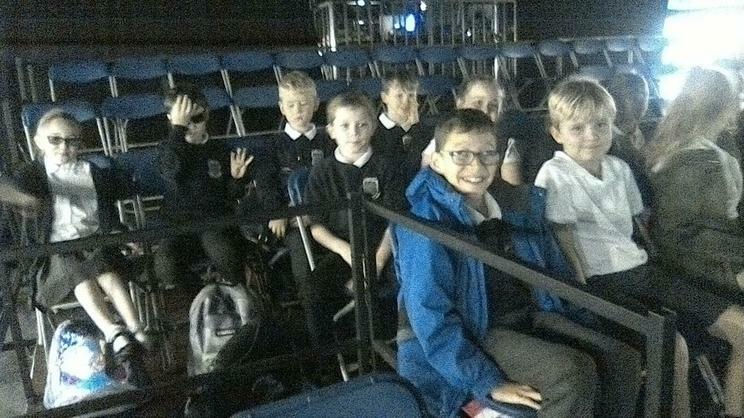 This morning, the children had a fantastic time at the pantomime of 'Maid Marian and the Merry Men'. 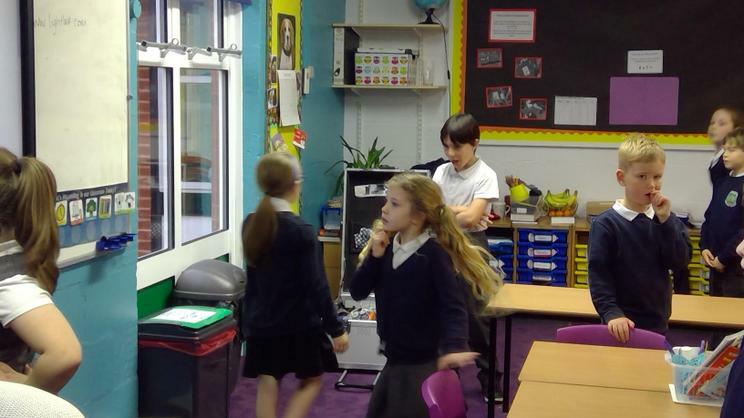 The children joined in with the cast by answering 'oh no she didn't' and singing Christmas songs! 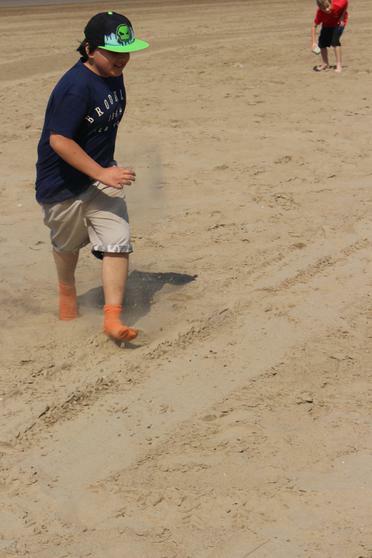 It was a wonderful morning out! 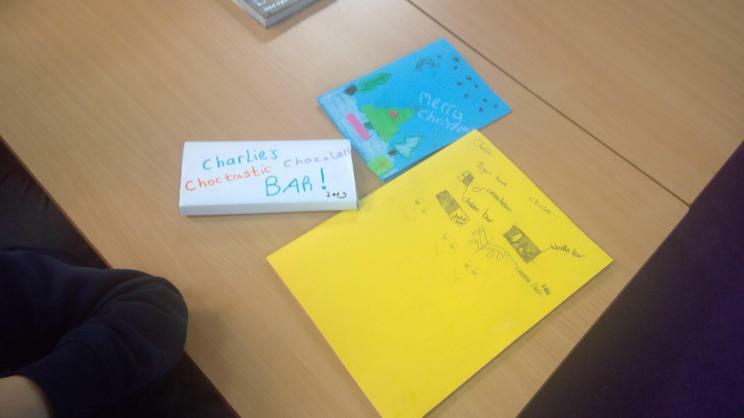 Today, the children have written their narratives on Charlie and the Chocolate Factory. 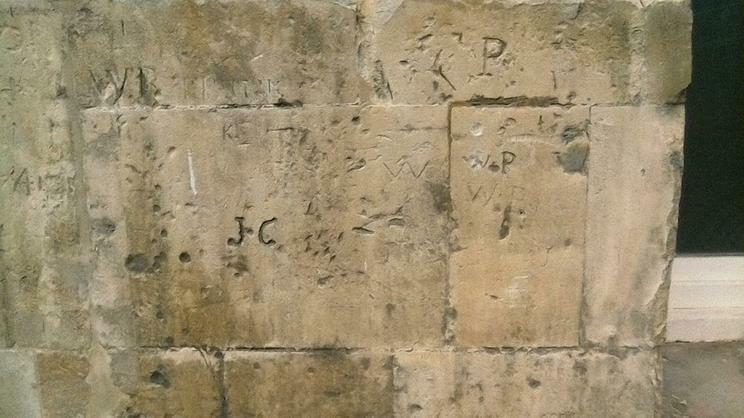 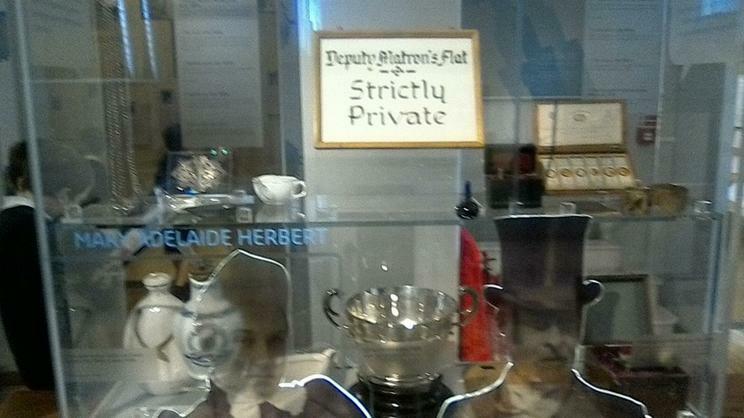 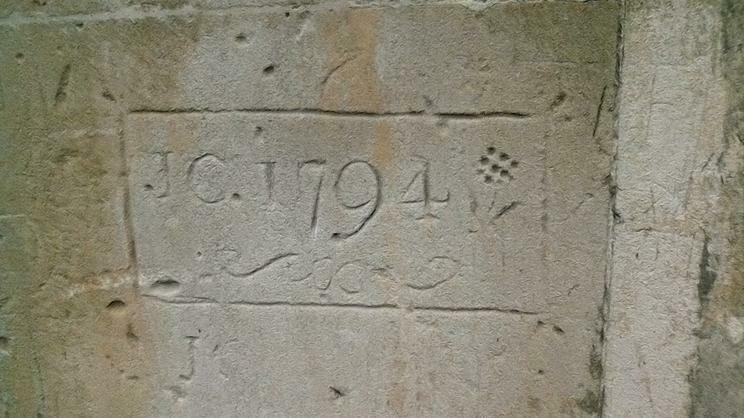 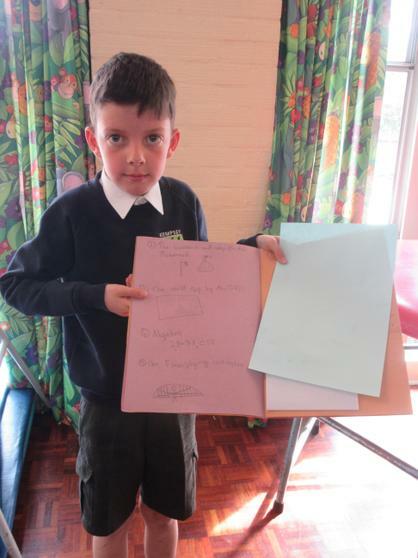 They have taken their time with their handwriting as well as checked spellings. 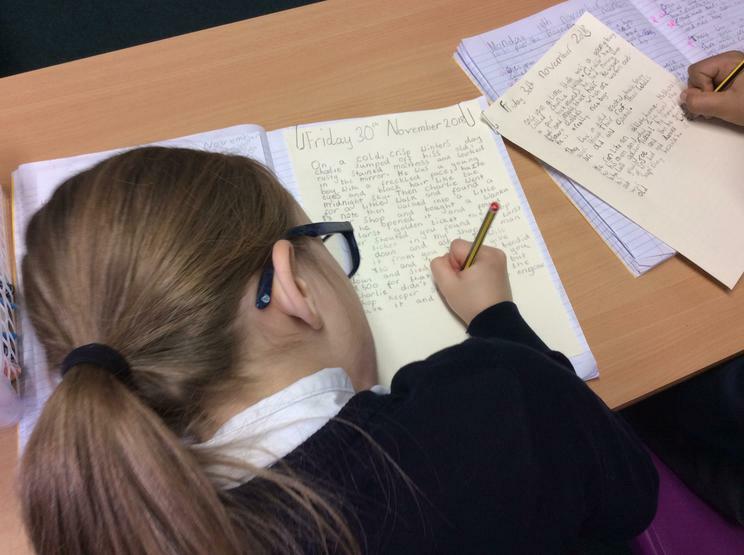 The narratives are a great read! 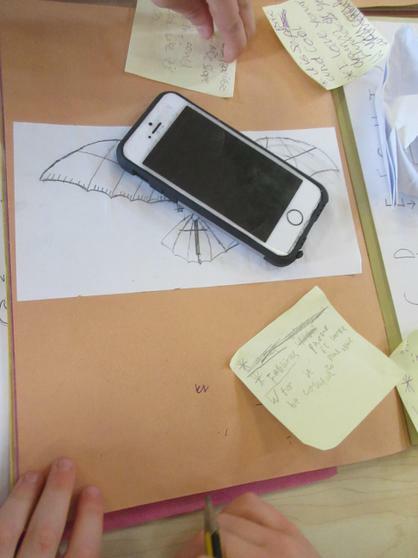 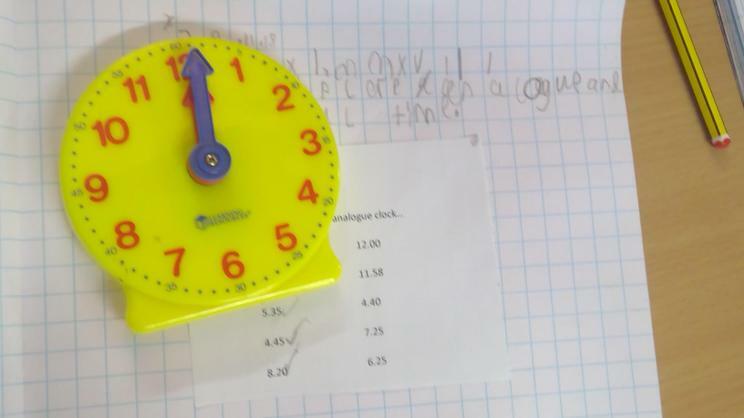 Over the course of the week, the children have been recapping on time - both analogue and digital. 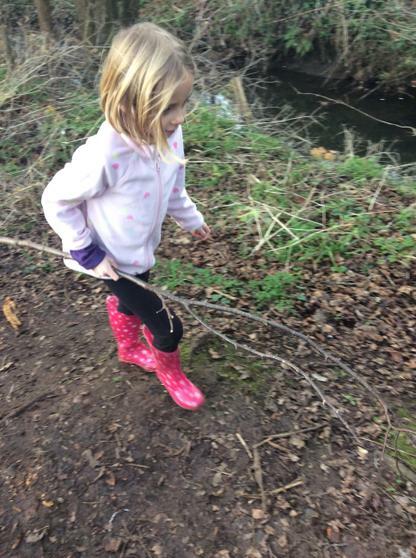 This can be a tricky concept to pick up and something that, as adults, it's a skill we take for granted. 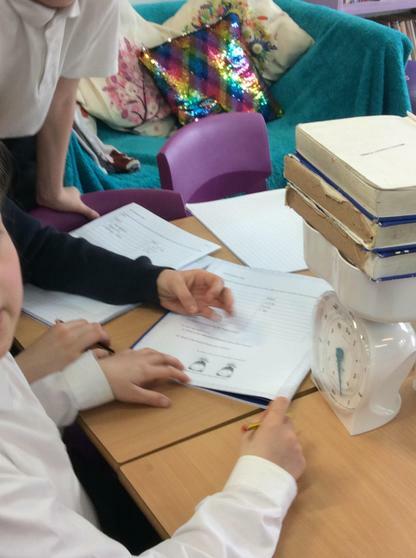 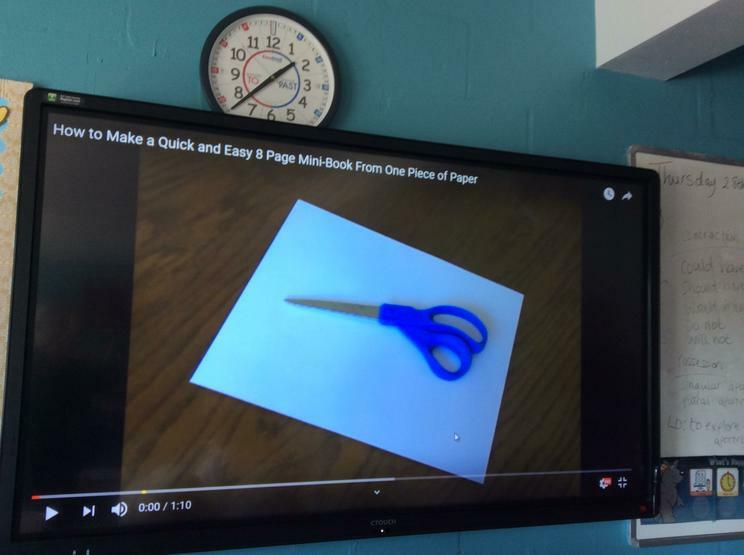 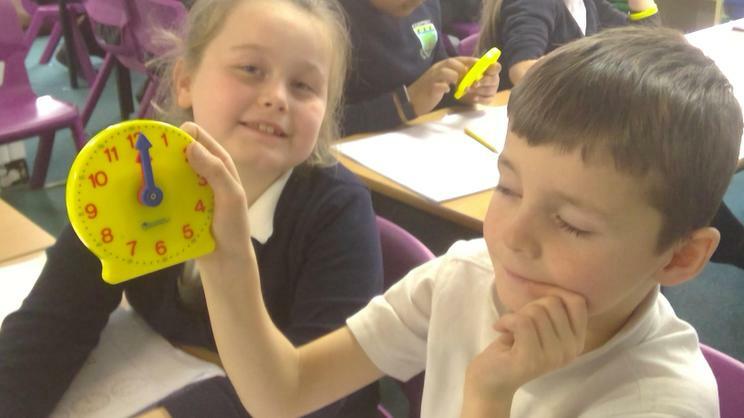 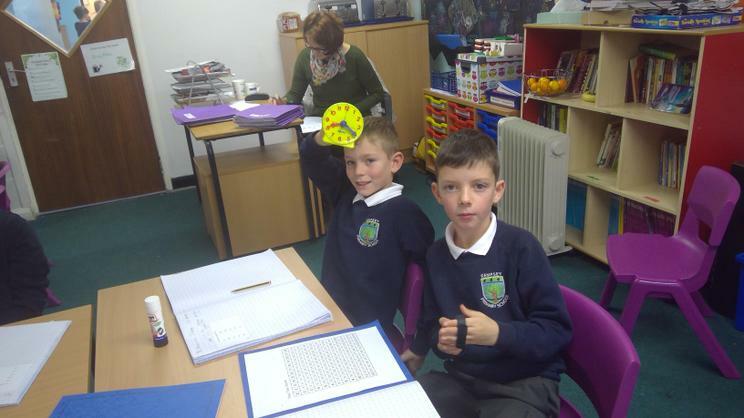 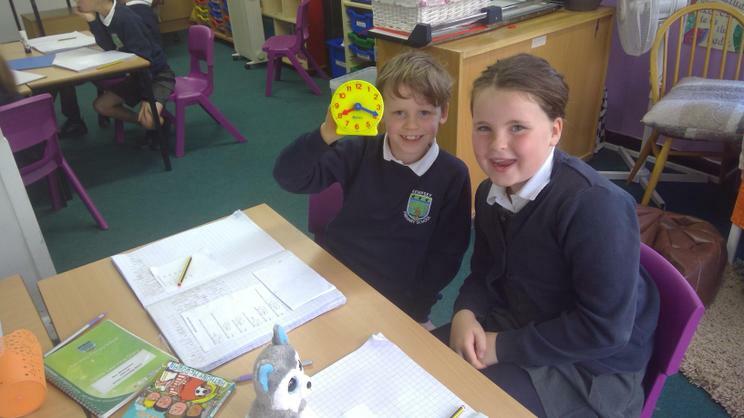 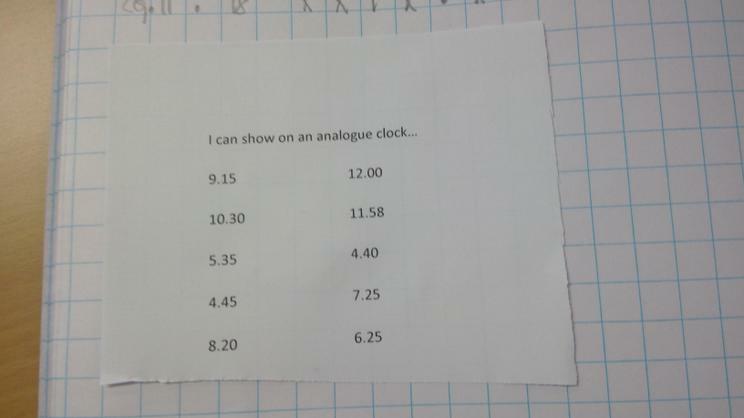 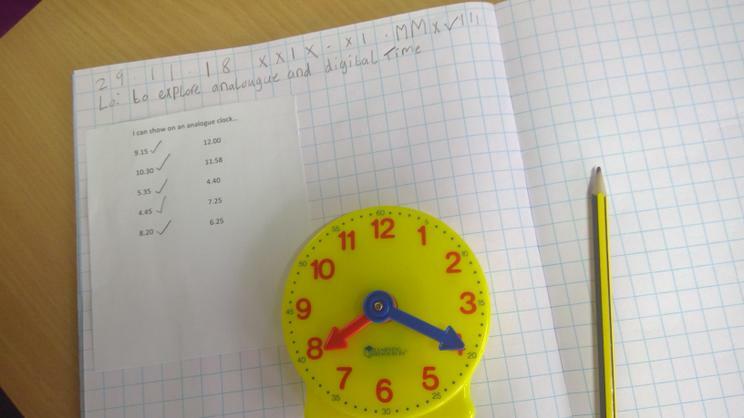 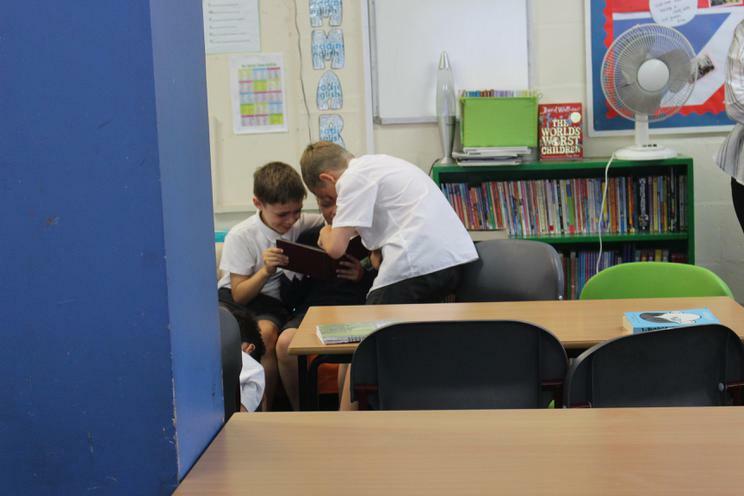 The children have worked exceptionally hard and, in this lesson, the children were able to form the hands on an analogue clock by reading a digital time. 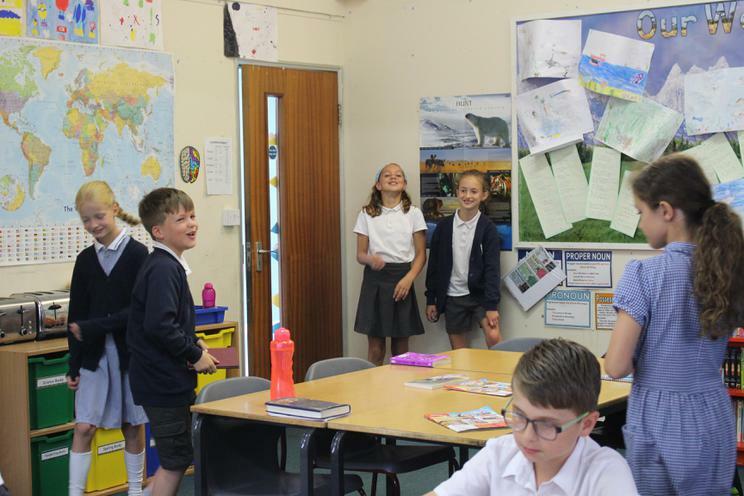 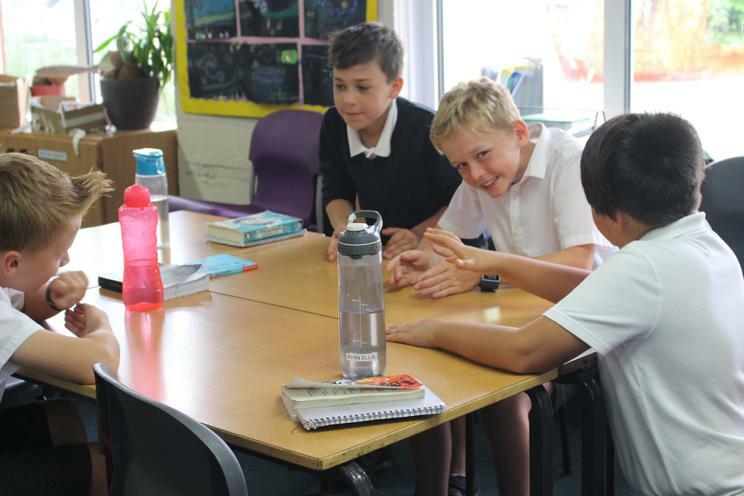 This afternoon, we have started a new Friday afternoon session where children are sent to different classrooms in order to take part in a range of activities. 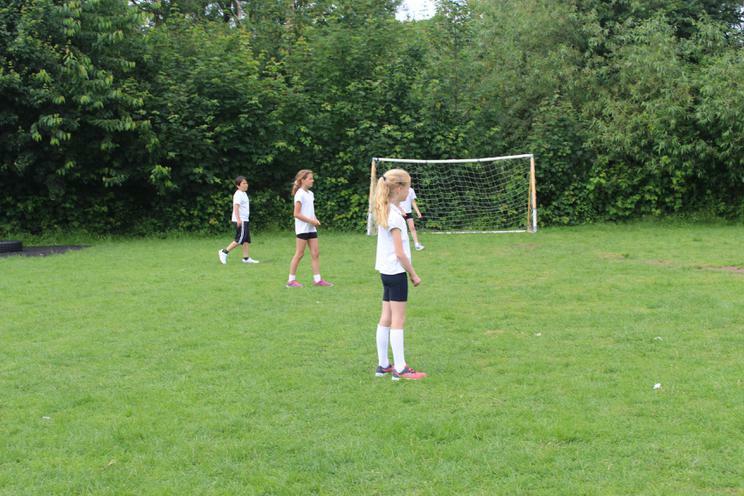 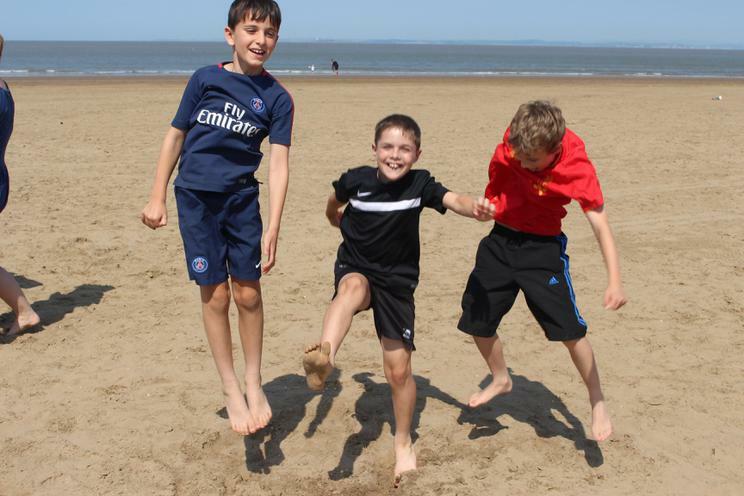 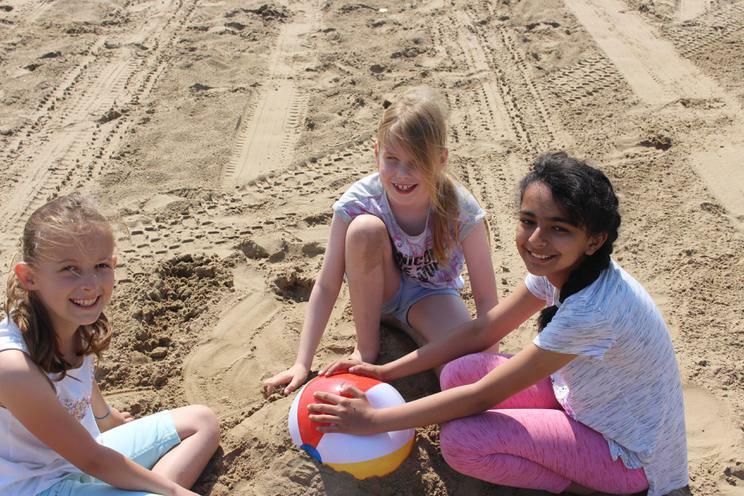 These include learning German, taking part in drama, map reading and foot golf. 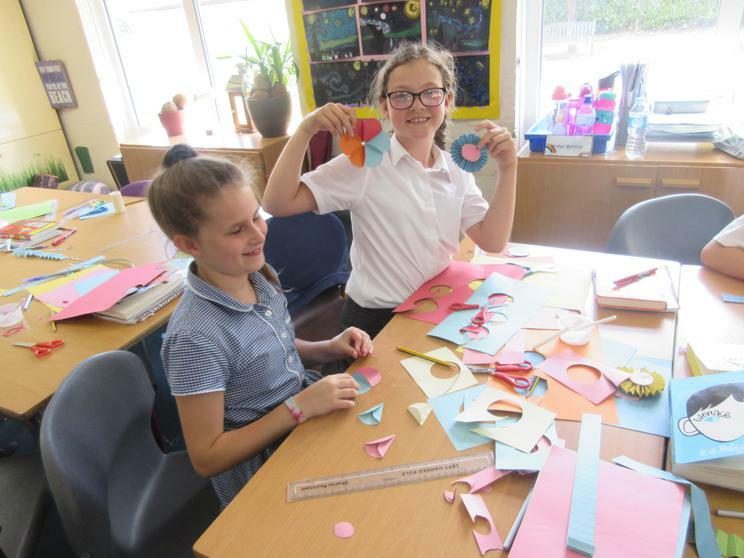 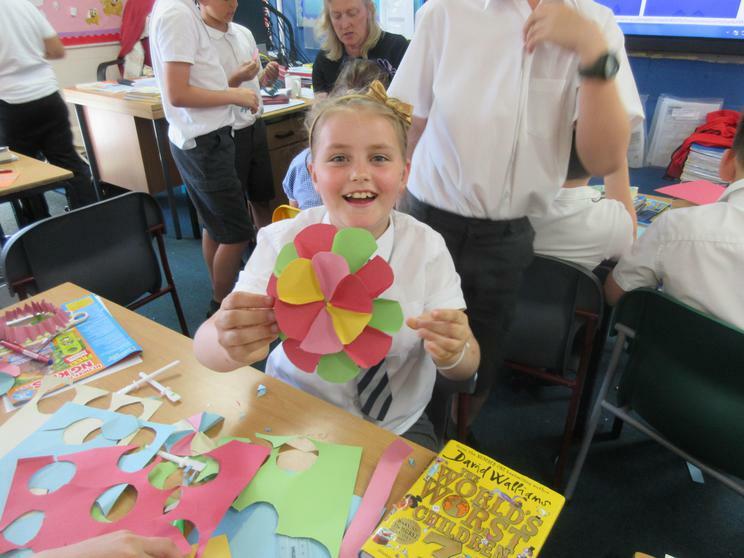 Myself and Mrs Kimpton are very excited to be leading community work and this week the children have designed and made paper flowers and written inspirational messages. 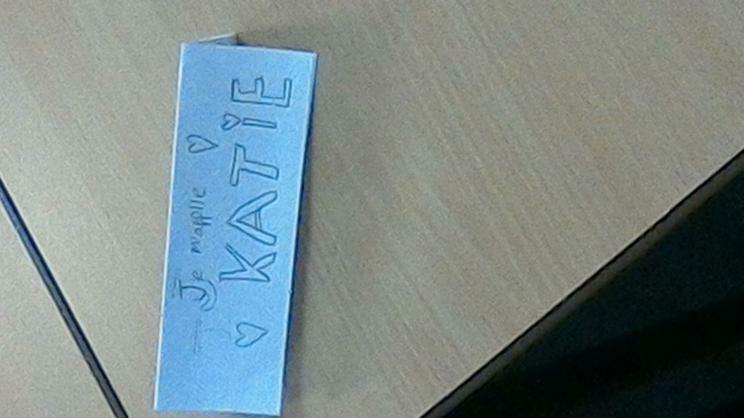 These will be distributed by myself and Mrs Kimpton around the local shops for the general public to pick up and smile! 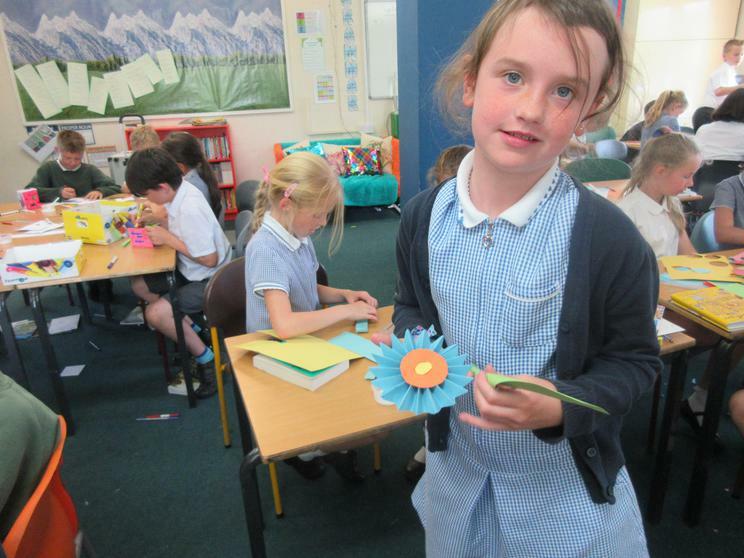 The children created some beautiful flowers and wrote some thoughtful messages. 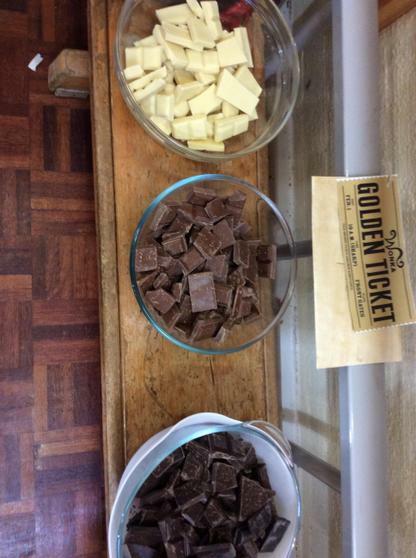 Welcome to Willy Wonka's Chocolate Factory! 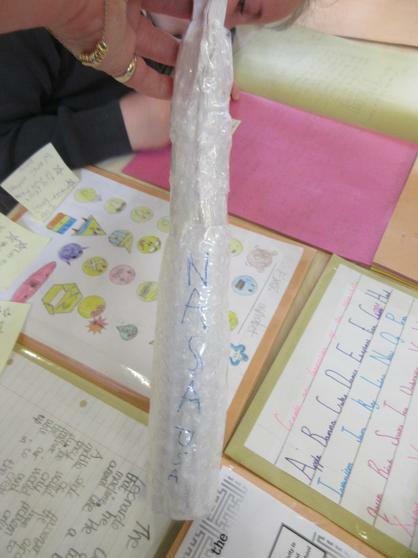 This morning we received a very exciting looking envelope (we never usually receive gold letters) in Oak, Laurel and Maple class. 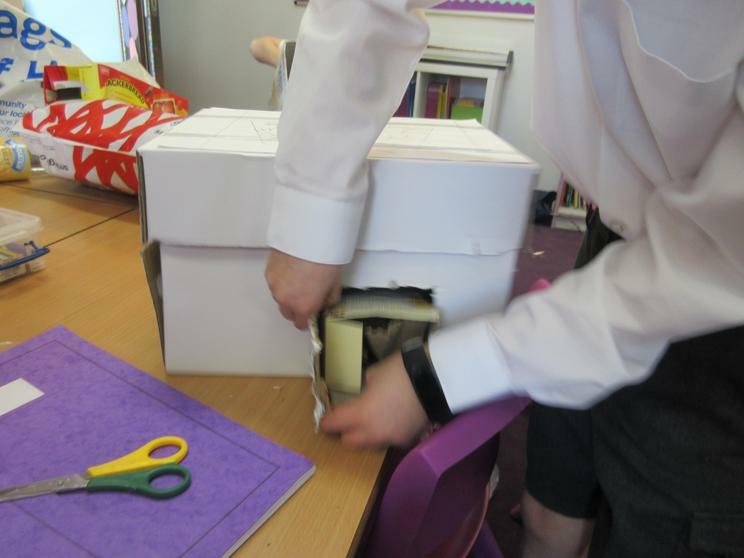 We opened it up and inside we were told that Willy Wonka needed our help to design some chocolates as well as the wrappers, as the Oompa Loompas had all transformed into blueberry's (too much chewing gum!) 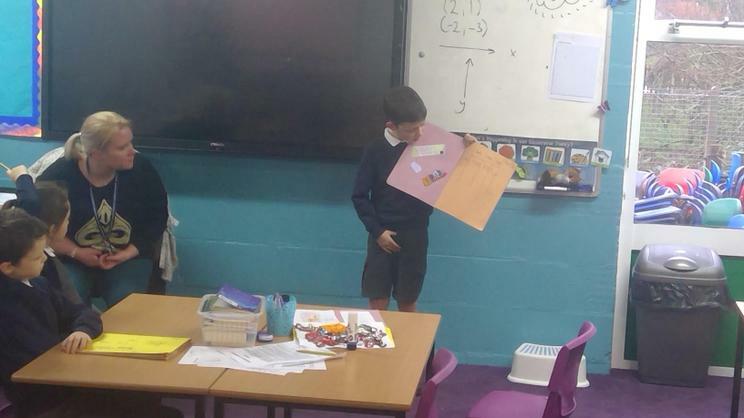 He also requested that we write up a set of instructions to explain to the Oompa Loompas on how they need to make the chocolate. 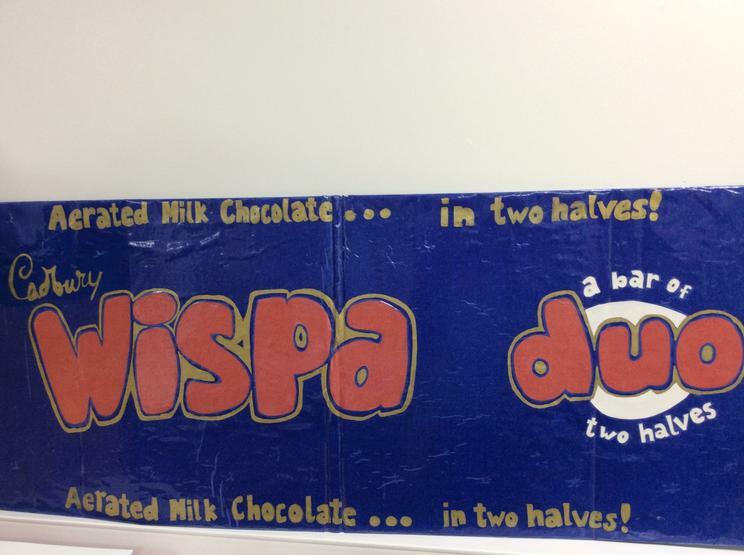 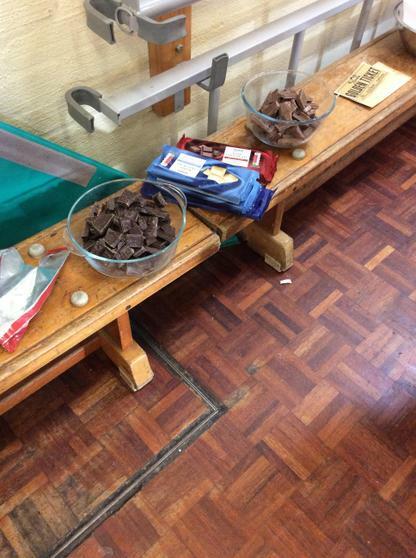 Watch this space...it's about to get very chocolatey! 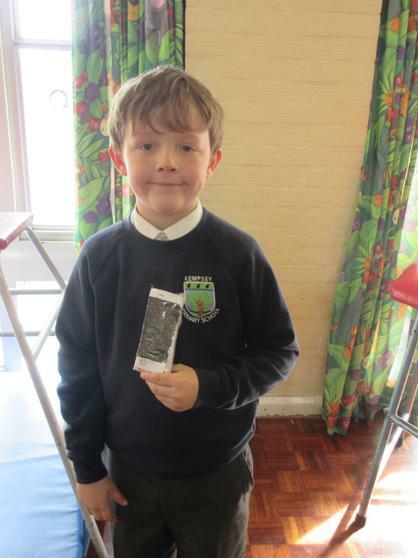 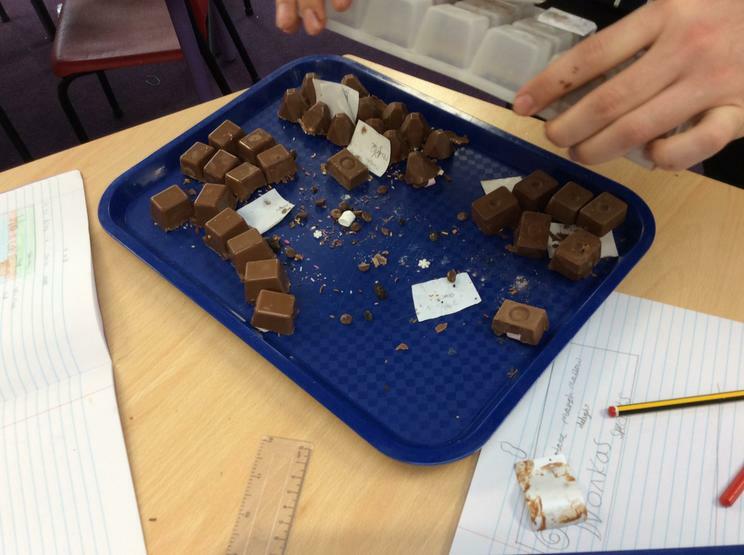 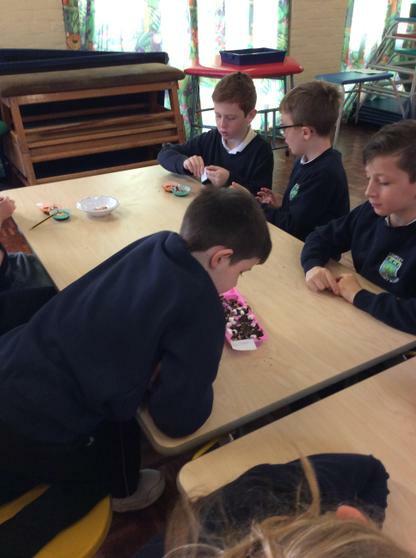 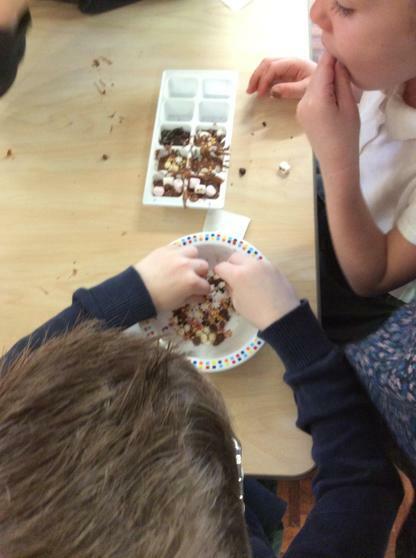 We all had a fantastic day yesterday making our chocolate bars and wrappers. 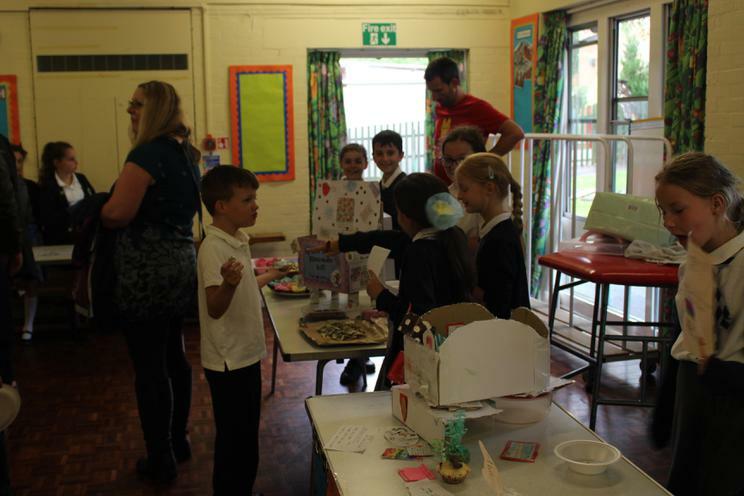 We had a wonderful display at the end of the day and the whole school came in to see the creations we had made. 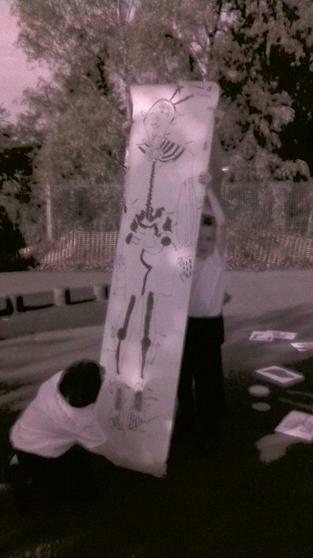 The children should be very proud of themselves...we certainly are! 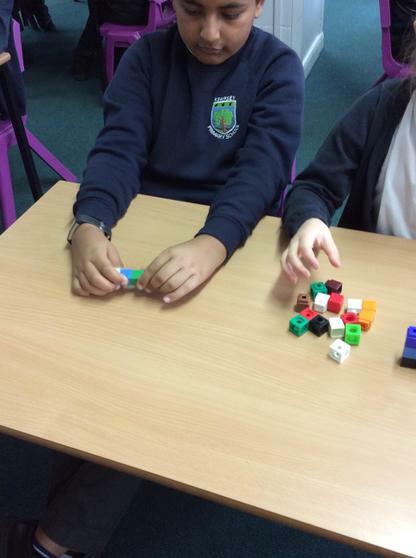 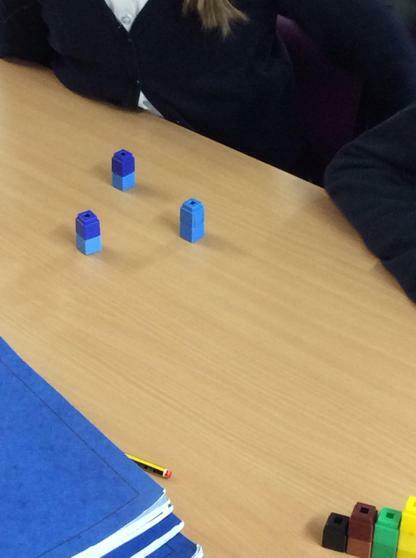 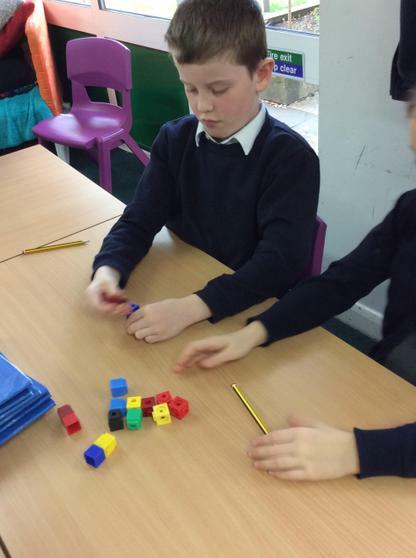 In our Maths lesson, the children used multi-link cubes to work out fractions of amounts. 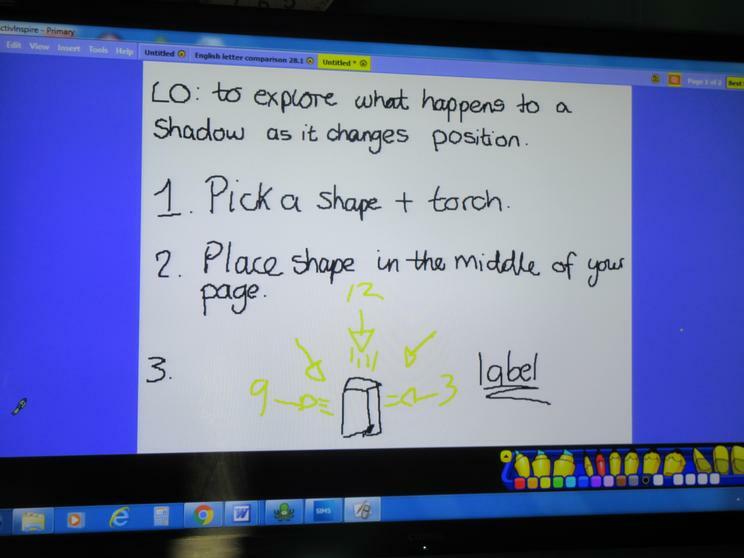 We placed some questions on the board for children to answer using their concrete apparatus. 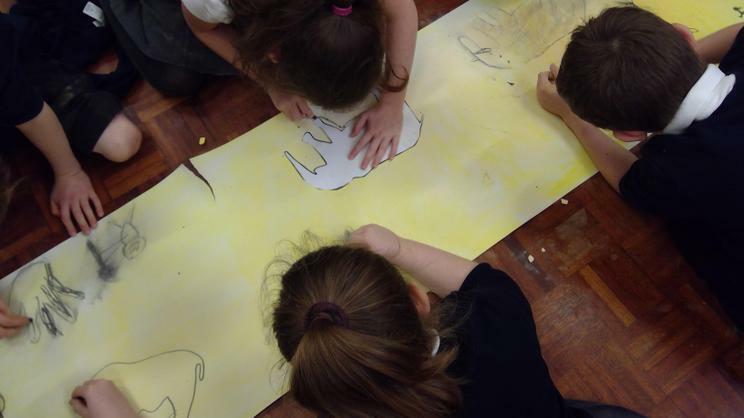 In Art this afternoon, the children sketched a landscape and then used watercolours to transform it into a beautiful and colourful piece of art. 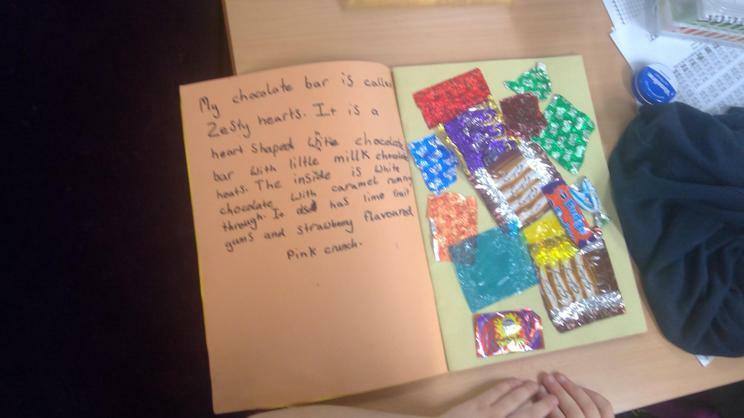 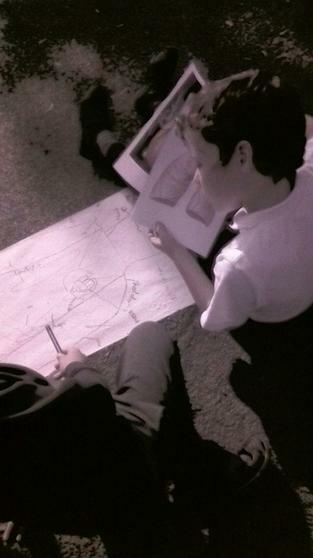 Each child's work was unique and they worked very hard to ensure that there was depth and distance in their pieces. 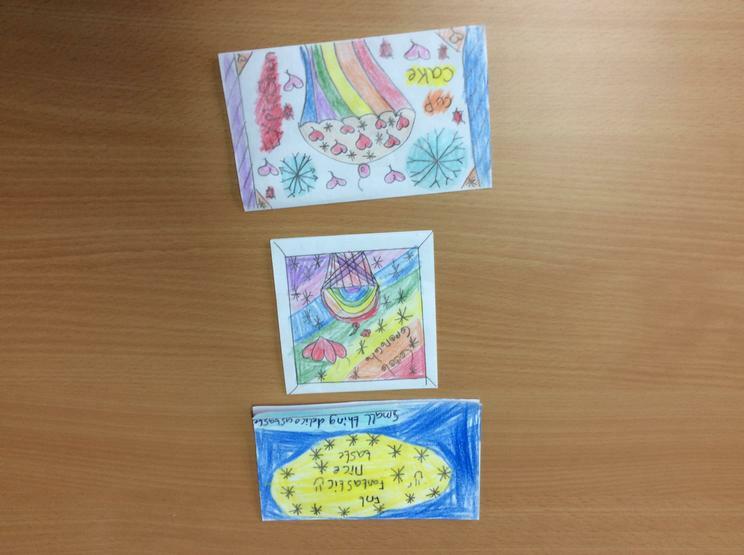 Here are three examples of the incredible artwork produced. 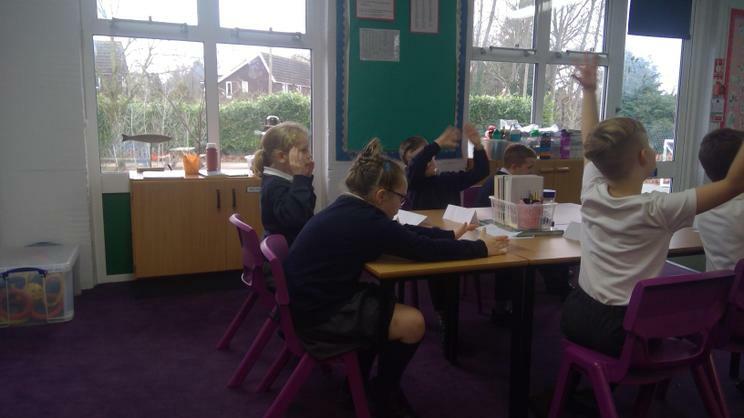 As of Monday 12th November 2018, Oak class will be moving into the old Willow classroom. 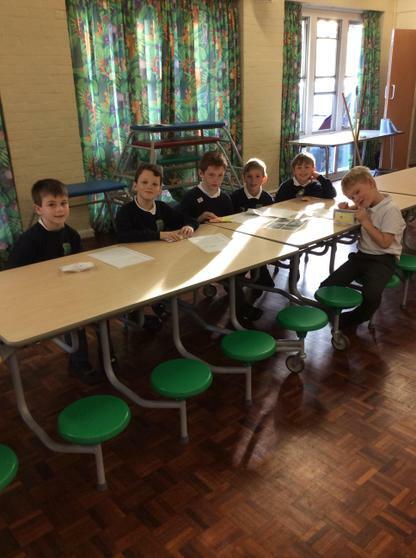 This is due to building works taking place. 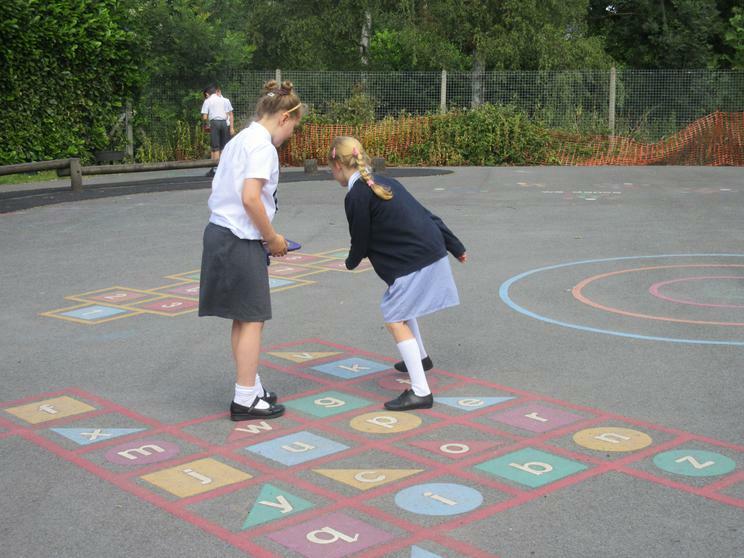 Please can you drop children off outside of old Willow or on the large playground. 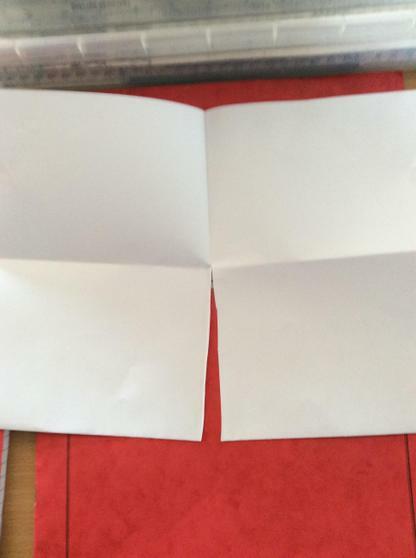 Collection is the same. 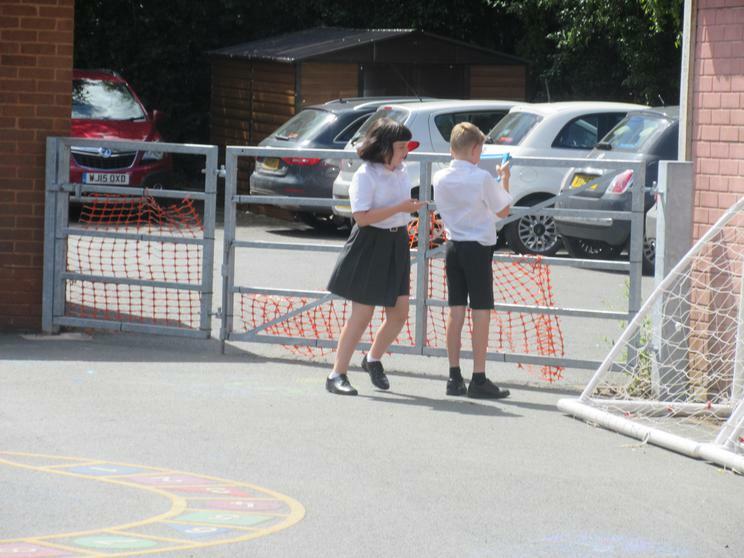 Please can I ask you to stand near the pathway to old Willow classroom (by Laurel) so that I can see parents clearly when dismissing at the end of the day - thank you. 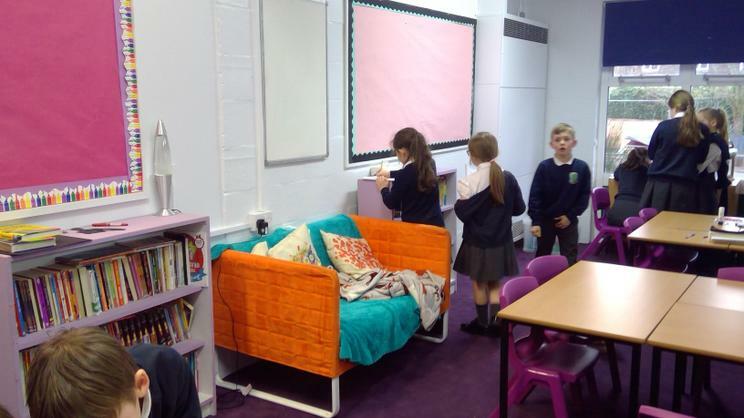 We are very excited to see our new classroom developing and changing into a fantastic new learning environment! 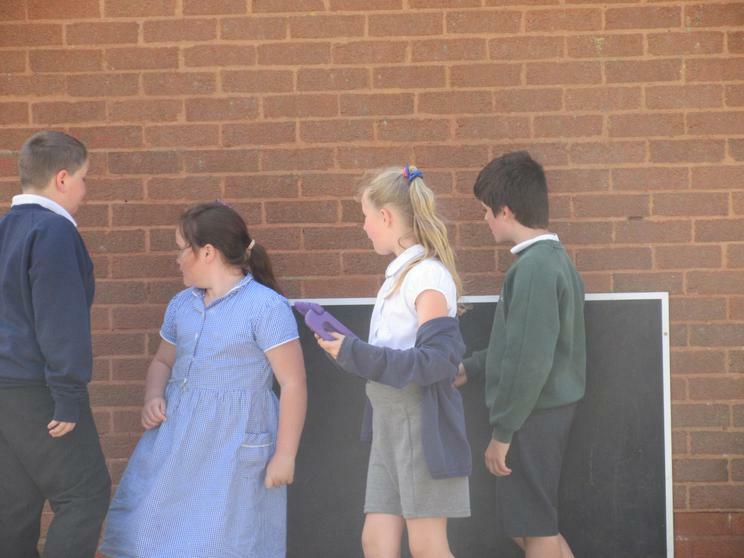 Thank you for your patience whilst this is ongoing. 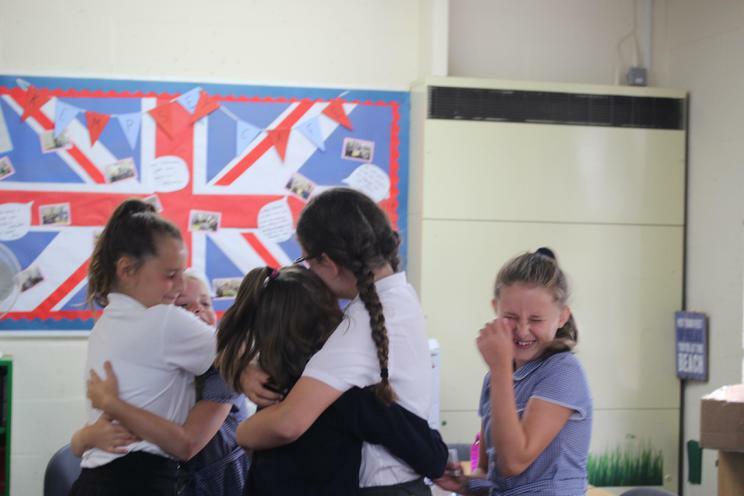 A warm welcome back to the second autumn half term - we have got lots planned for the children and are looking forward to the exciting activities ahead! 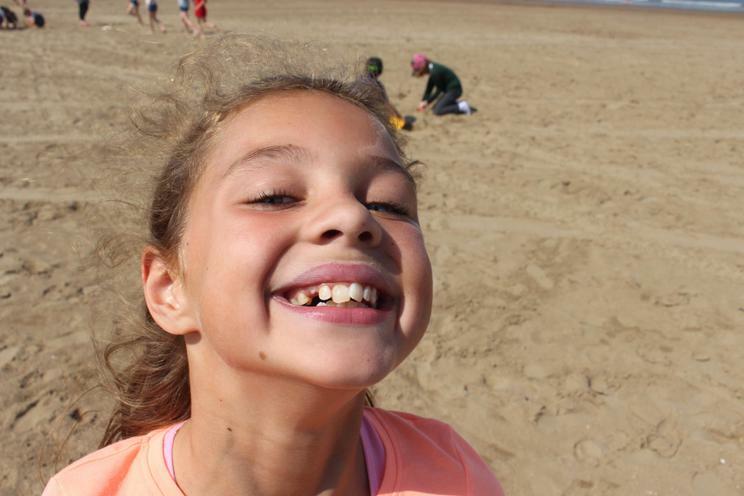 We hope you all have a wonderful half term break! 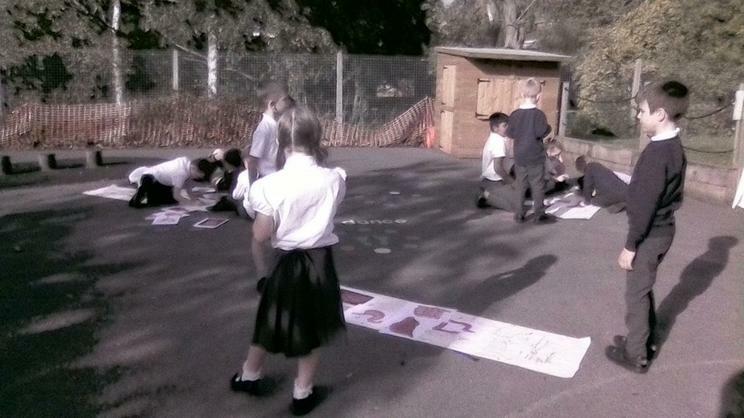 Today we sketched, coloured and shaded in leaves. 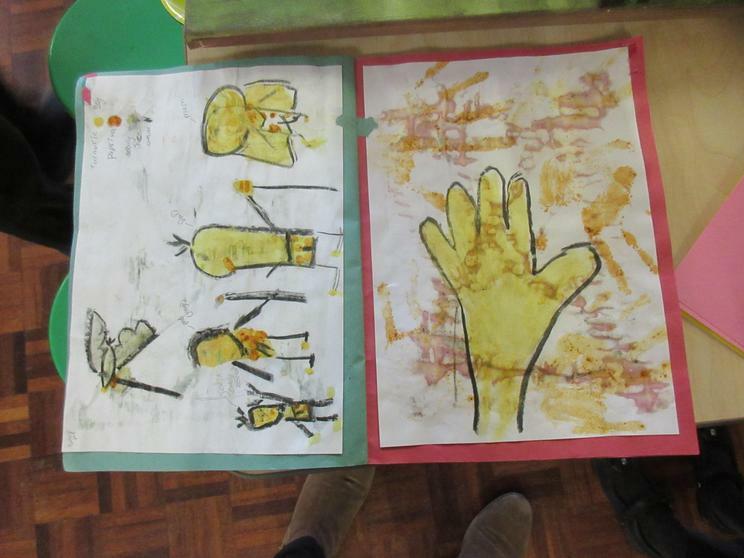 The end result was fantastic and the children had used colour with oil pastels effectively. 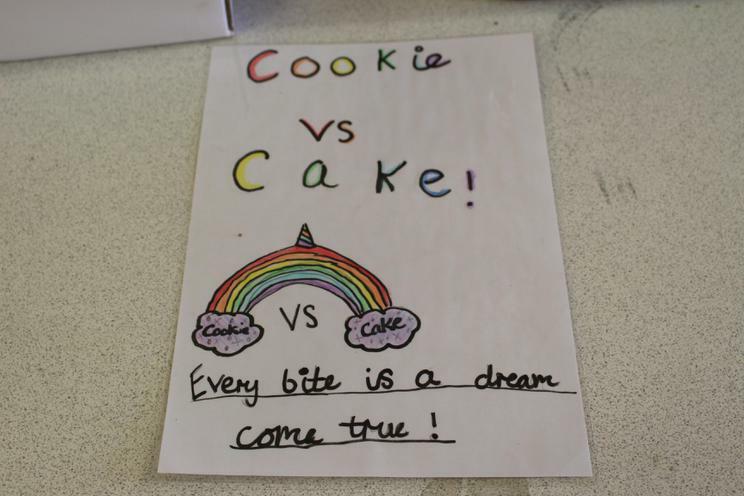 We hope you agree! 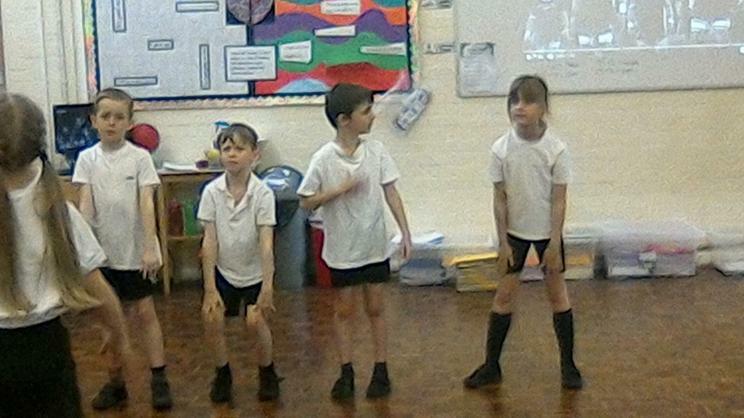 Today, the children had their last lesson on the Haka. 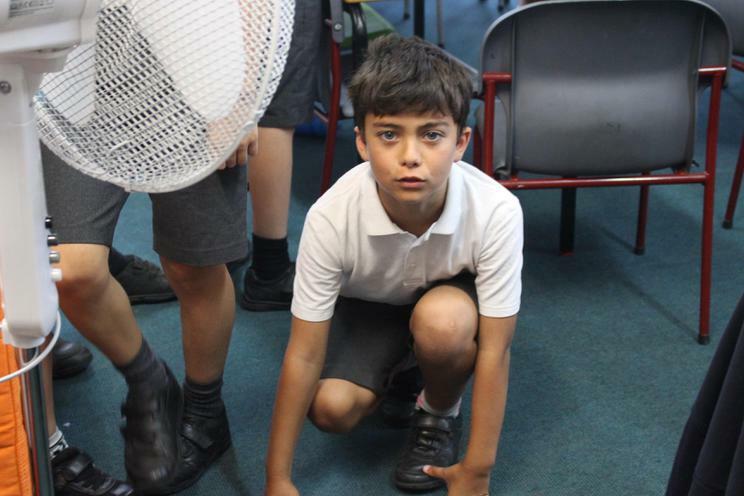 They were split into their three groups and each created their own 'Ka Mate' Haka, using a themes of Halloween, Bonfire Night and Marvel. 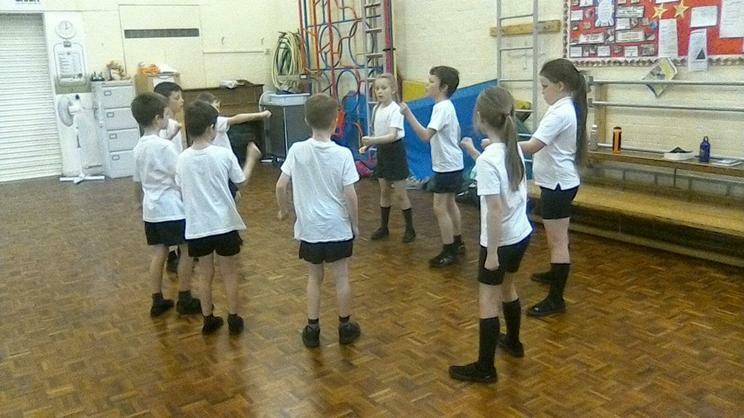 The children included their own chants as well as their own movement alongside the Ka Mate Haka moves. 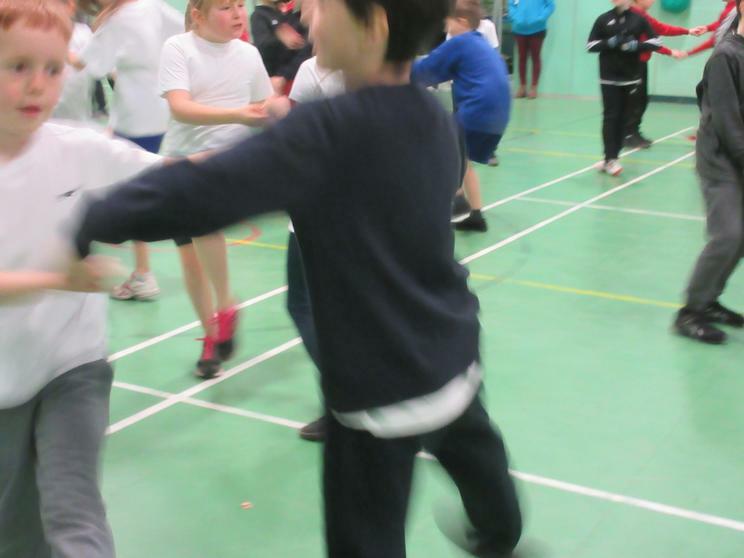 The children did fantastically and took the dance seriously - the end results were brilliant! 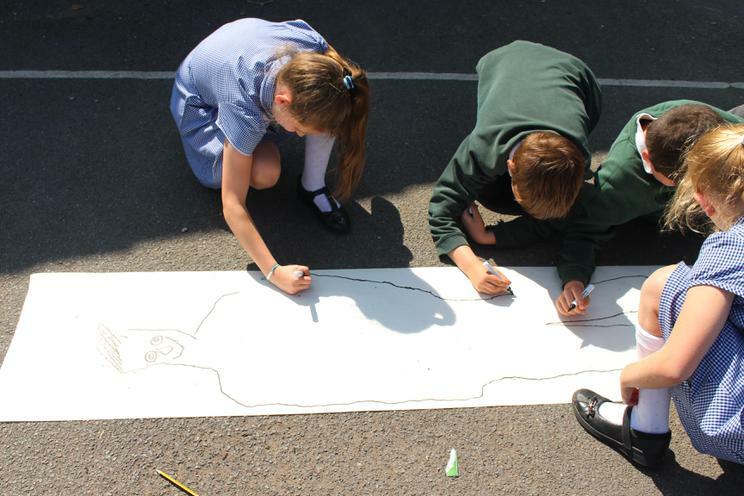 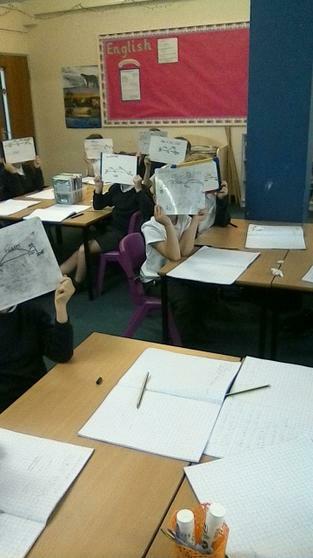 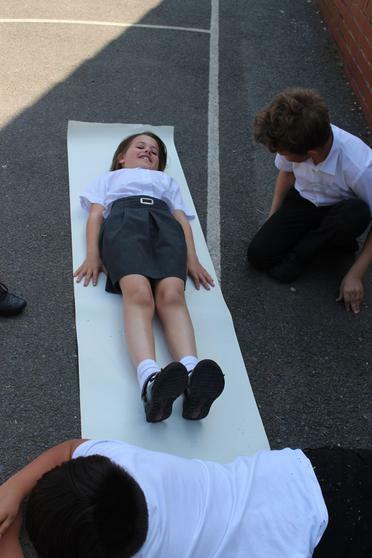 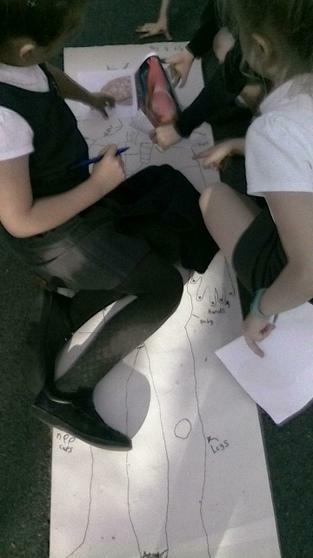 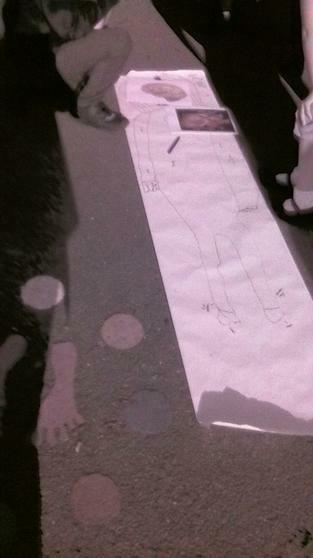 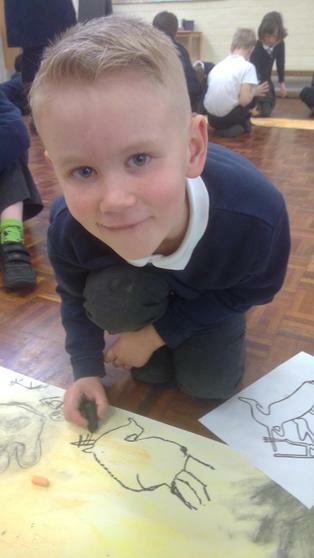 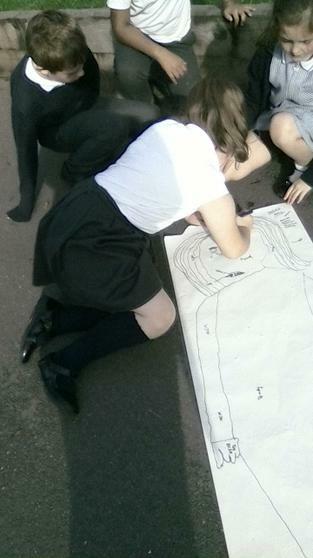 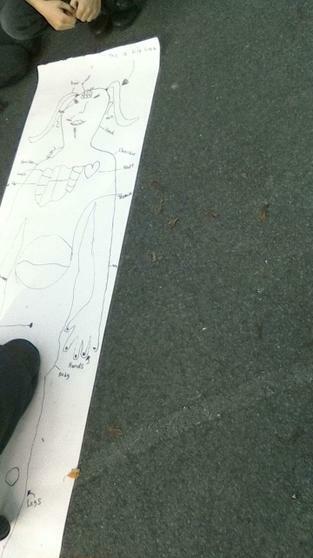 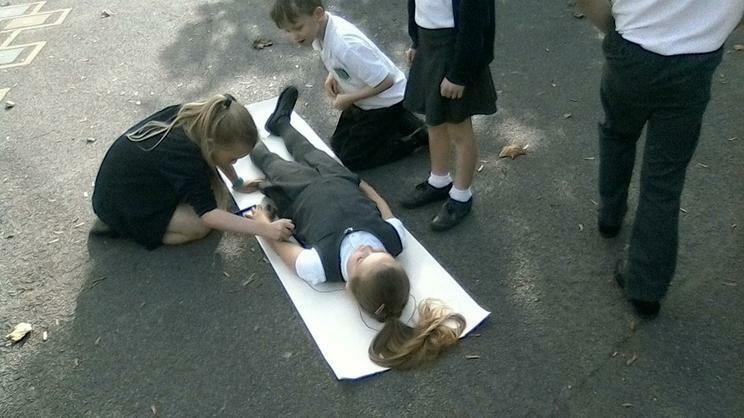 In Science, we have started looking at the topic of animals, including humans and the children started this topic off by drawing around one of their classmates to get an outline of a body. 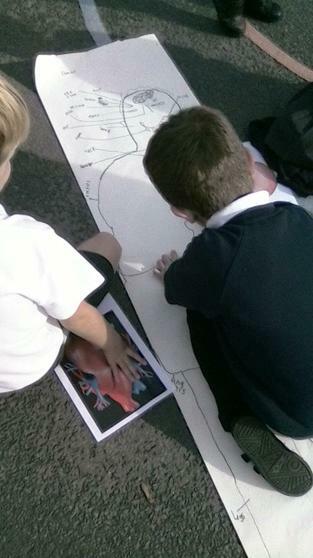 then, as a group, the children labelled the diagram with the parts of the body the knew, including fingers, toes and heart. 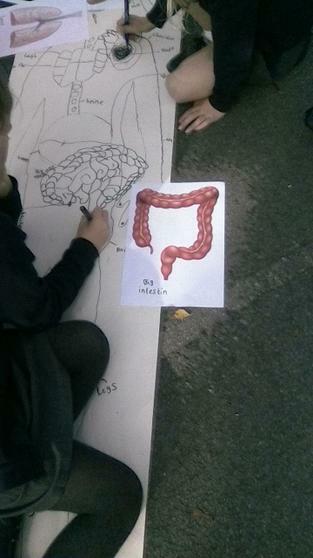 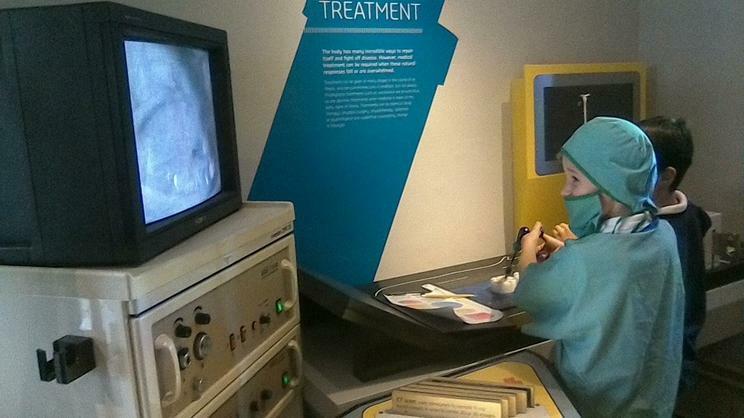 Then we provided children with images of the liver, lungs, small and large intestine for the them to think logically about where they would be positioned in the body. 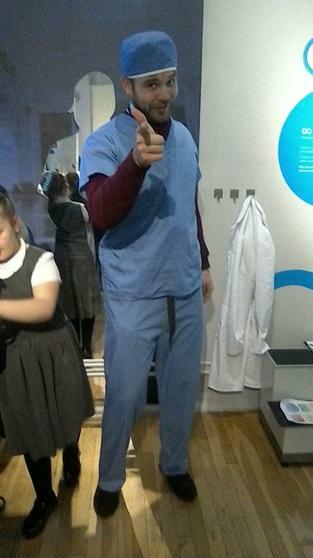 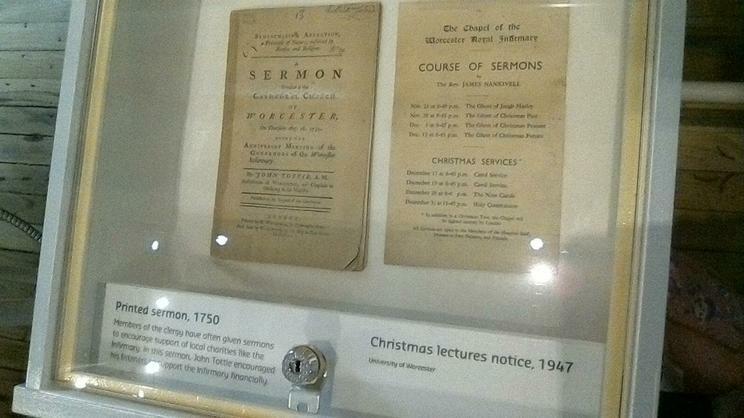 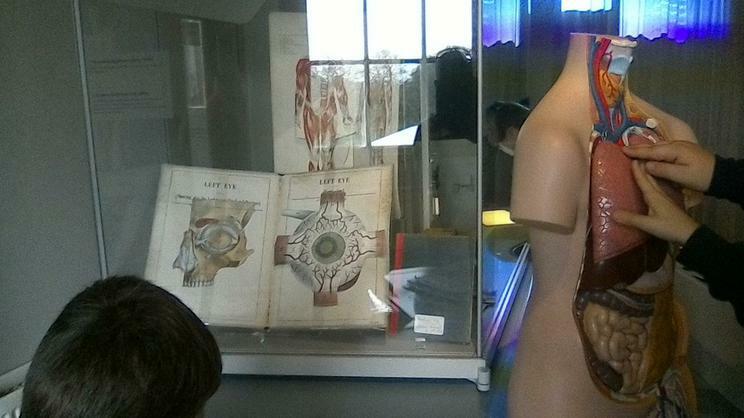 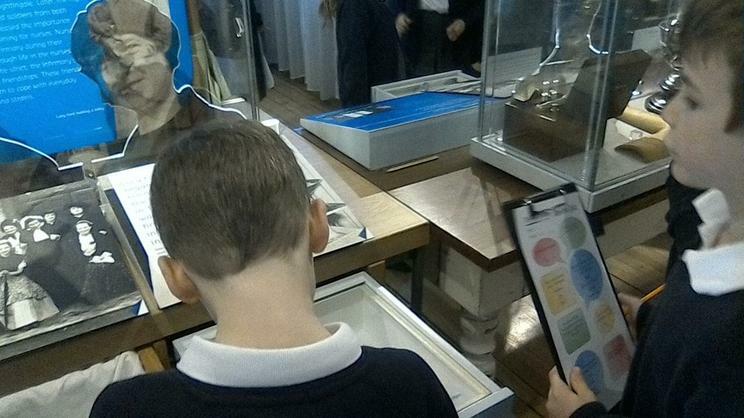 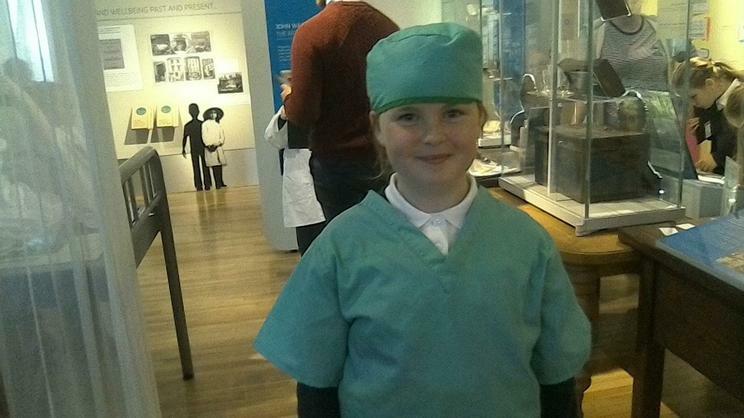 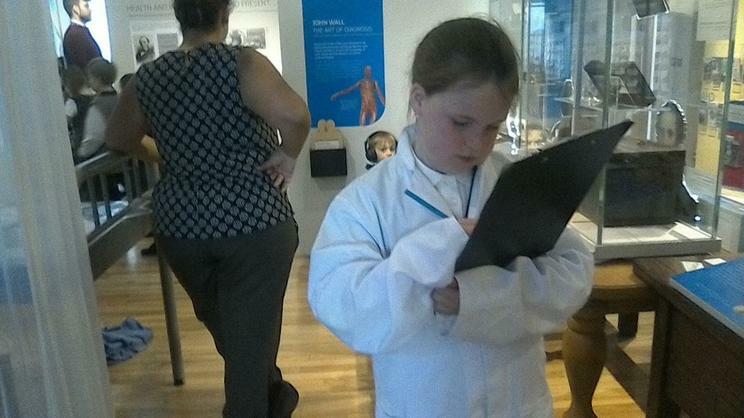 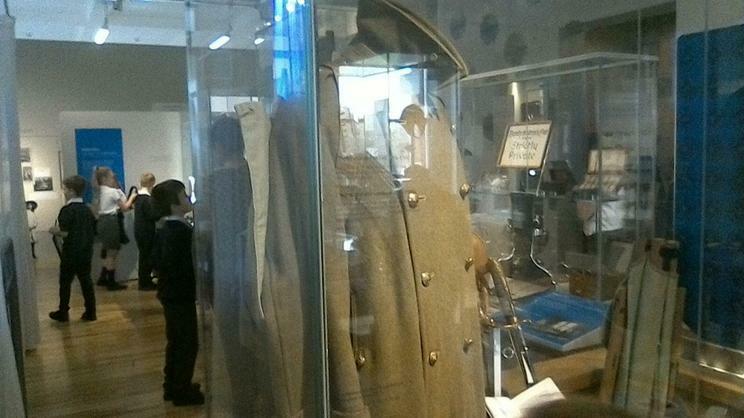 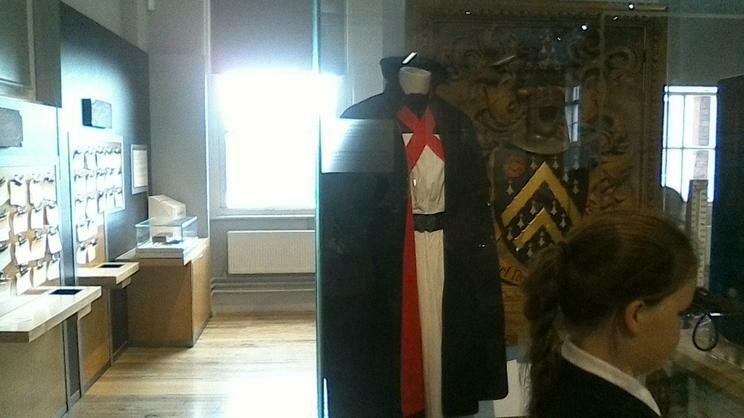 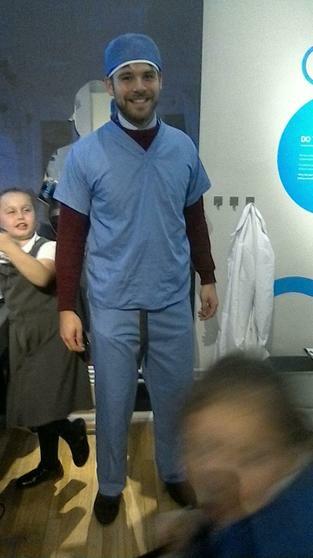 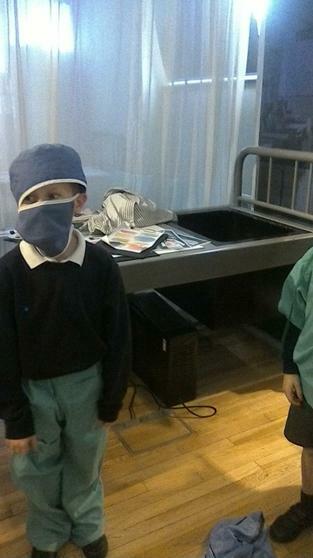 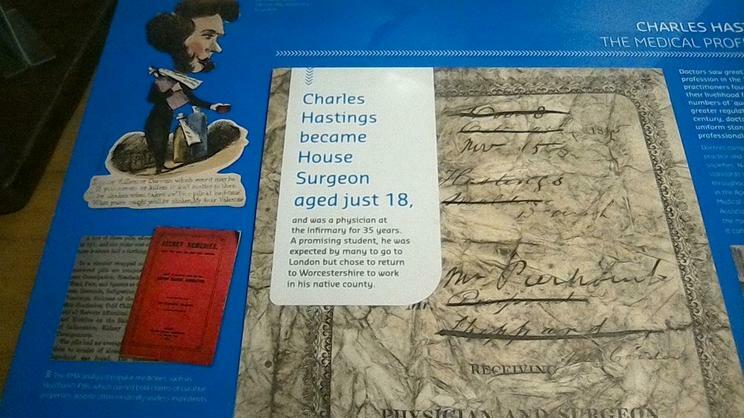 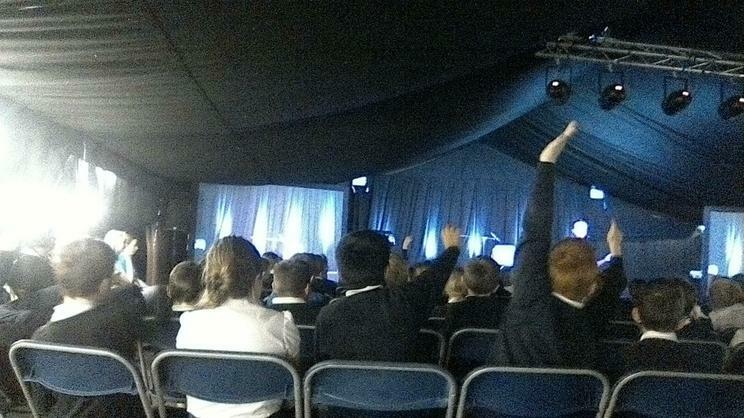 We have had a fantastic day out at the University of Worcester where we have had a tour around the Infirmary Museum, completed a search and find sheet and had a wonderful time listening to the author, Steve Cole, telling us all about his books, his desire to become an author as well as his inspiration: superheroes! 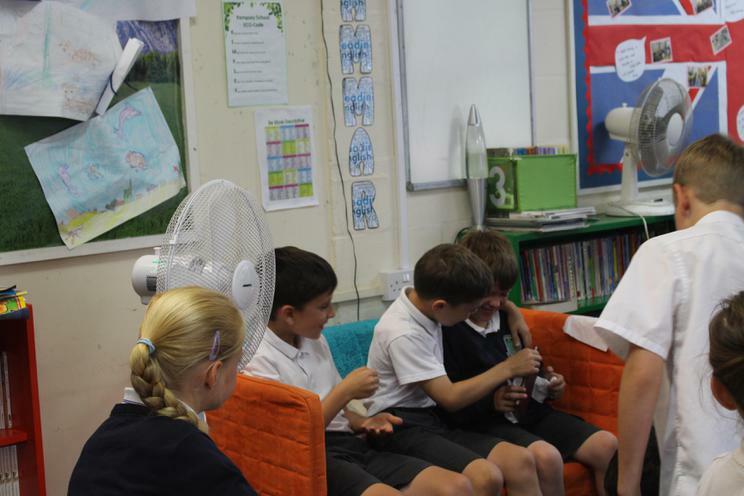 The children were engaged throughout the day and asked Steve some thought-provoking questions about his career and inspiration for writing. 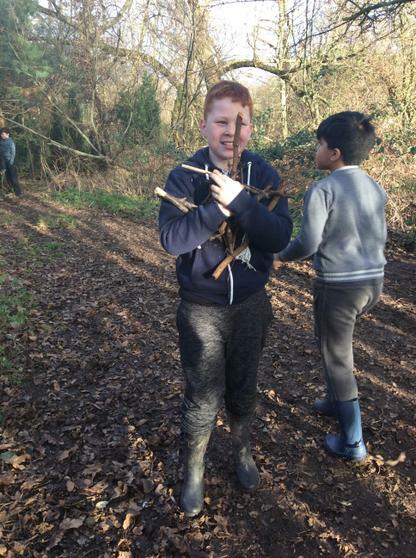 It's been a great day out! 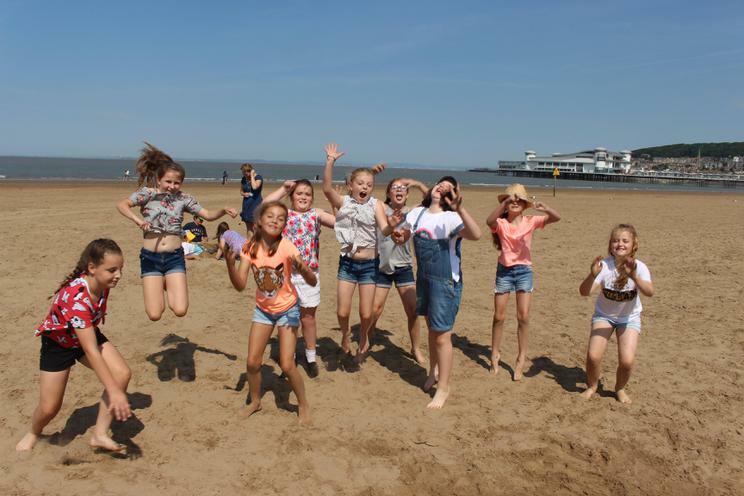 Please can we remind parents to send their children in with coats, a packed lunch and a bottle of water tomorrow for our University of Worcester trip. 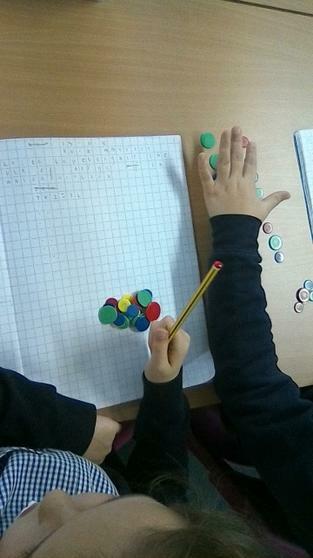 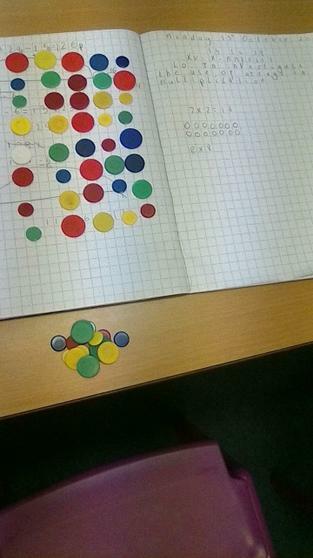 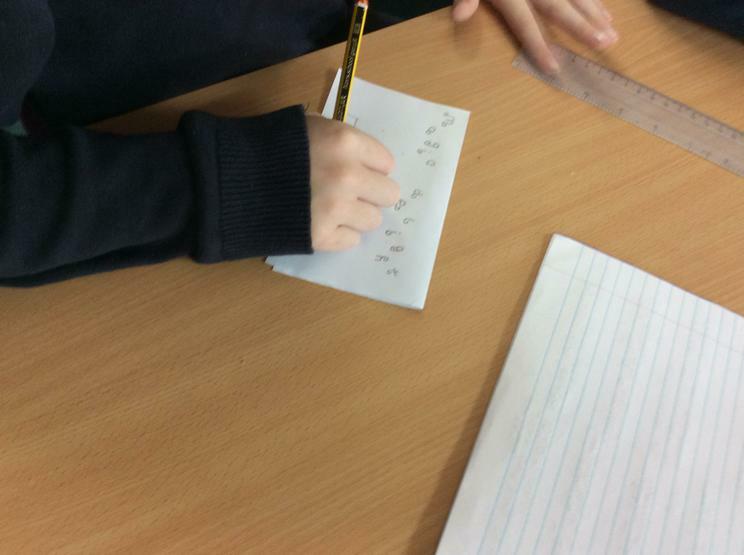 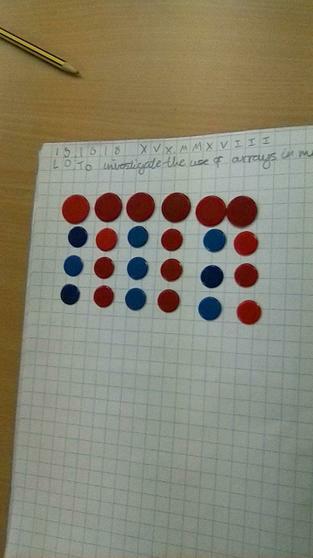 Today, in Maths, the children were using counters and arrays to help them multiply one-digit numbers. 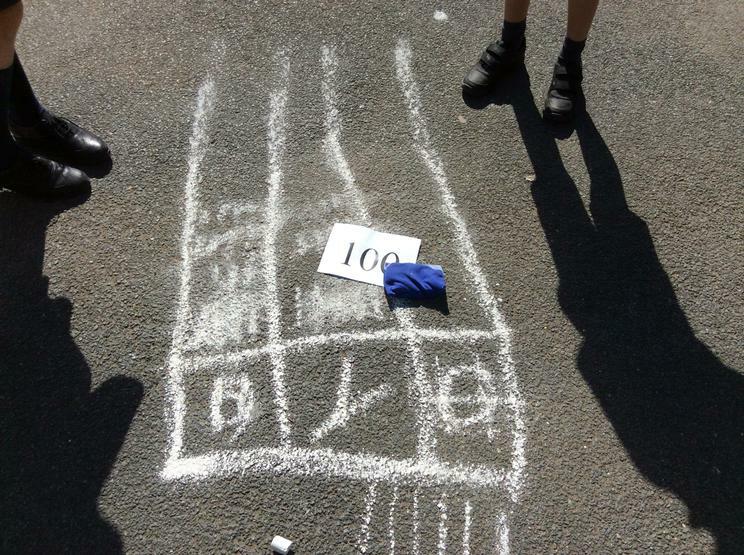 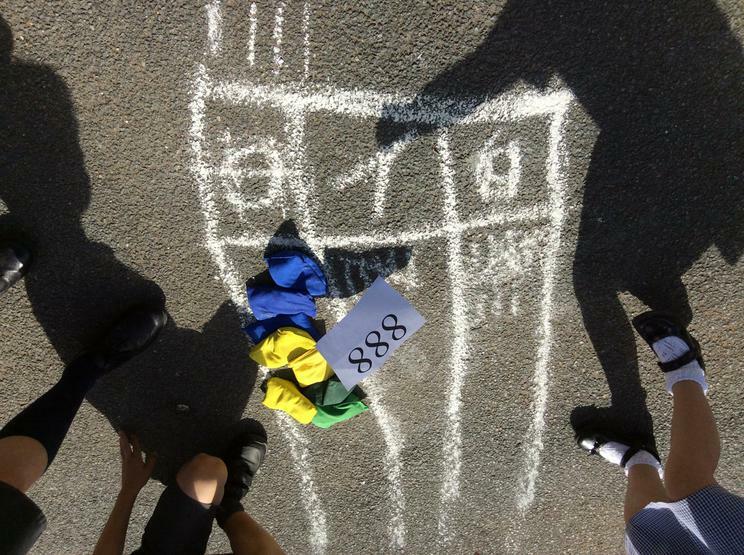 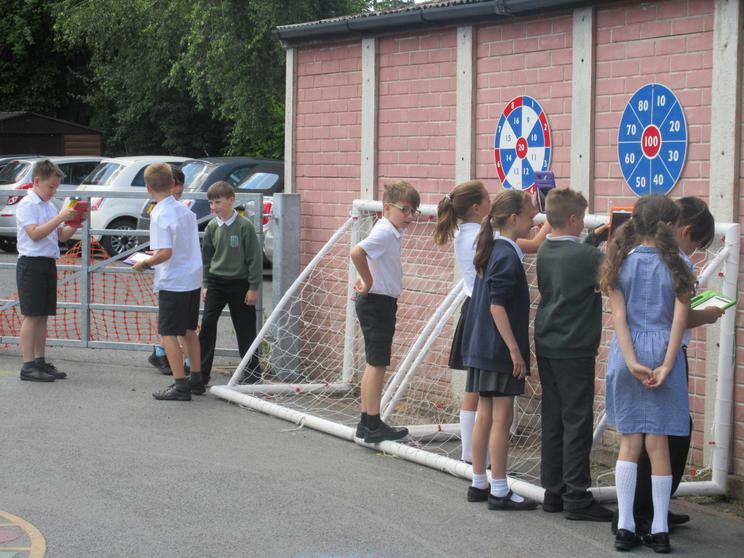 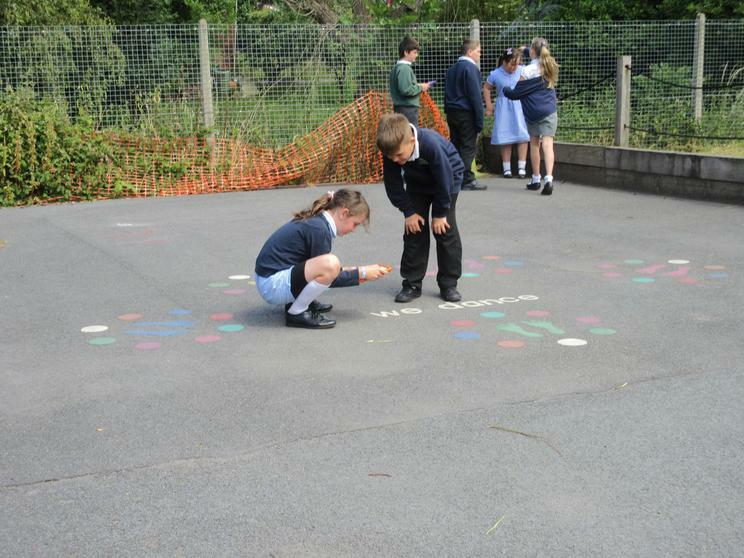 We used the concrete apparatus so that the children could see the number they had in total. 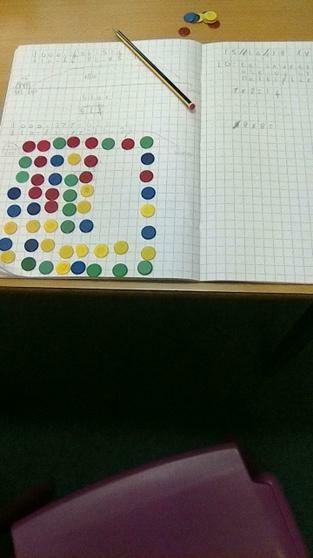 The children worked exceptionally well and were able to produce arrays with both the concrete apparatus and drawn in their books. 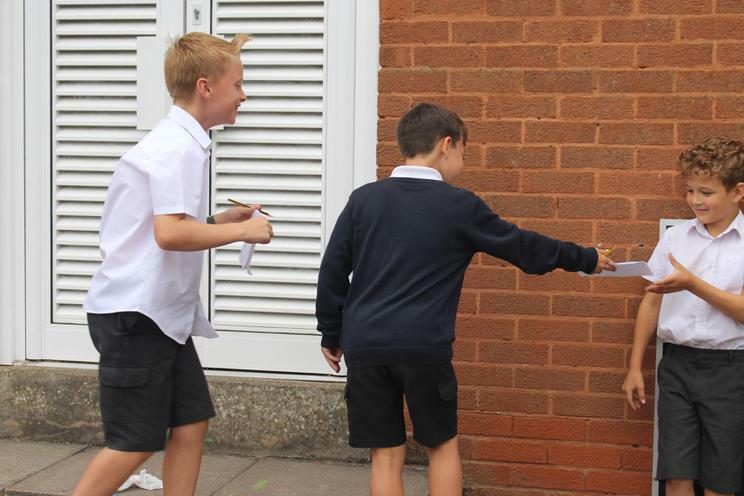 Children can come to school in non-uniform for a £1 donation. 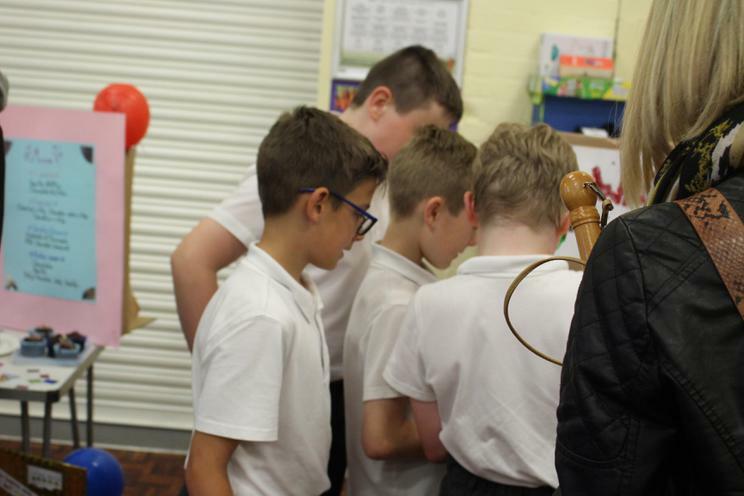 We're raising £5,000 to purchase a giraffe from Worcester Stands Tall Live Auction in memory of Rev Canon Matthew Baynes to be homed at Kempsey Primary School. 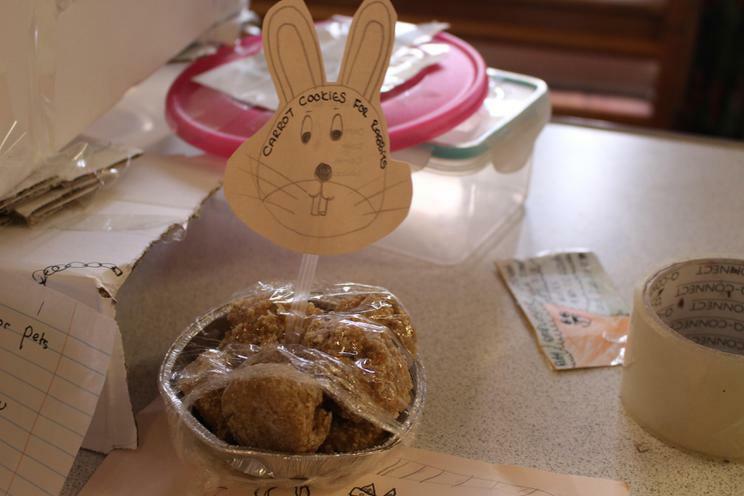 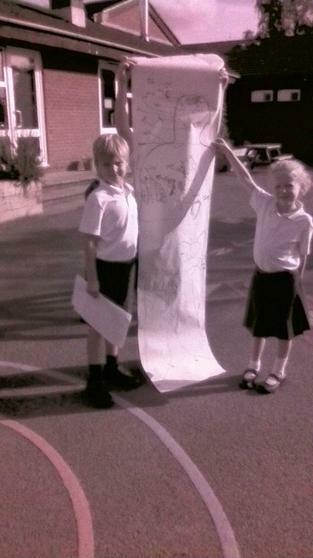 We are raising money to home a giraffe at Kempsey Primary School in memory of Rev Canon Baynes. 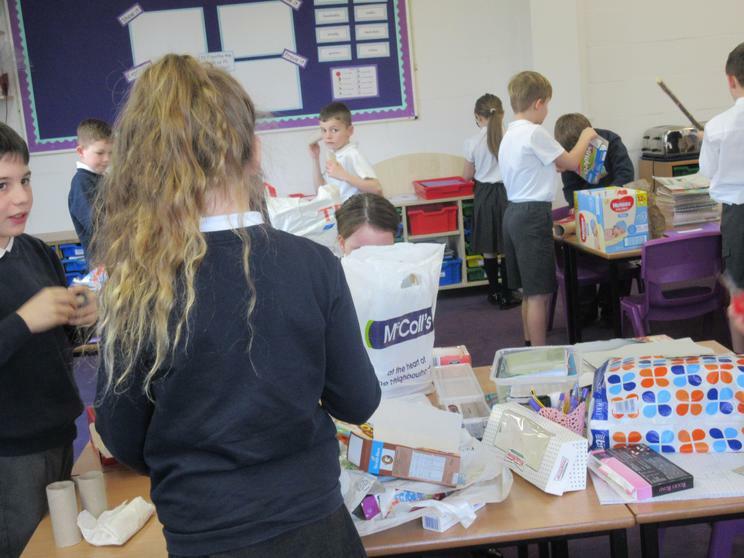 Please find the link below if you would like to donate. 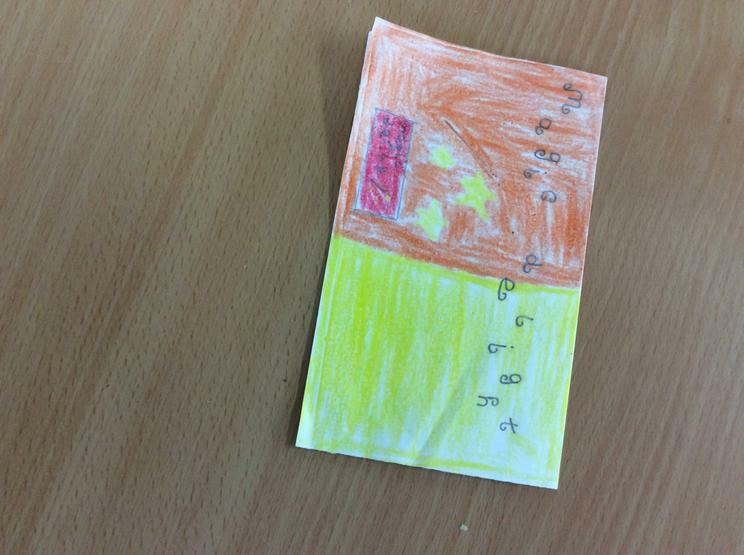 Unfortunately, due to a technological issue, we have not been able to print off the Maths homework. 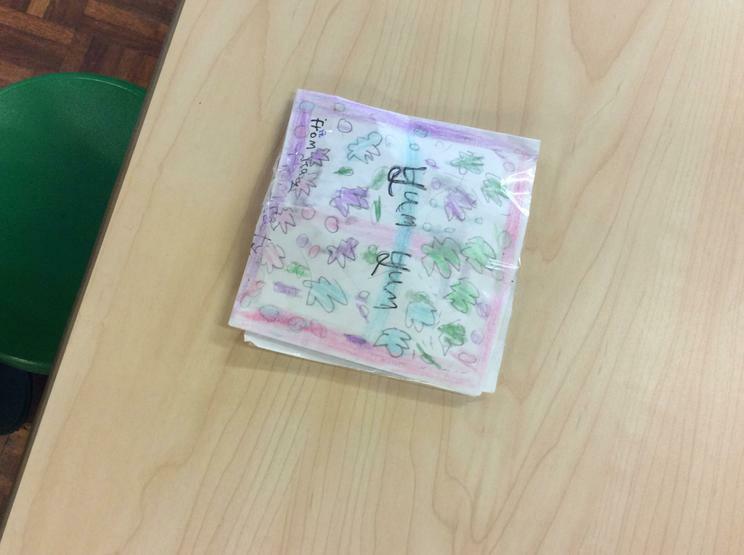 We are sorry for the inconvenience and will get this to you on Monday 8th ready to be handed back in on Friday 12th. 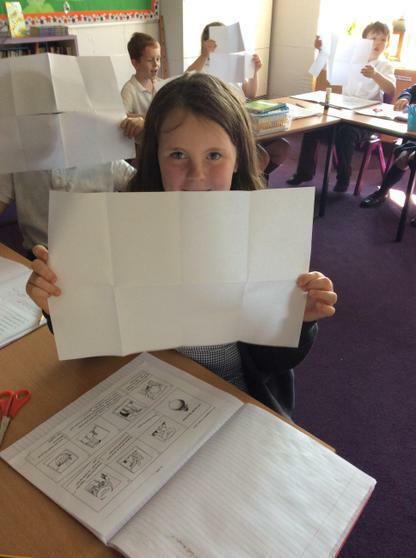 However, please find the homework on this page to print out. 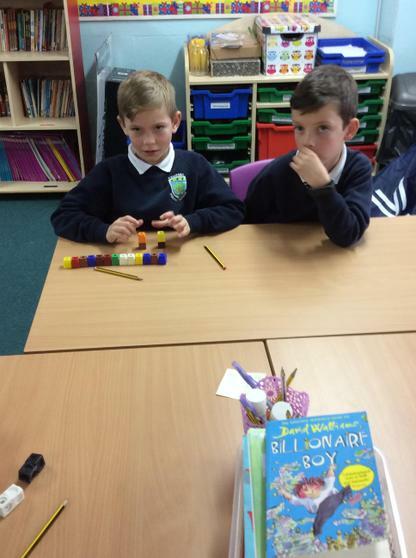 Today, in Maths, we have started looking at subtraction and started the day by answering some questions using the method we preferred. 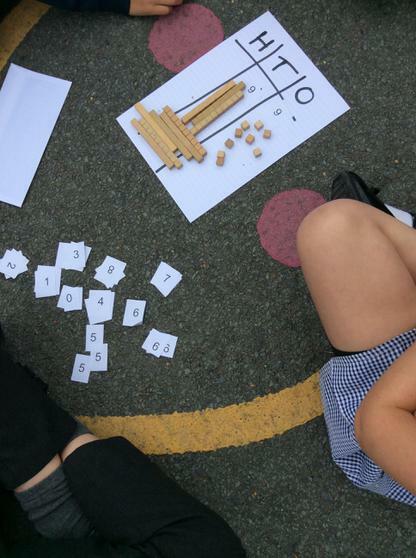 The children did very well and were able to answer their questions using a variety of different methods including mentally and with column subtraction. 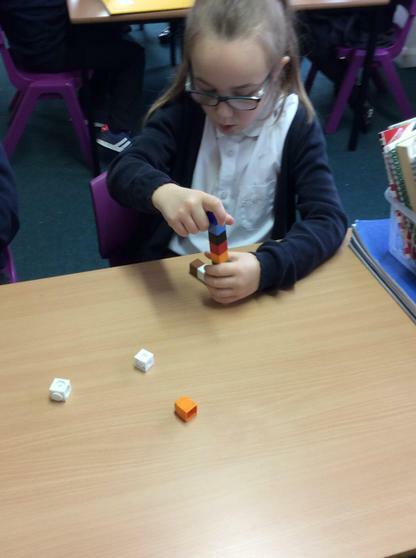 We progressed onto our Maths lesson by showing the children how to subtract by counting on. 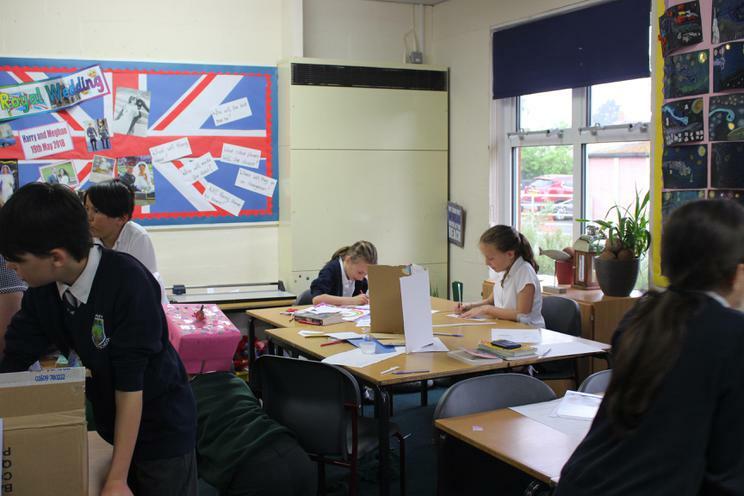 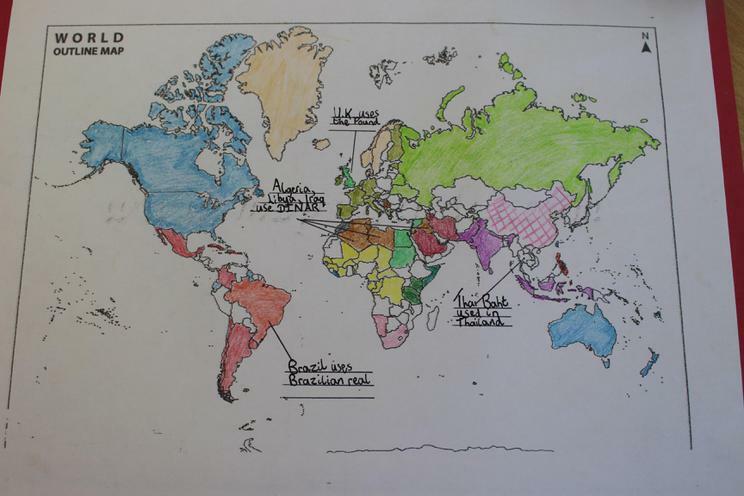 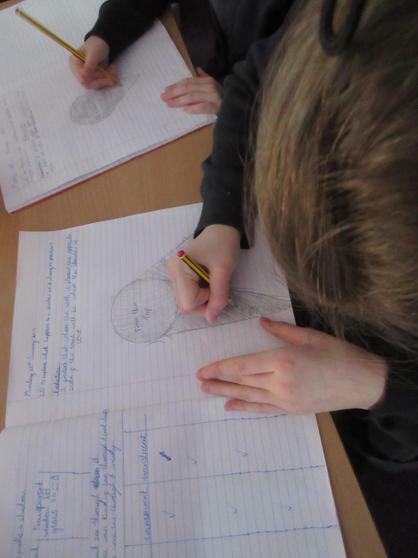 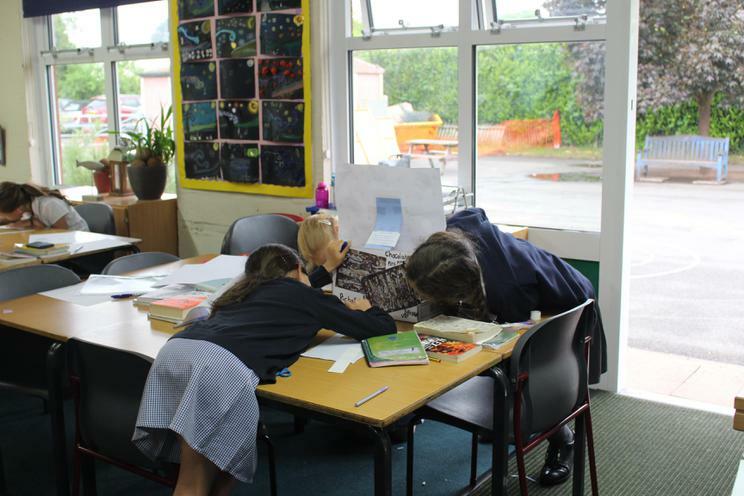 In English, the children have started looking at timelines and chronology. 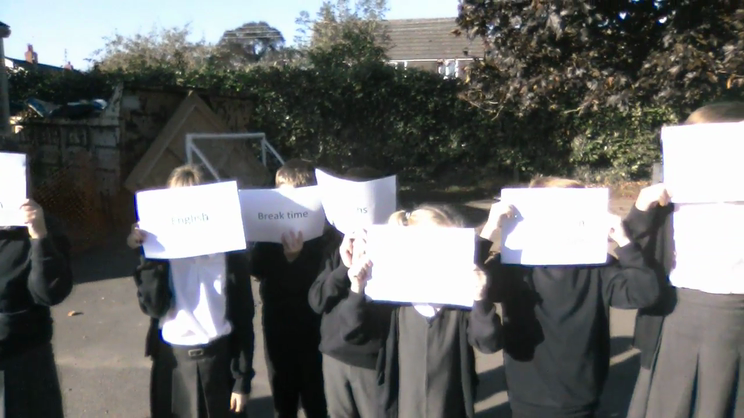 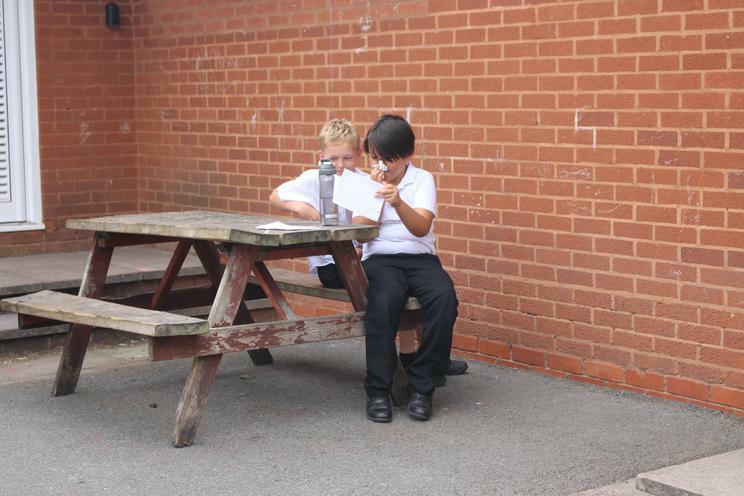 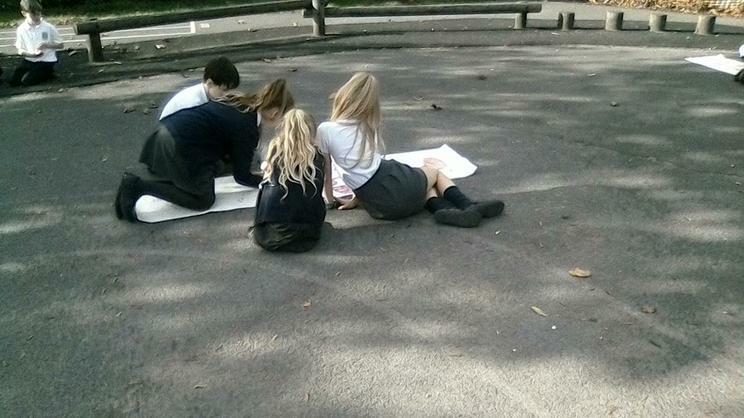 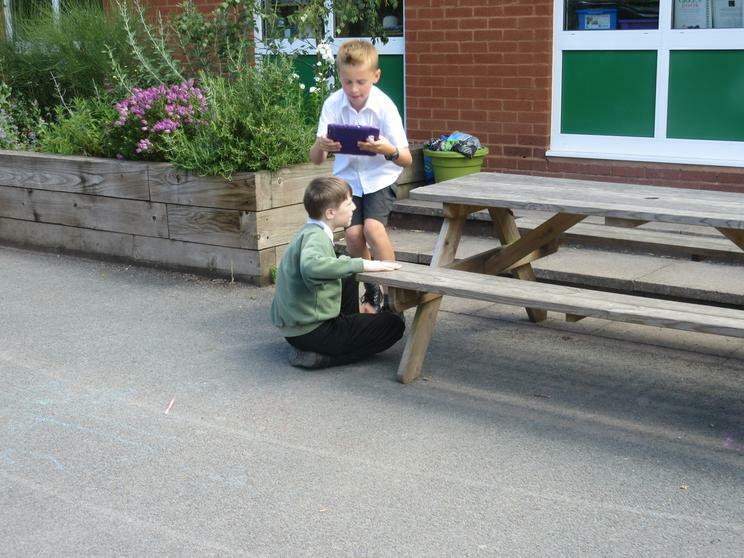 We decided to get outside to place the events given out to the children in order. 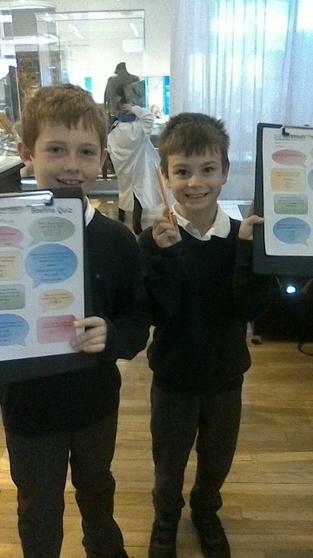 They did really well and managed, first time, to place the events in chronological order on our timeline! 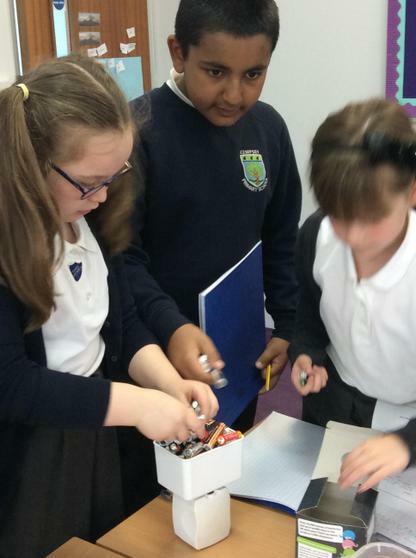 Time to test the circuits! 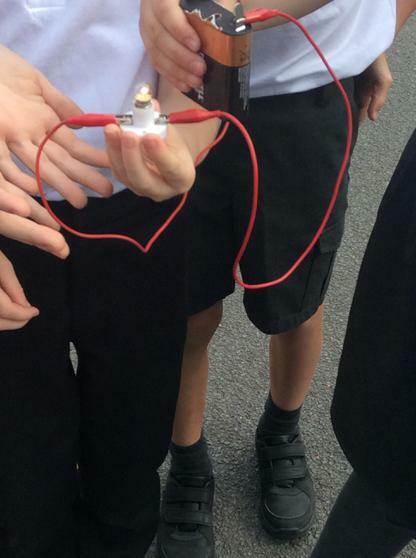 Today, in Science, we provided the children with a selection of circuits.. they had to work as a group to figure out whether the circuit would work or not by testing them out using the correct components. 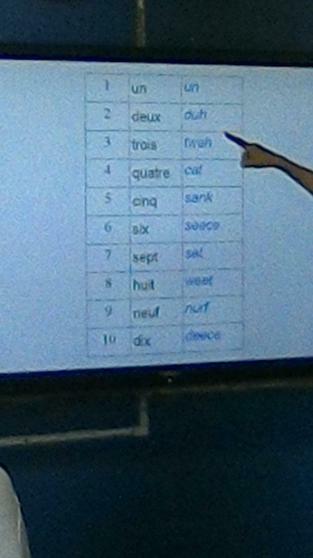 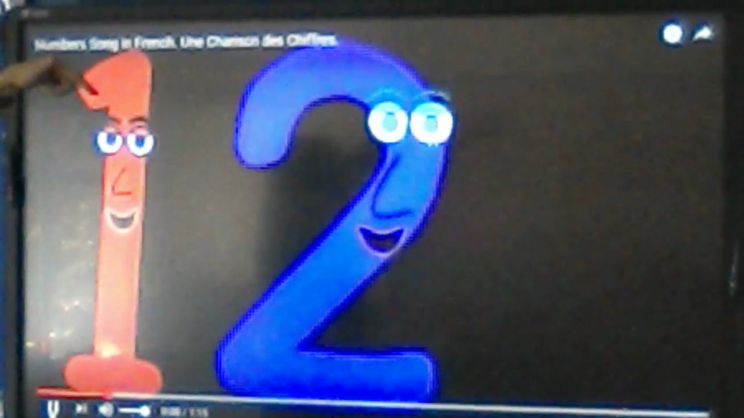 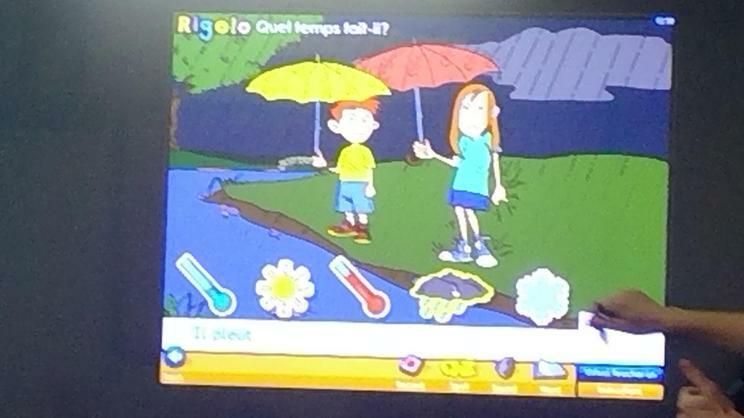 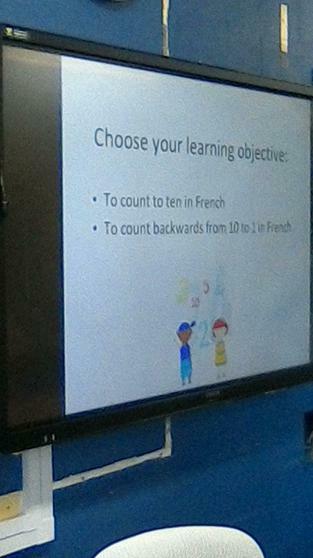 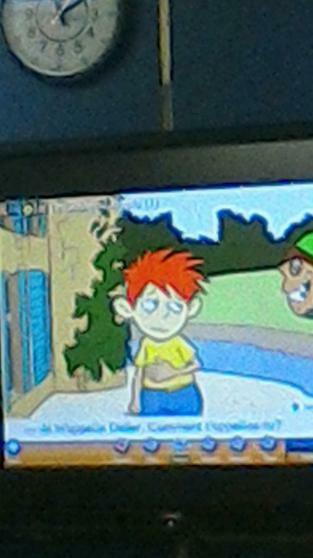 Today, in French, we started to look at numbers and counted forward and backwards in a song. 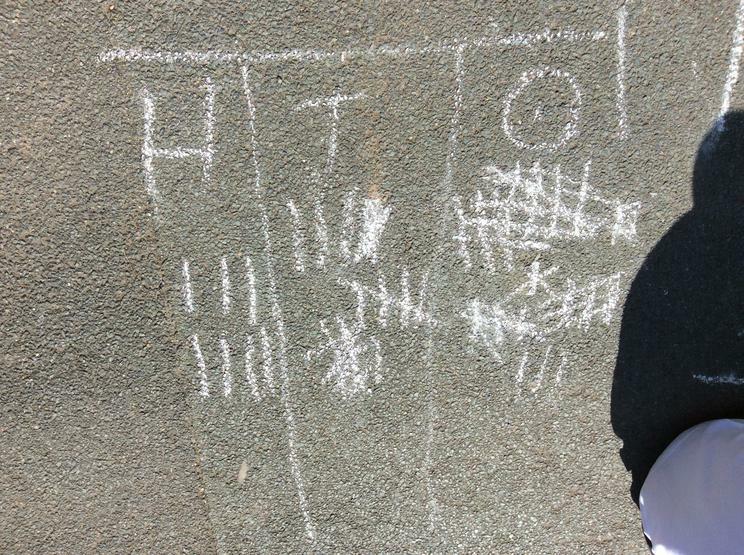 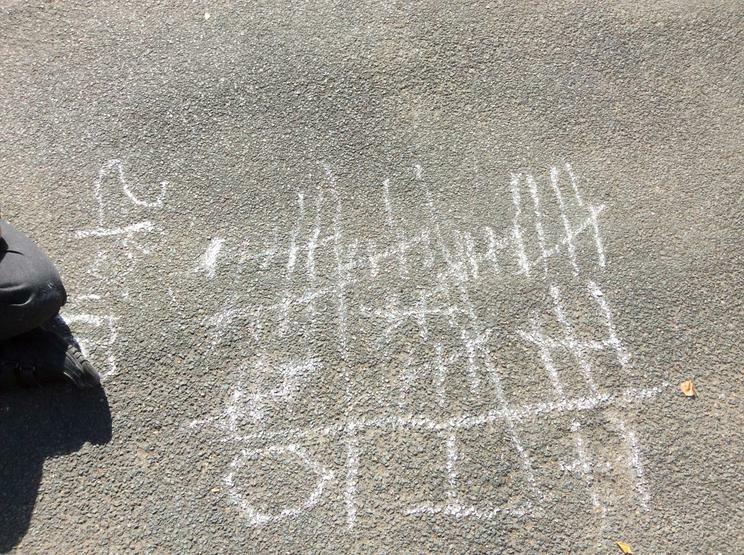 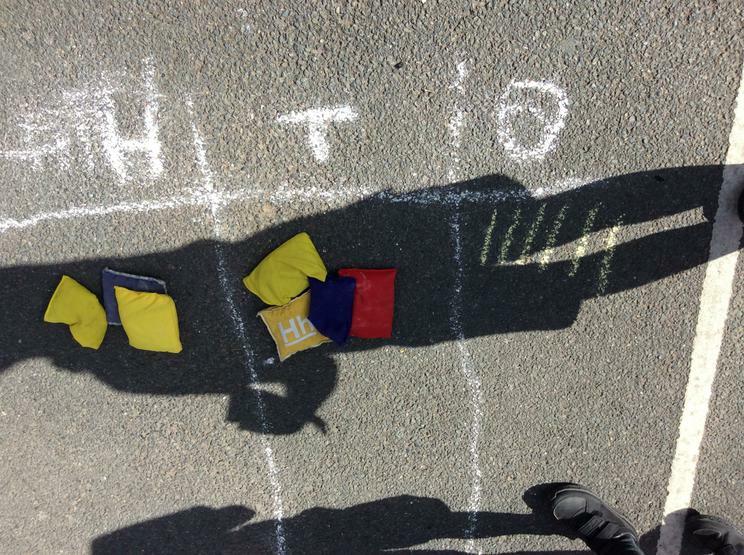 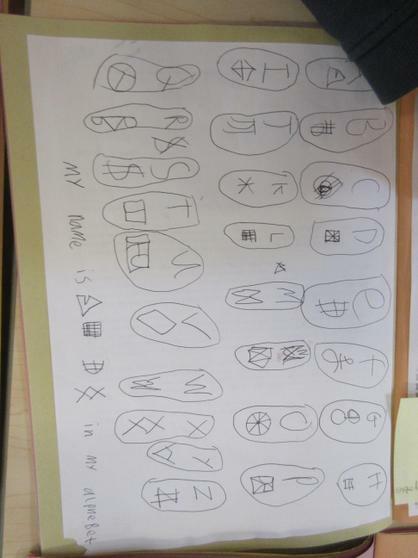 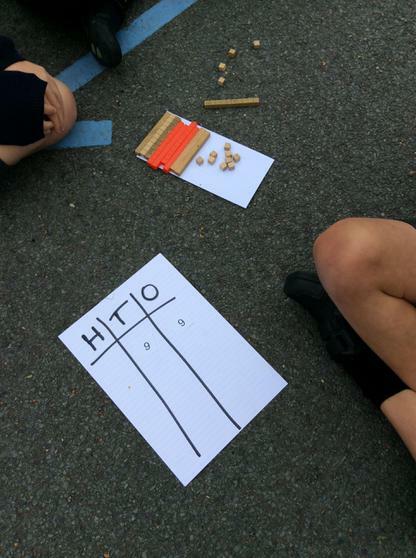 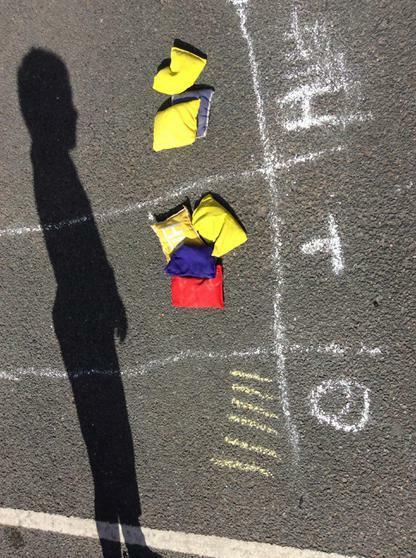 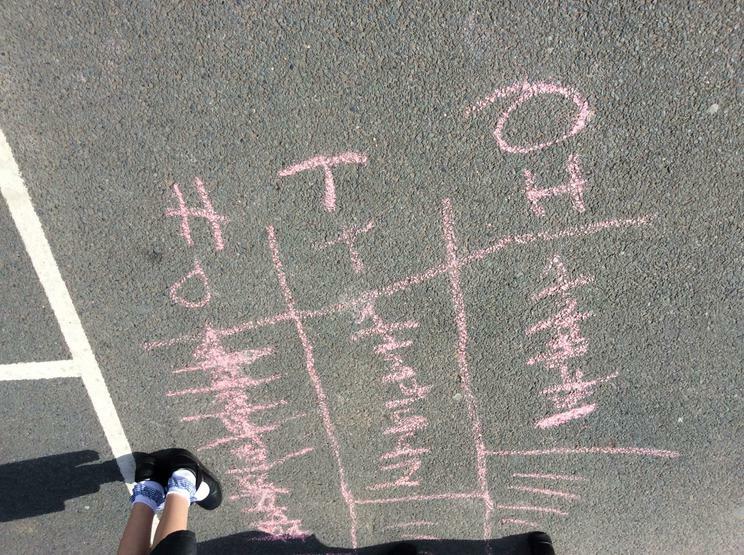 As well as this, we played noughts and crosses - the children did exceptionally well! 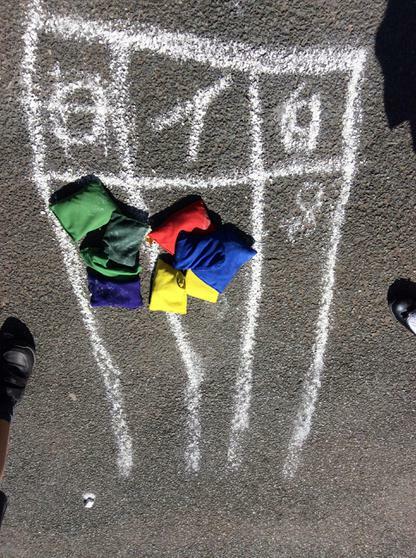 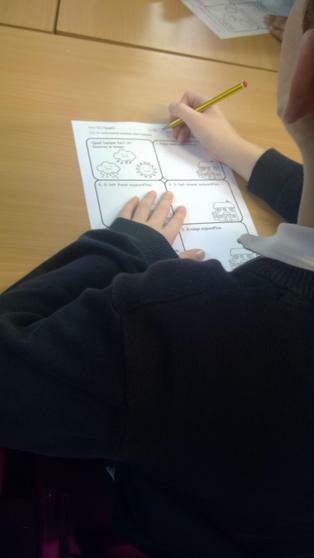 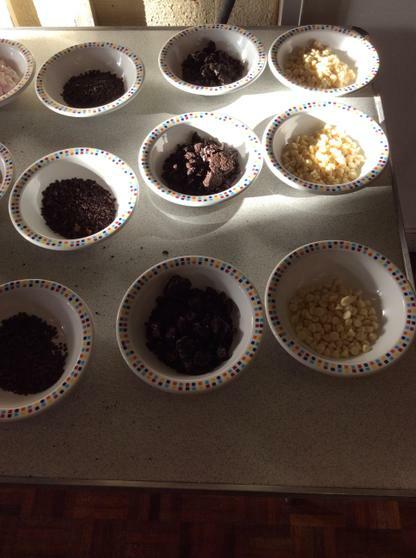 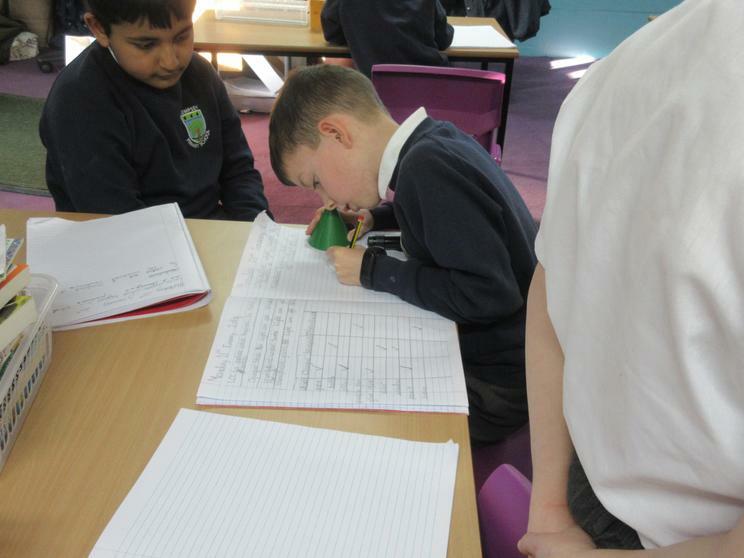 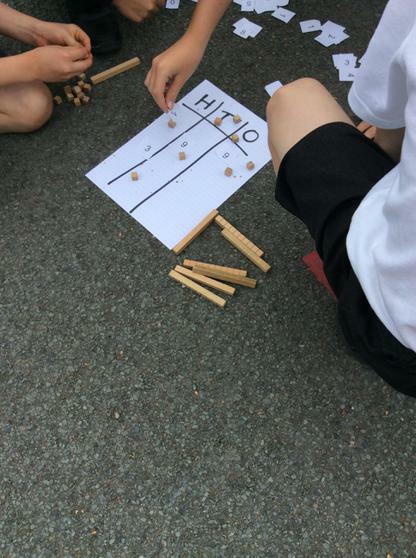 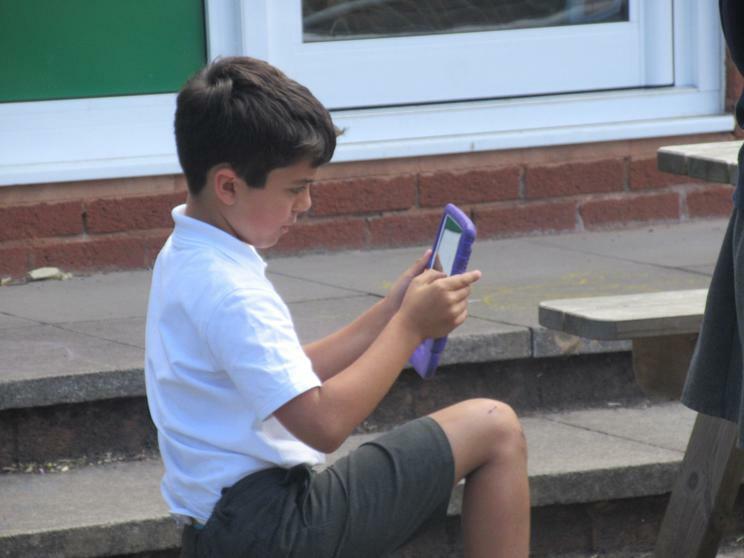 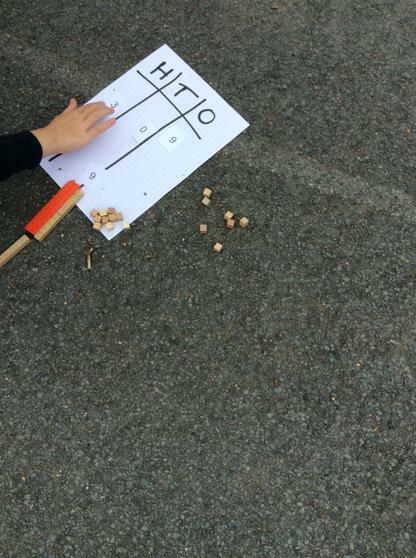 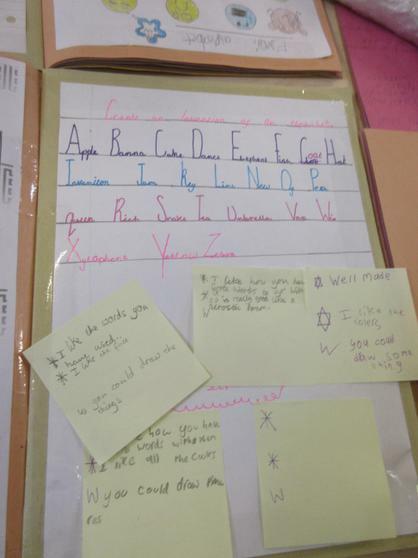 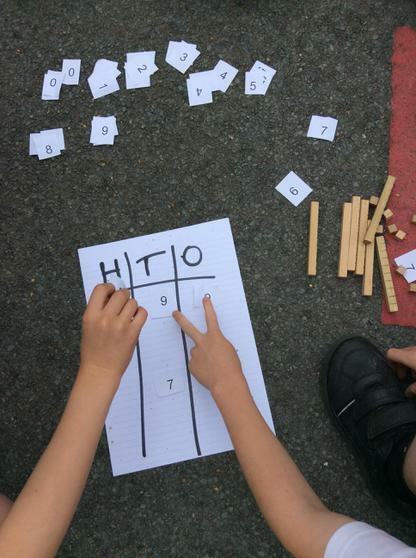 Here is a video of Oak class counting en Francais as well as a few photos of our lesson! 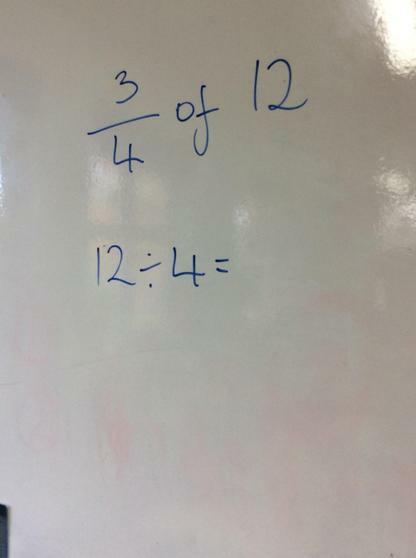 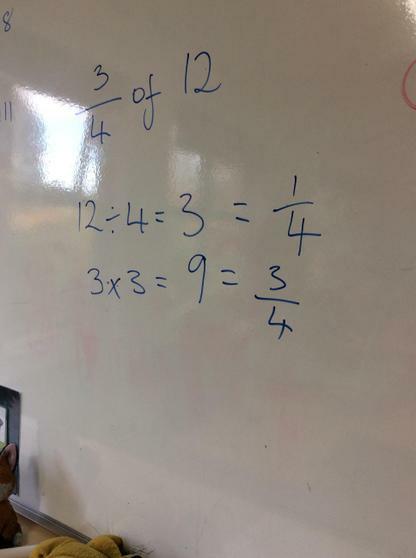 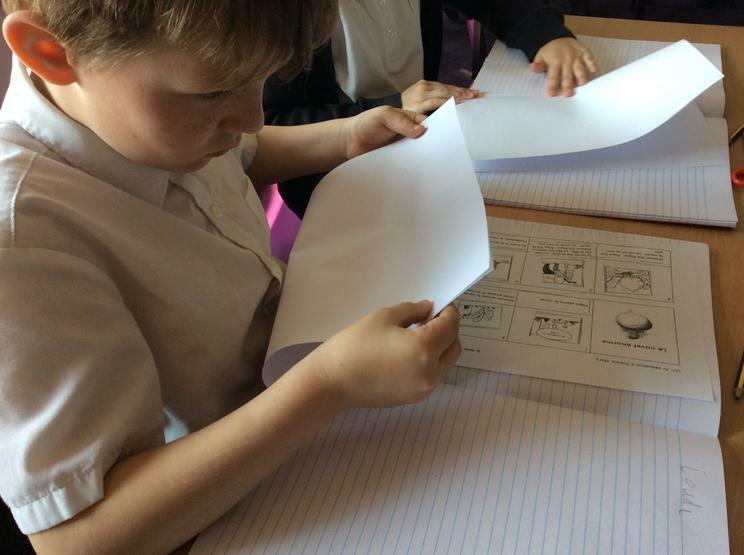 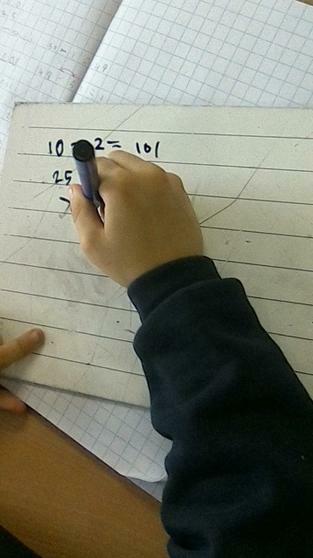 Today, the children were given a variety of answers on a piece of paper which they then had to work out what the question could be using their prior knowledge of addition. 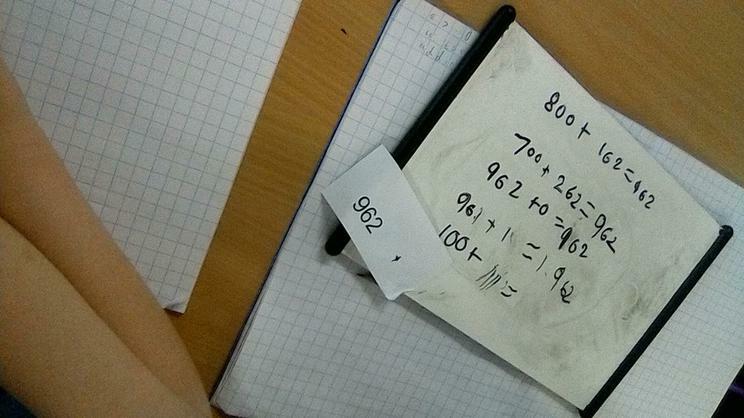 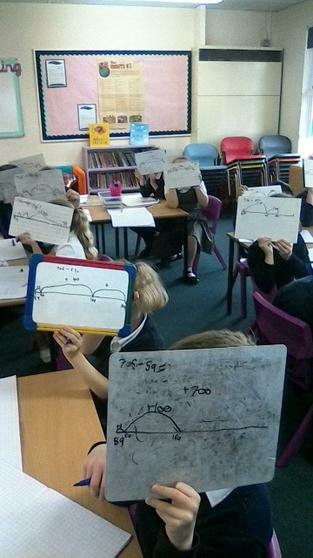 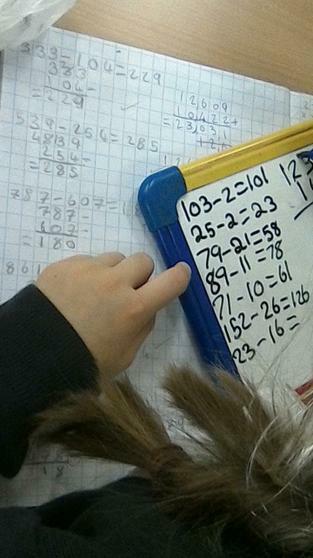 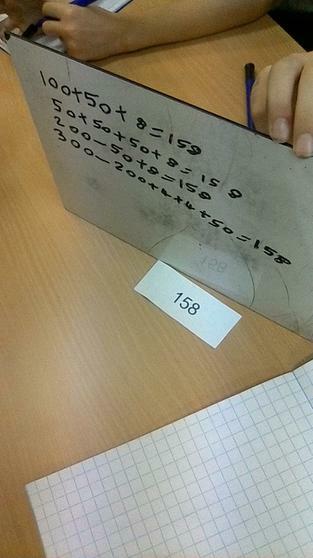 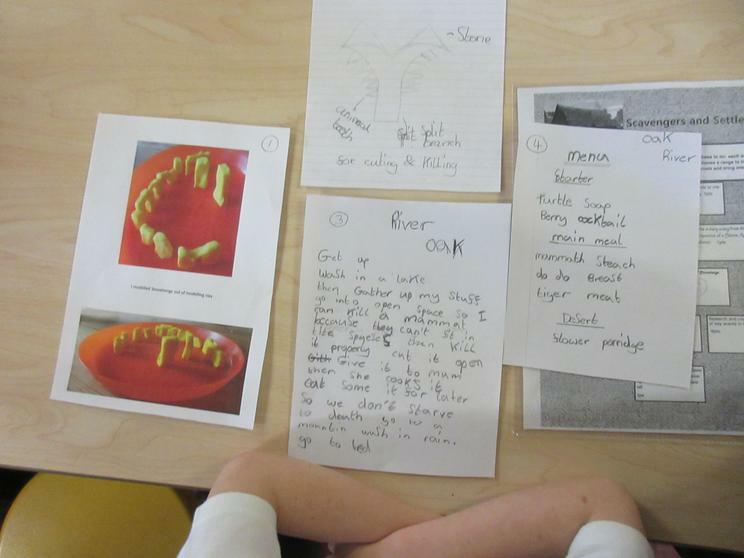 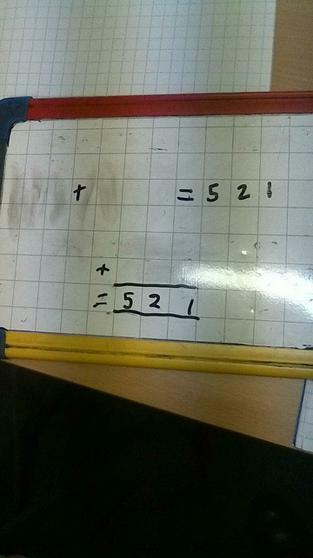 There were a variety of questions shown and some of the children also used the inverse to prove their method worked. 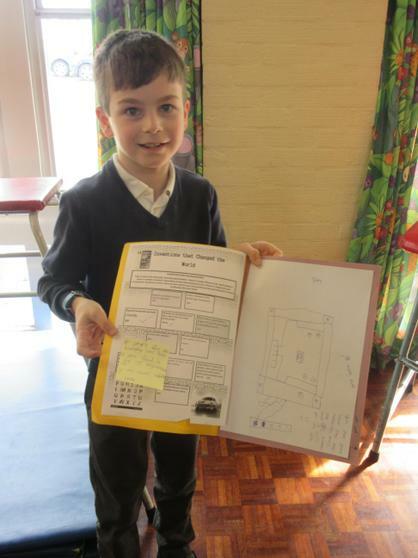 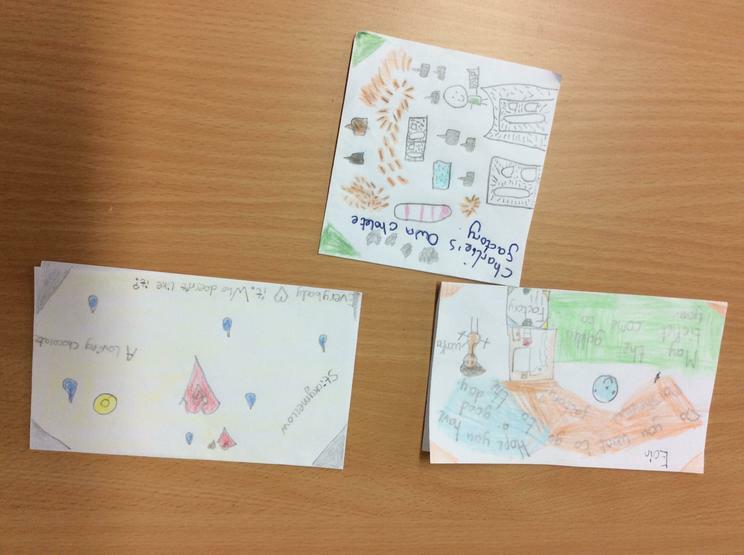 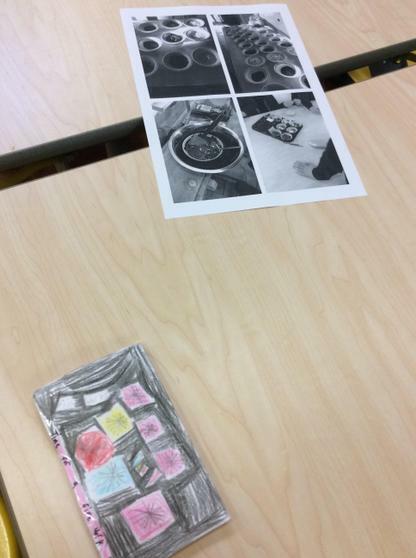 In English, the children were shown an image of Times Square, New York and were asked to describe what they saw as well as using personification to bring the city to life! 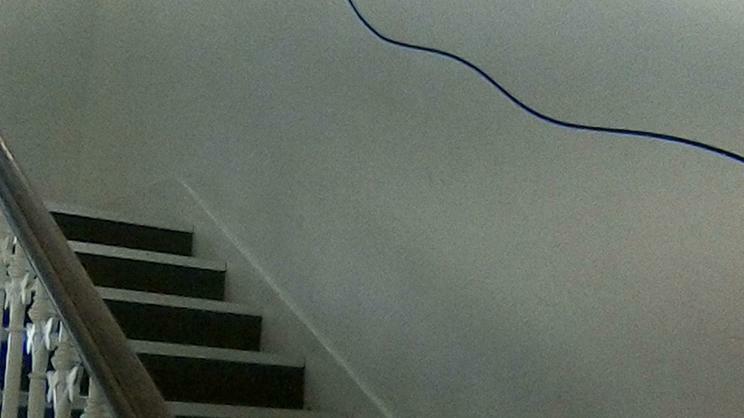 The never ending skyscrapers were staring down to me from the clear, damp sky. 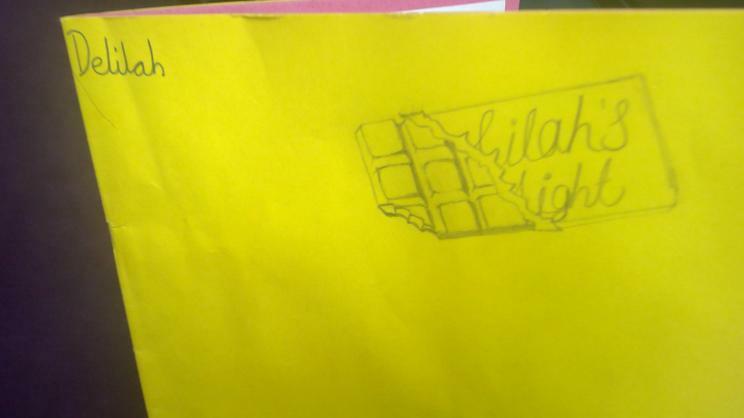 The city never sleeps and it's face is lit up. 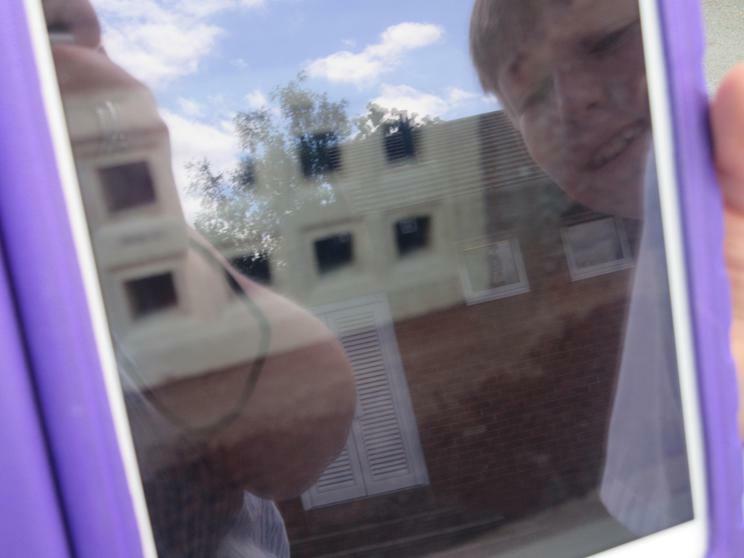 The window is waving at me, pulling me in. 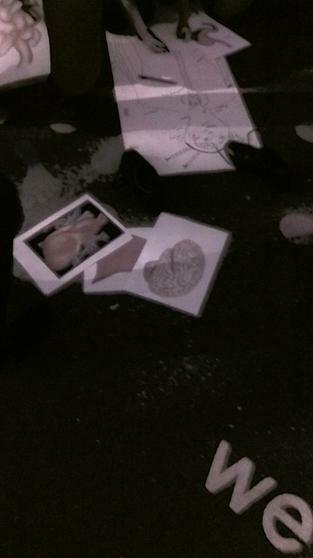 When my busy city is snoring and asleep, there's always one yummy midnight feast. 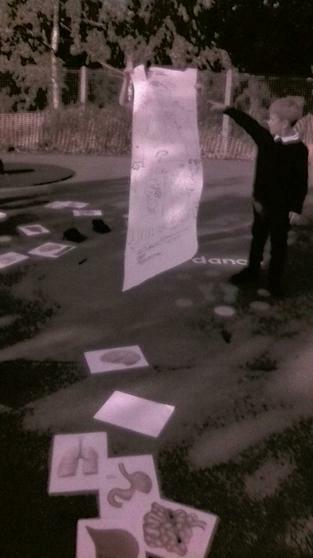 Some wonderful examples of how the children perceive NYC! 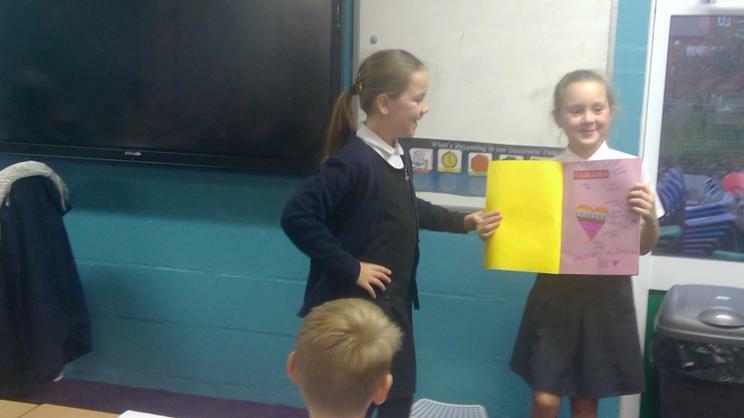 We learned all about the magic of personification as we sang along with the Bazillions! 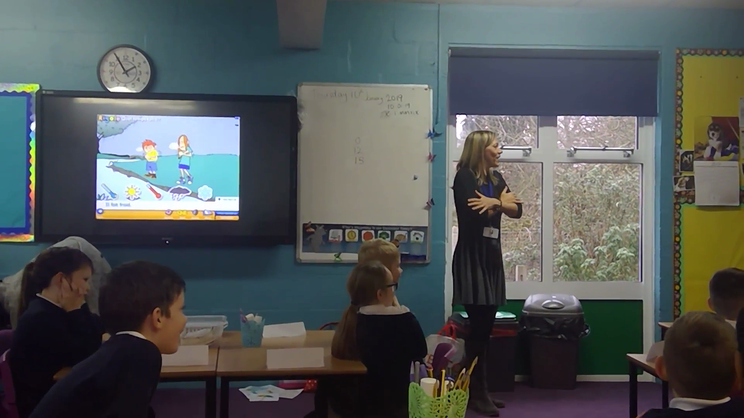 This very catchy song has been used to help the children learn all about personification and how we can use it. 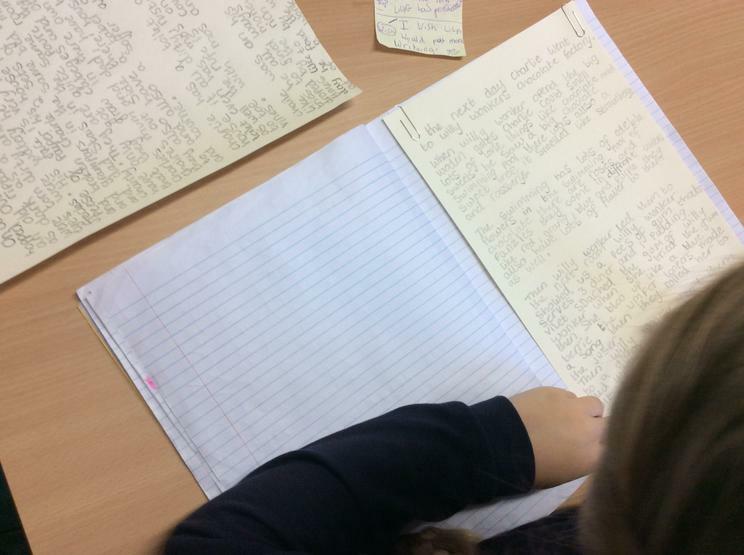 The children have used their knowledge and written their own personification sentences about Times Square, New York. 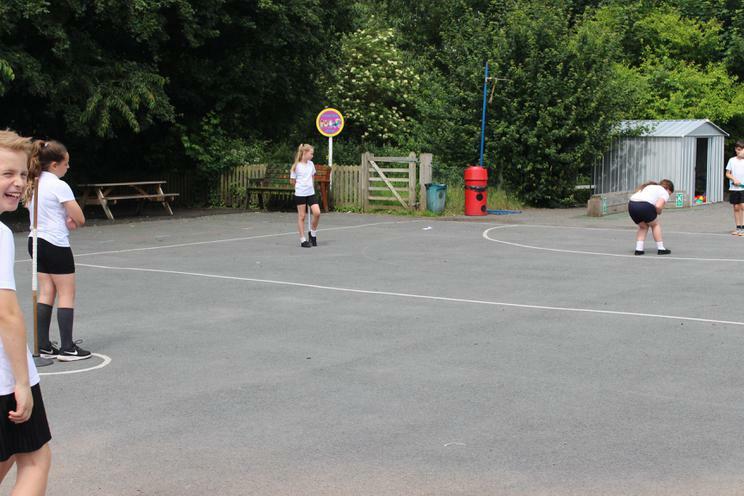 Today, the children played an old favourite - Where's Wally? 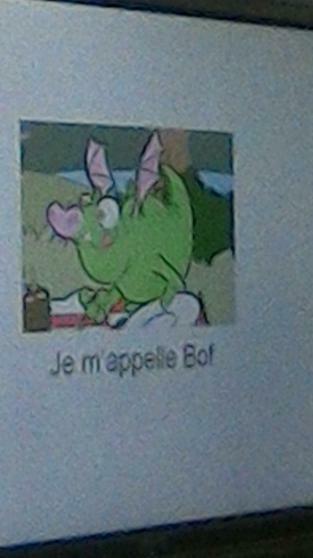 - but in French! 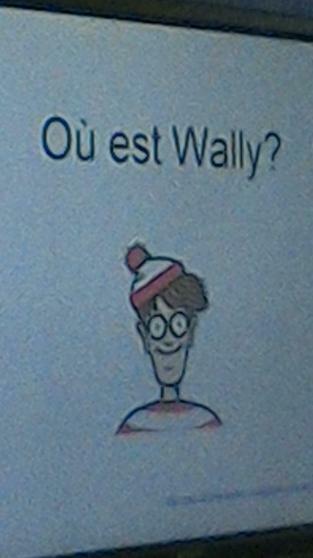 The children worked really hard and, the good news, they found Wally! 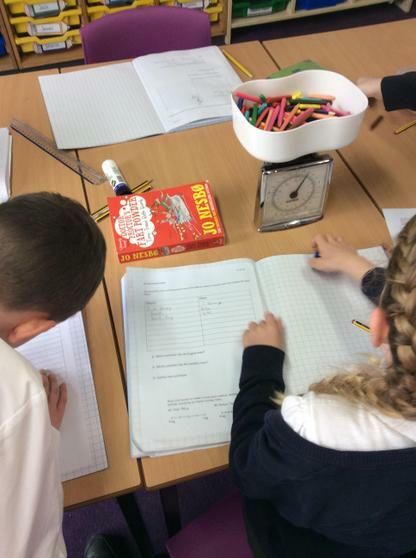 Today, we have become detectives and been tasked with cracking a very important code using our knowledge of Roman Numerals! 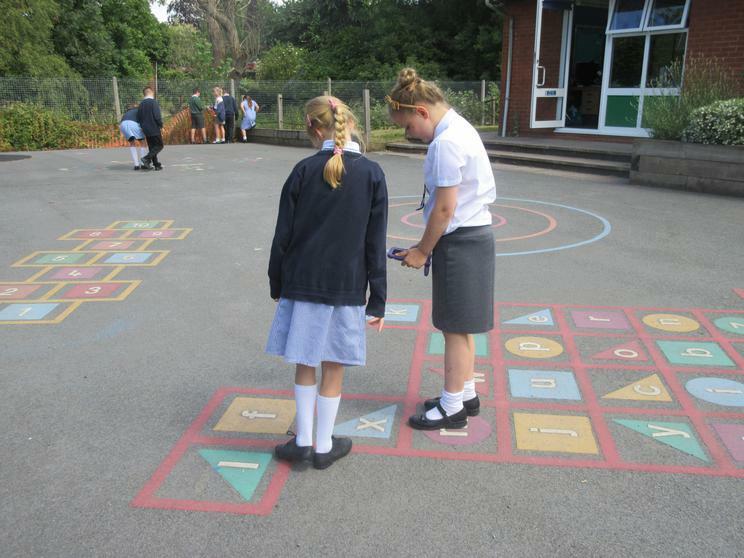 The children worked independently, in pairs or small groups to help crack the code. 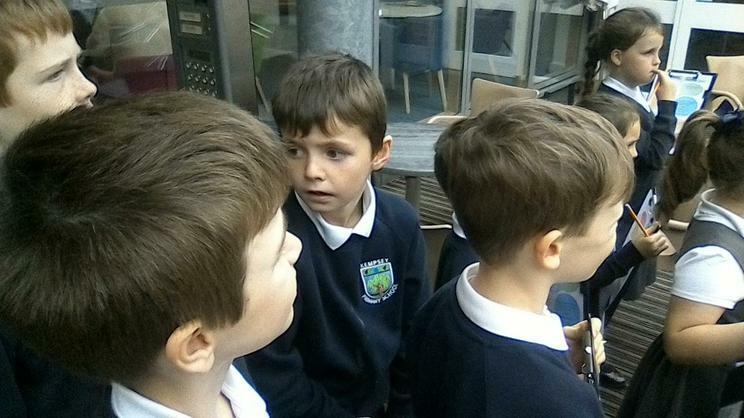 What an exciting morning! 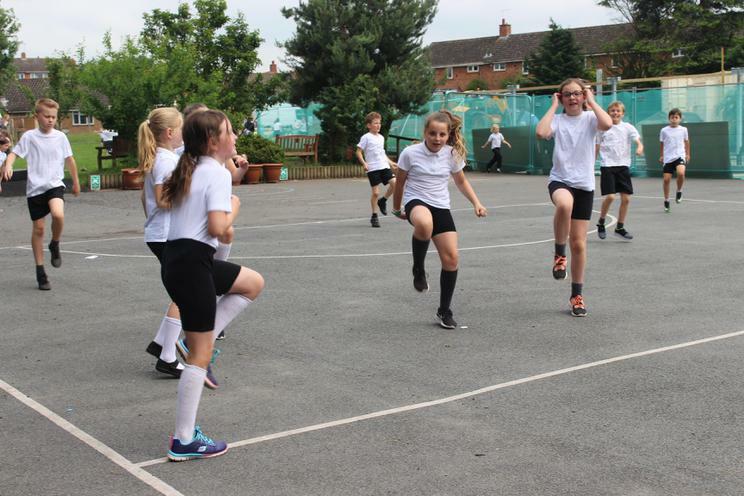 Just a quick reminder that PE kits must be in school tomorrow, Tuesday 18th September, as we have our second PE lesson. 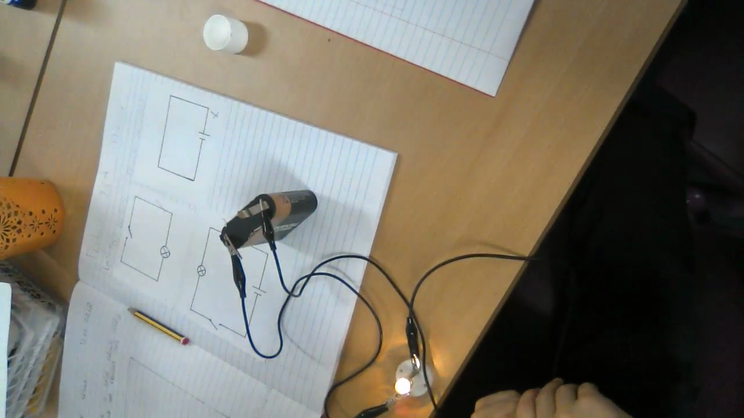 Today, we made series circuits using crocodile wires, batteries and light bulbs. 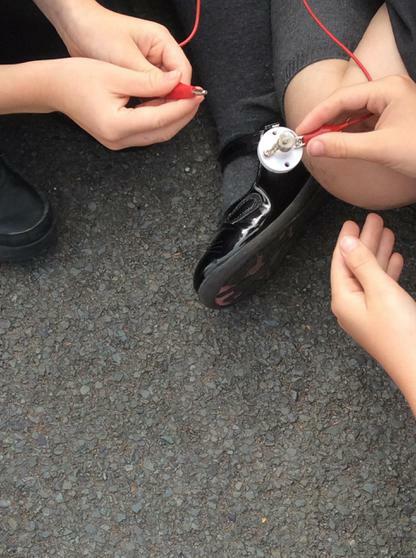 The children worked in groups and made their circuits together - there was a lot of discussion and team work. 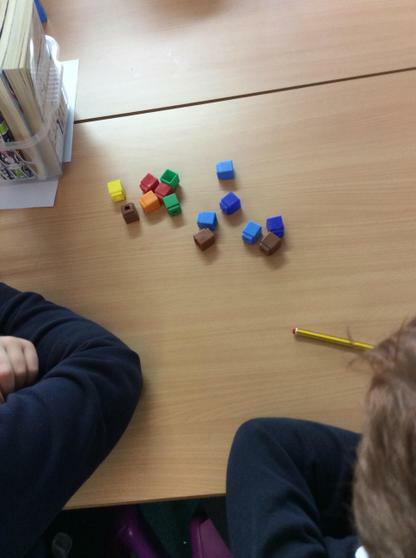 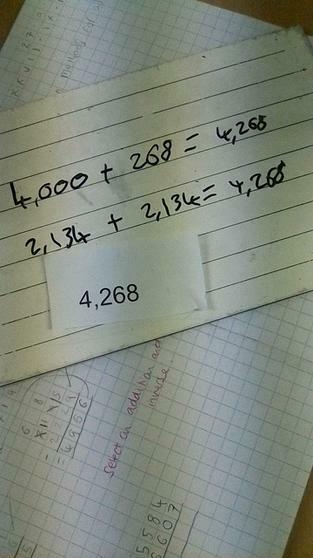 Today, the children continued to build on their prior knowledge of place value. 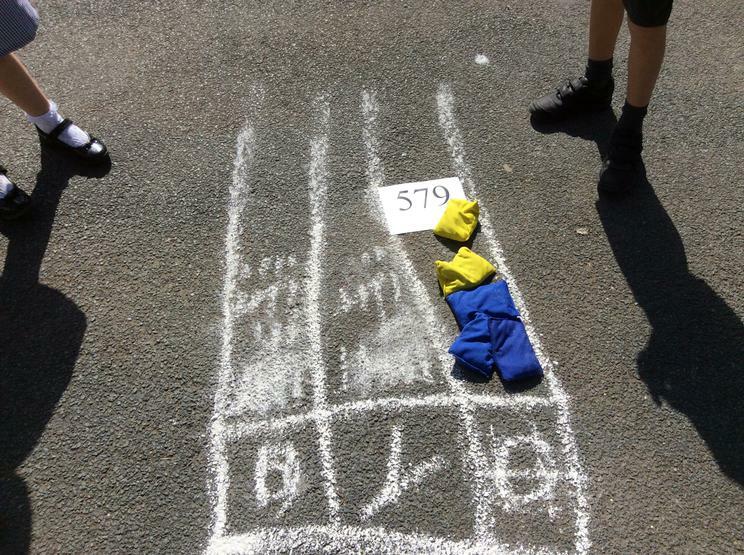 We joined up with Laurel and Maple class for a 'place value competition'! 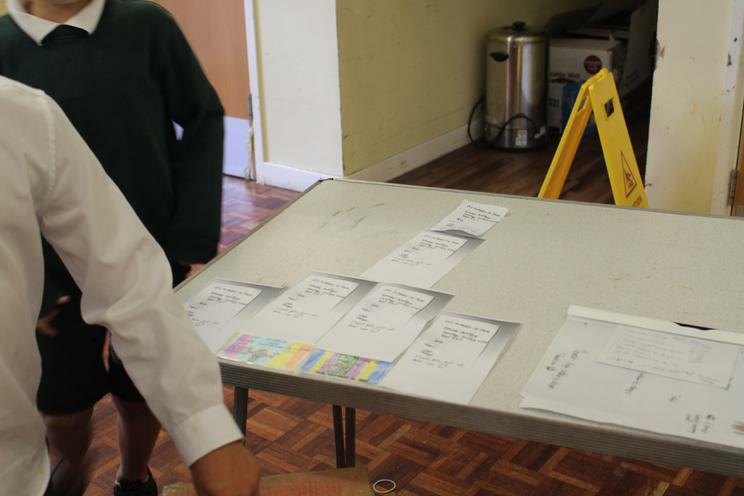 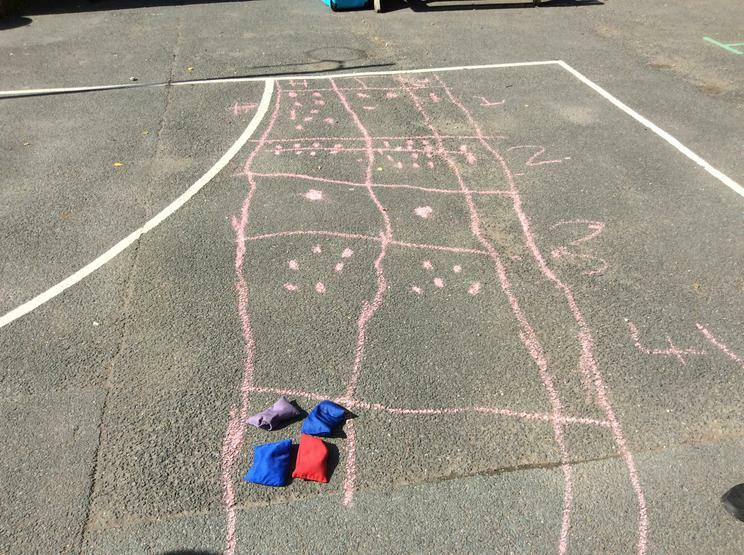 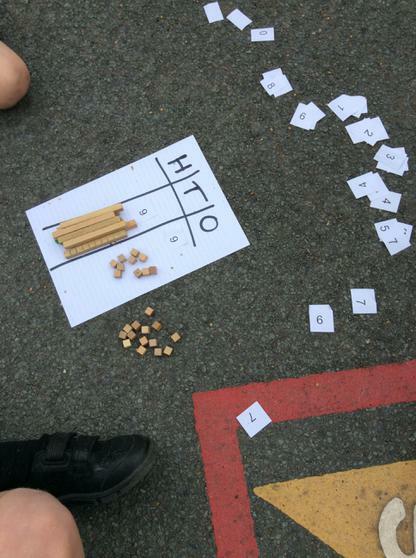 Teacher's were given a variety of numbers which the children had to come up and collect, go back to their groups and place the correct amount of bean bags in the relevant columns. 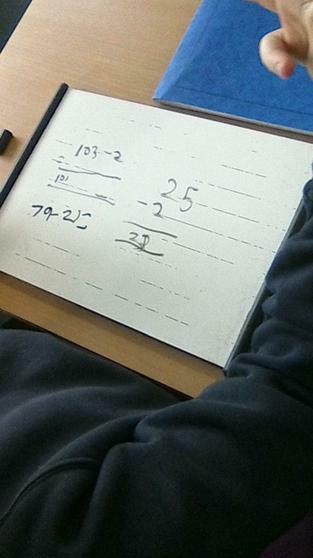 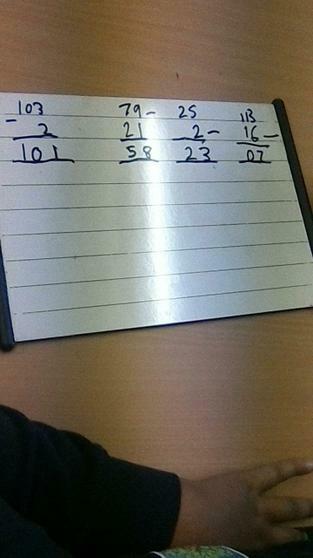 Once they had done this, they were then to show the teacher to check all was correct, mark down a point and collect the next number. 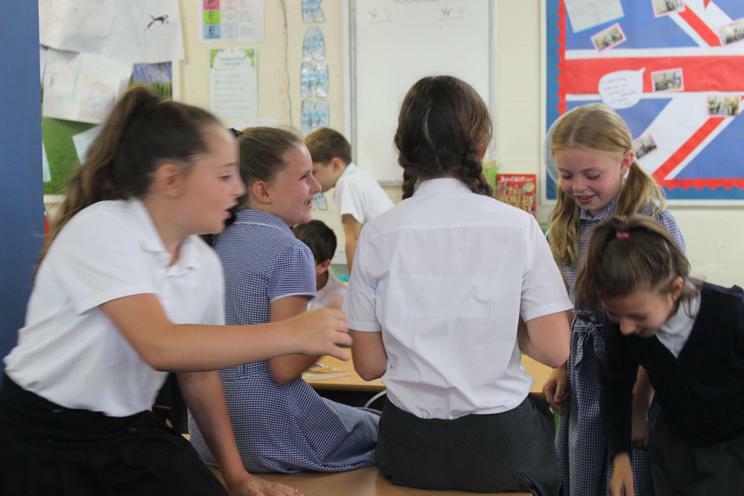 We had a great morning where team spirits were high and the children showed that they are integrating well in to their new classes! 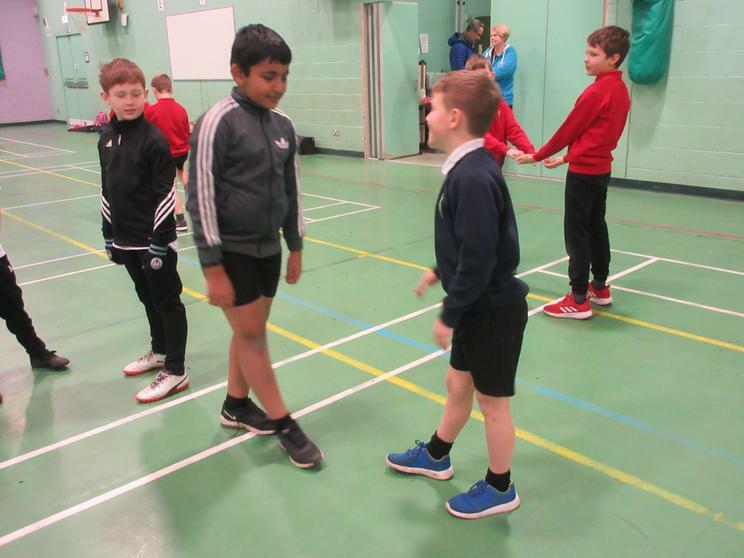 Please could I ask parents to ensure that their child has brought in their PE kits ready for Tuesday as we have our first PE lesson. 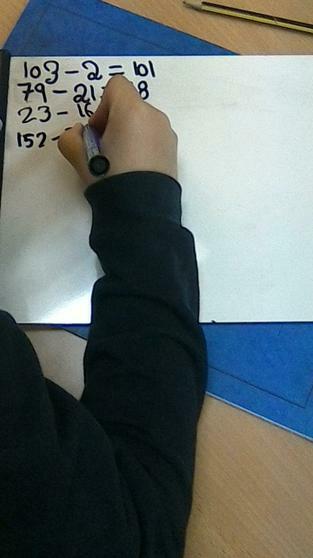 This week, we have come back to school and started recapping on our prior knowledge of place value. 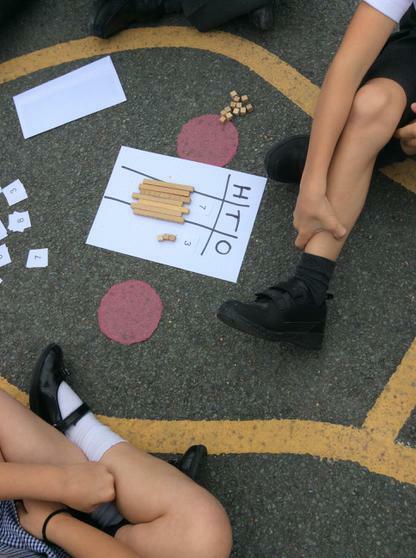 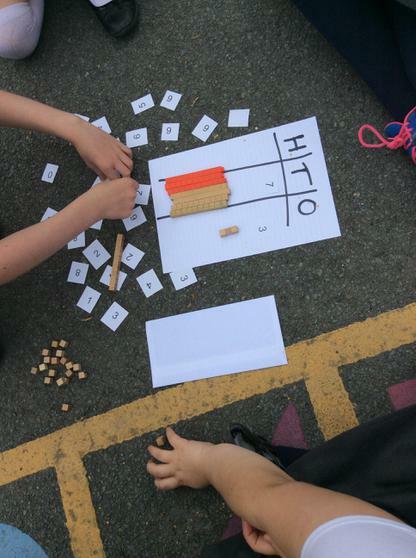 The children worked in groups, listening out for the numbers that they then had to make using the H T O column and dines cubes to help consolidate their learning. 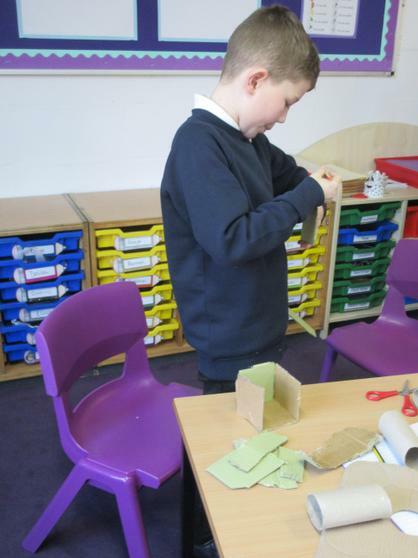 The children worked really well and they showed great team work skills! 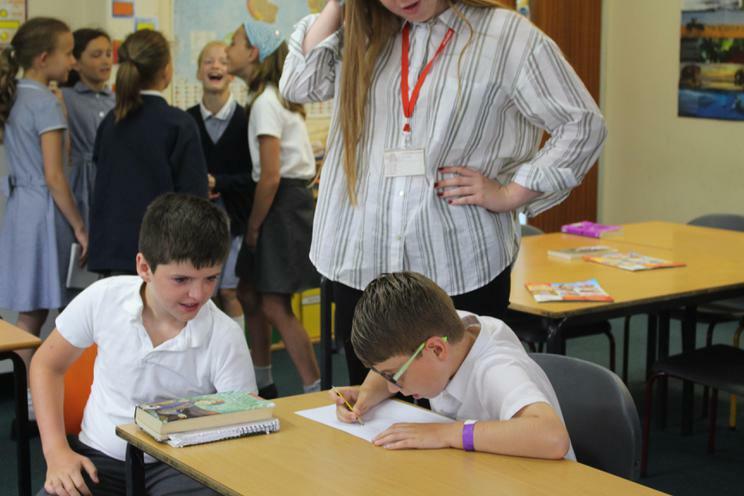 A warm welcome back to the new academic year! 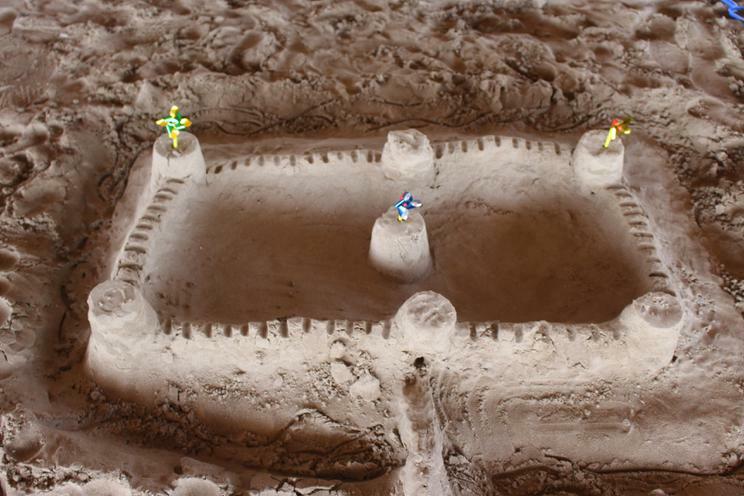 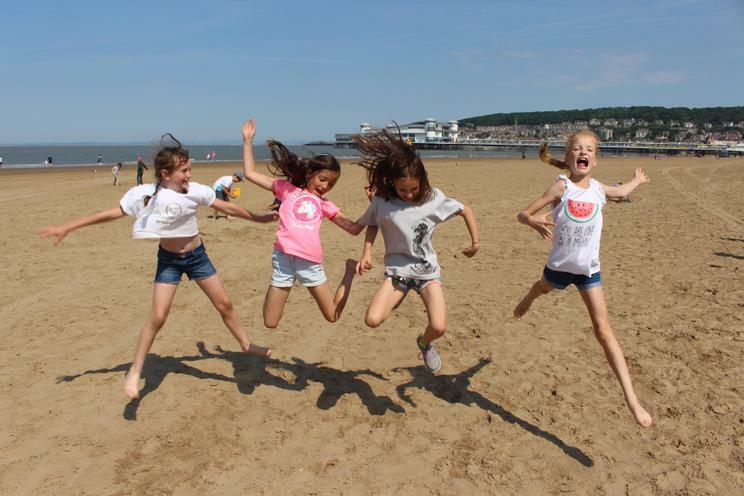 We hope you have had a wonderful summer - it certainly flew by! 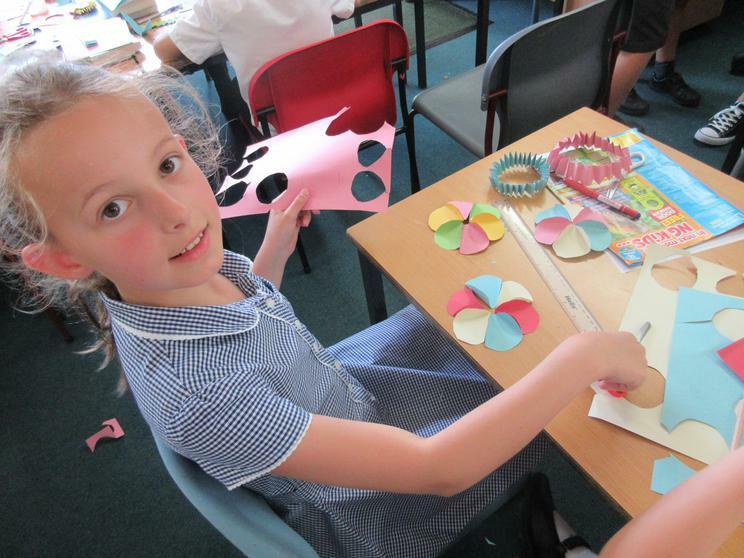 We are very excited for the new term and have lots of fun and exciting topics in the pipeline for the children. 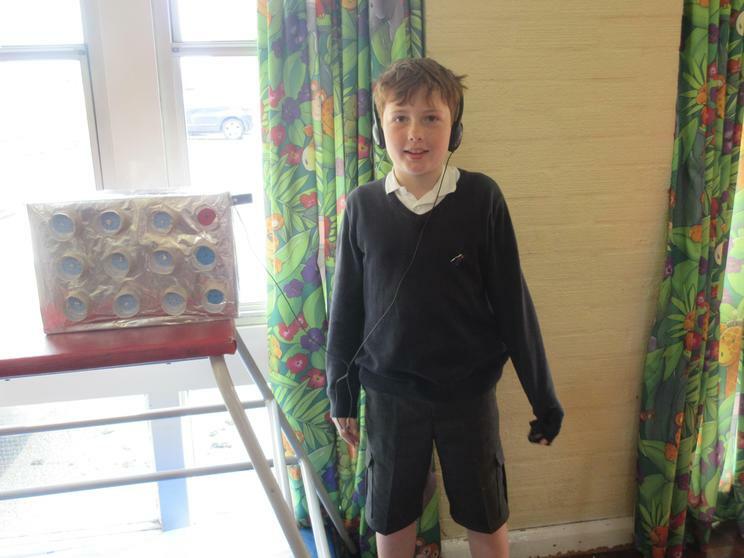 Key Stage 2 Summer Disco! 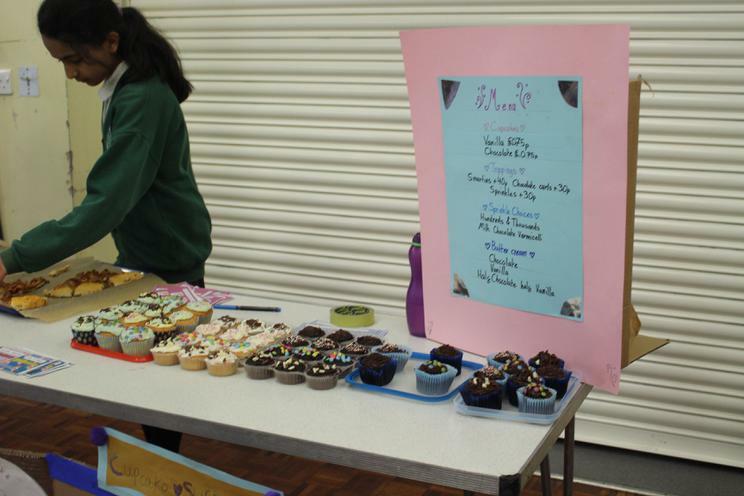 There is a charge of £1.50 for entrance and a selection of sweets and chocolate will be available to buy. 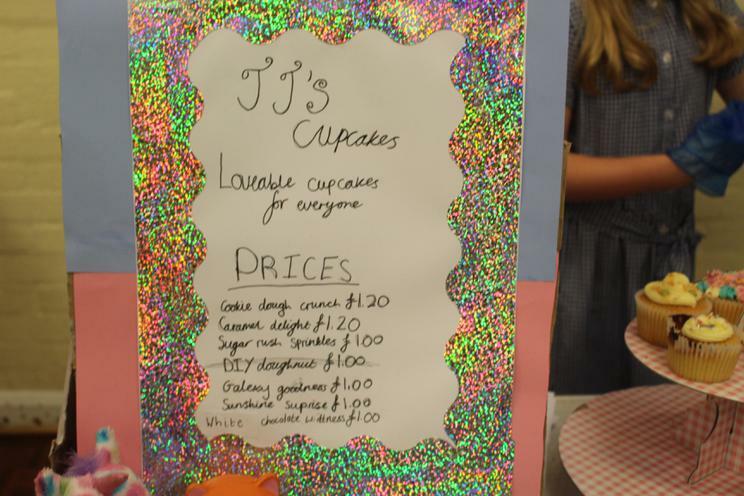 Prices of these will range from 5p to £1. 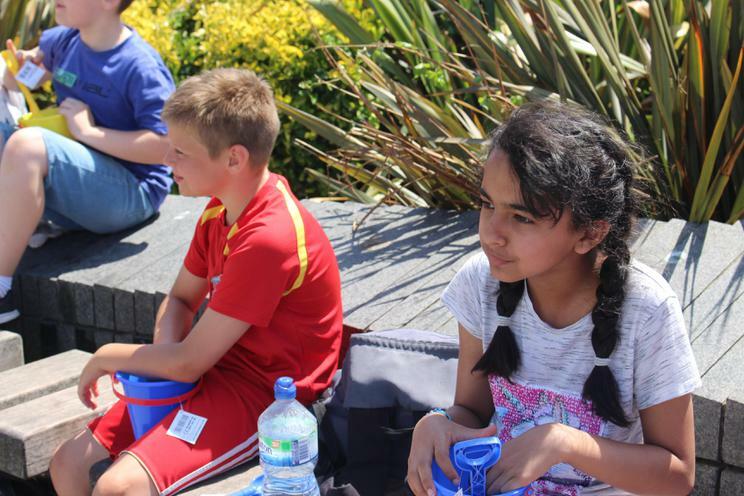 Squash and water will be provided for free. 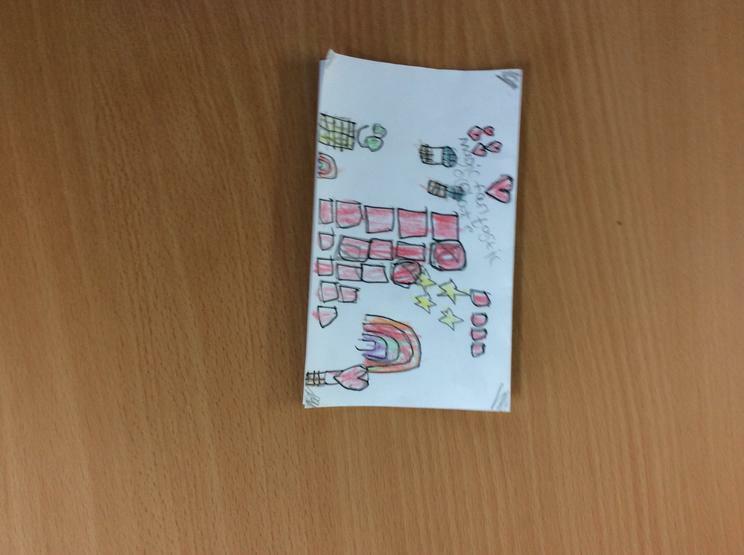 We will also be doing glitter tattoos from 50p a go. 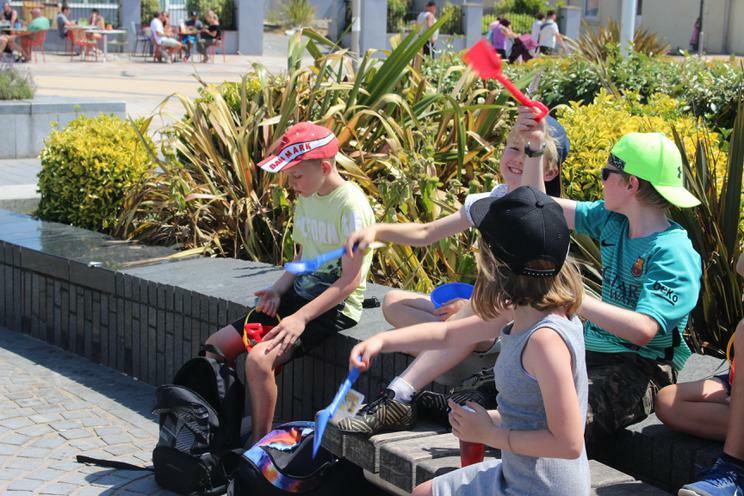 Summer leis, lucky dip and inflatables will also be on sale from between 30p-£2. 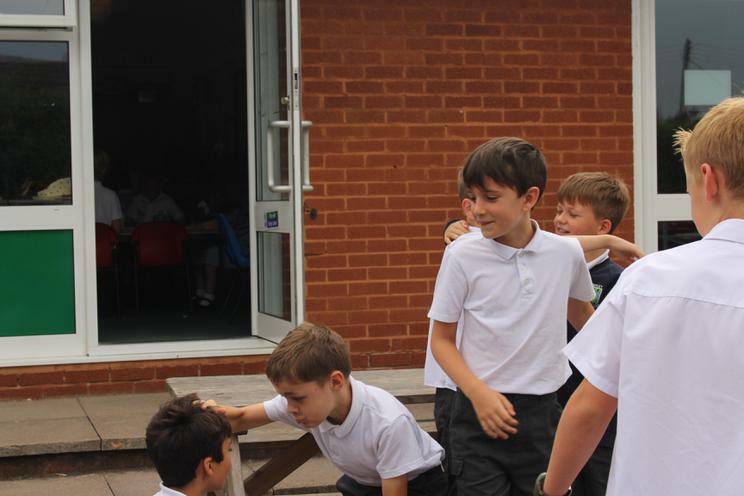 KS2 children can be dropped off and collected from the school playground if the weather is nice or the school hall if not. 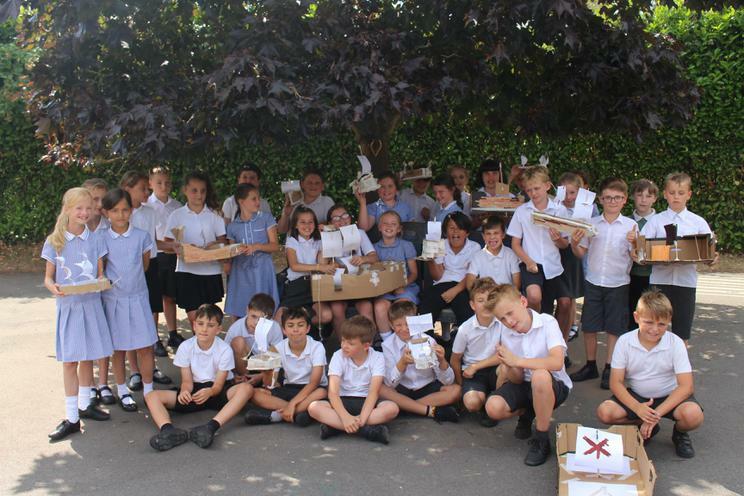 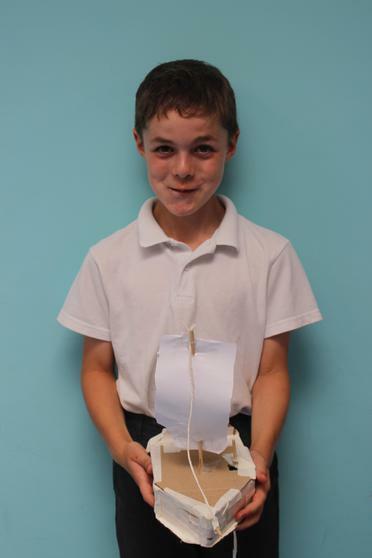 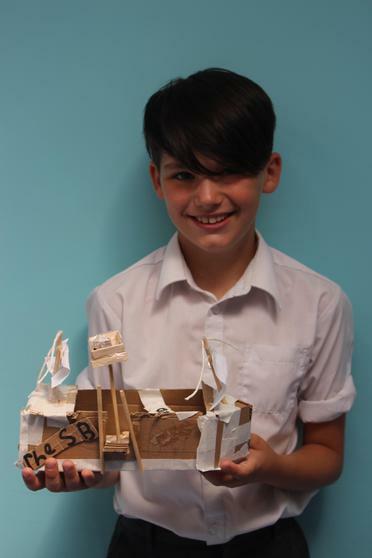 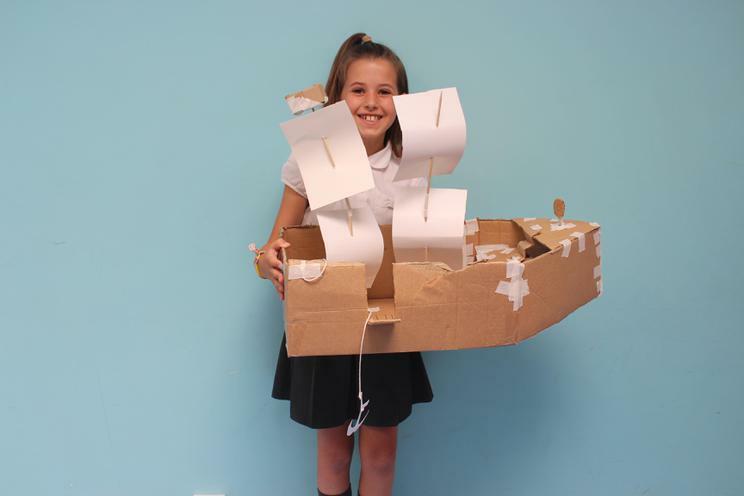 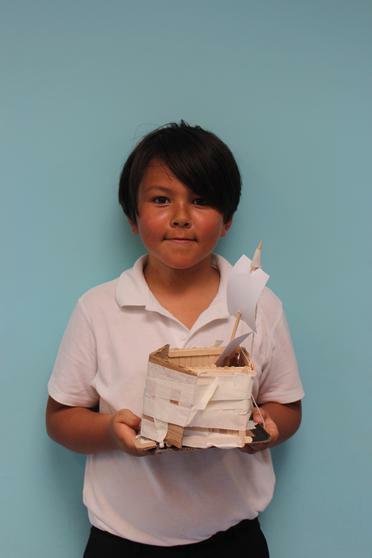 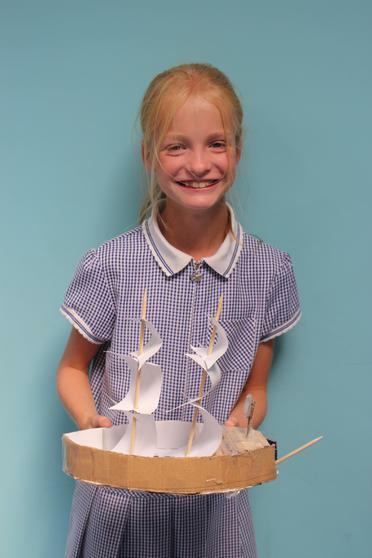 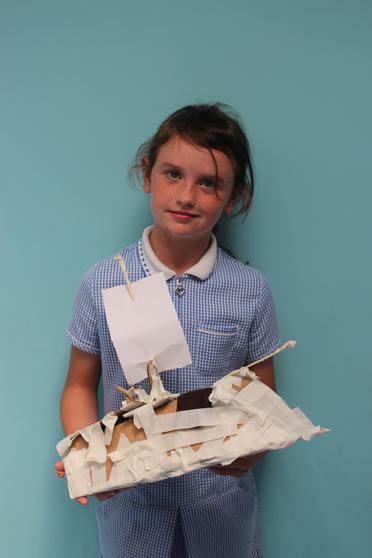 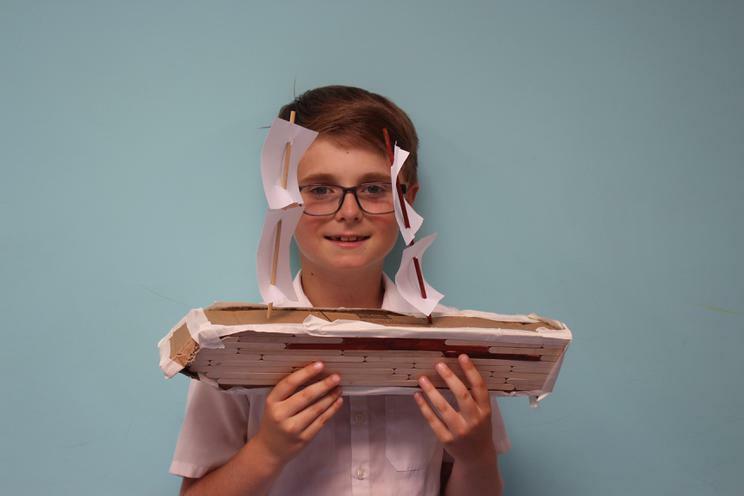 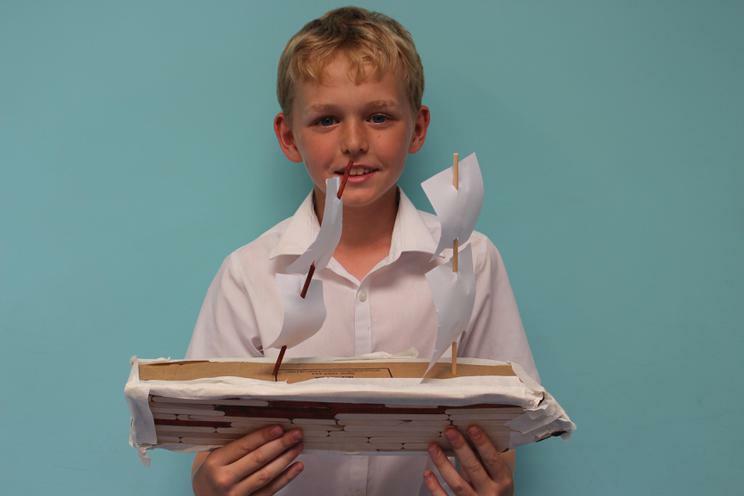 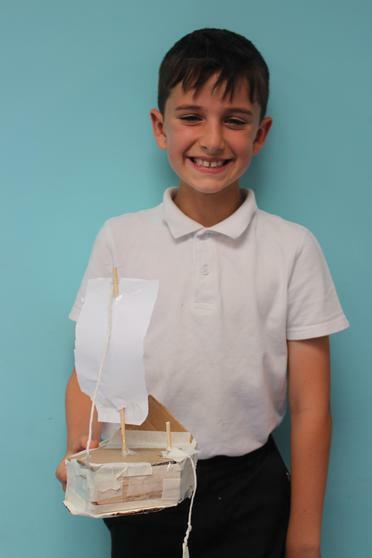 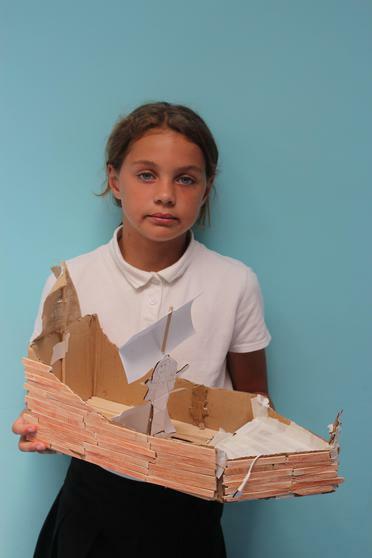 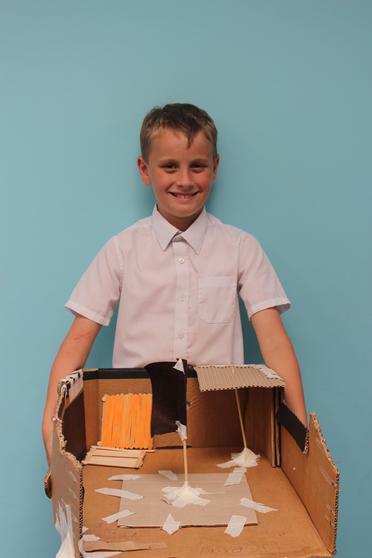 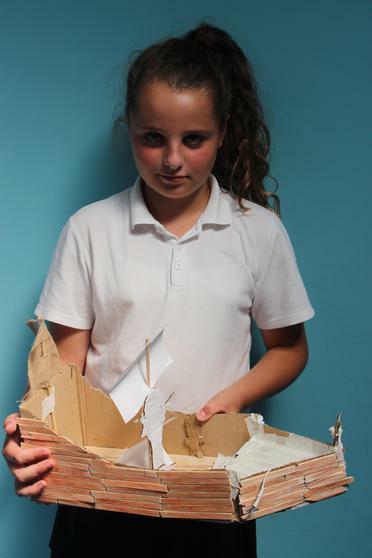 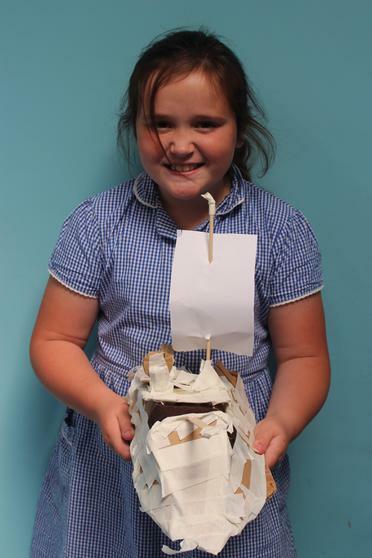 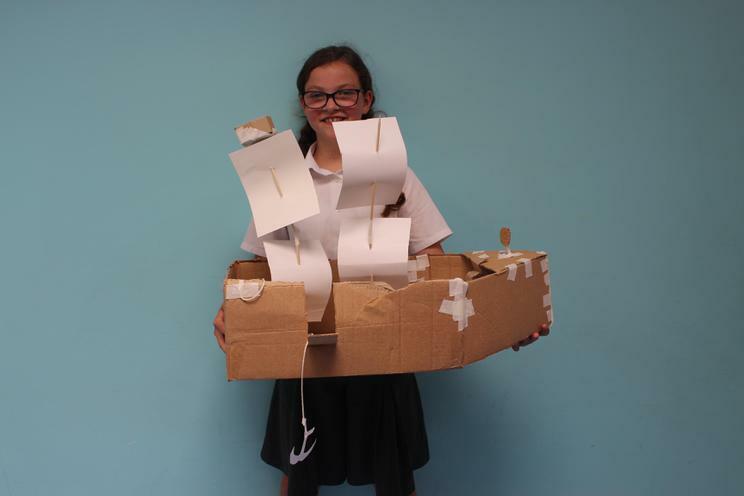 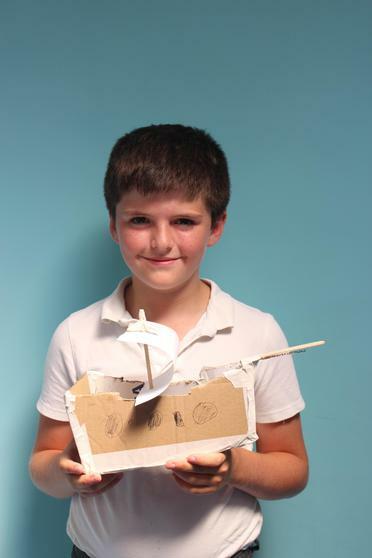 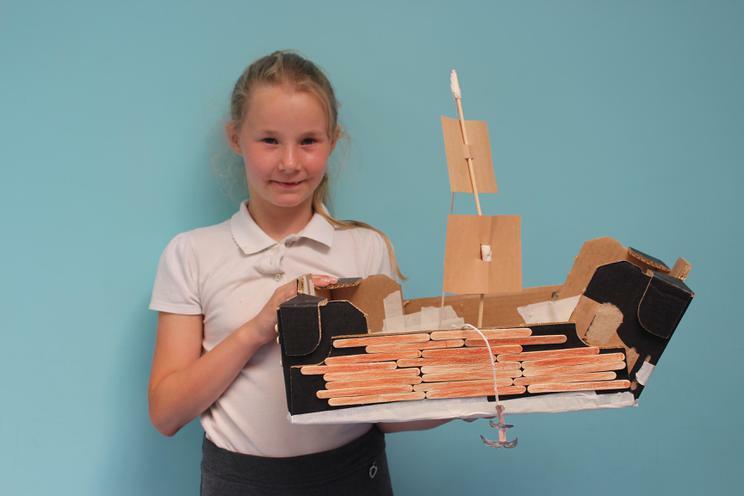 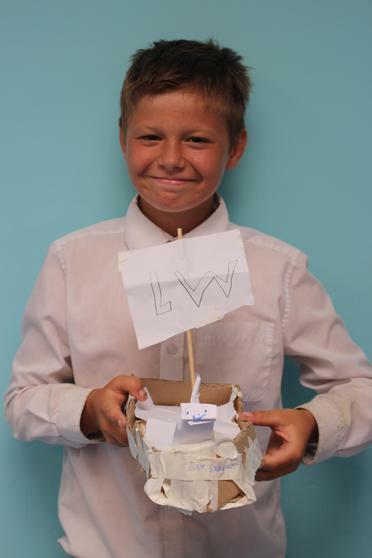 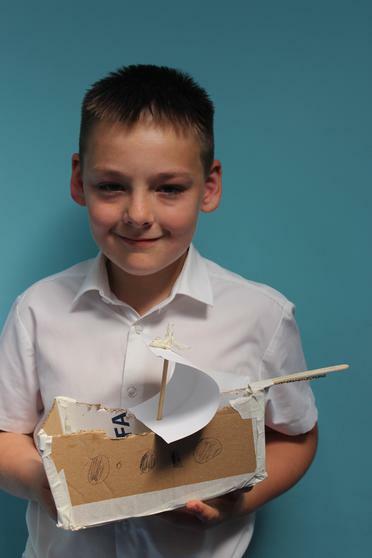 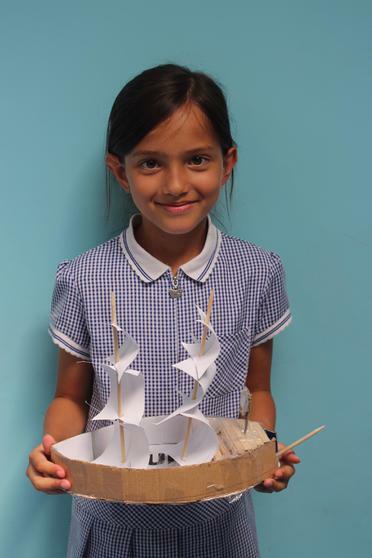 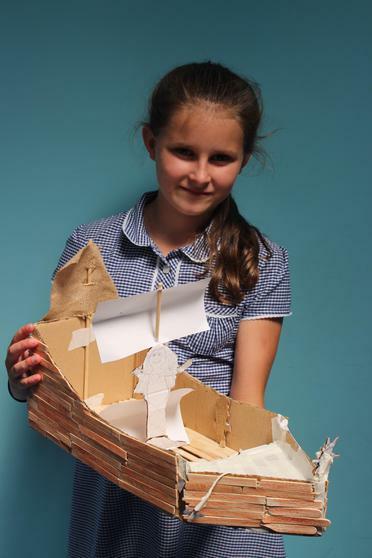 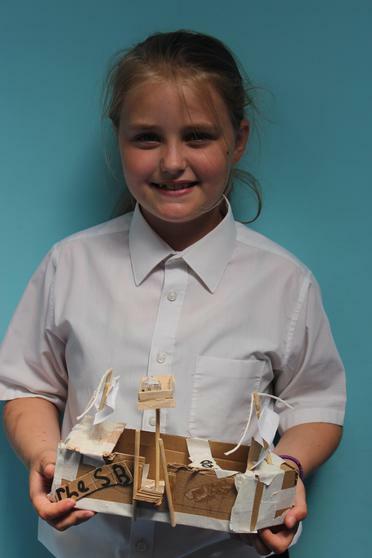 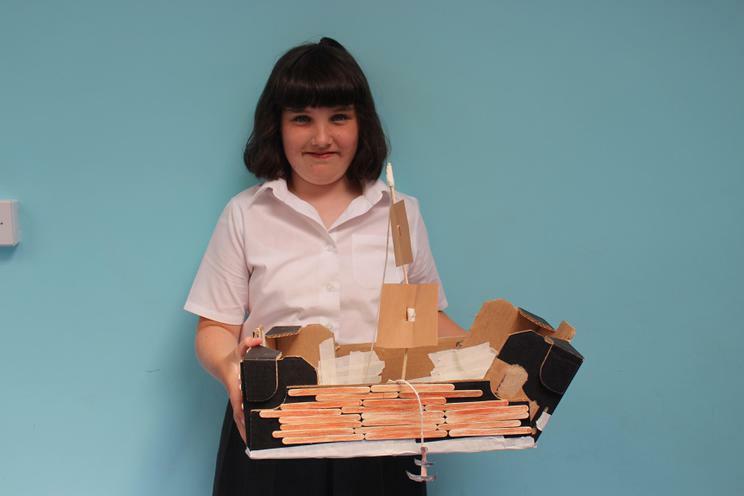 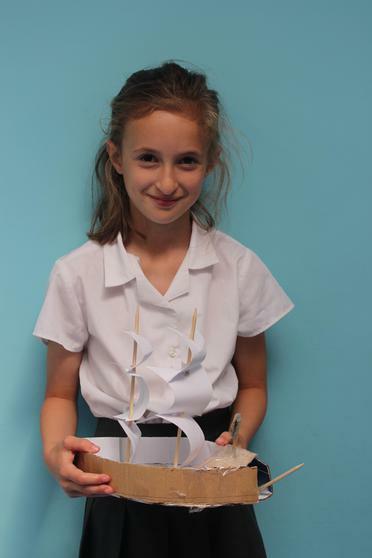 Today, the children finished off making their boats, based on the ship 'The Endurance' which is the vessel Sir Ernest Shackleton used on his expedition to the Antarctic. 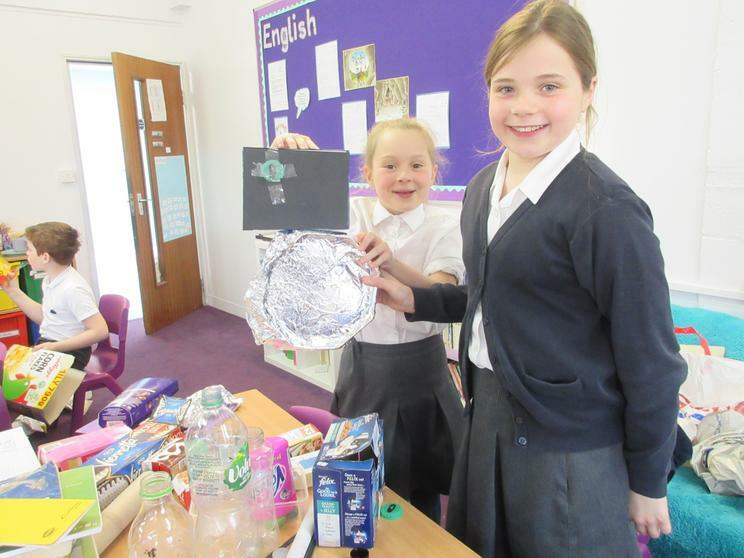 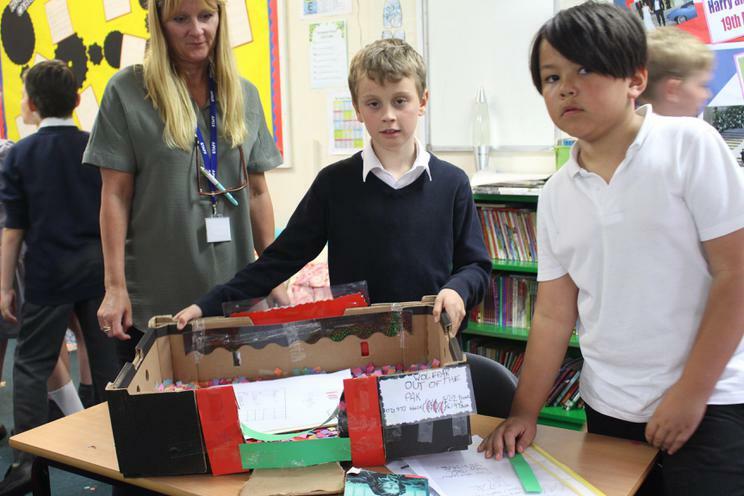 The children have worked exceptionally hard on these (as you can see) and they have produced some fantastic pieces of design and technology. 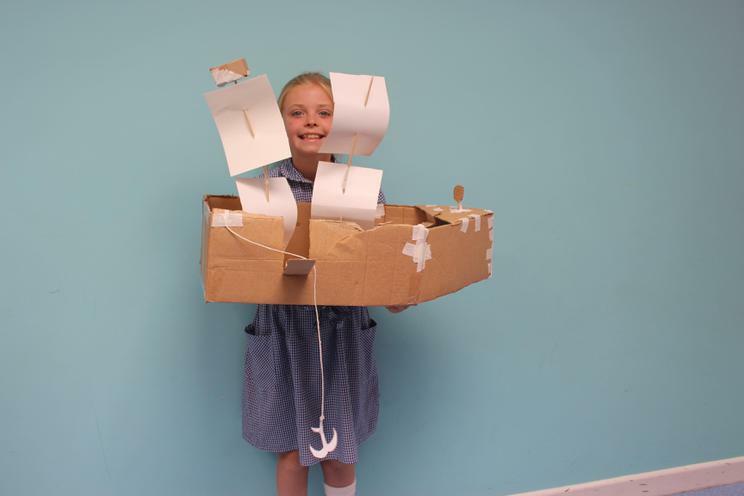 They had to think about shape, structure and size as well as what parts the ship would need including sails and an anchor. 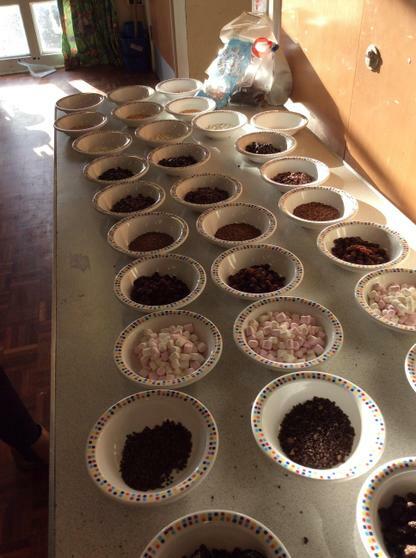 A Wedding Breakfast to Remember! 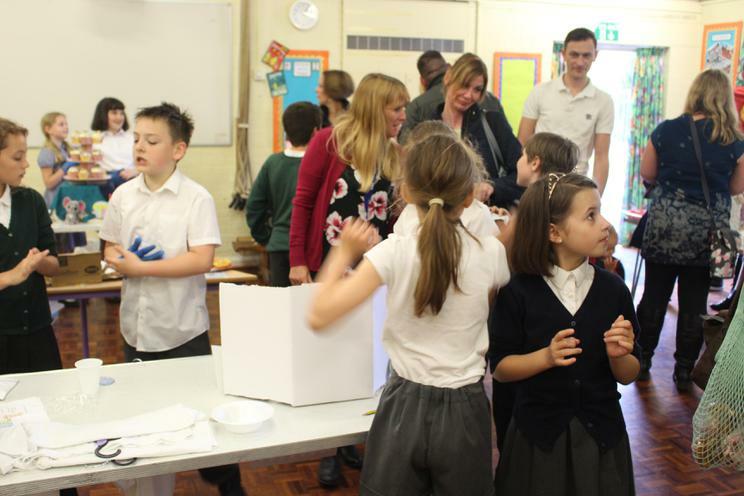 Today, we celebrated the marriages of Mr Willetts, Miss Jessop and Mrs Webster with a wedding breakfast and a dance festival. 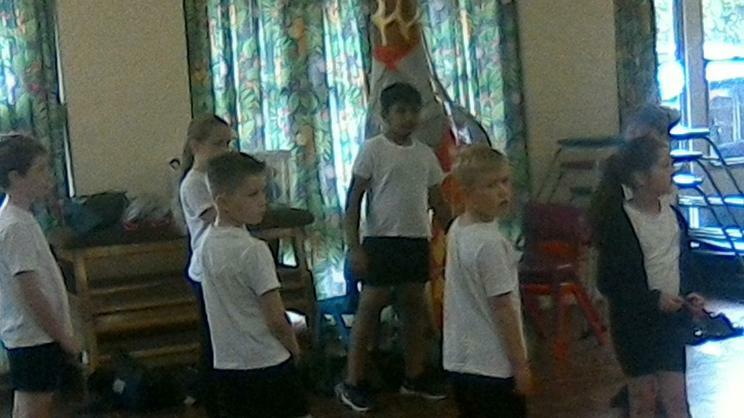 The children were all incredible and Oak class performed their own version of 'The Hakka' - we translated our own words into Maori which we then incorporated into our dance. 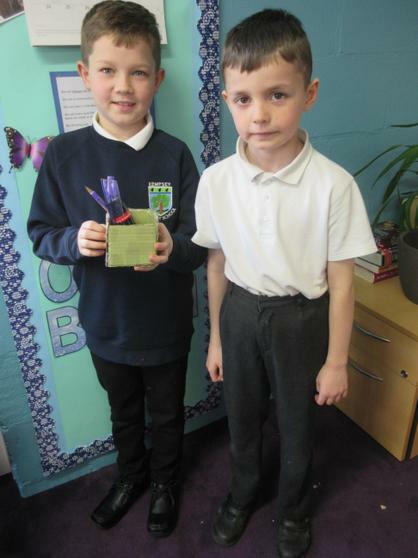 We were very proud of them and they should certainly be proud of themselves! 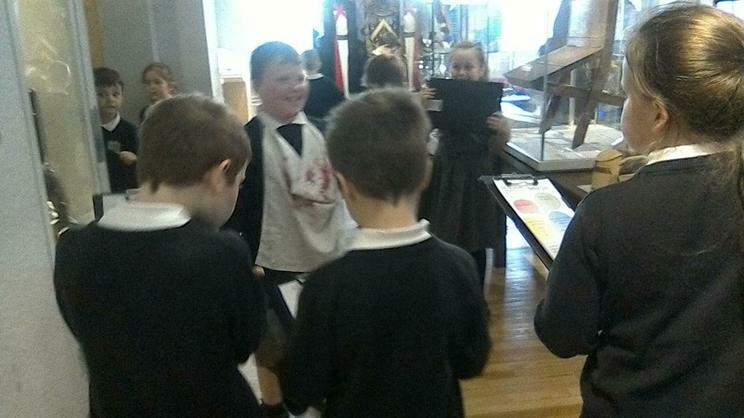 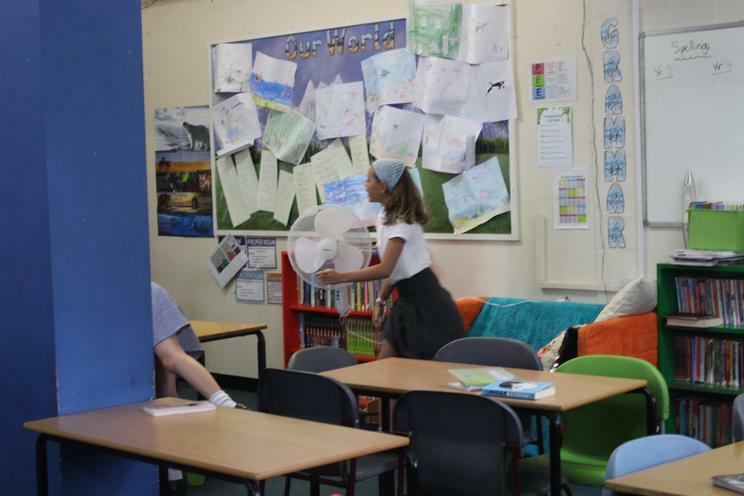 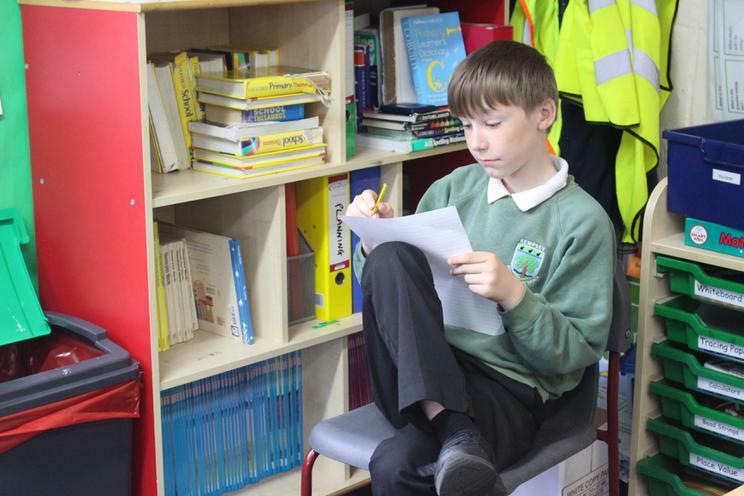 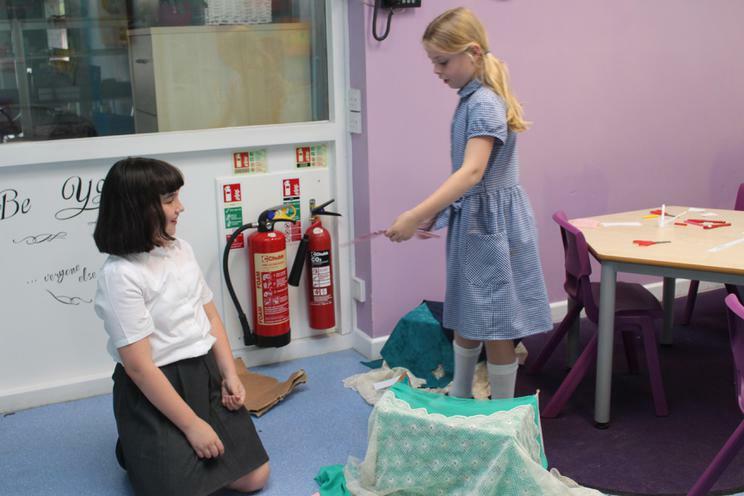 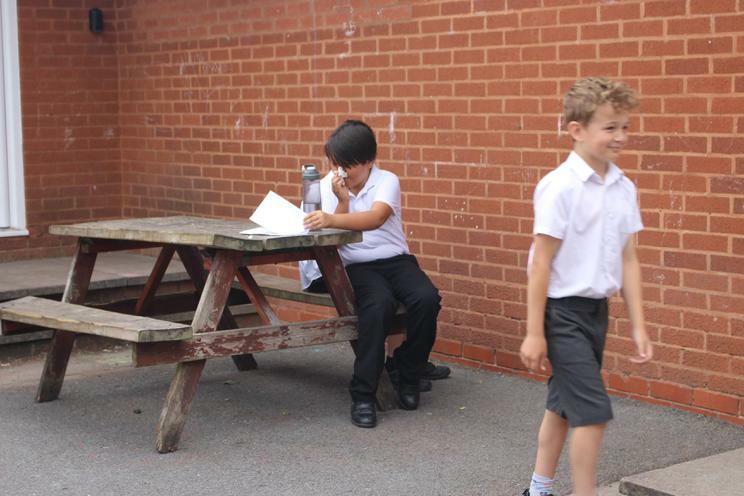 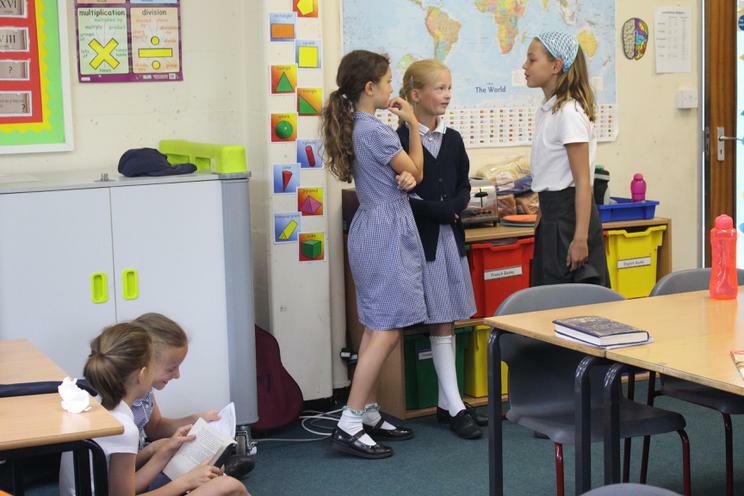 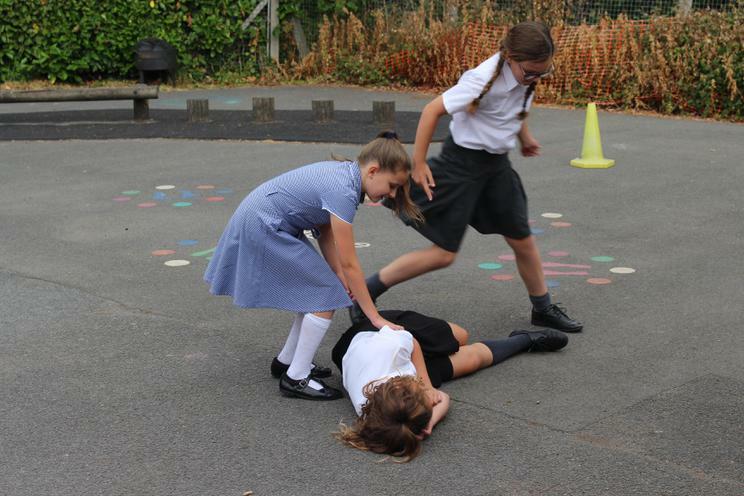 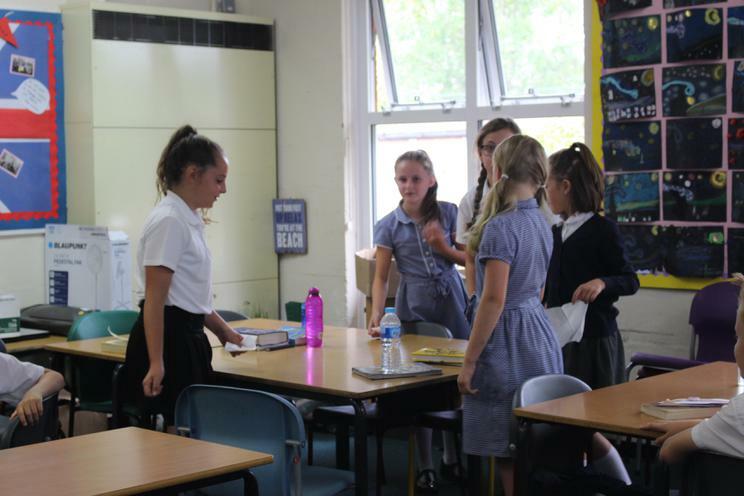 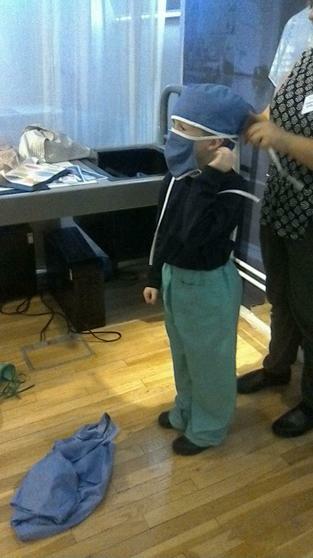 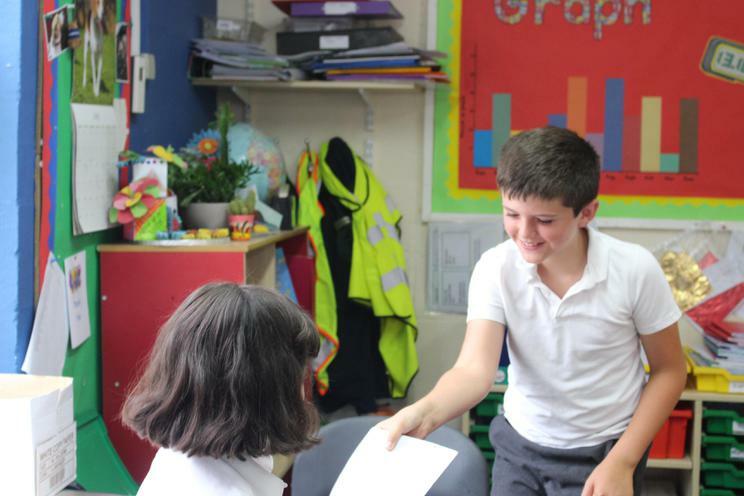 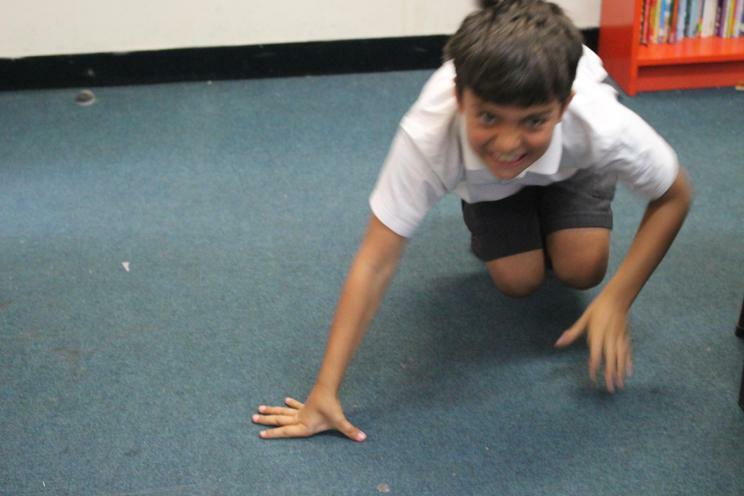 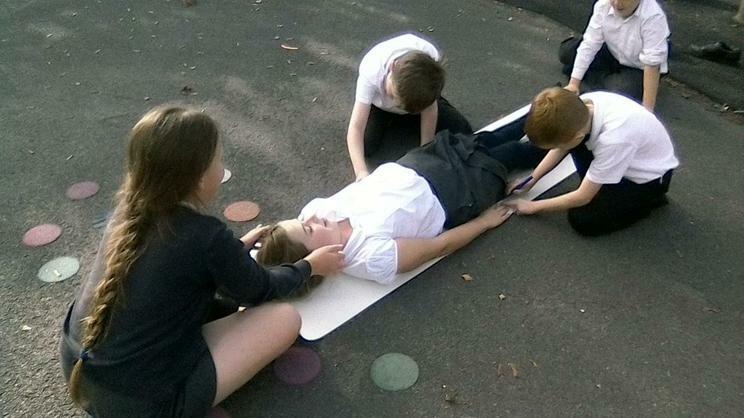 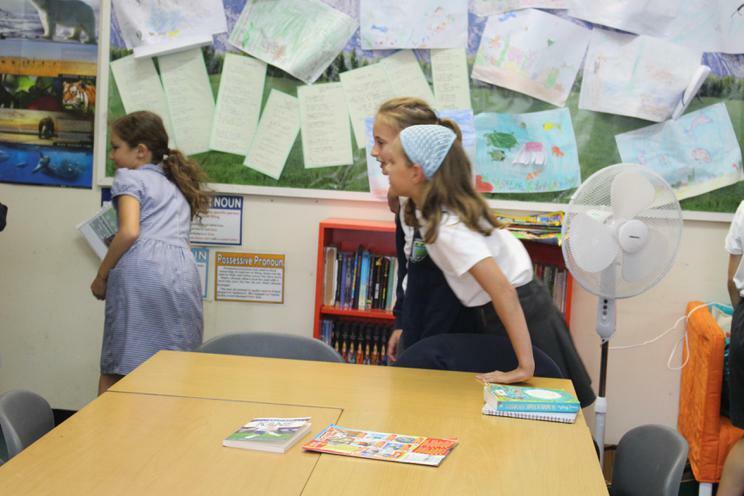 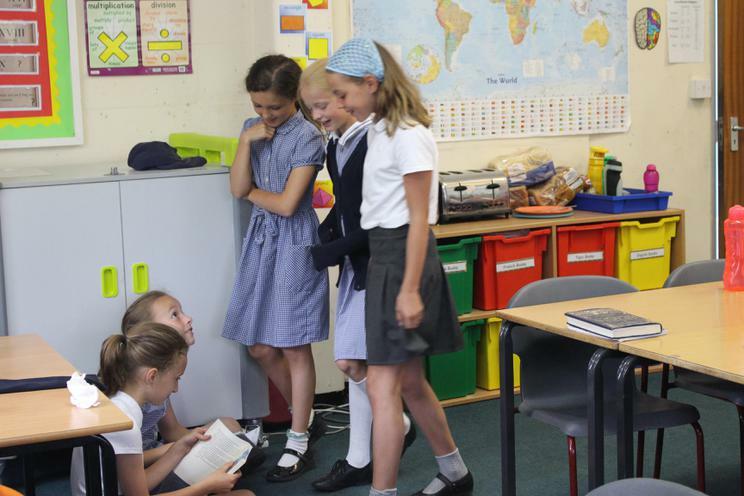 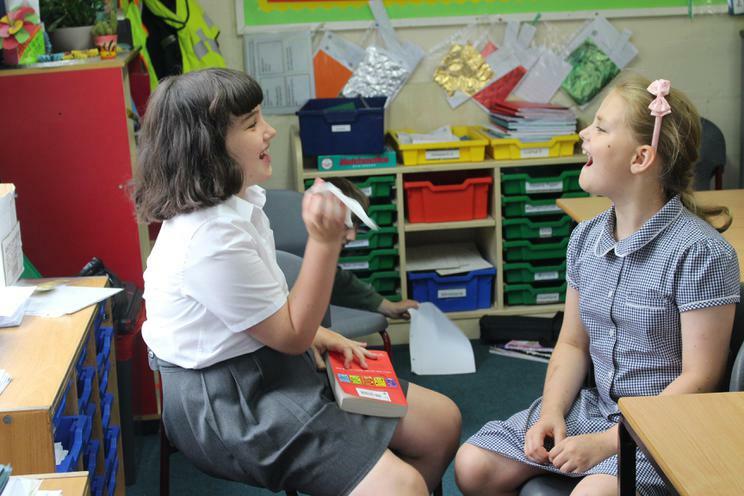 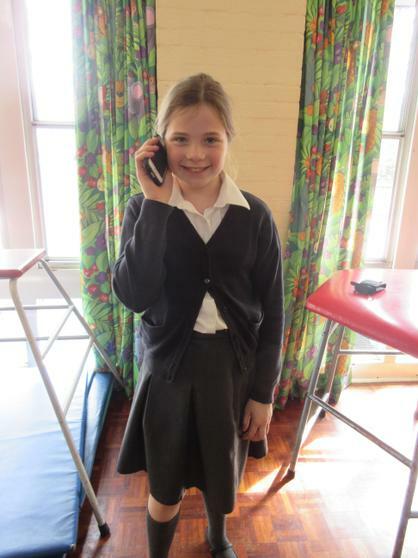 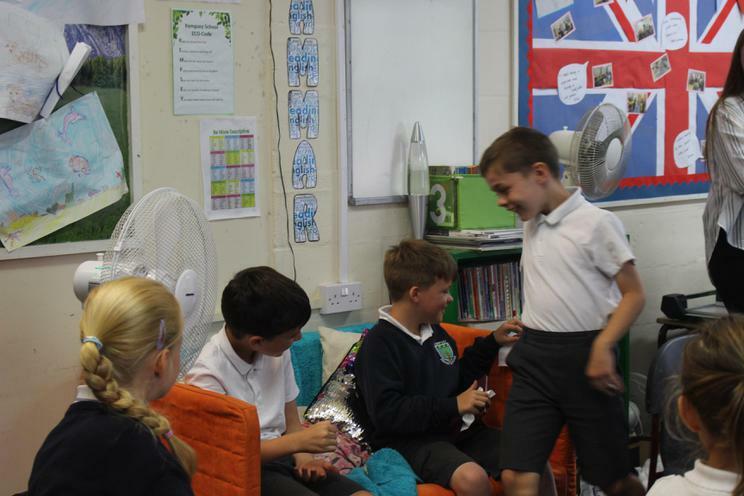 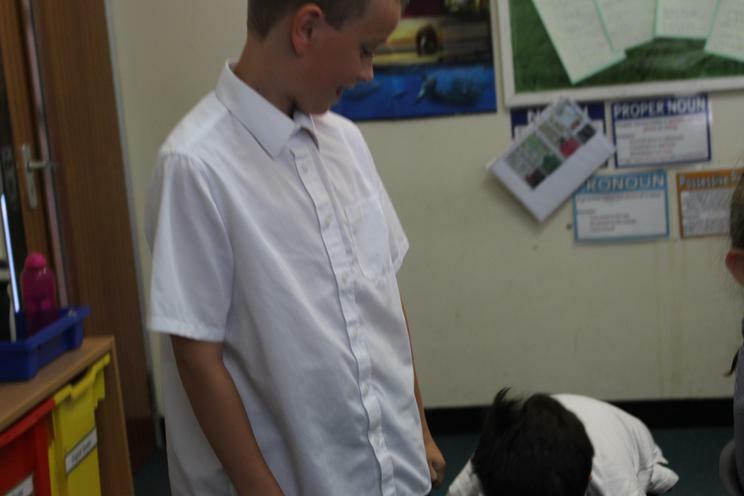 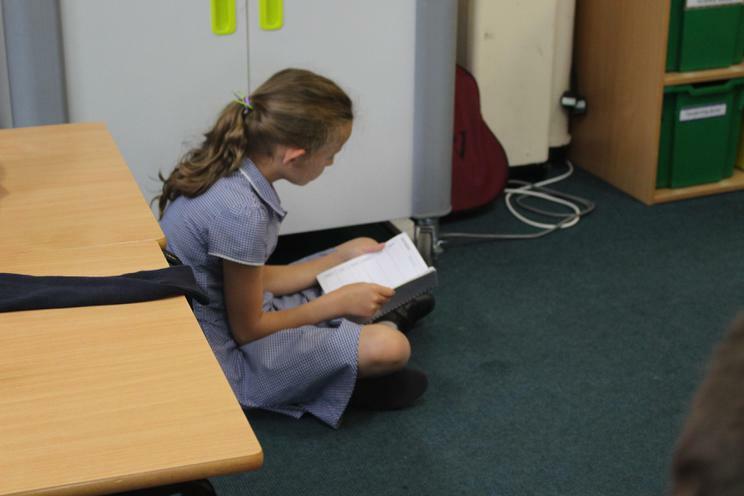 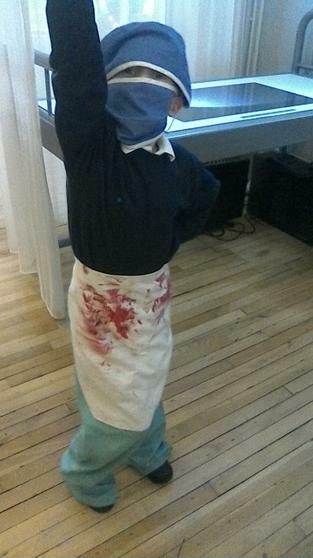 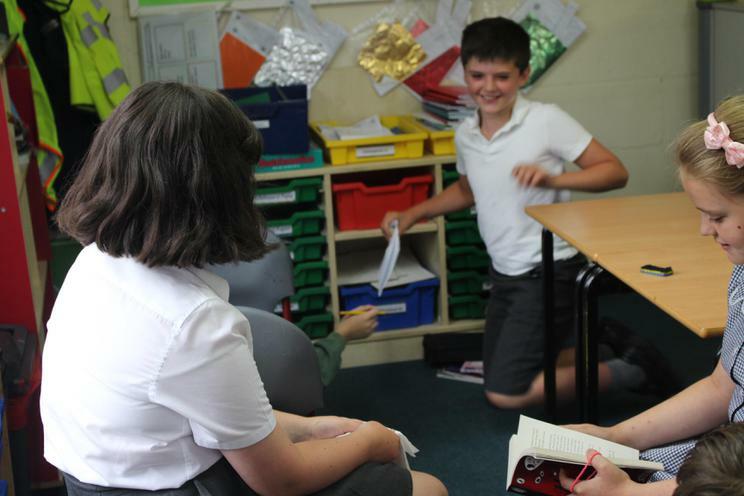 Today, the children took part in re-enacting scenarios based around our latest English work. 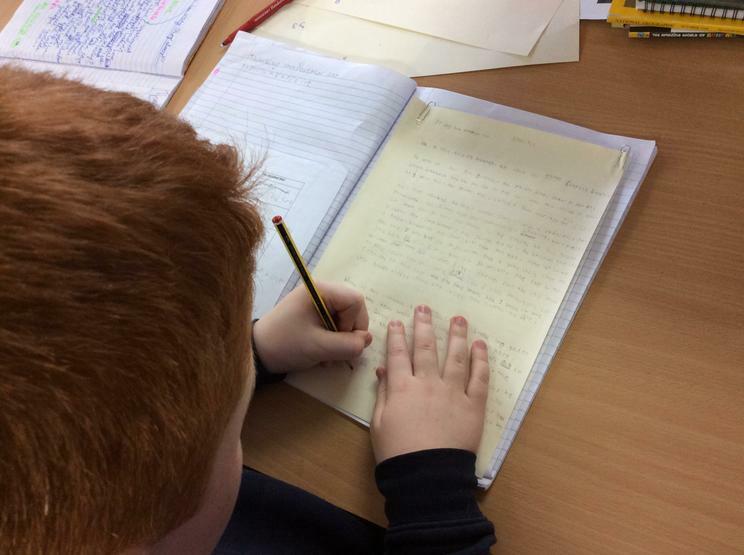 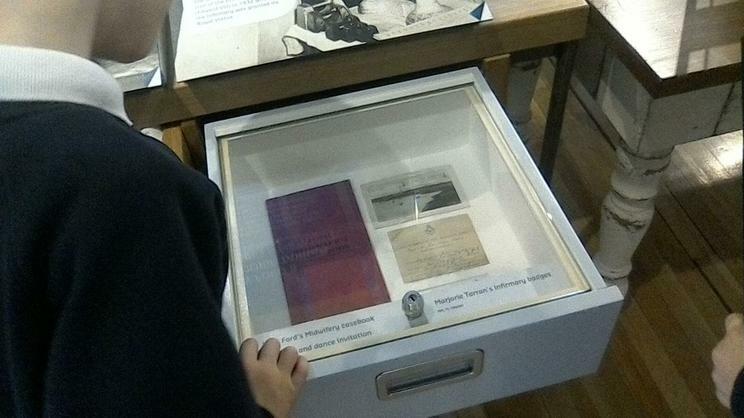 We have been writing diary entries as a young person who is living in Kempsey pre-WW1 and then just as the war starts. 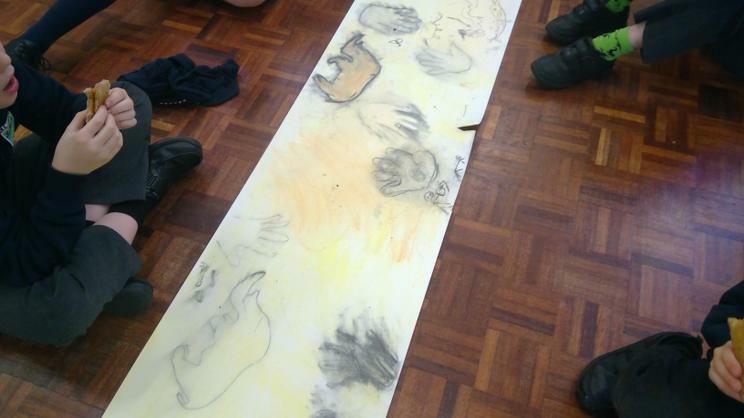 The children really thought about emotion and facial expression as well as body language to convey their meaning. 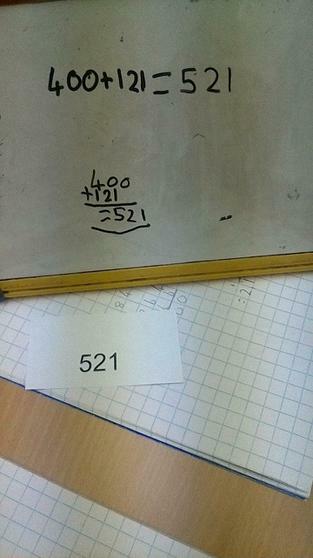 Well done, Oak! 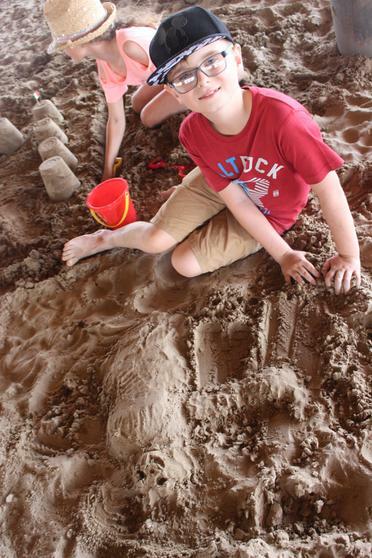 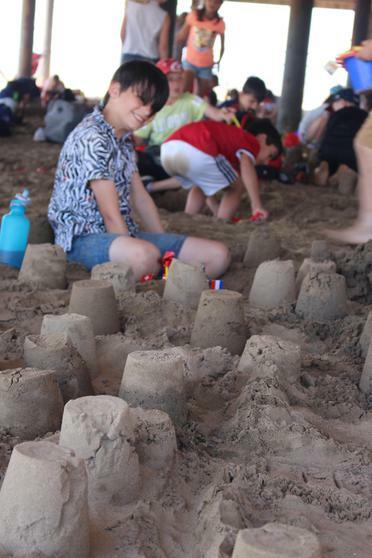 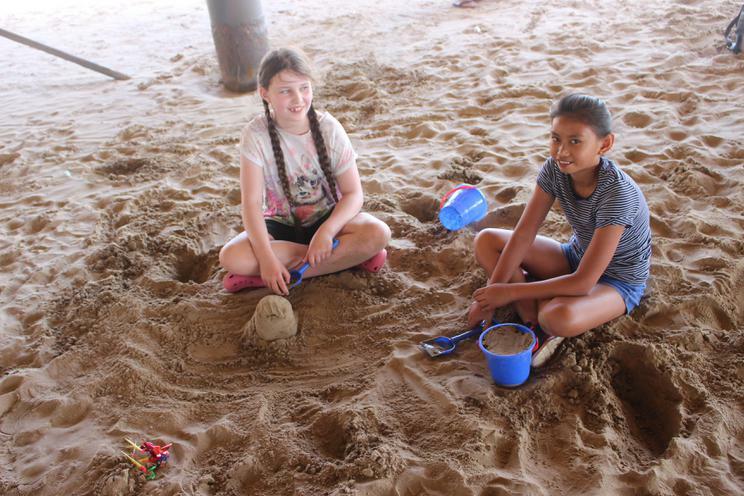 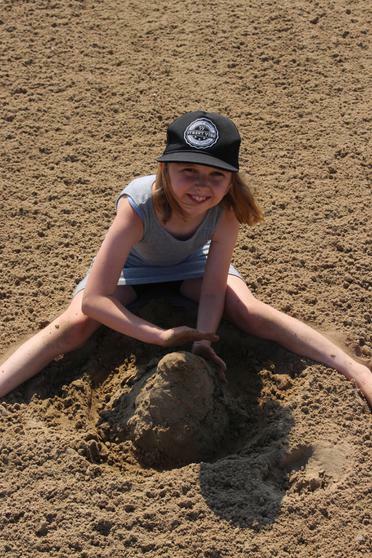 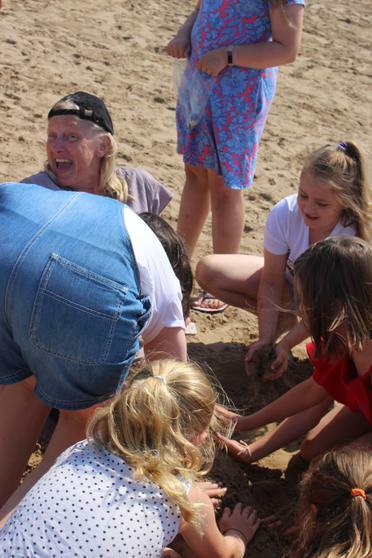 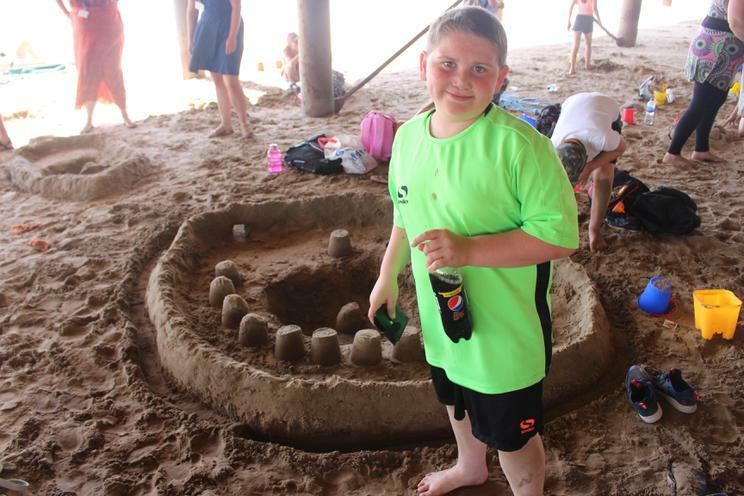 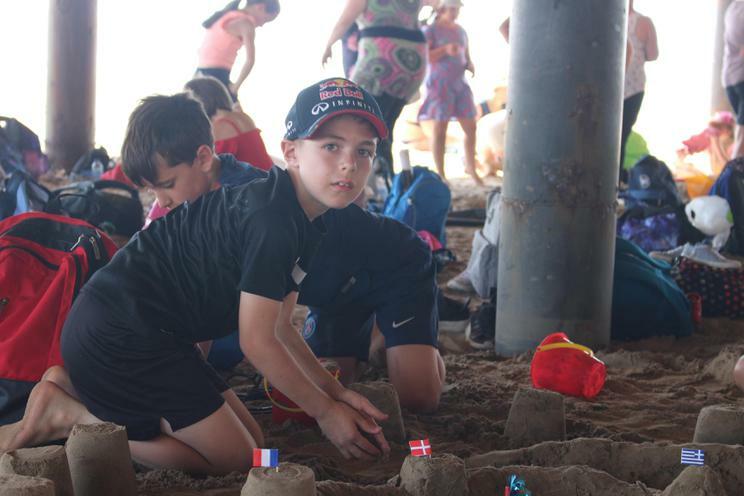 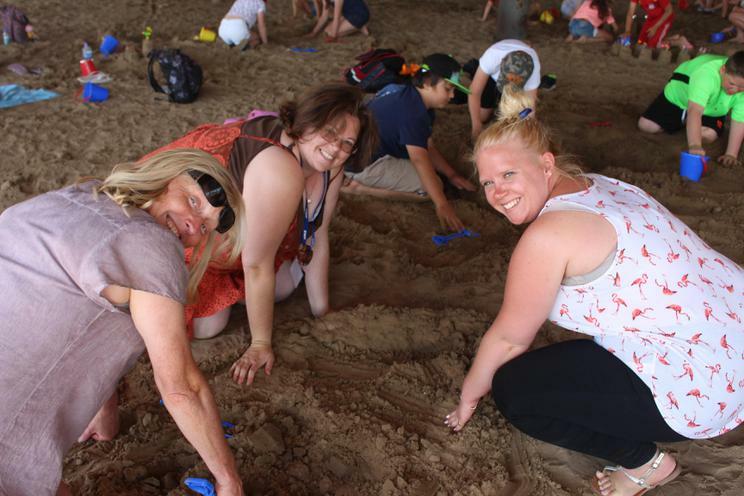 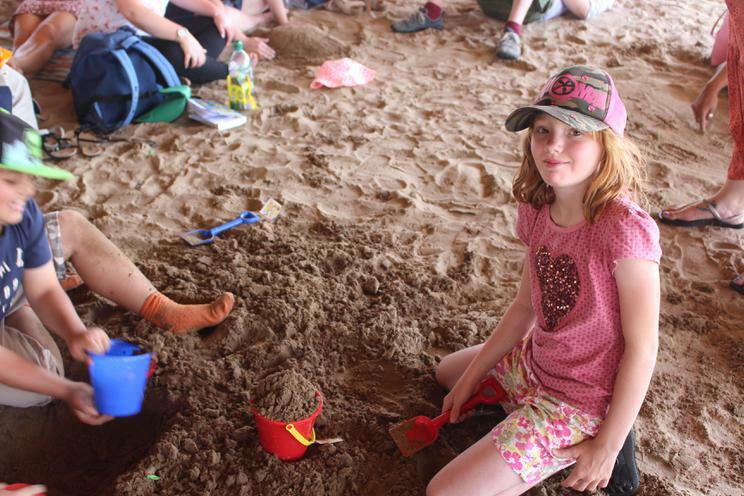 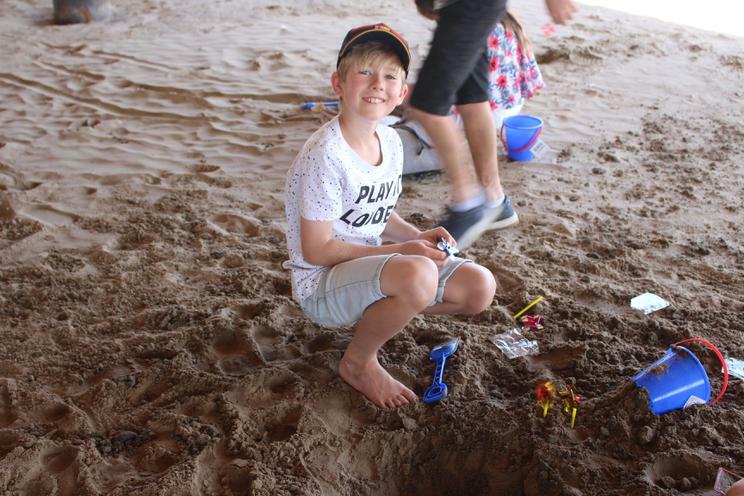 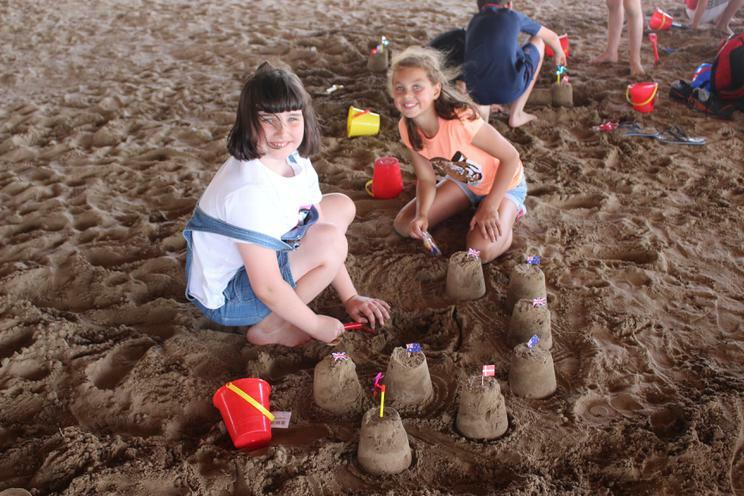 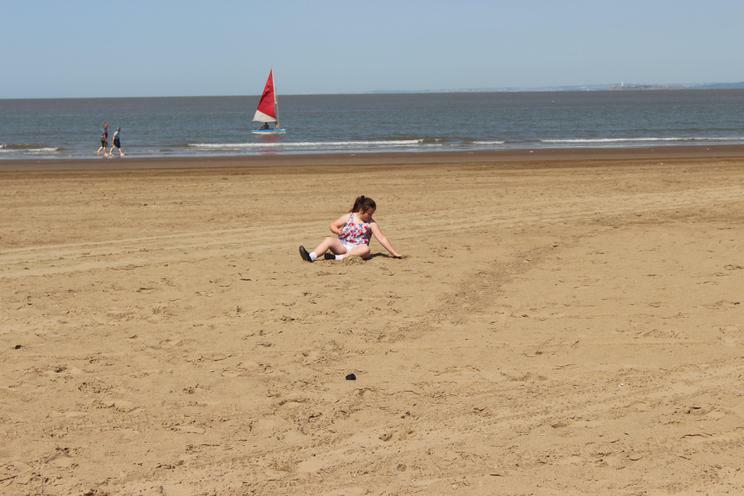 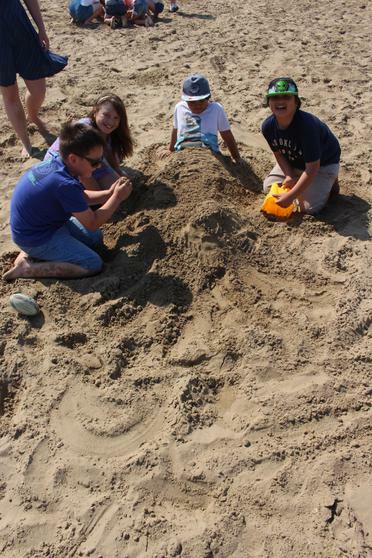 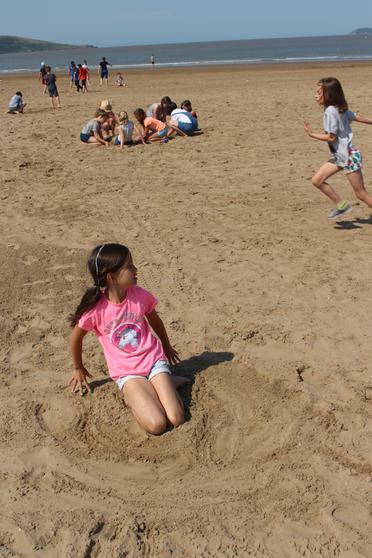 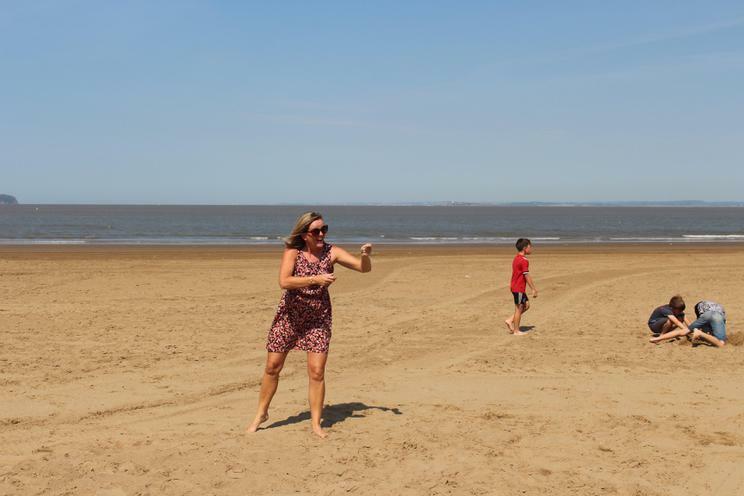 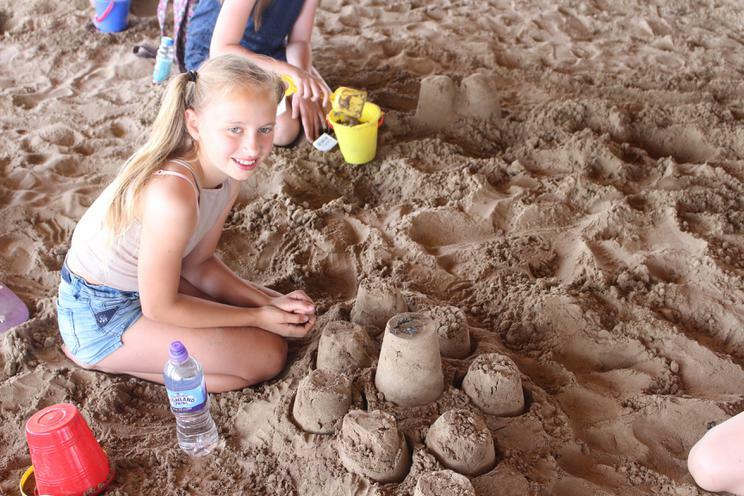 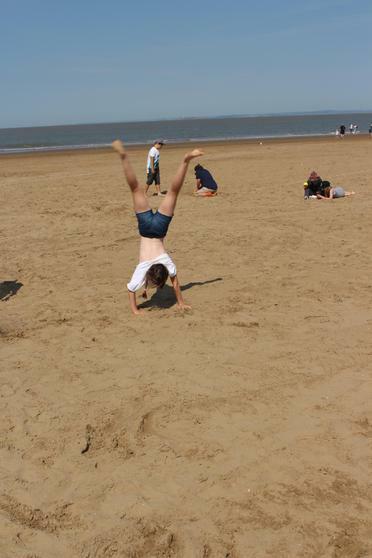 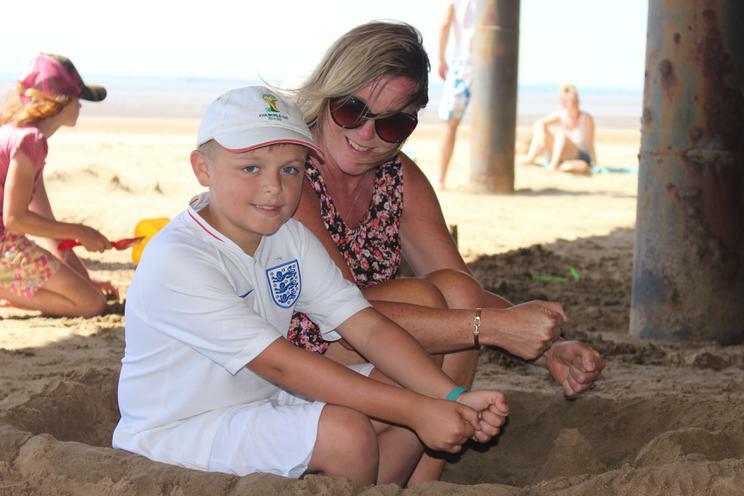 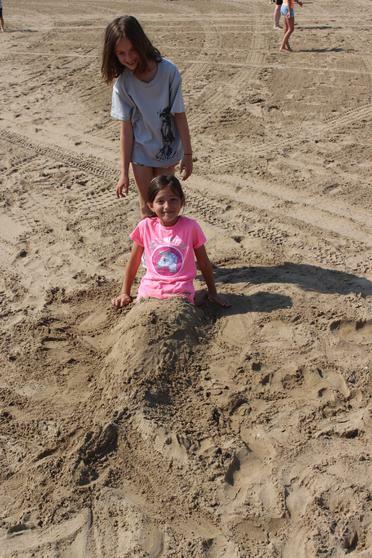 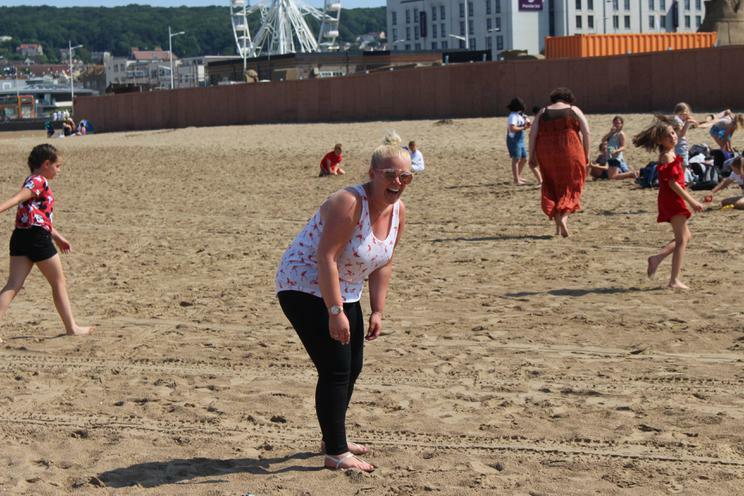 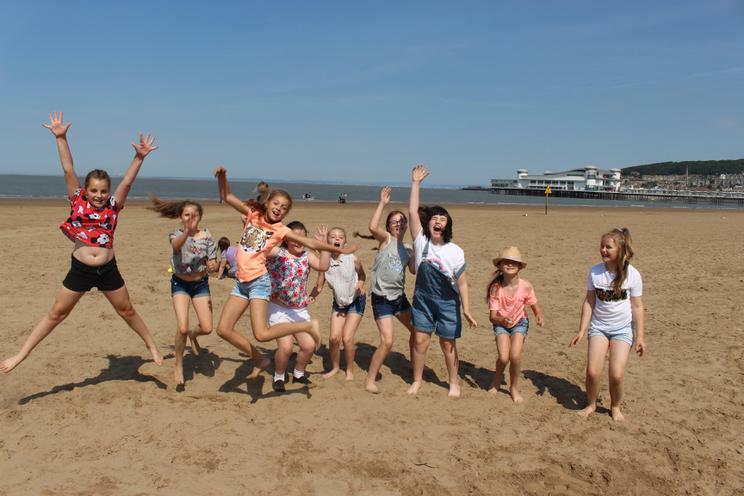 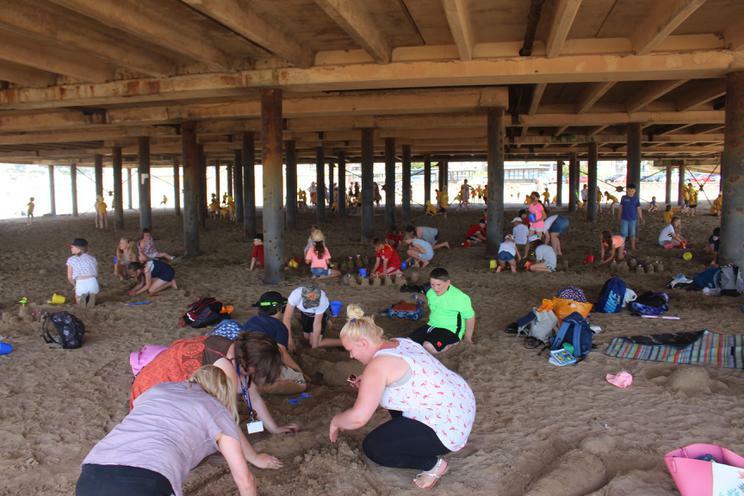 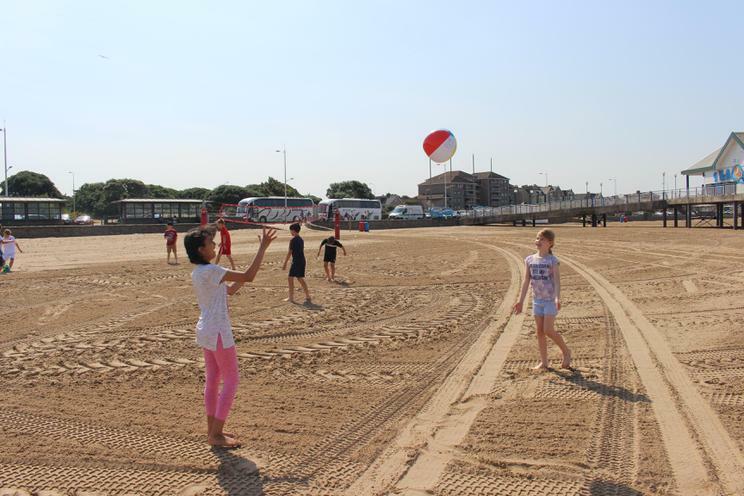 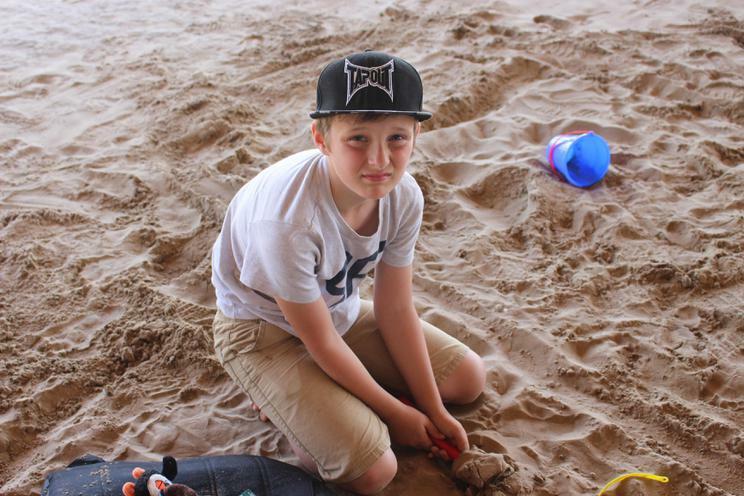 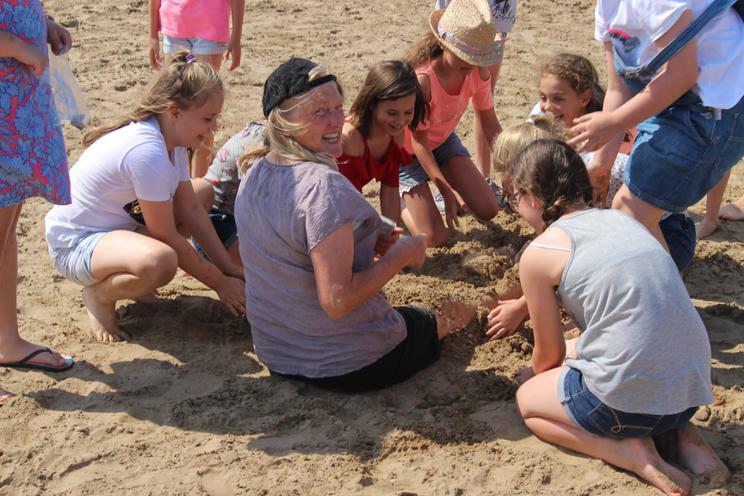 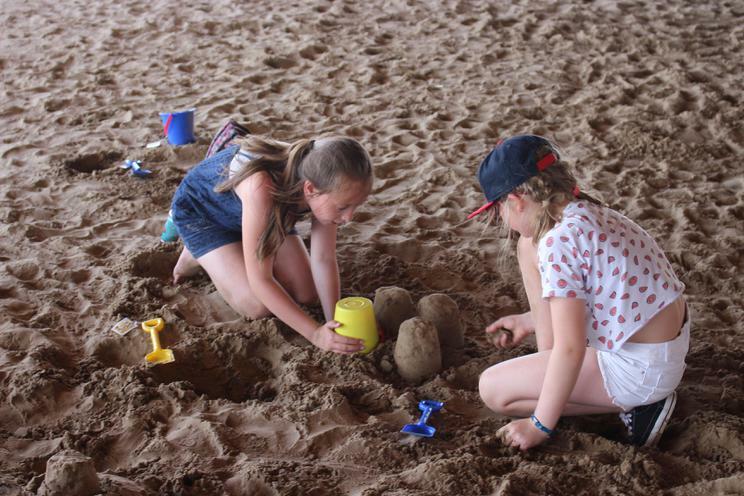 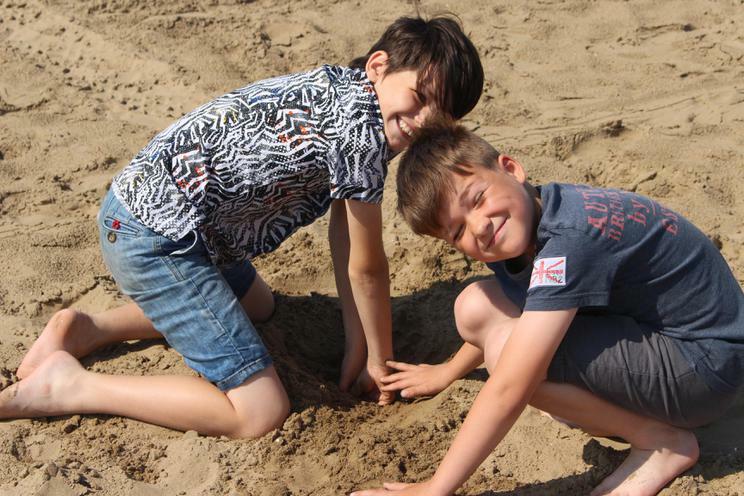 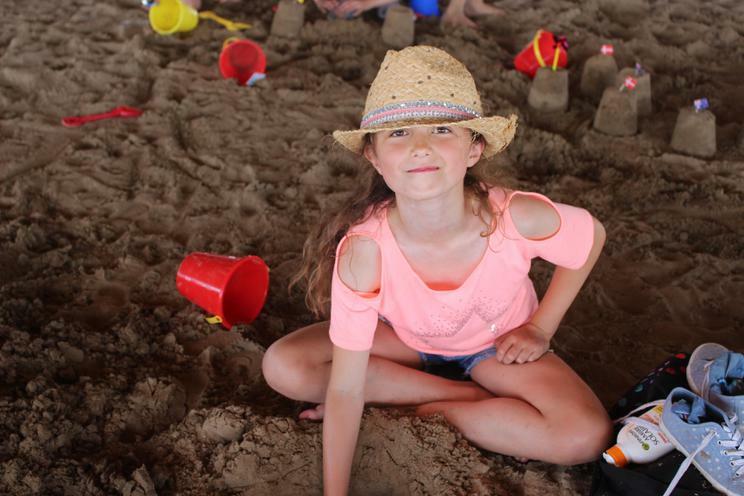 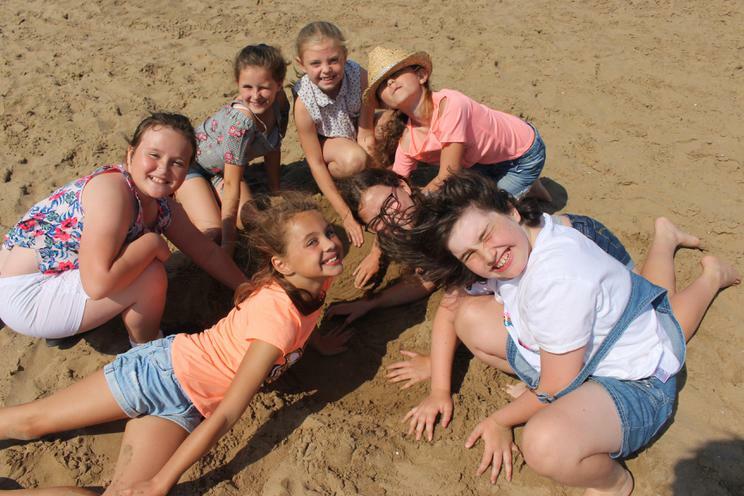 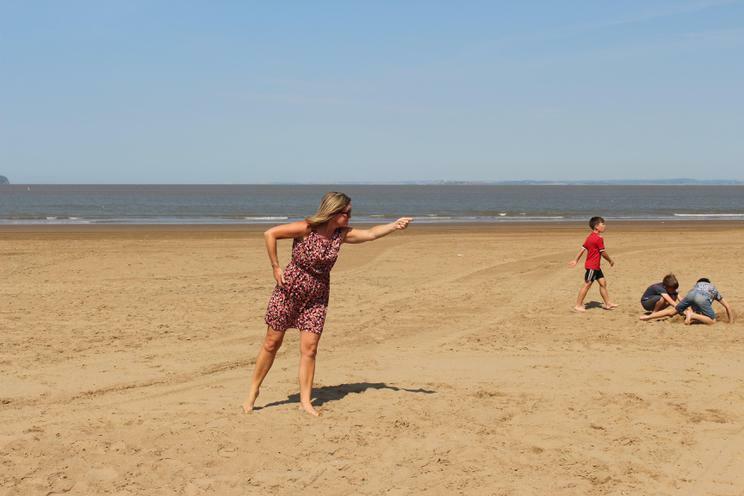 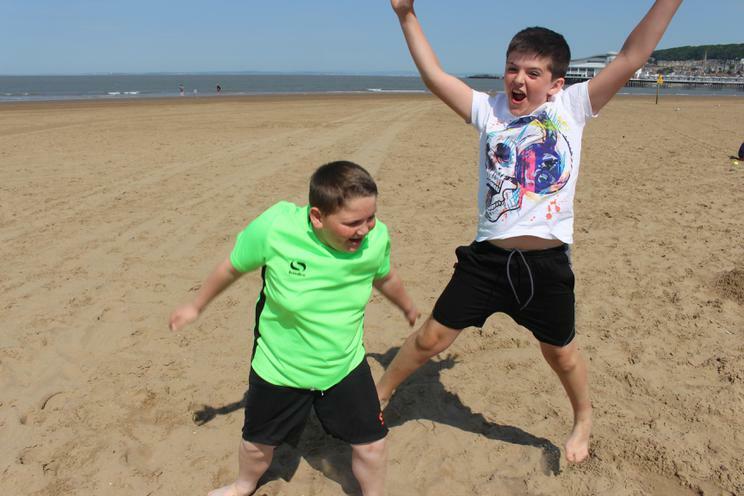 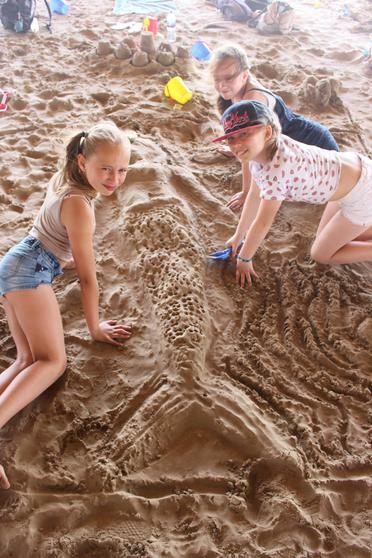 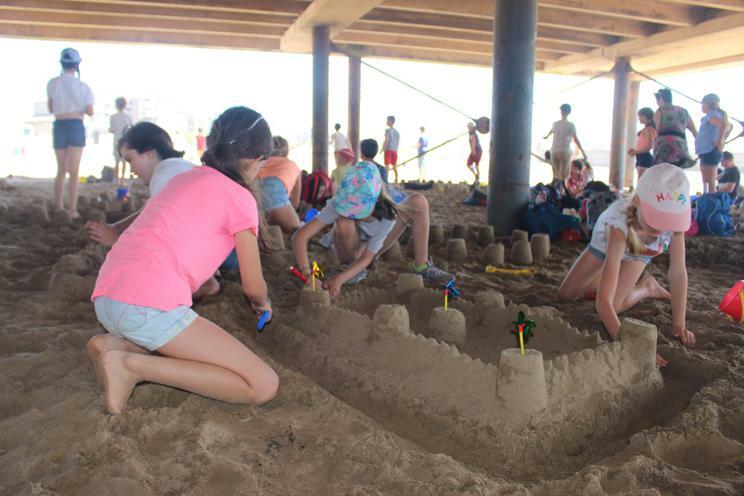 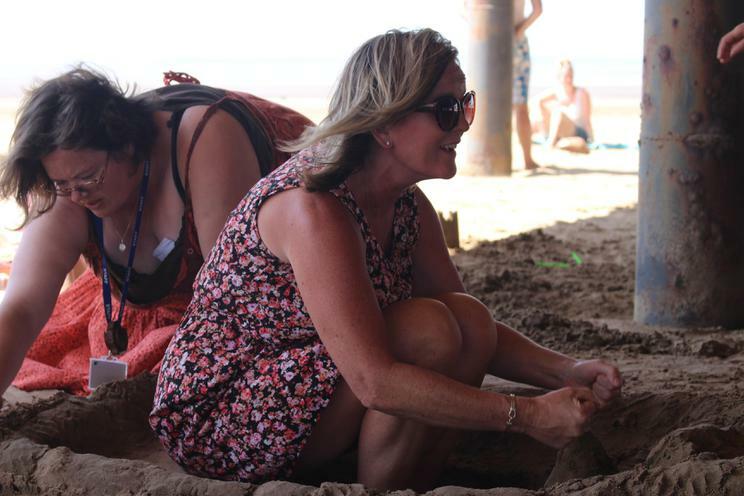 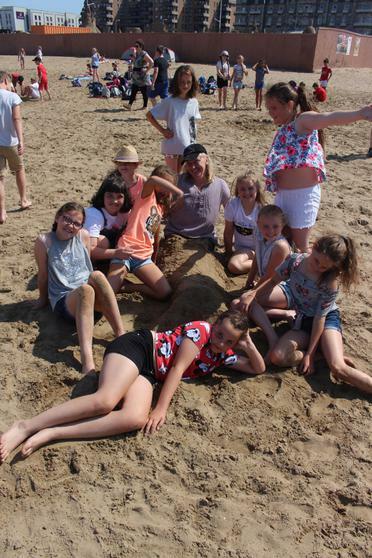 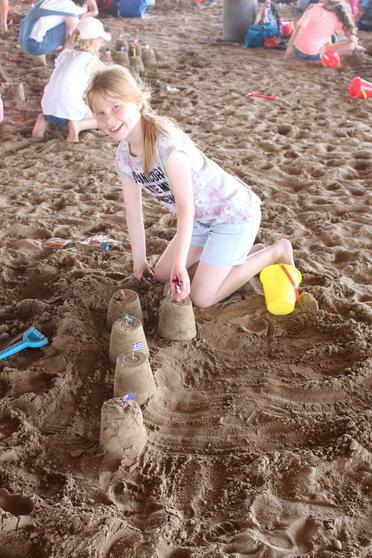 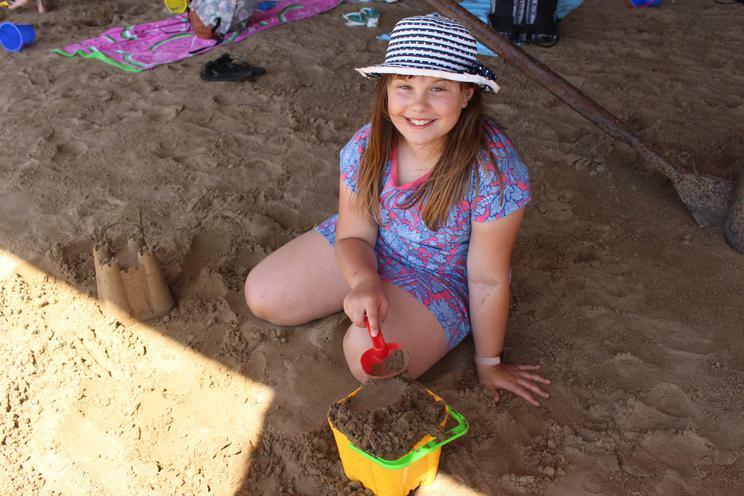 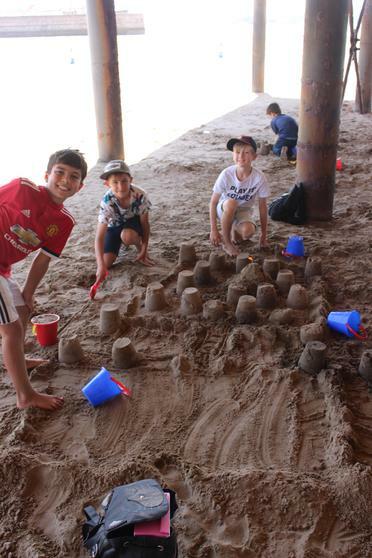 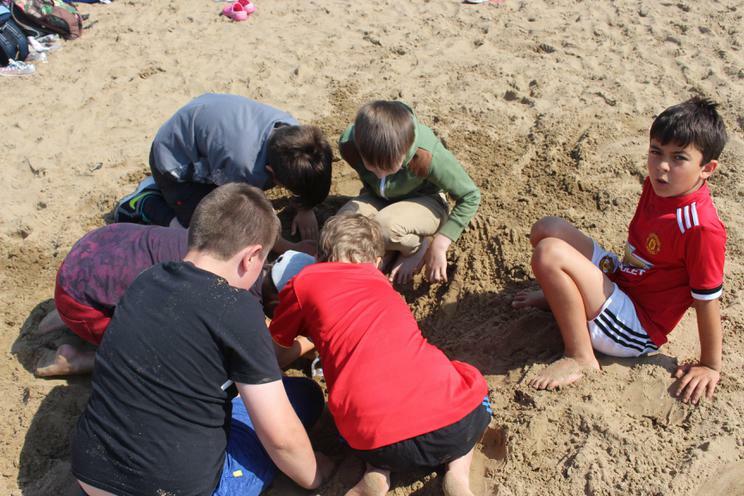 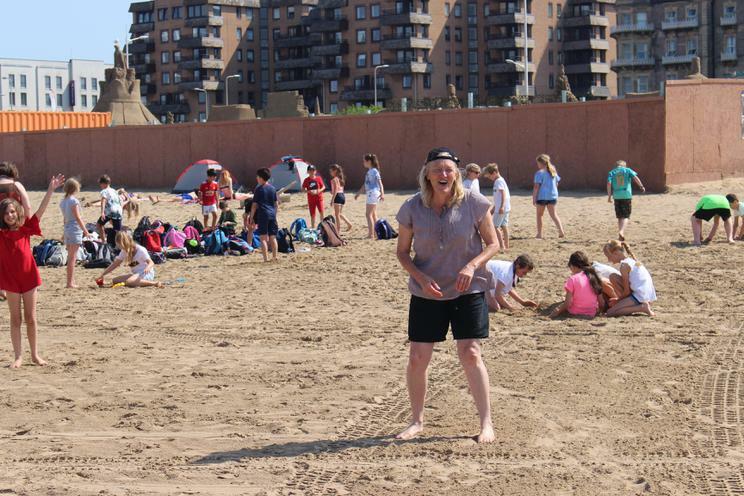 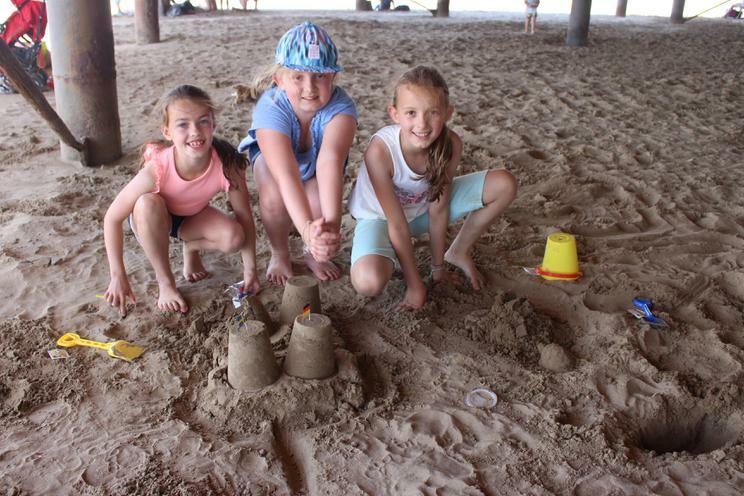 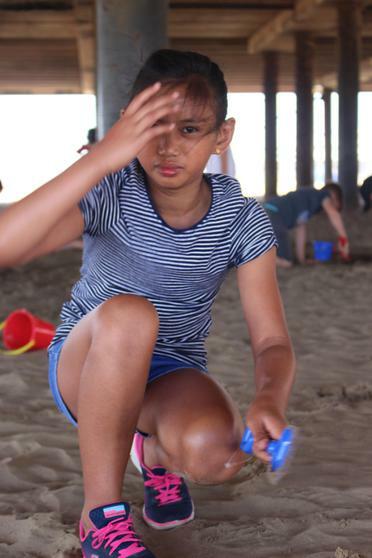 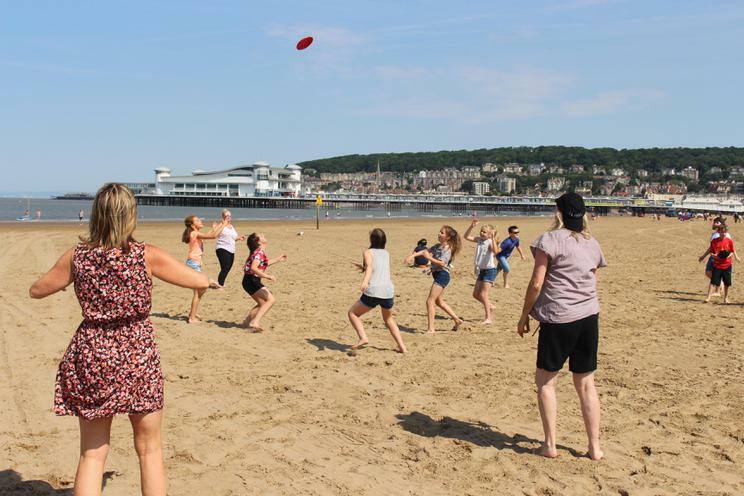 The children (and staff) had a wonderful, sunny day at the seaside where we played frisbee, looked at a stunning array of sea life a the aquarium, gobbled up fish and chips (whilst fighting off the seagulls) and having a sandcastle competition! 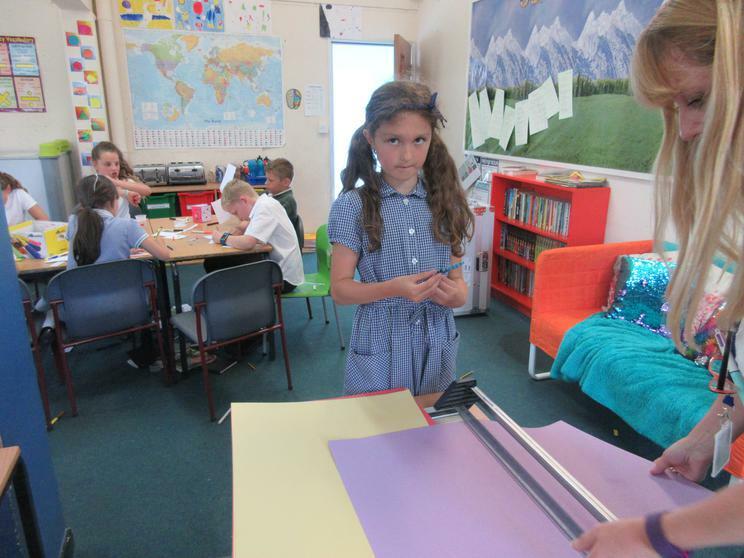 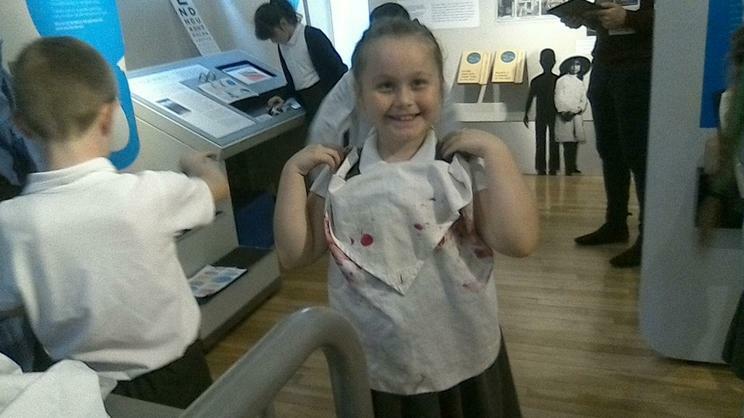 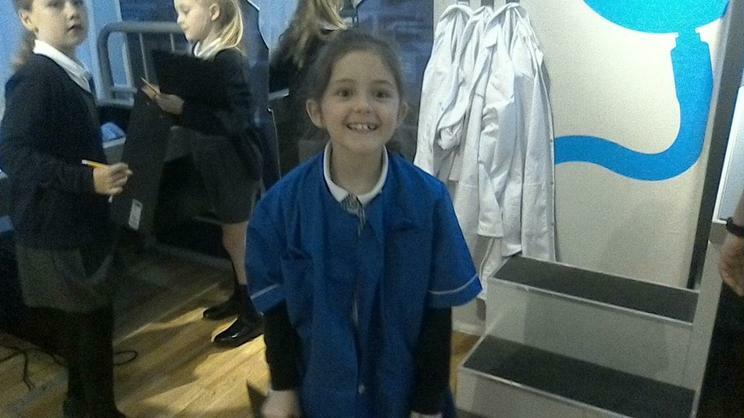 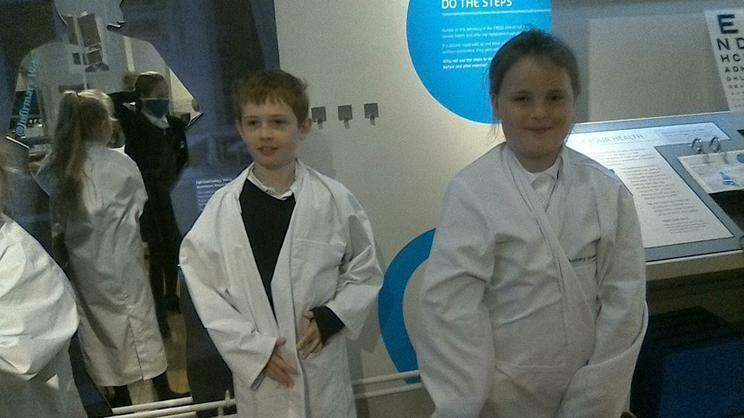 We had a very busy day and the children behaved fantastically - they made Kempsey proud! 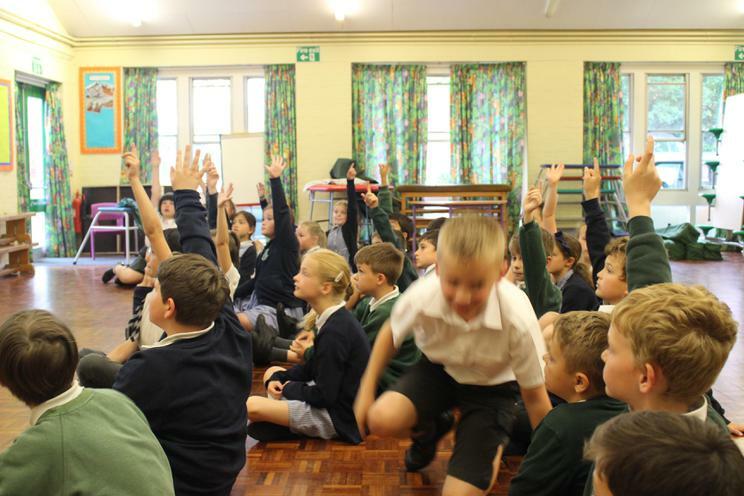 This week, the whole school have welcomed iSingPop into Kempsey to sing and dance to a variety of pop songs! 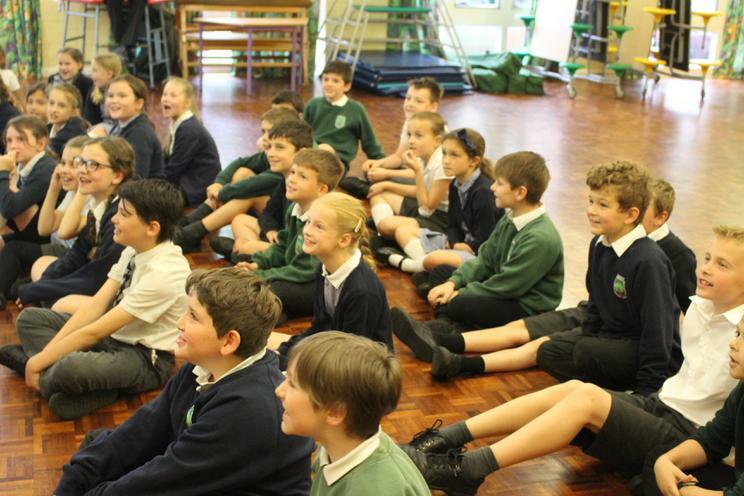 The children have shown great enthusiasm and have listened well to the songs. 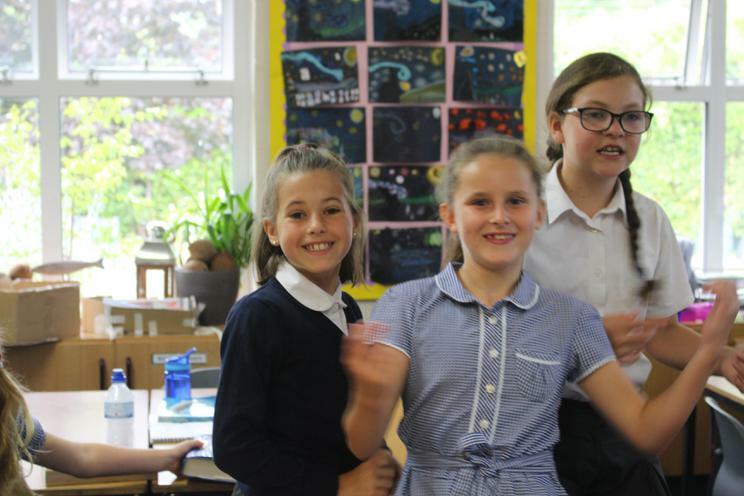 We are very much looking forward to recording our own CD as well as performing in a concert next Tuesday. 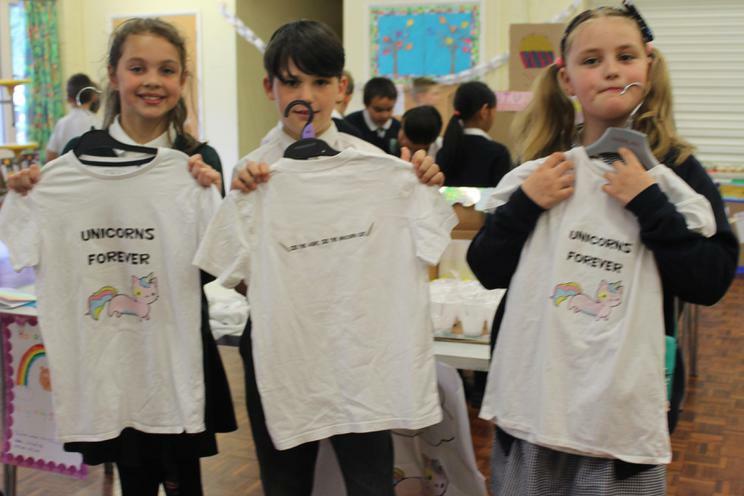 The children have the availability to by an iSingPop t-shirt either before the evening concert or afterwards and they are allowed to wear this t-shirt at the evening concert. 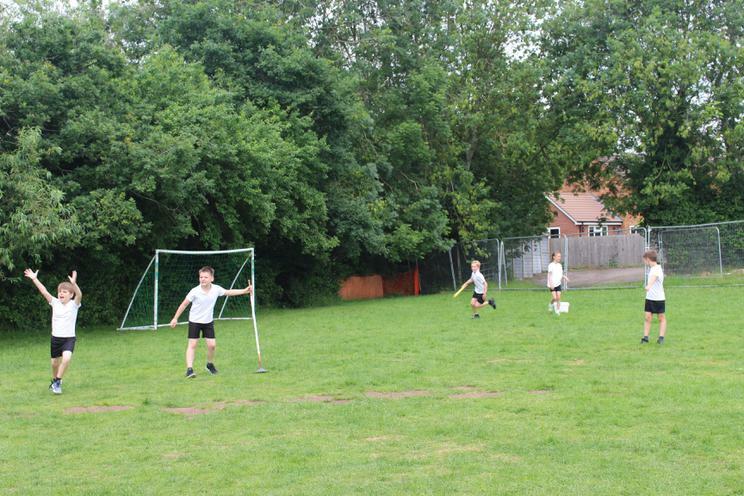 If not, a bright coloured t-shirt should be worn. 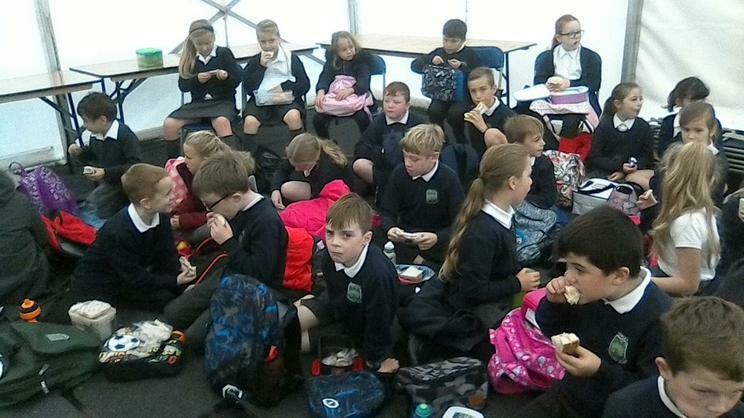 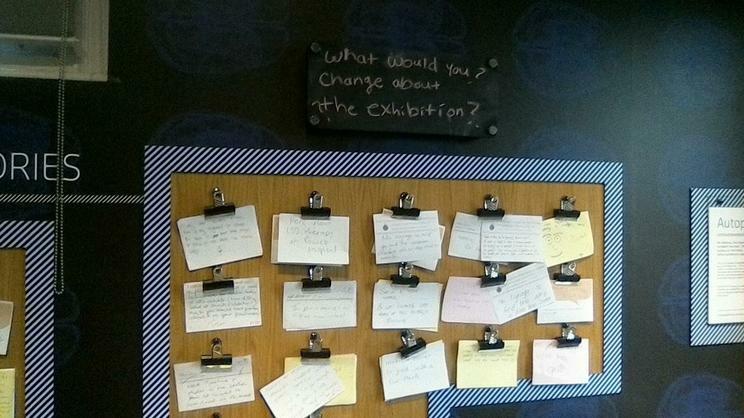 It's proving to be an exciting, jam-packed week and it's only Wednesday! 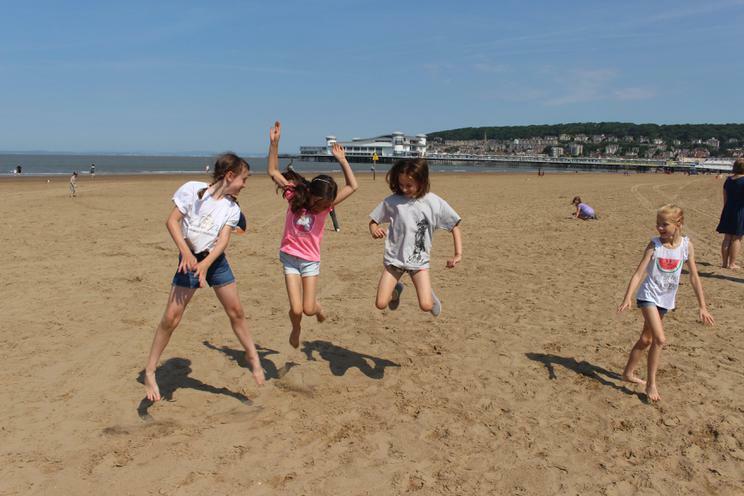 We are very much looking forward to our trip on Monday and we are hoping to have some wonderful sunshine! 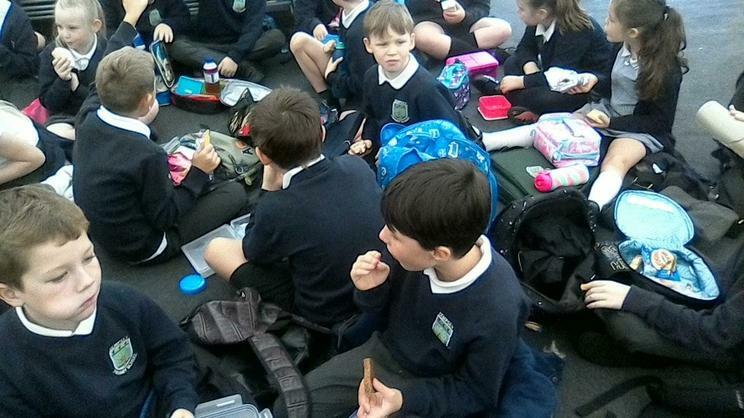 The children will be provided with a seaside lunch, which I am sure they will enjoy. 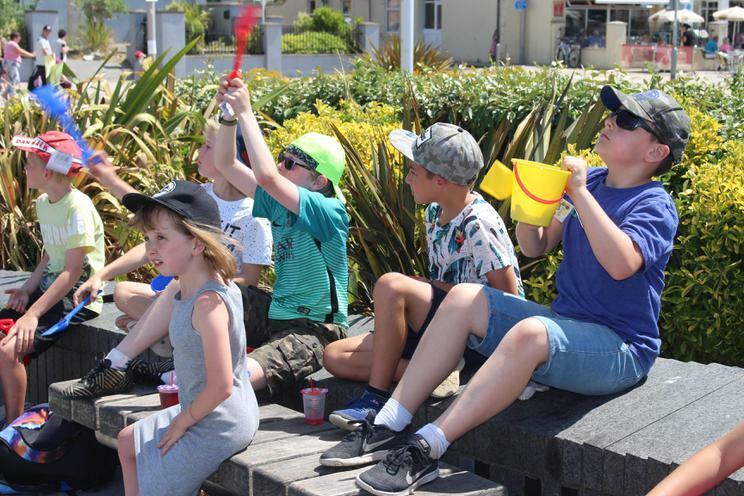 The coach will be leaving at 8.30am and we will be back by 5.00pm. 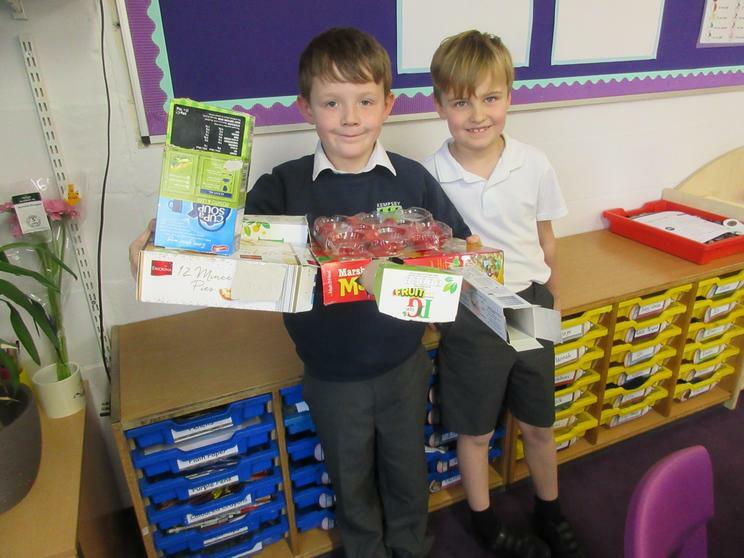 The children will need to bring snacks with them as well plenty of drink, which should be brought in a backpack. 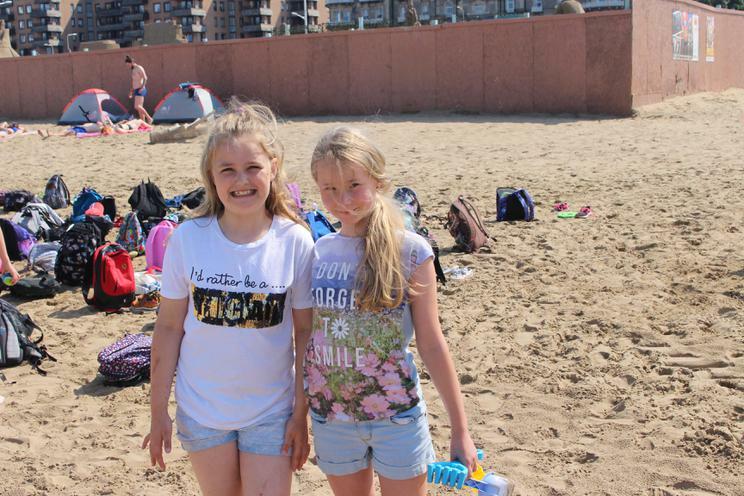 Suitable clothing should be worn and sun tan lotion should be packed with them if needed. 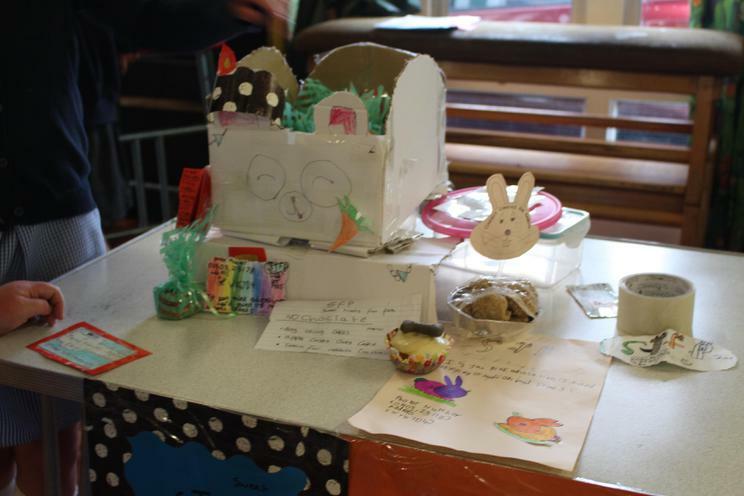 As well as this, the children can bring NO MORE than £5 spending money. 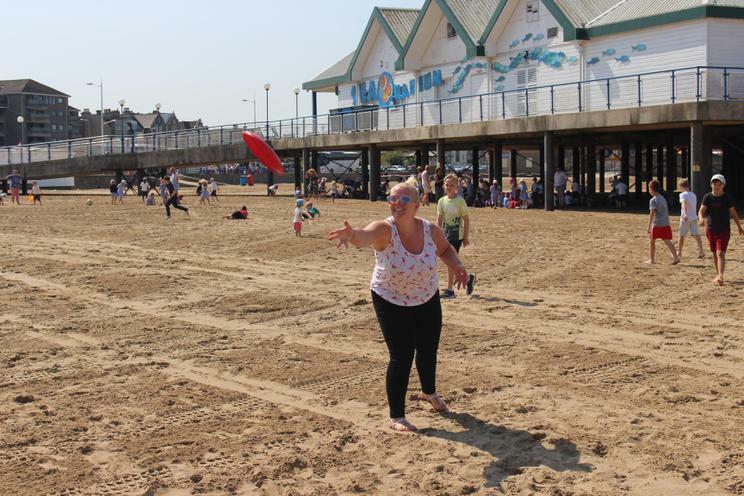 "Oh I do like to be beside the seaside...!" 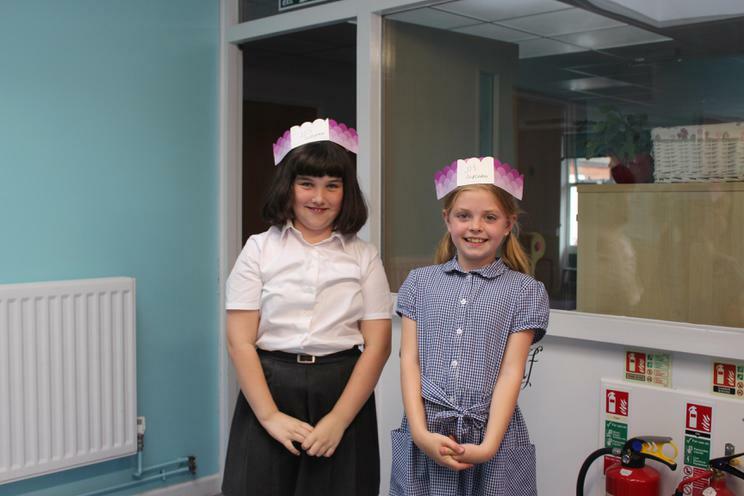 Our year 4's are off to the Language Festival today - they have been very much looking forward to it all week! 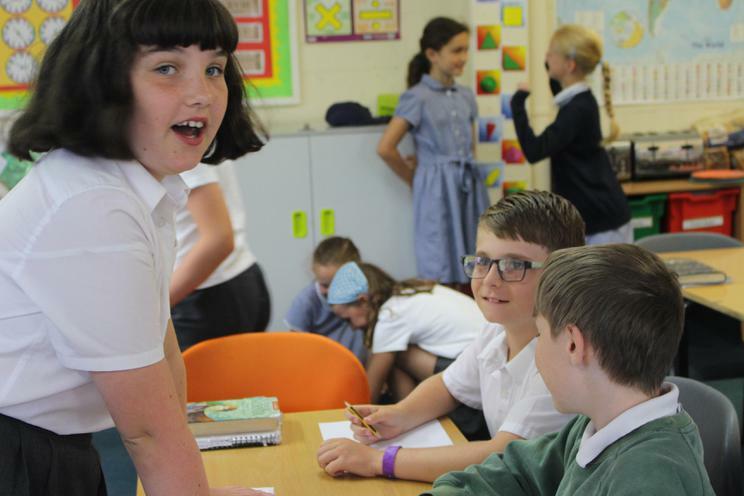 There are plenty of events going on and we look forward to hearing about the vast number of languages they have looked at over the course of the day! 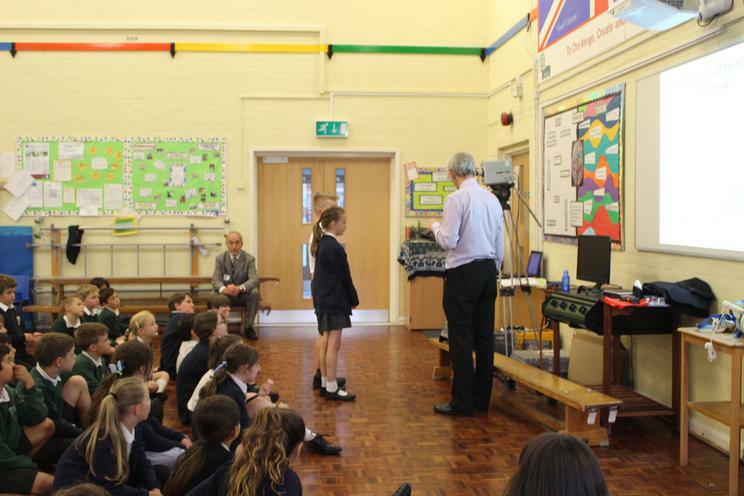 On Wednesday, the whole school was involved in a singing assembly and everyone did fantastically. 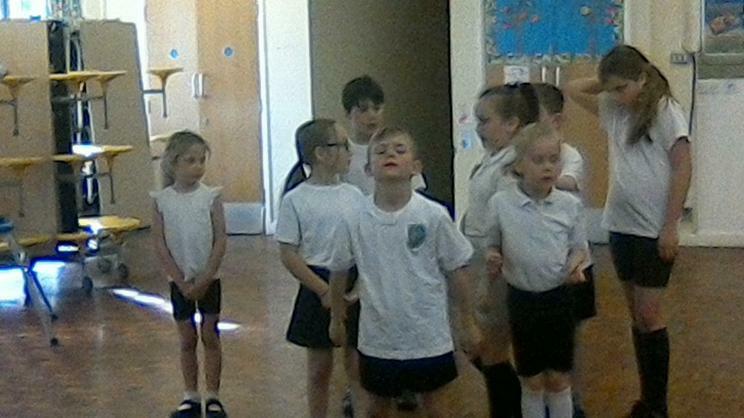 The children in Oak decided that they would like to sing 'This Is Me' and they really shone! 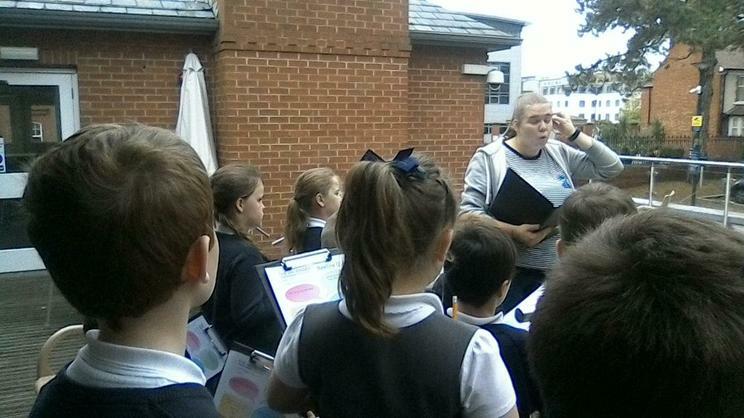 Many staff members have commented on how beautifully they sang and the enthusiasm they showed...well done, Oak! 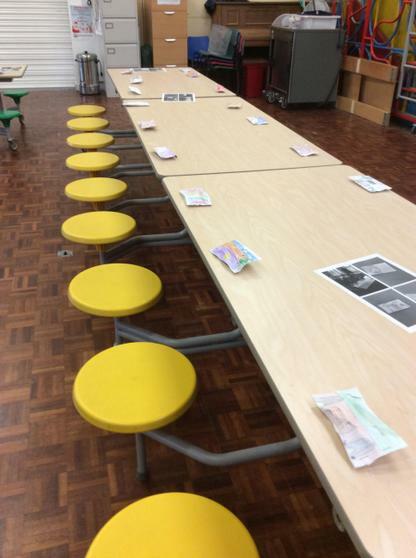 Preparing for our Stand Up To Cancer cafe! 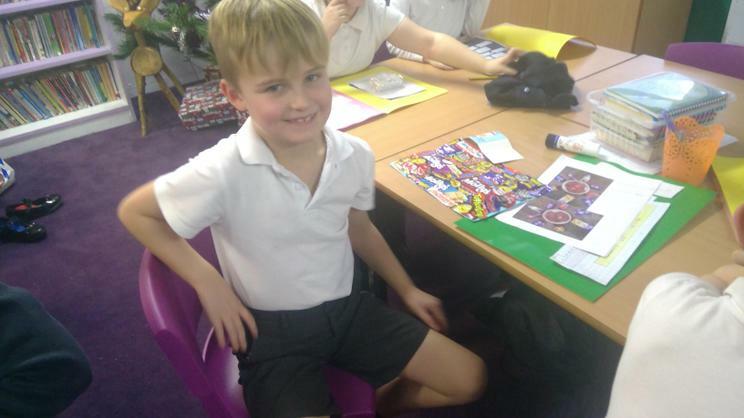 This afternoon, Oak class have been having a productive afternoon getting ready for the Stand Up To Cancer cafe that is being held on Monday next week. 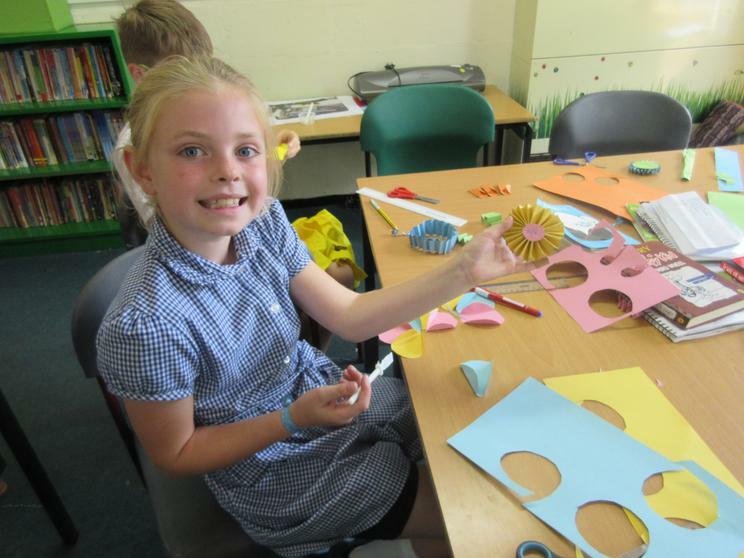 The children have gotten really creative and have made some beautiful centre pieces that they should be very proud of! 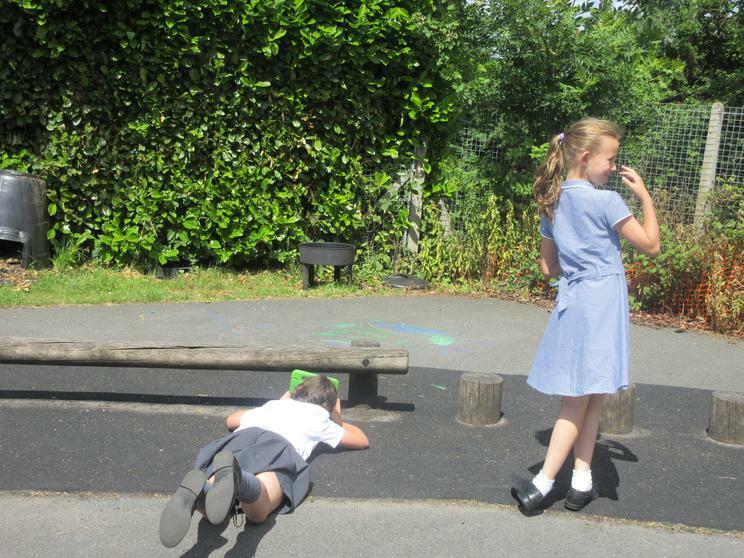 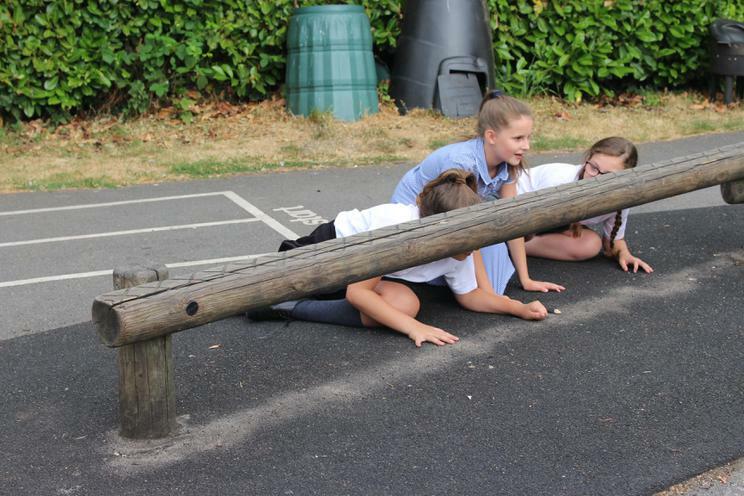 Today we have been searching for angles in our playground! 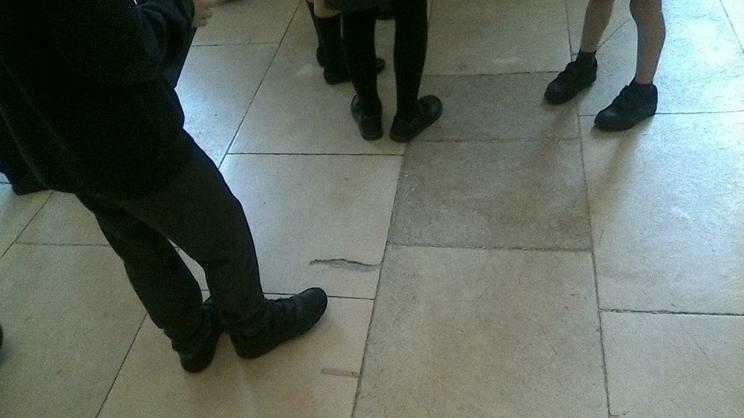 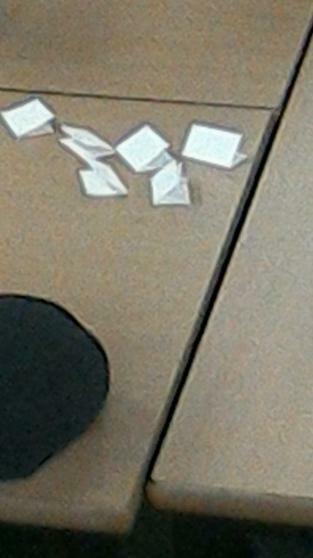 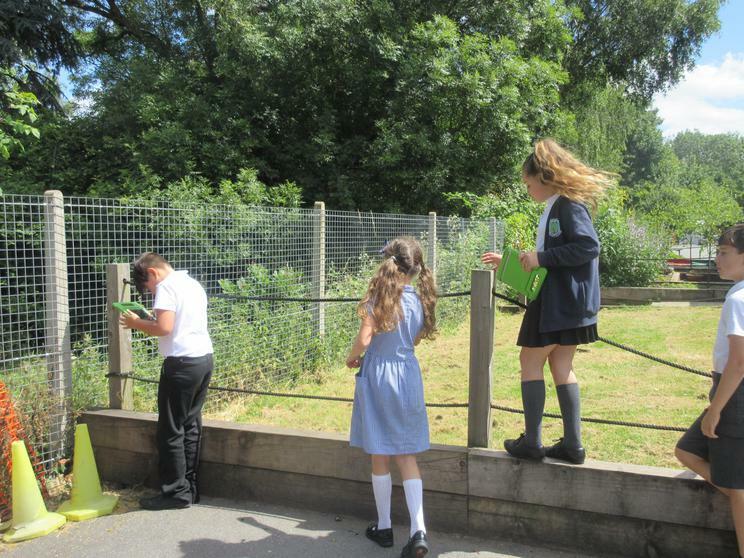 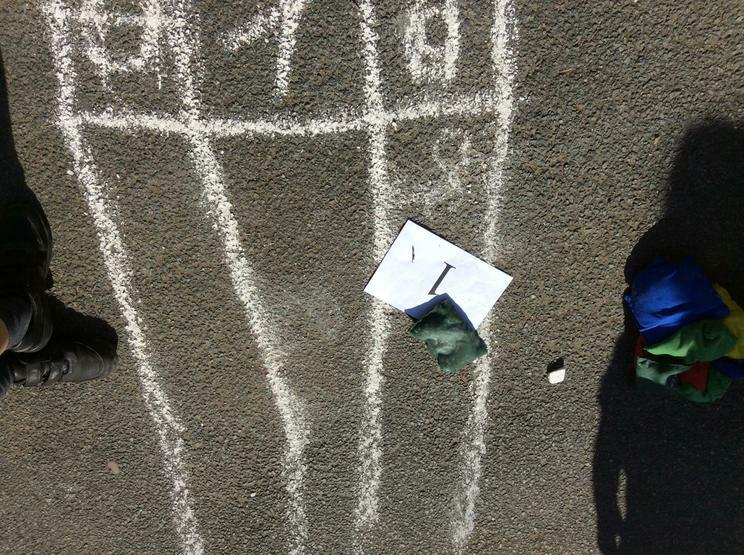 The children were looking for acute, right, obtuse and reflex angles in a variety of objects that we come across daily. 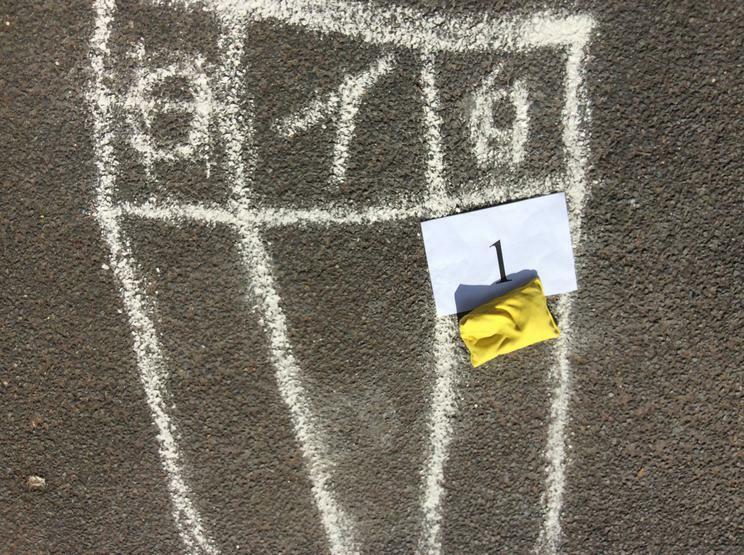 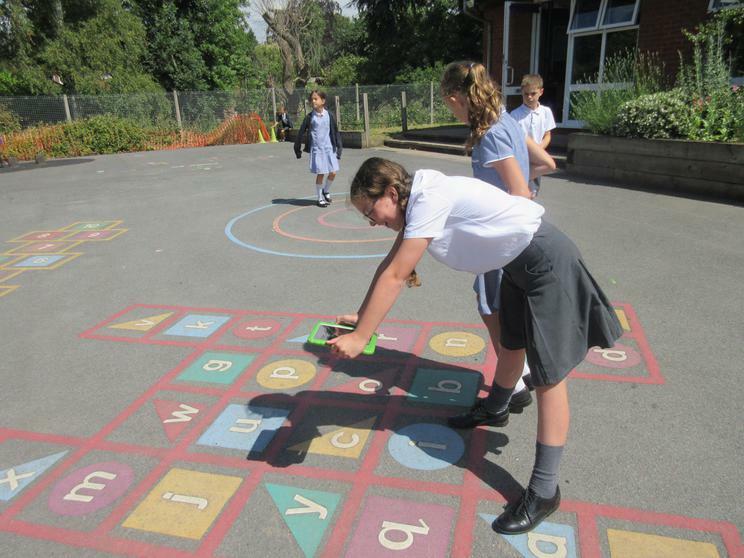 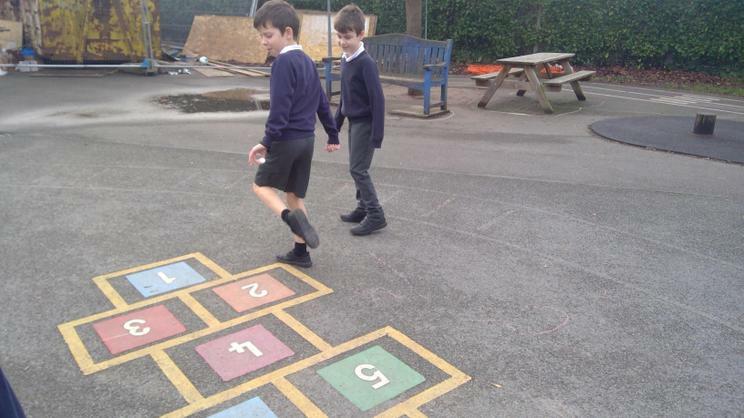 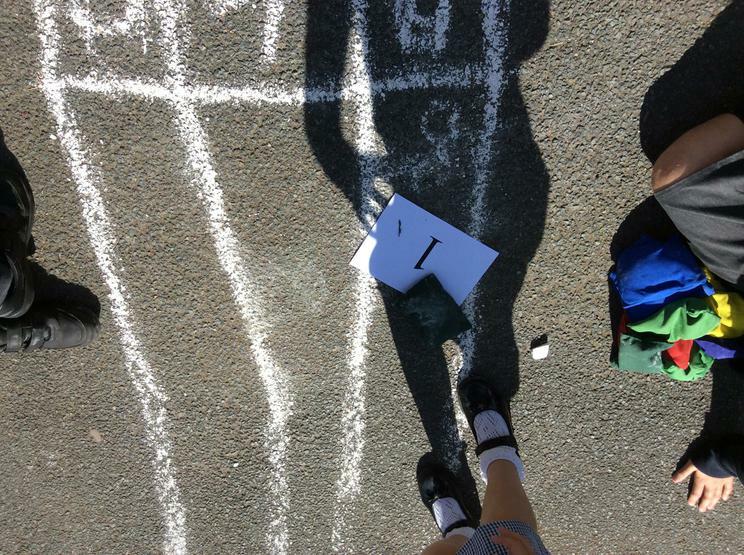 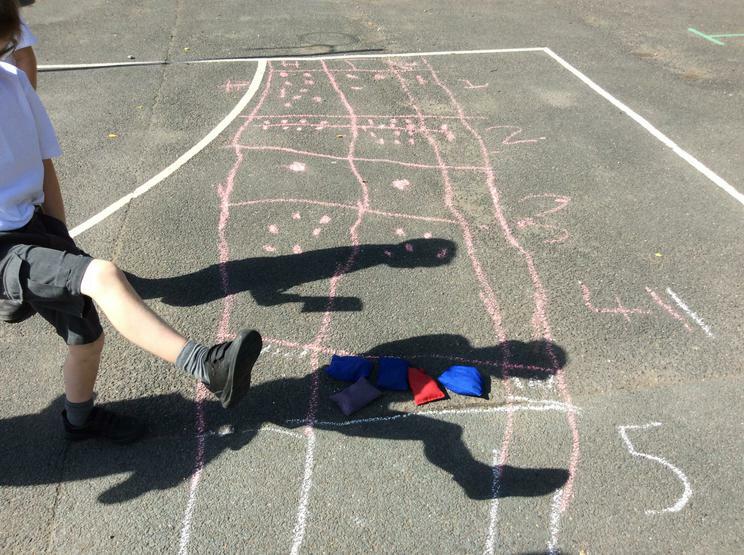 We found angles in the windows, hop-scotch, posts and even found right angled triangles on a game on the playground! 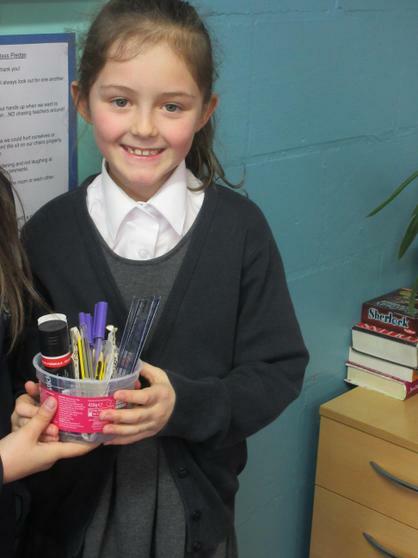 * anyone who may want to do a bit of DIY! 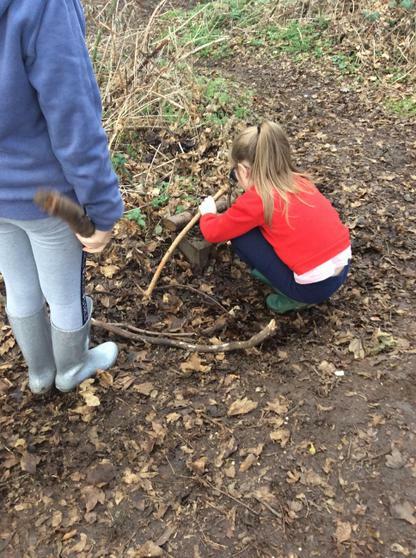 We had a great, productive morning and the children worked exceptionally hard! 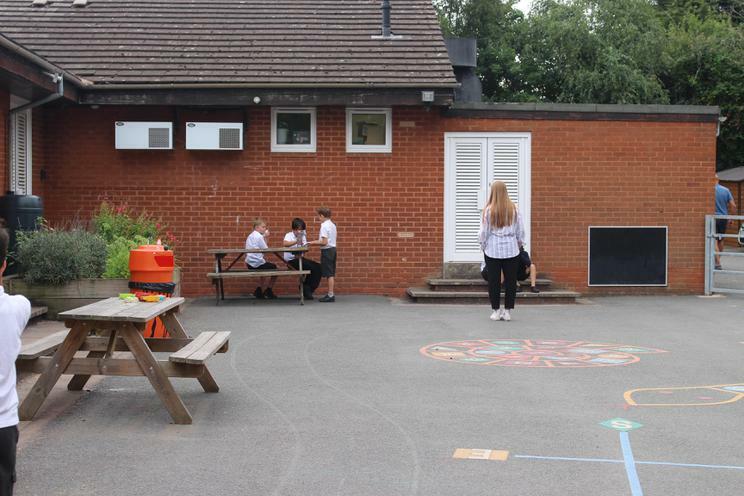 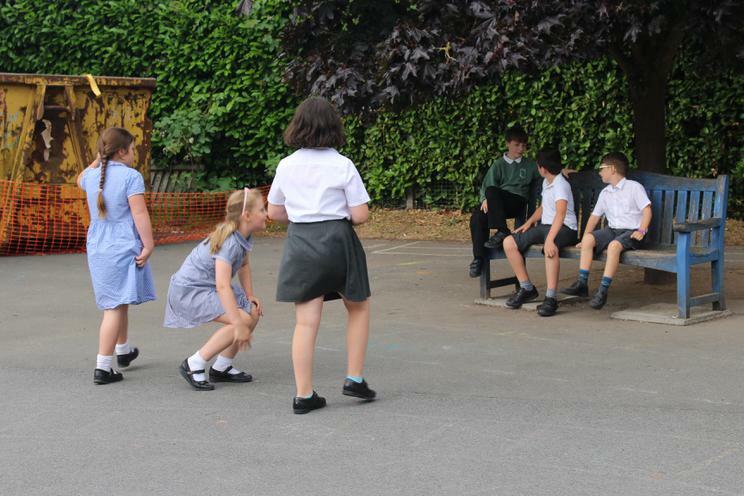 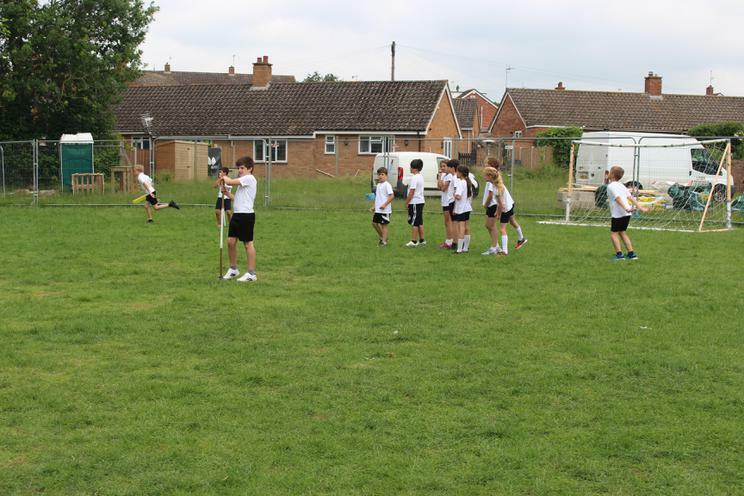 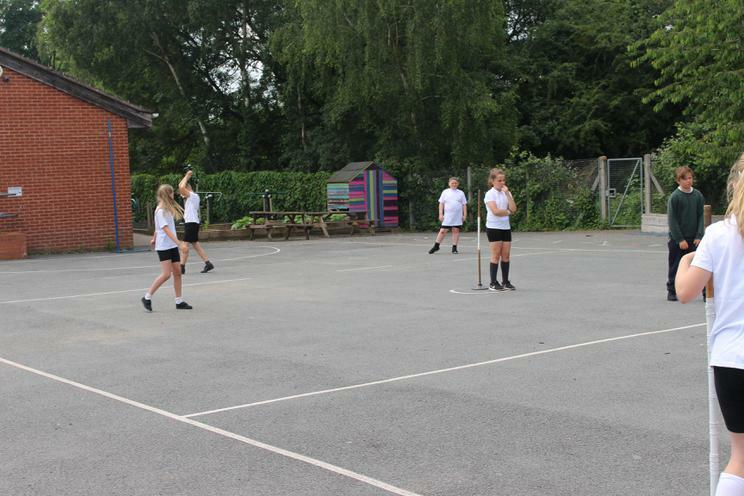 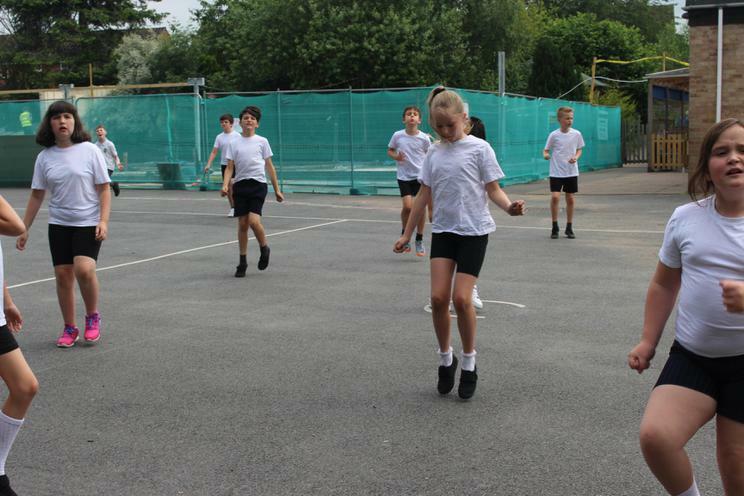 This afternoon, the children went outside to play some rounders. 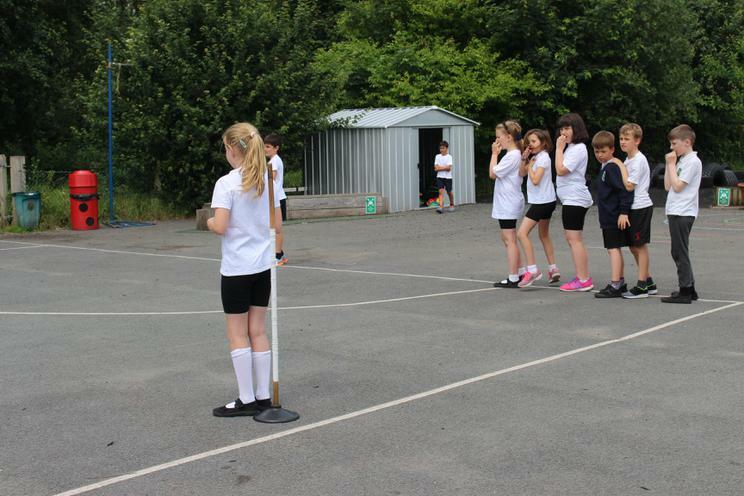 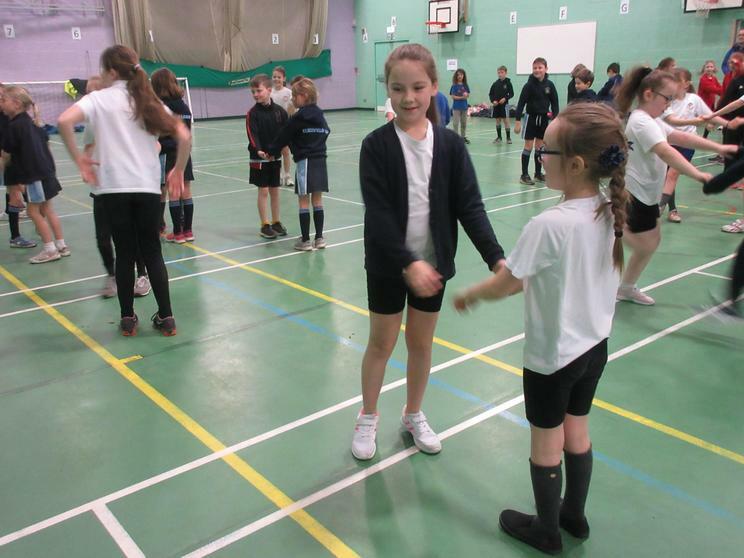 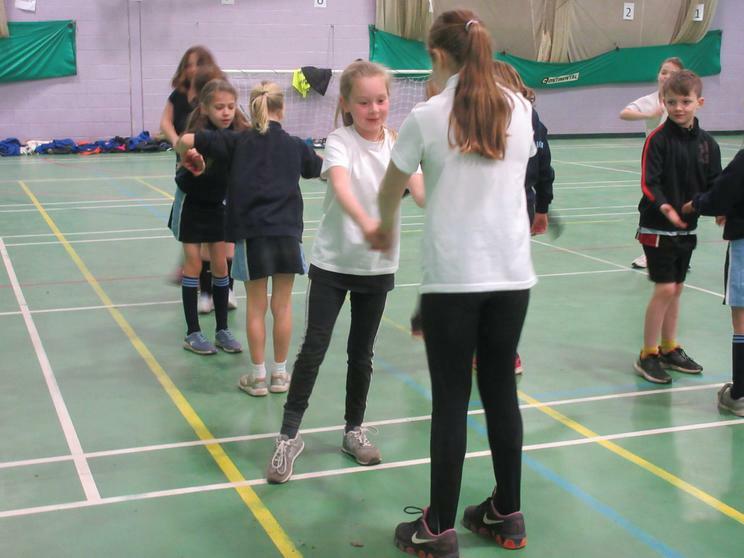 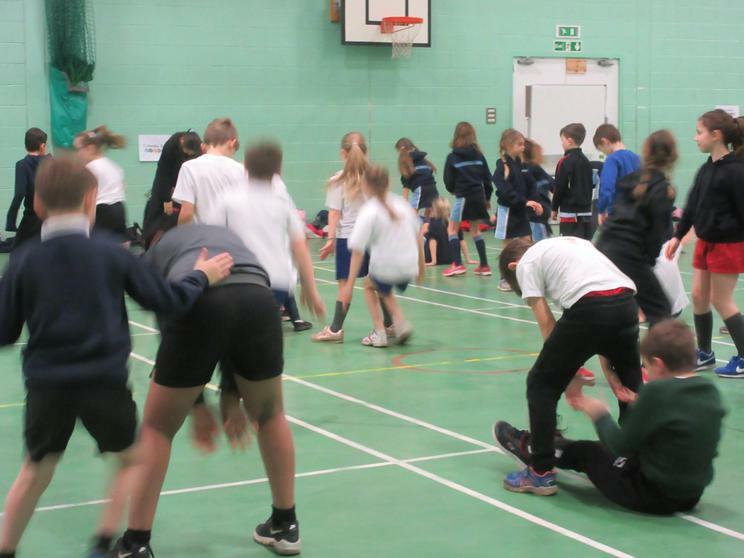 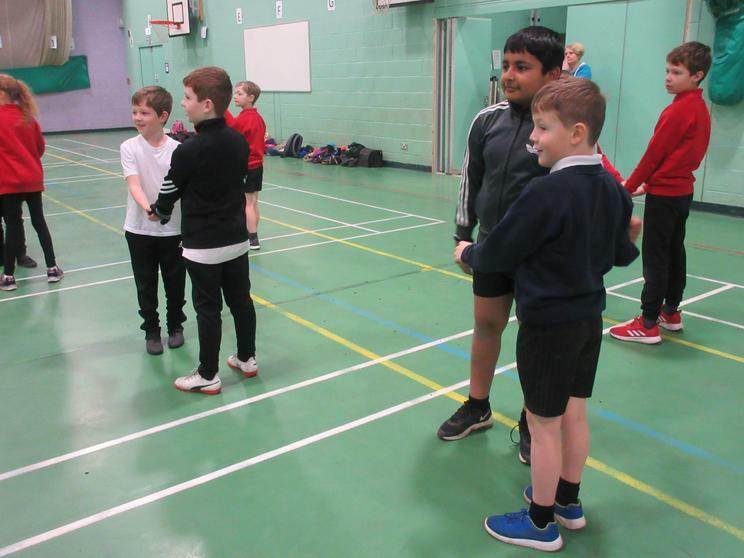 We created two separate games and allocated children to start by fielding, batting or bowling. 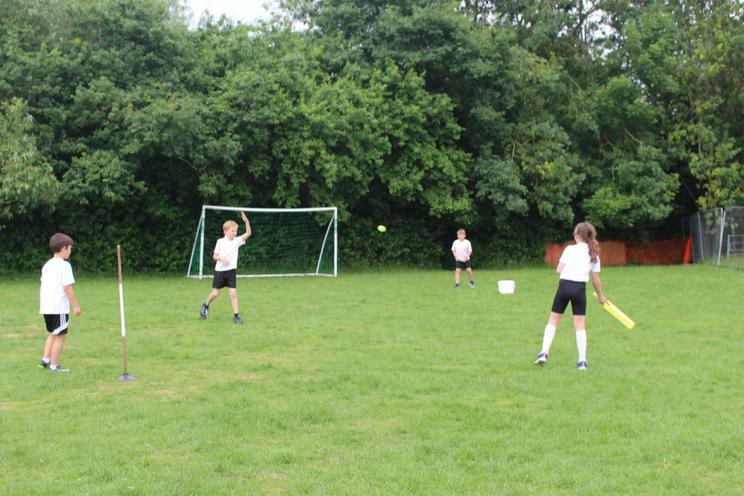 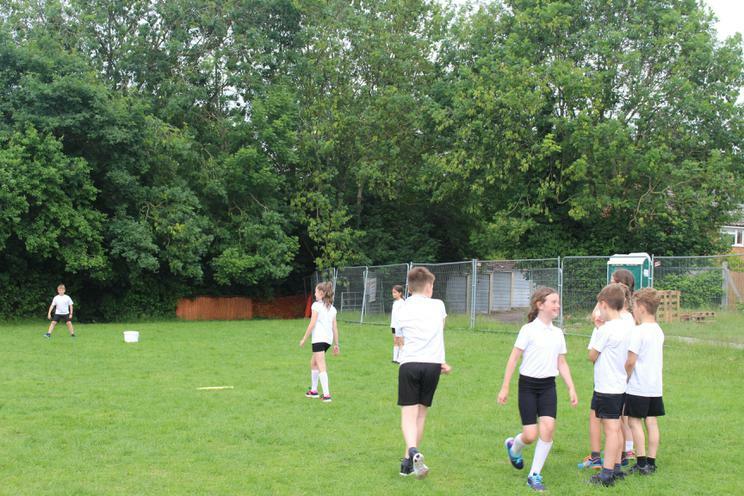 The children spoke about working as a team as well as encouraging their team mates - they all played extremely well and tried to bank as many rounders as they could! 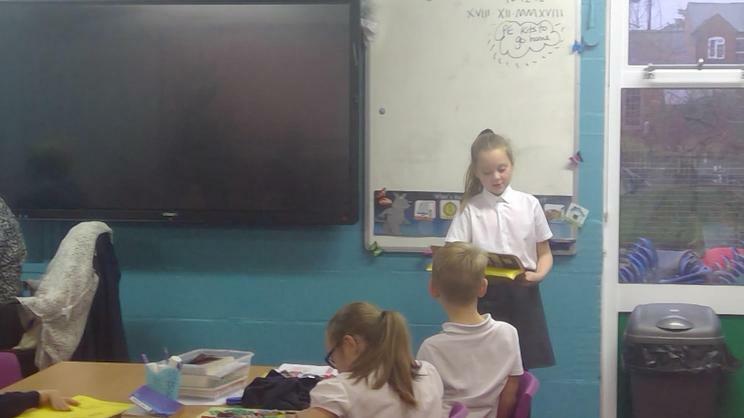 This week, in English, we have been exploring what a Haiku poem is and what makes it so unique. 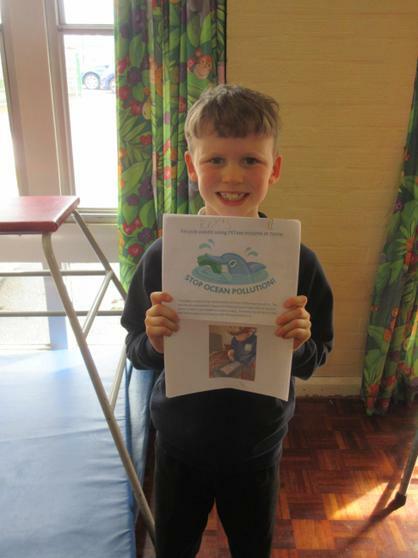 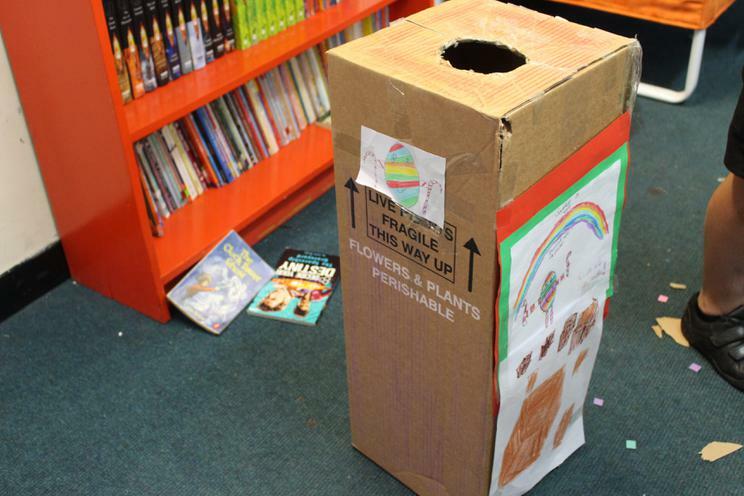 We have started our new topic, Our Planet, and have based our poems around the environment and what plastic is doing to hinder and endanger our wildlife. 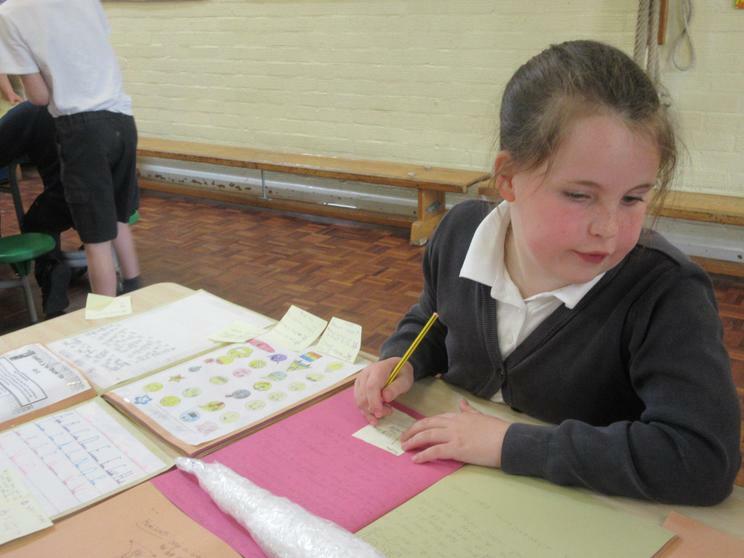 The quality of these poems has been fantastic and the children have worked exceptionally hard. 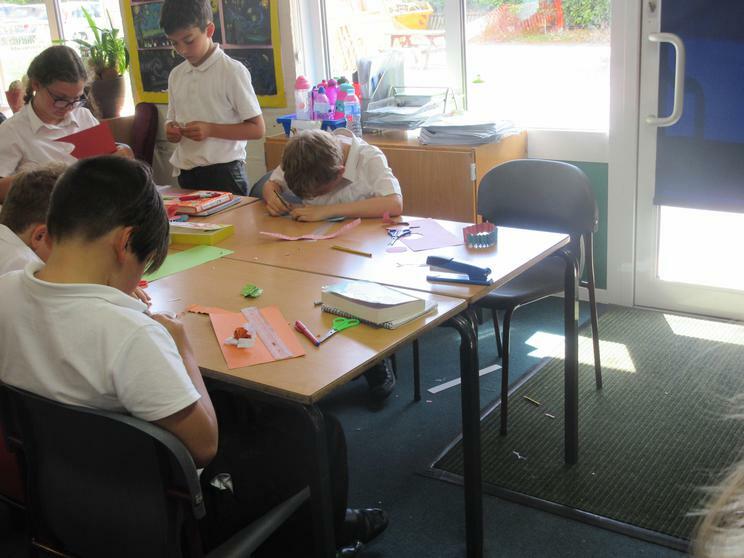 We were so pleased with our finished pieces, that we asked Mrs Baynes to come and listen to them this afternoon! 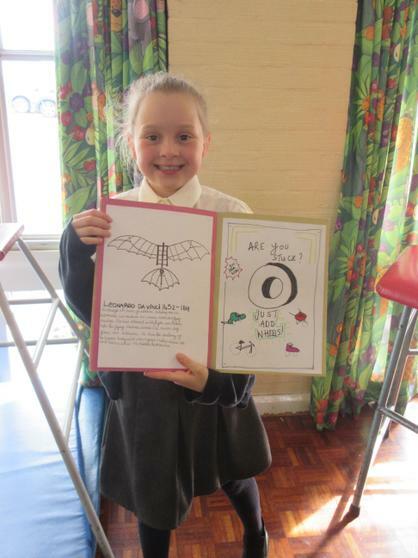 Well done to Oak class! 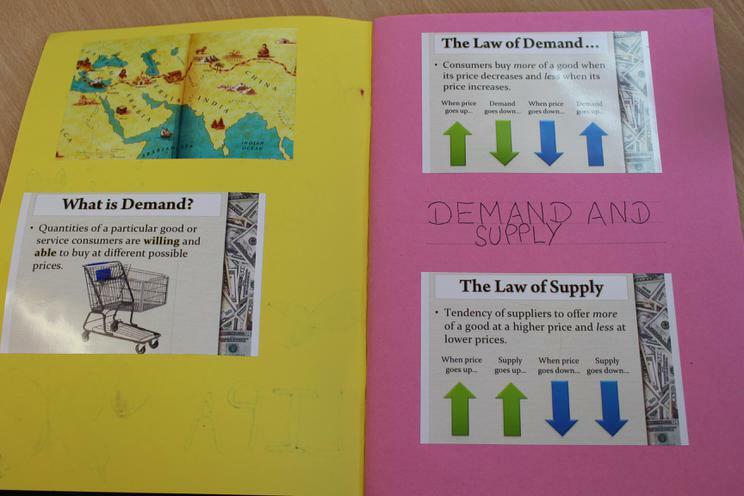 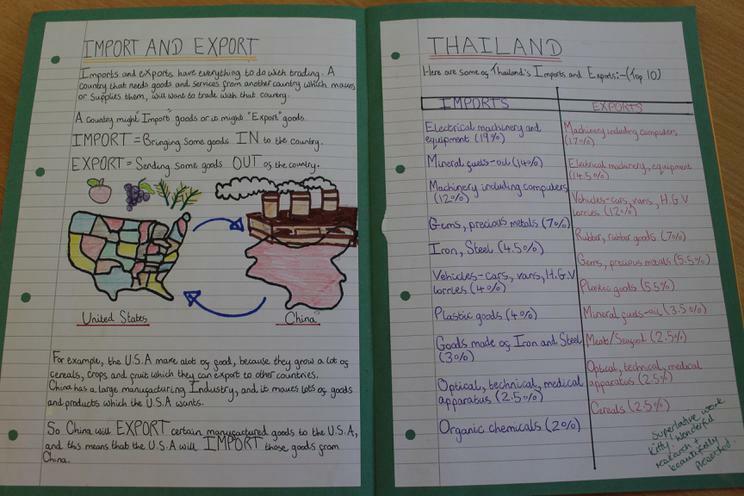 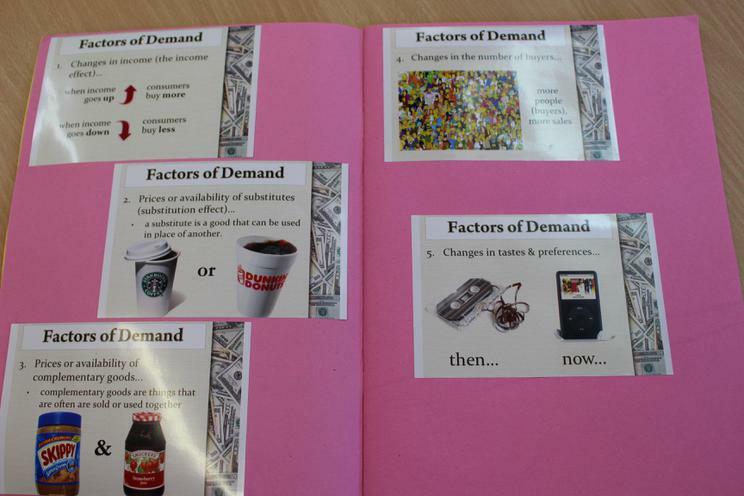 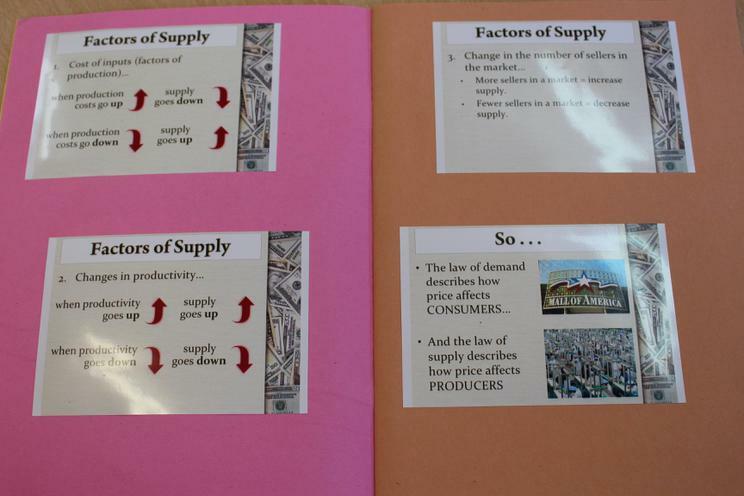 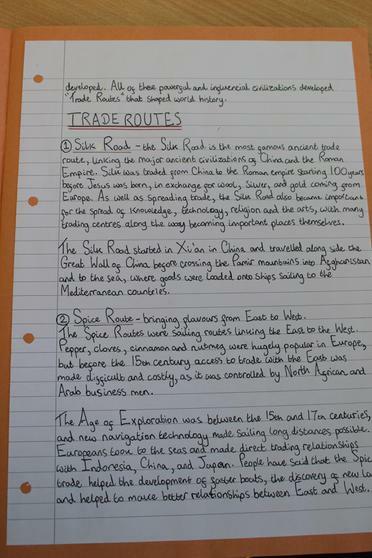 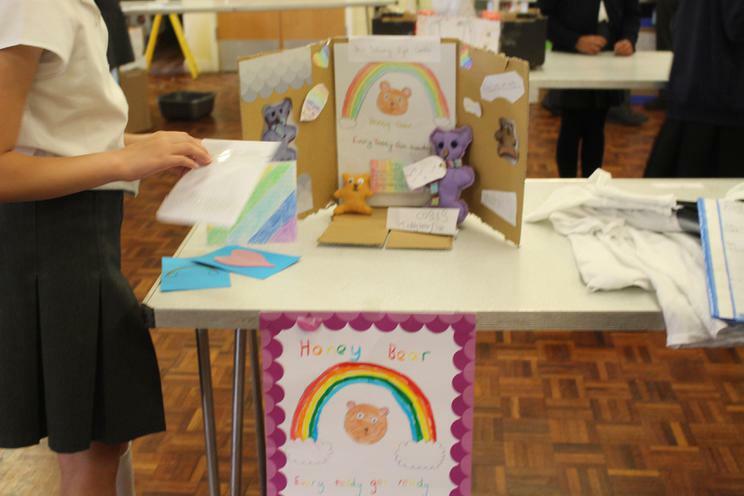 Kitty has worked extremely hard on her homework for our 'Young Entrepreneurs' topic, which we taught last half term. 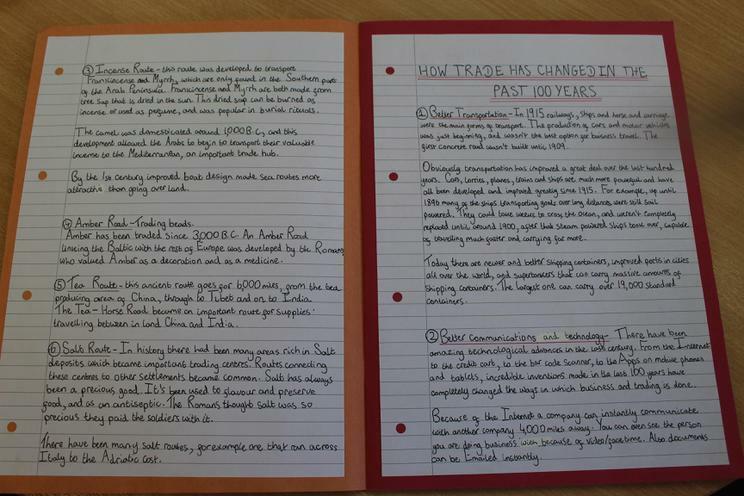 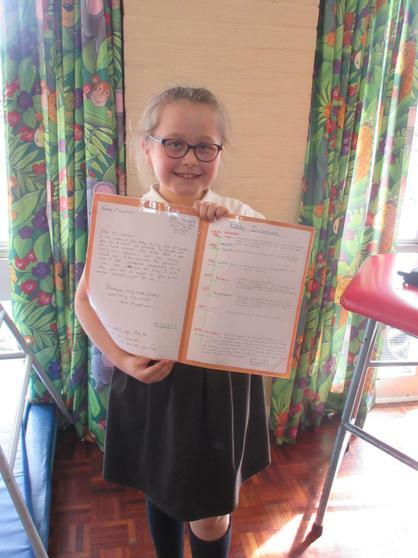 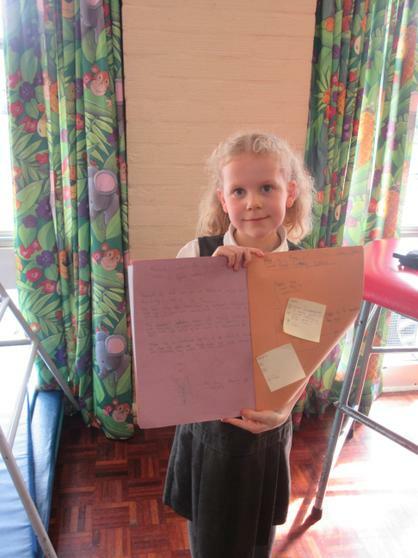 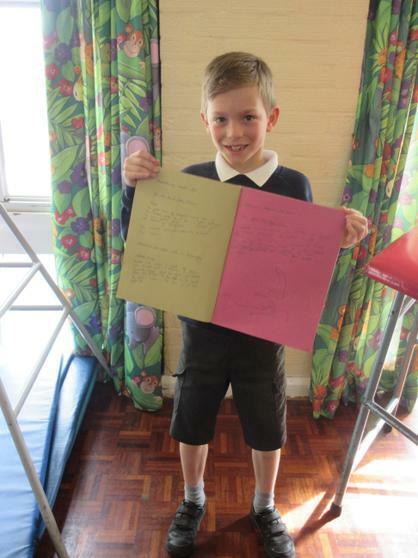 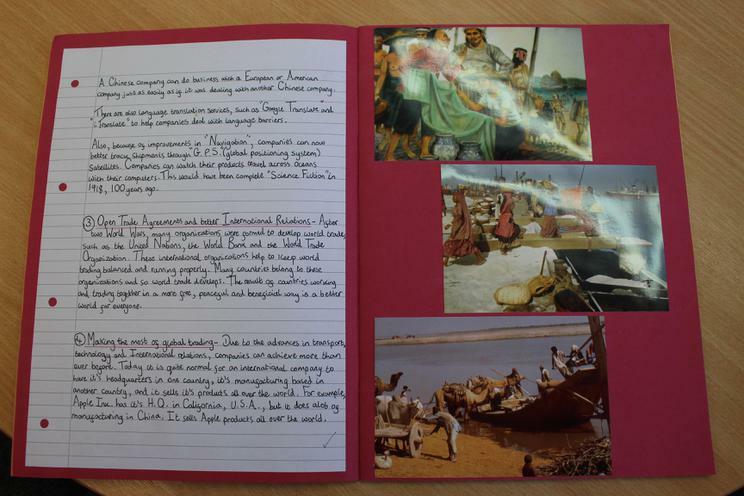 The quality and dedication to this homework has been absolutely fantastic - the headteacher's reward was well deserved! 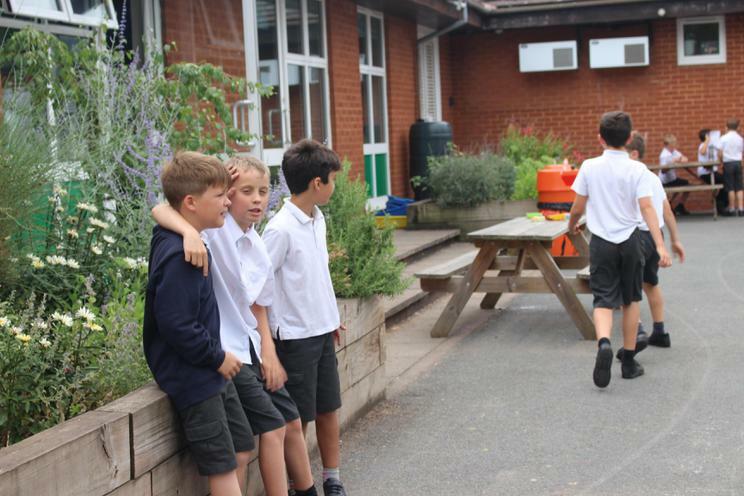 A very warm welcome back after the half term - we hope you all had a wonderful week having enjoyed some sunshine! 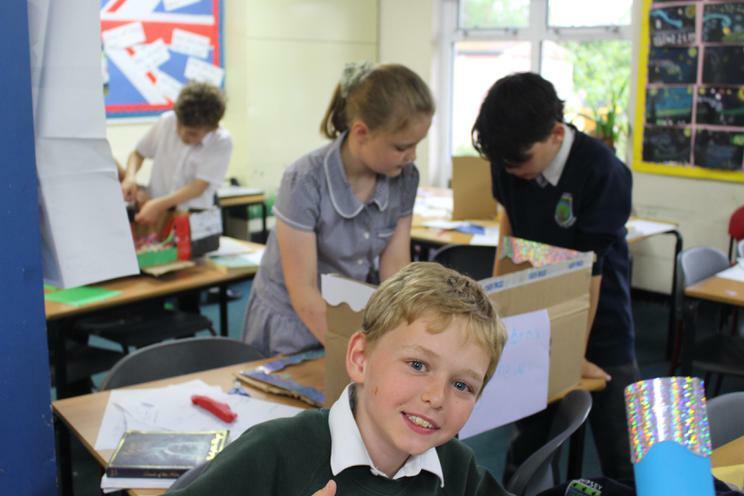 We have got a jam-packed few weeks and are keen to get started! 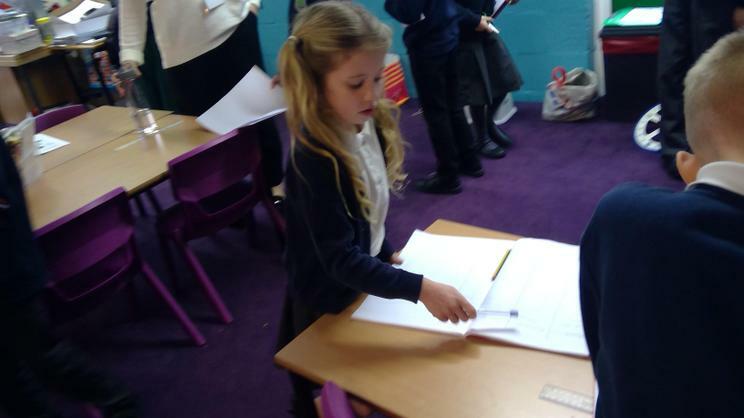 Today has been a very busy one for all of the children in Oak class. 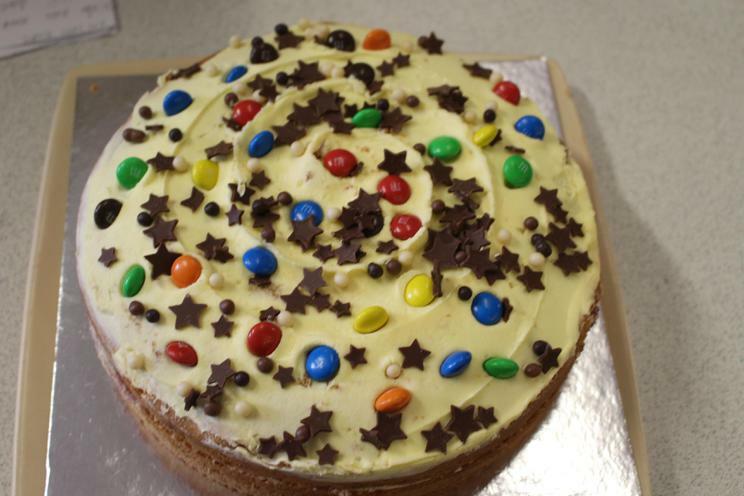 We have had a fantastic day hosting the Kempsey Cafe, alongside Elm class, where many of our Kempsey residents came to have some delicious cake (kindly made by many of our parents'), some drinks, a good old natter and some entertainment! 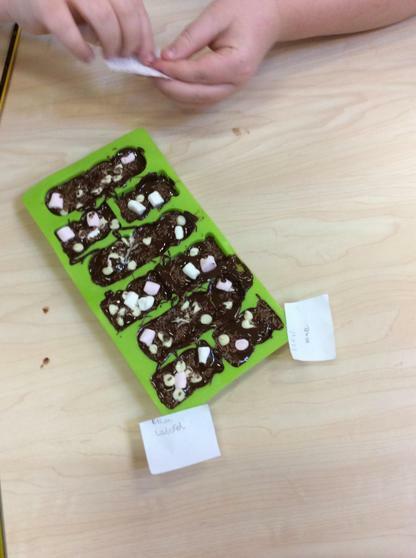 The children did a fantastic job! 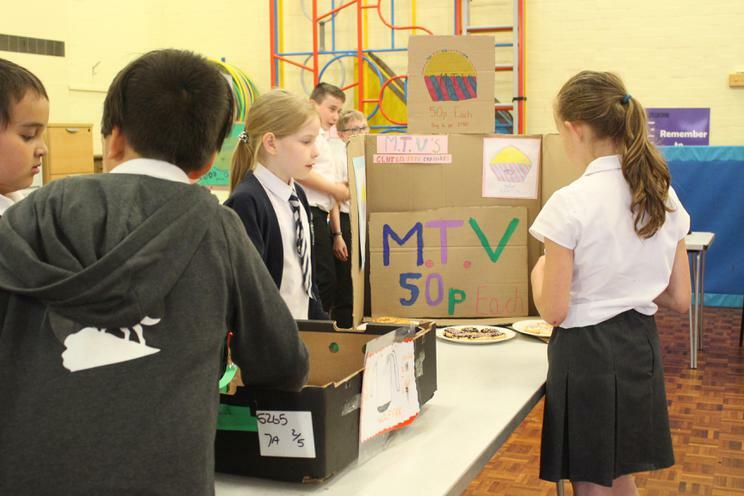 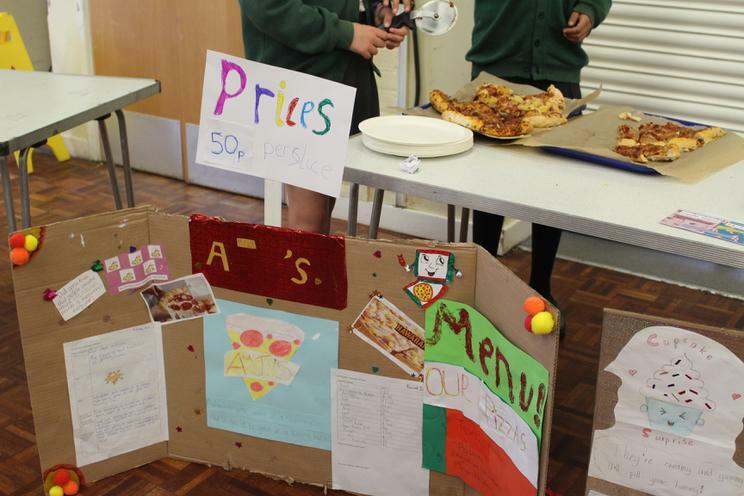 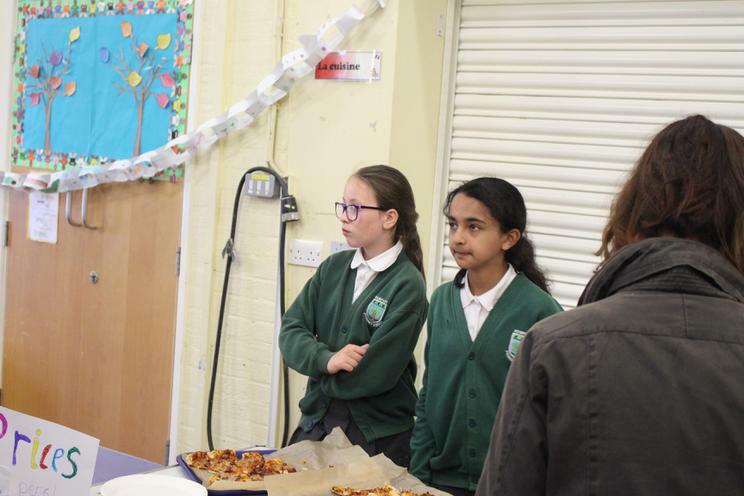 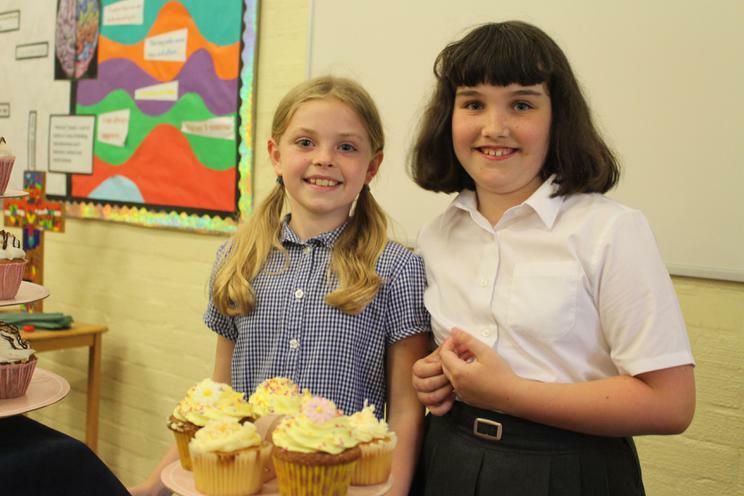 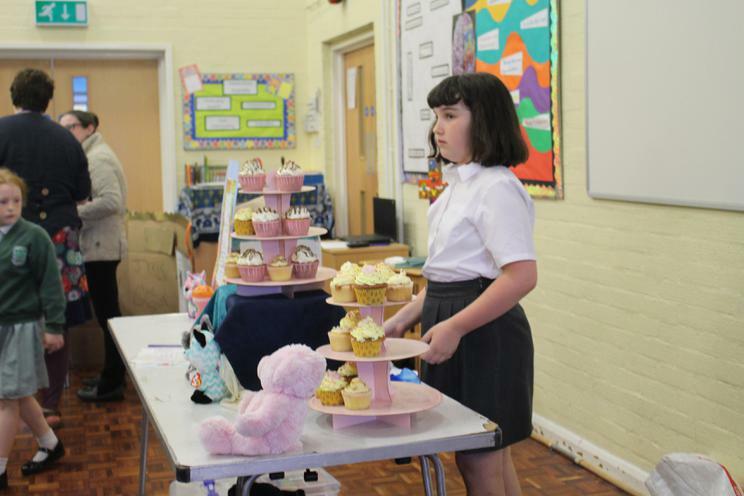 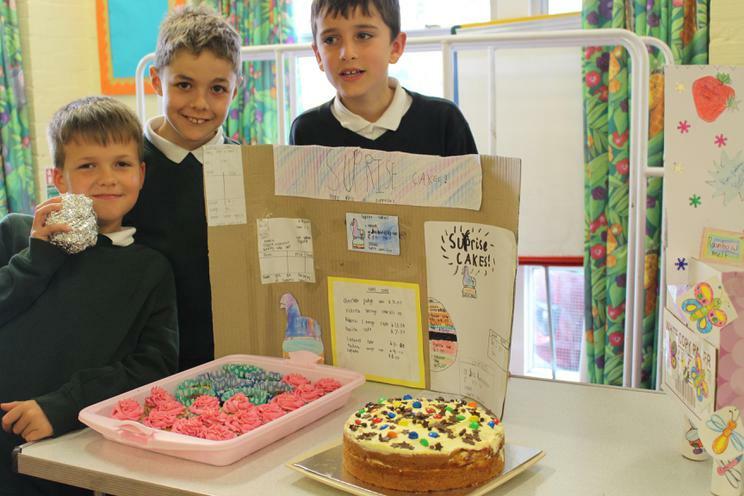 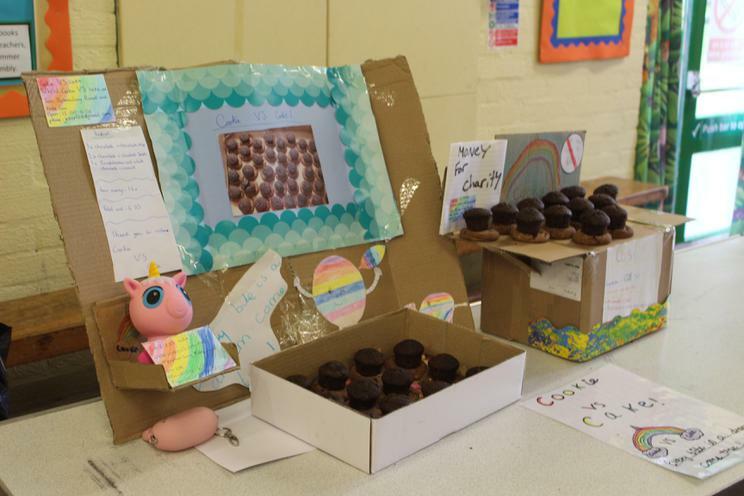 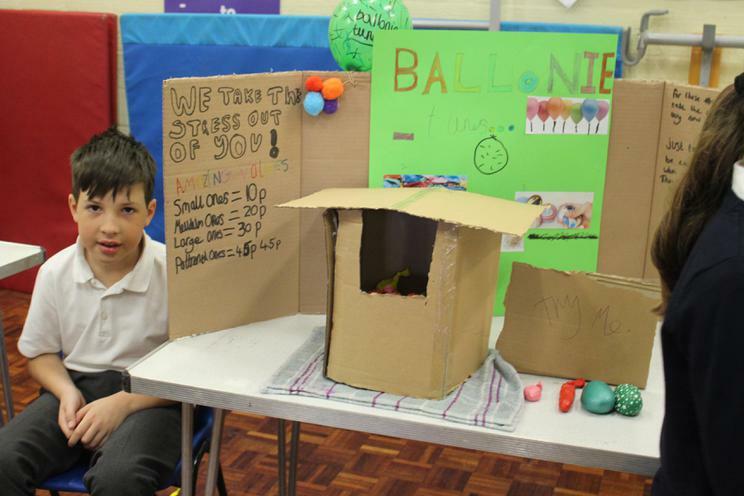 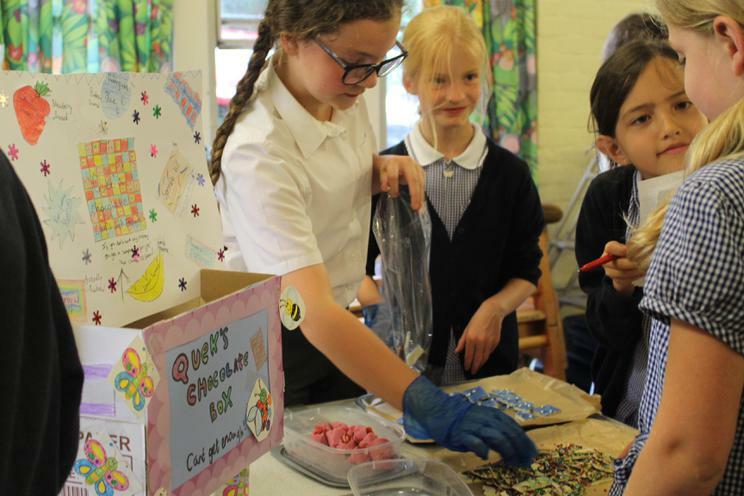 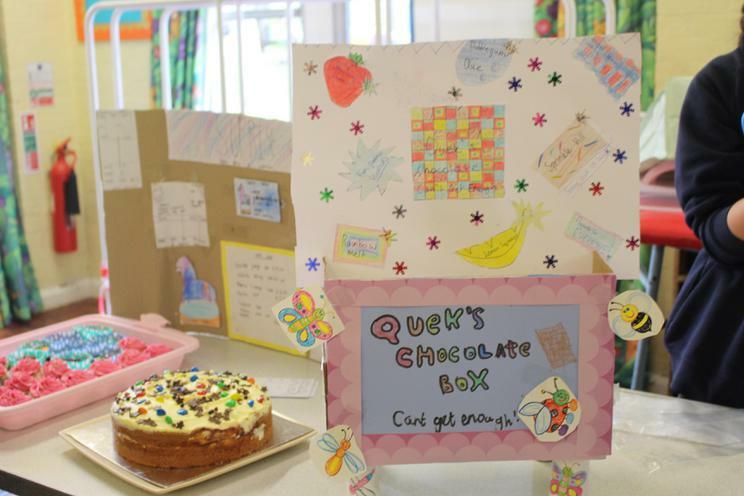 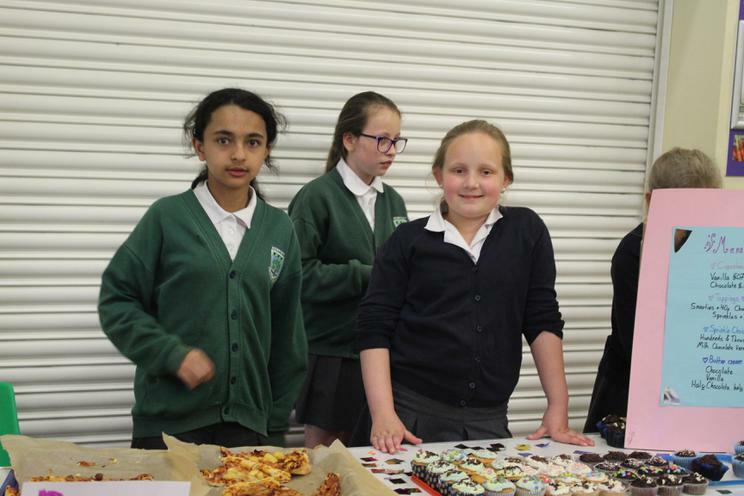 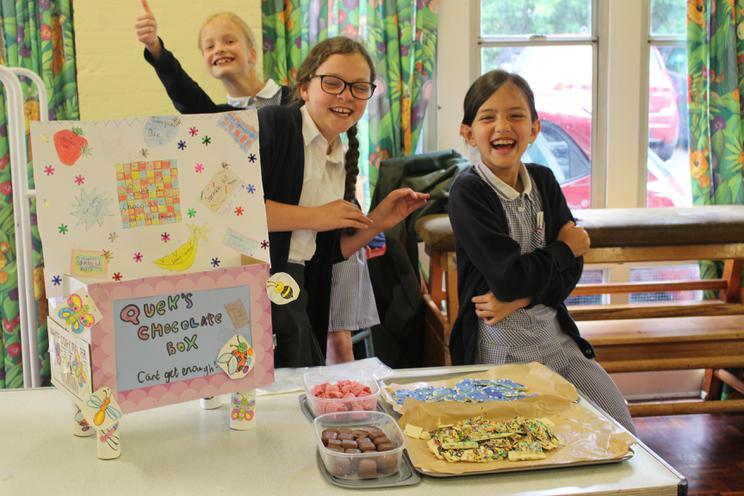 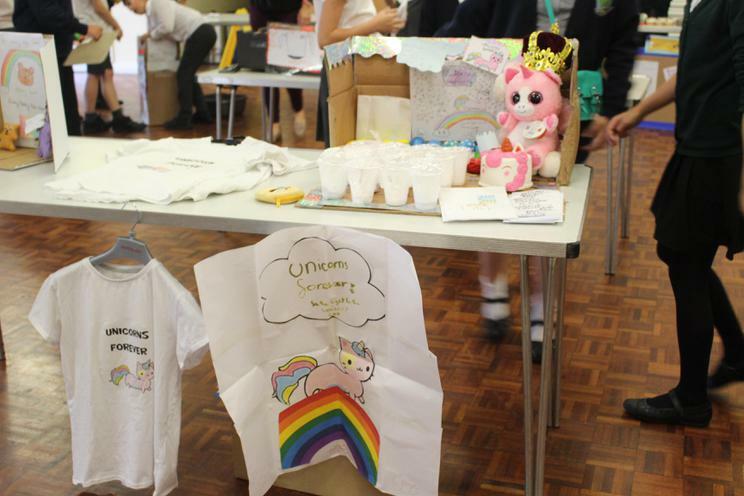 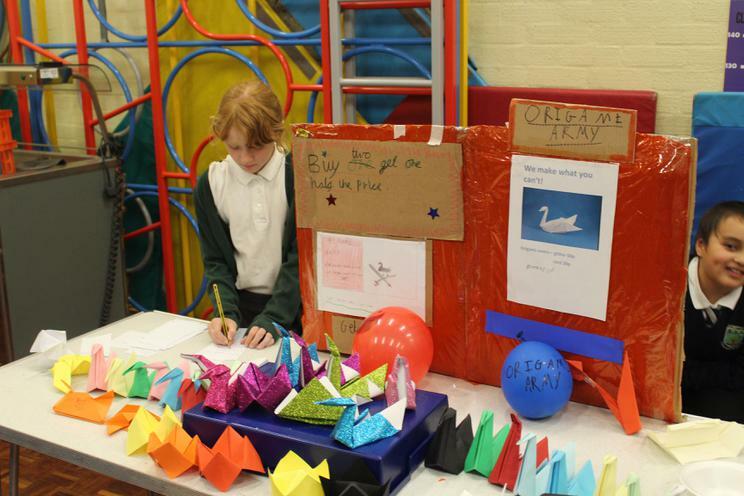 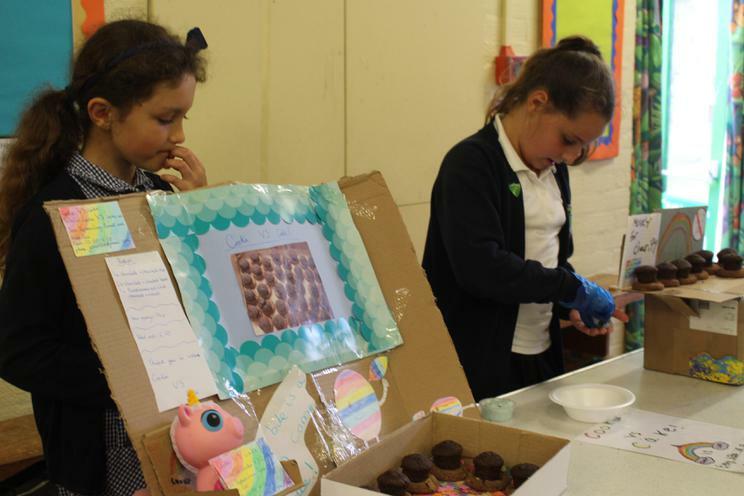 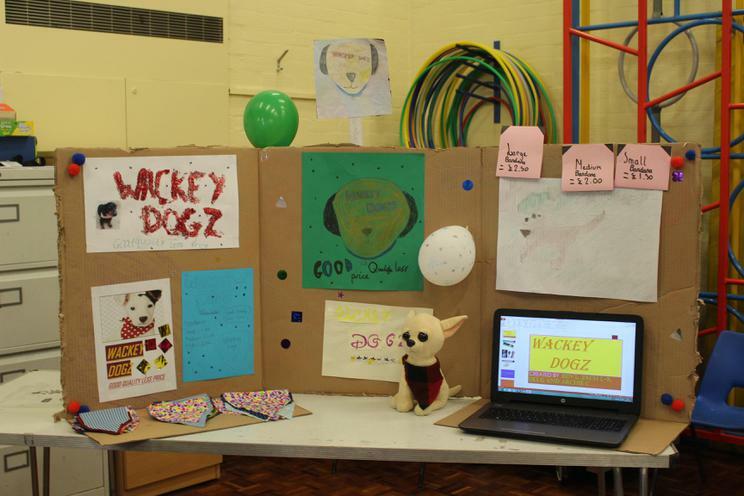 As well as this, we had our afternoon where the children from Oak and Willow showcased their many talents and achievements with their 'Young Entrepreneurs' topic. 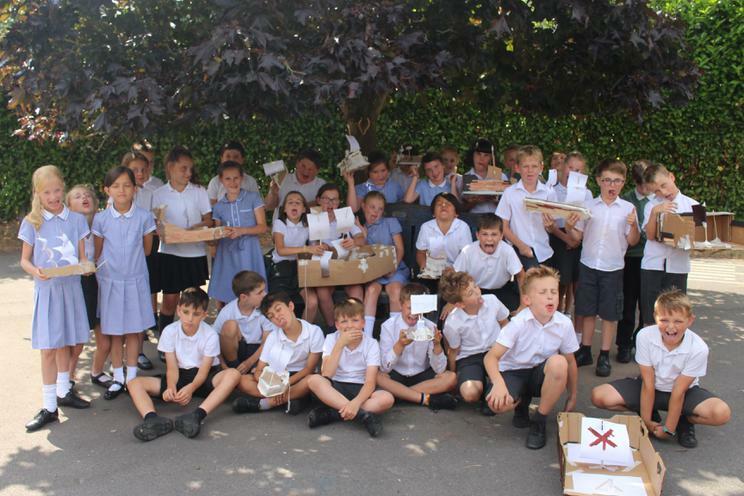 The level of dedication and enthusiasm that went into their creations was phenomenal and we are so proud of them all! 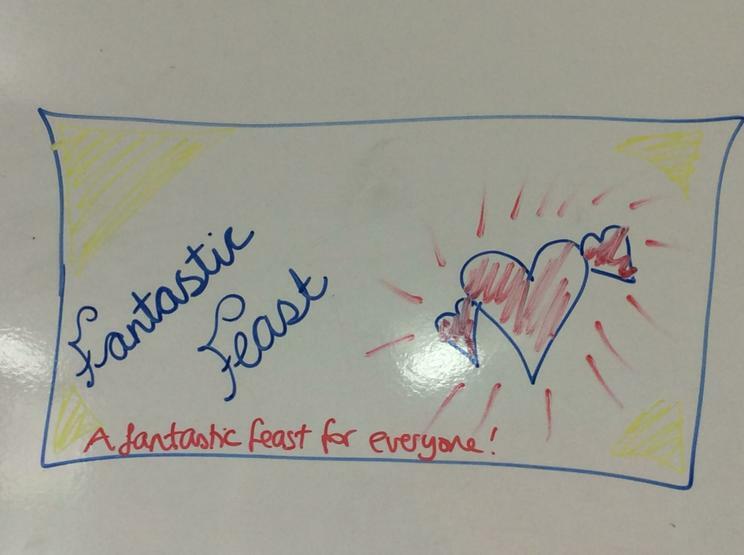 We hope you are too! 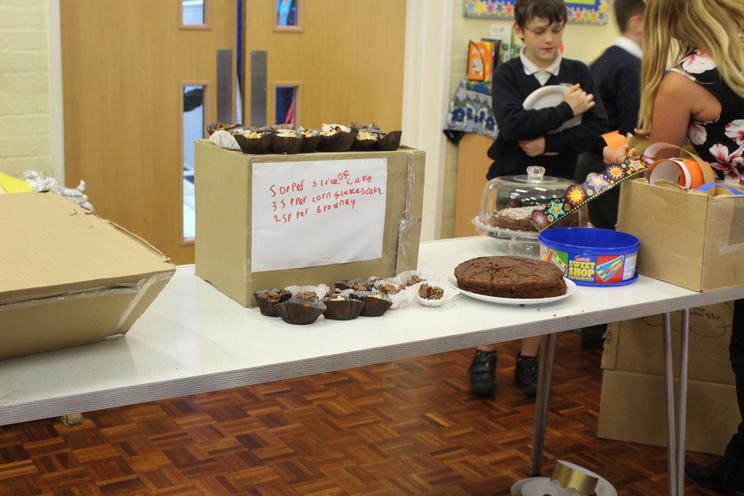 Pictures of the Kempsey cafe is to follow! 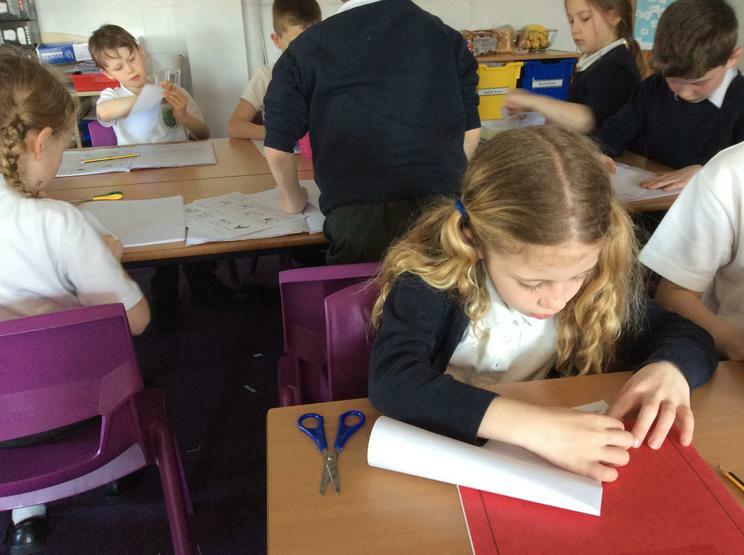 24th May 2018 - the children have been working extremely hard this afternoon on their Topic work, which they are all really excited to show you tomorrow! 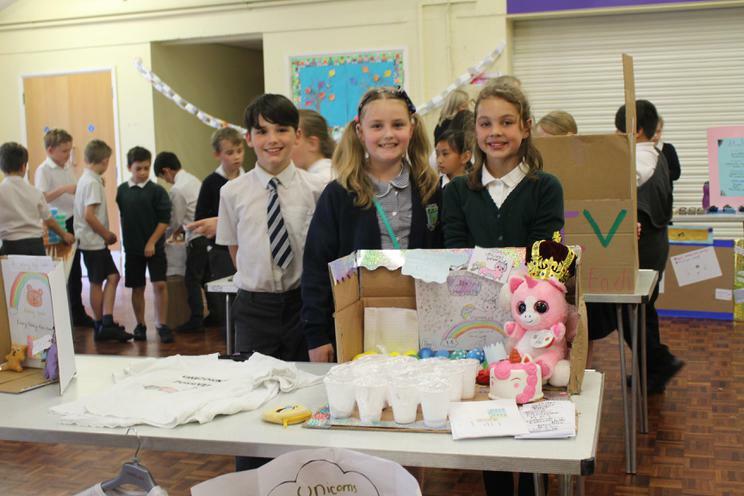 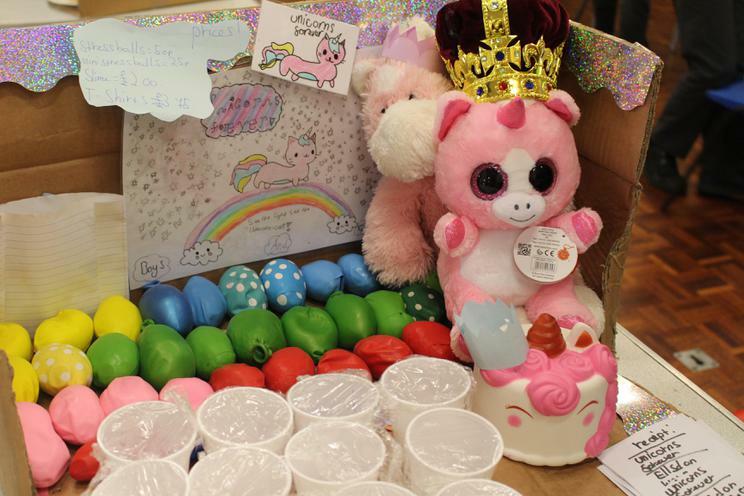 They really have thought about their businesses and what they are passionate about, which ranges from cakes to teddies to t-shirts. 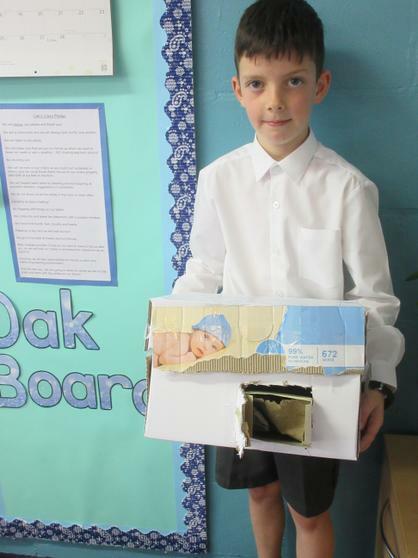 The variety of creation has been incredible and I am proud of Oak for all their hard work and perseverance! 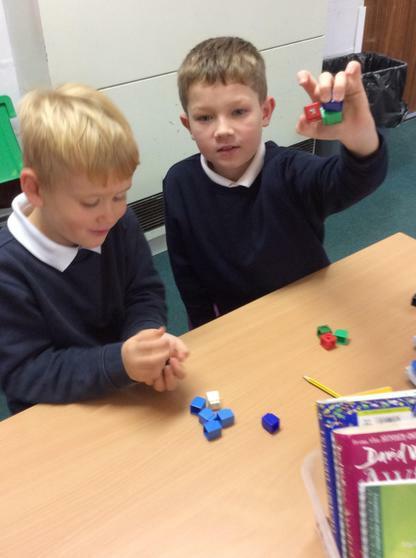 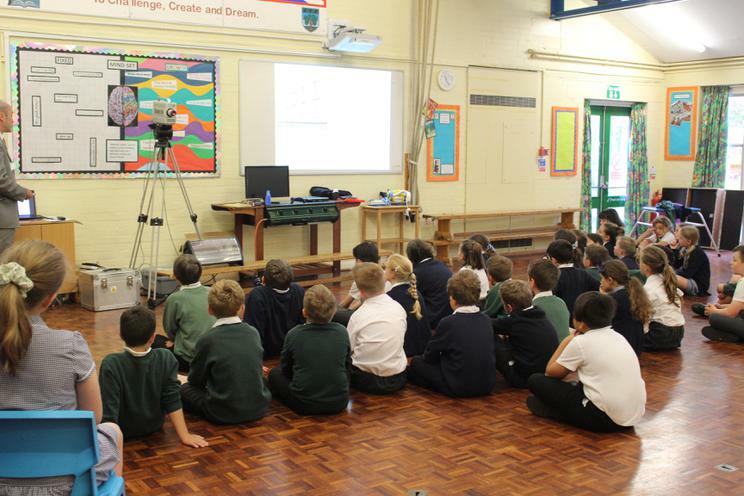 Our Science and Maths talk! 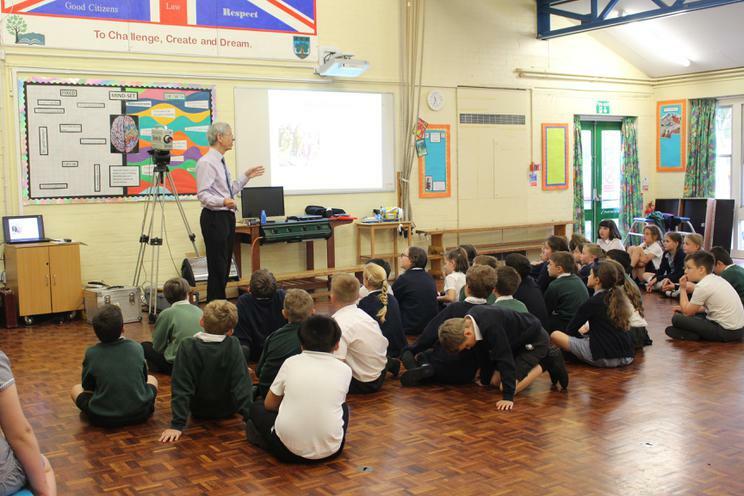 24th May 2018 - today we had a visit from two gentleman who explained some fascinating Maths and Science facts and how this is heavily linked with Malvern! 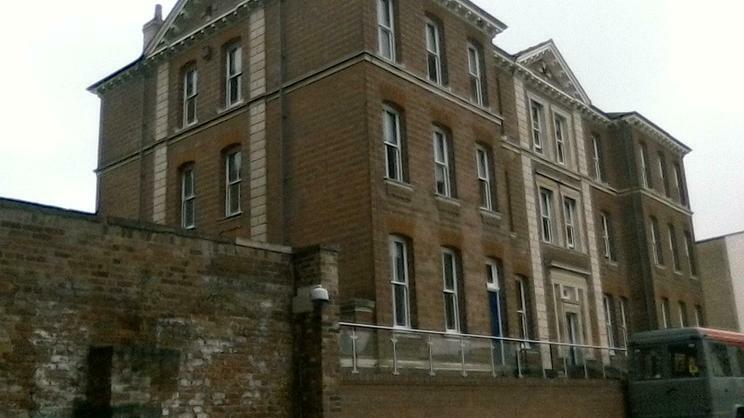 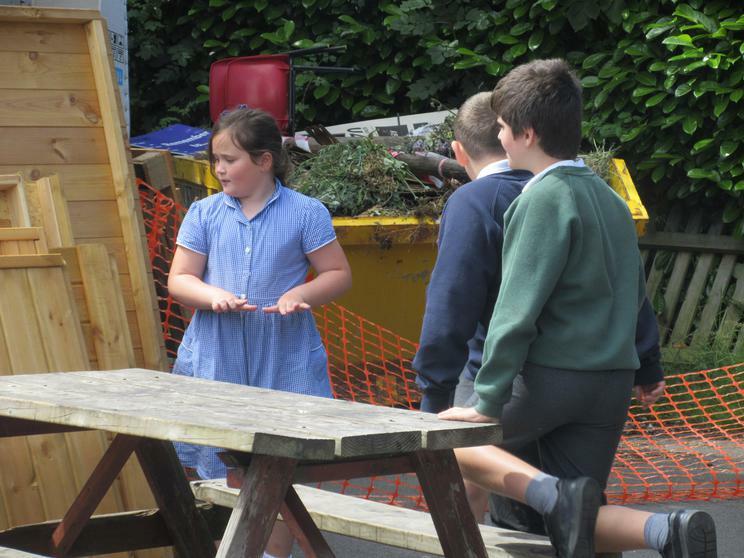 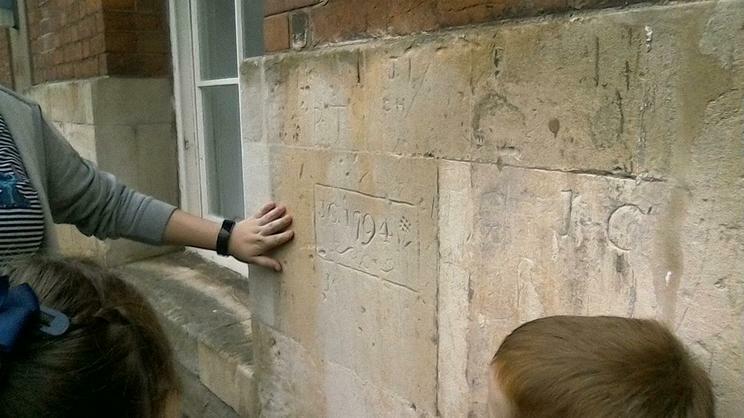 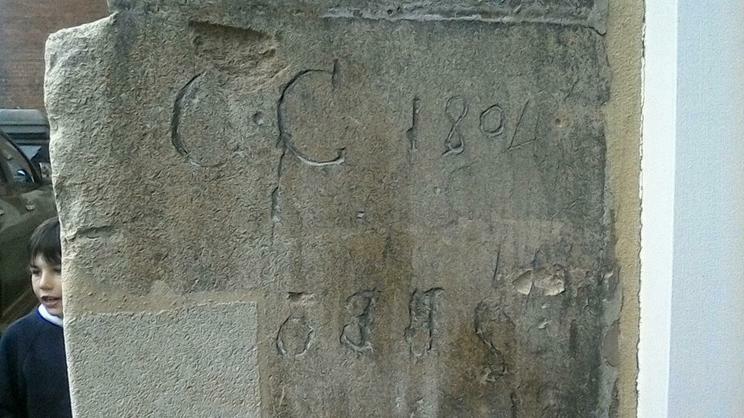 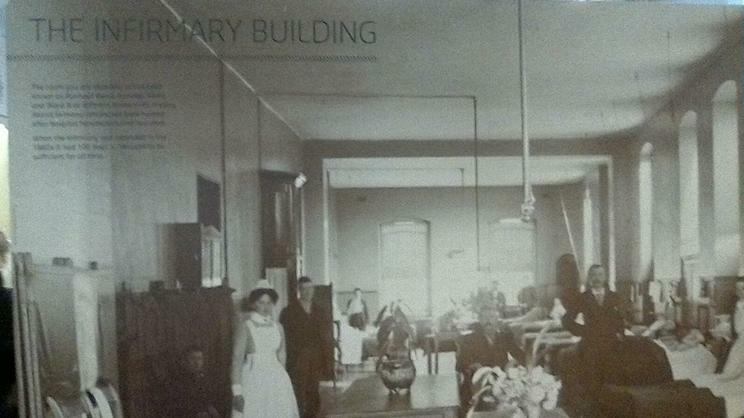 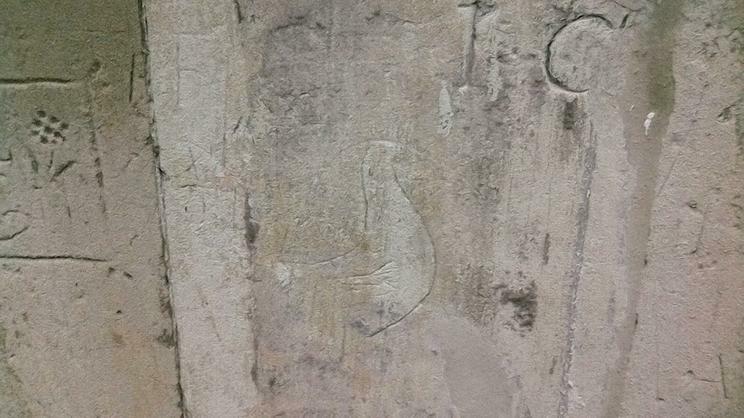 It was very interesting to find out what has happened right outside our front door over the years! 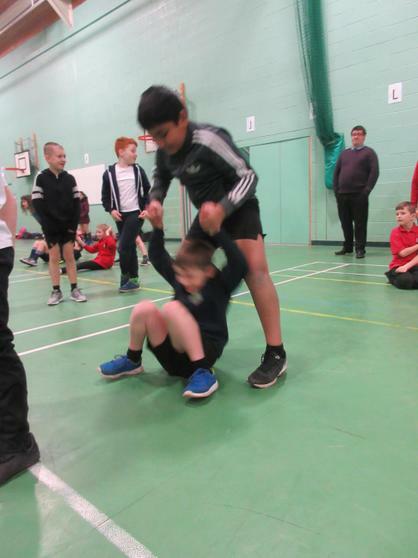 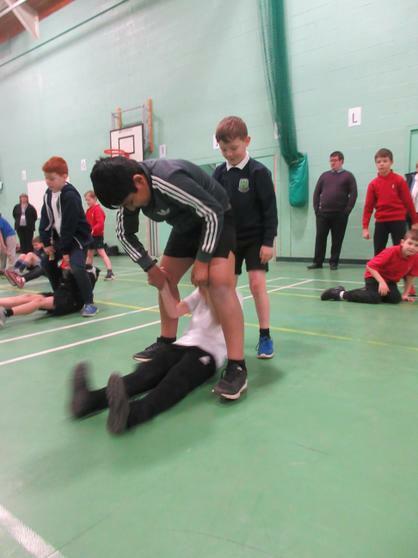 The children have had a jam-packed week this week, where we have taken part in a great PE session as well as worked well as a team in our Science lesson!